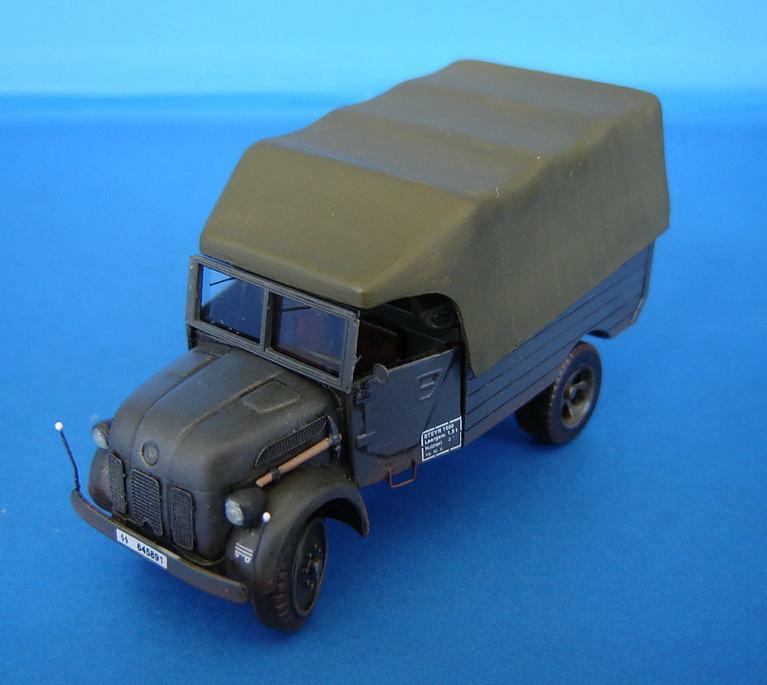 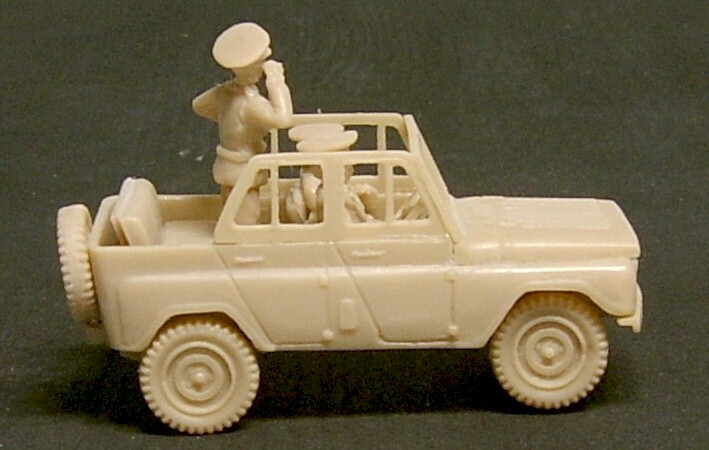 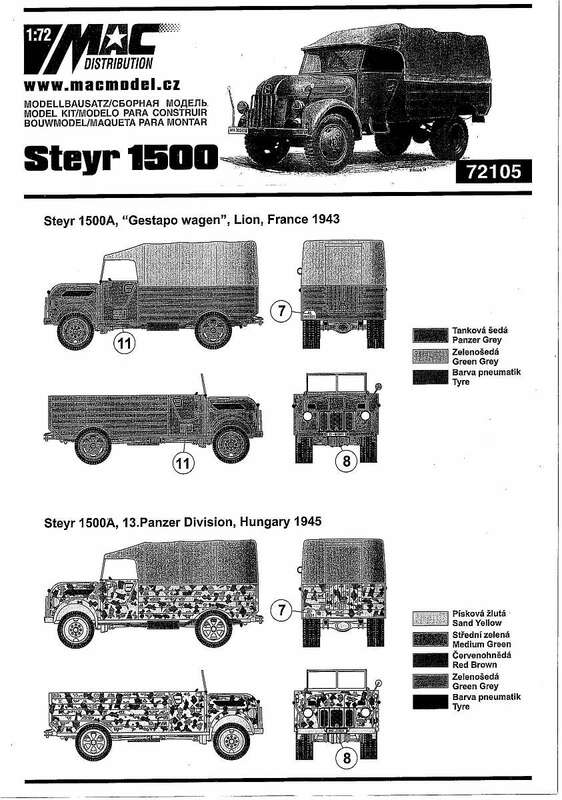 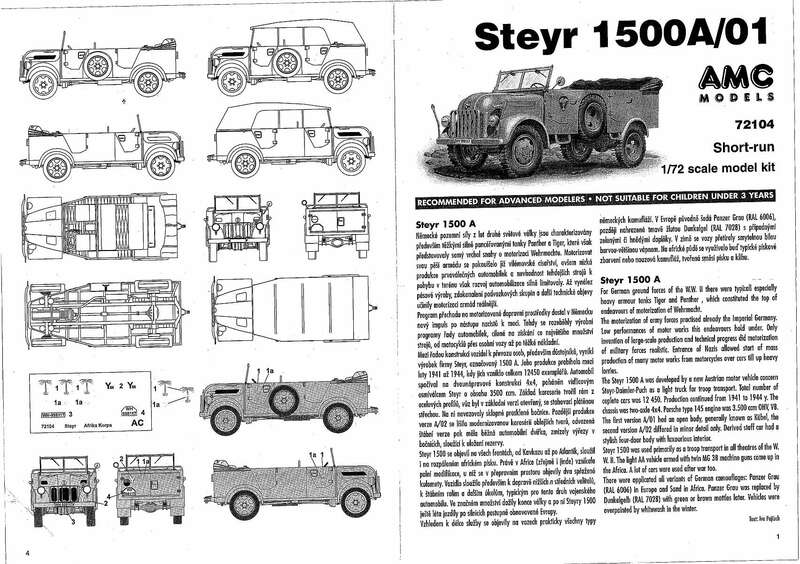 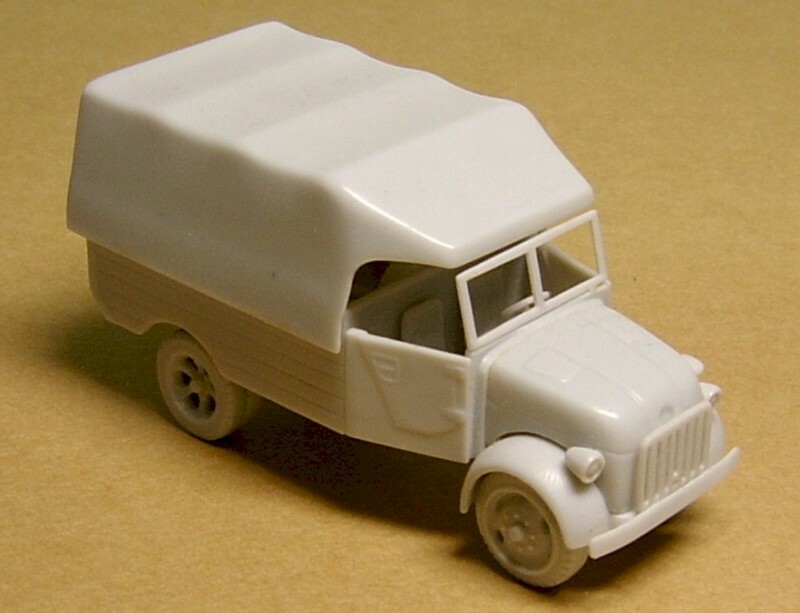 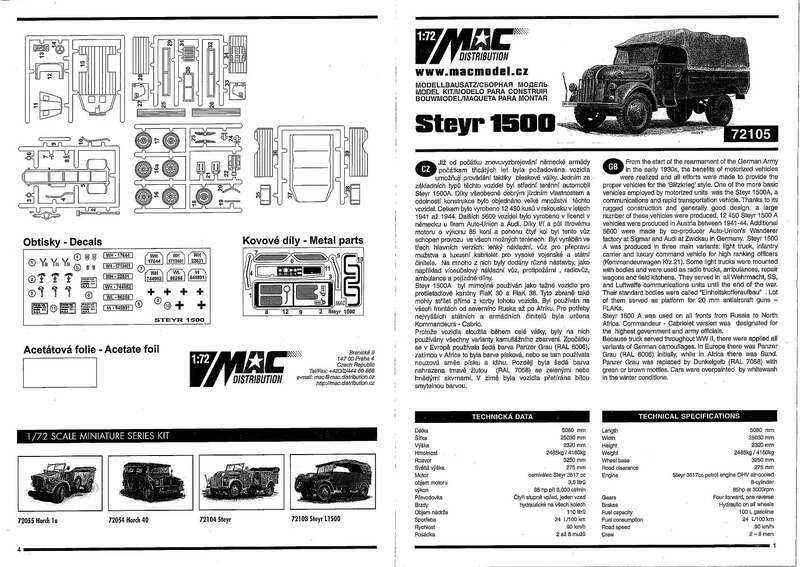 As per the box tops, the only difference between these two vehicles is that the 1500A comes with the top up and the spare wheel mounted on the inside (not on the front as shown! 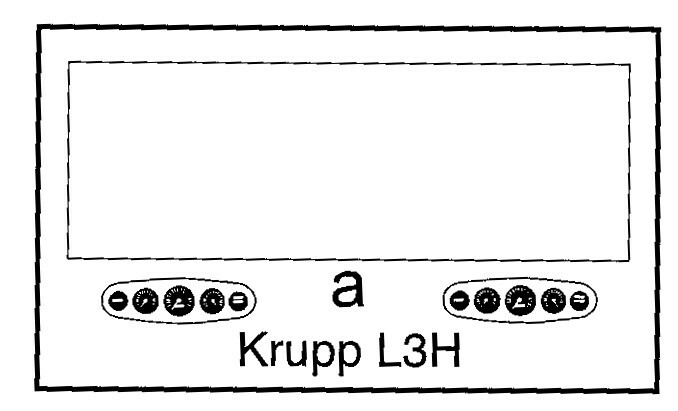 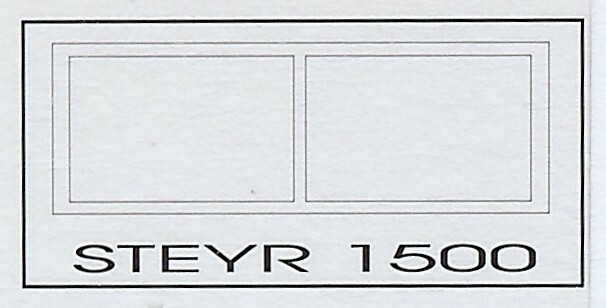 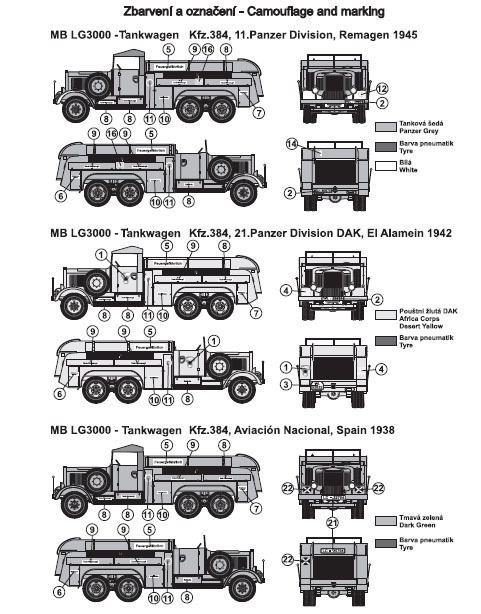 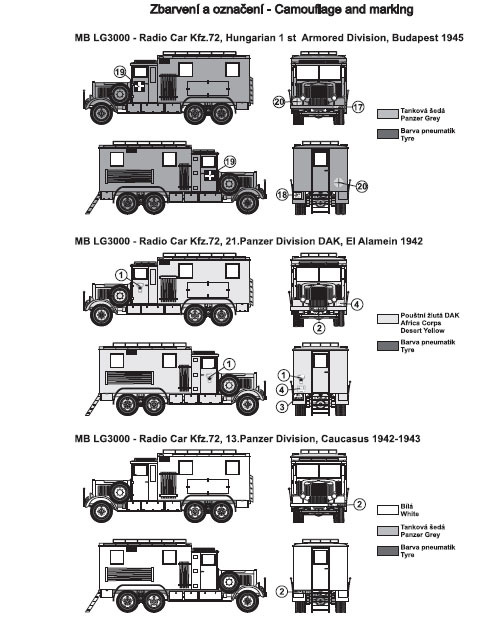 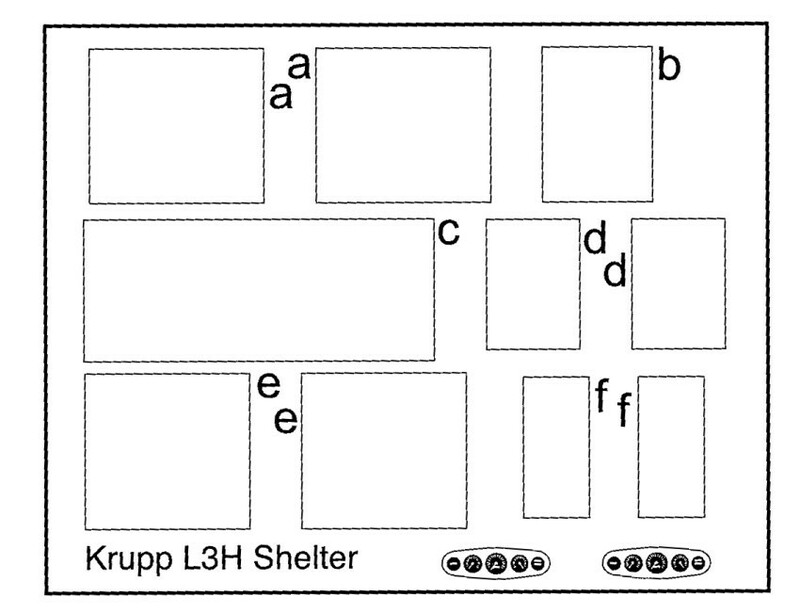 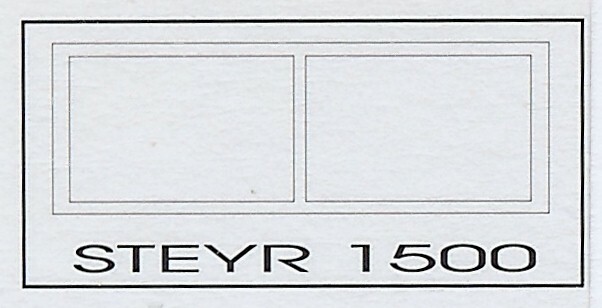 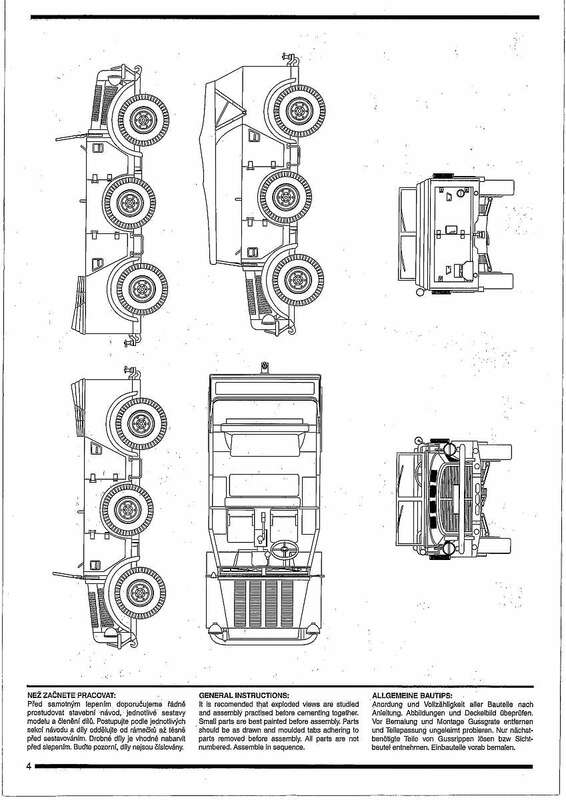 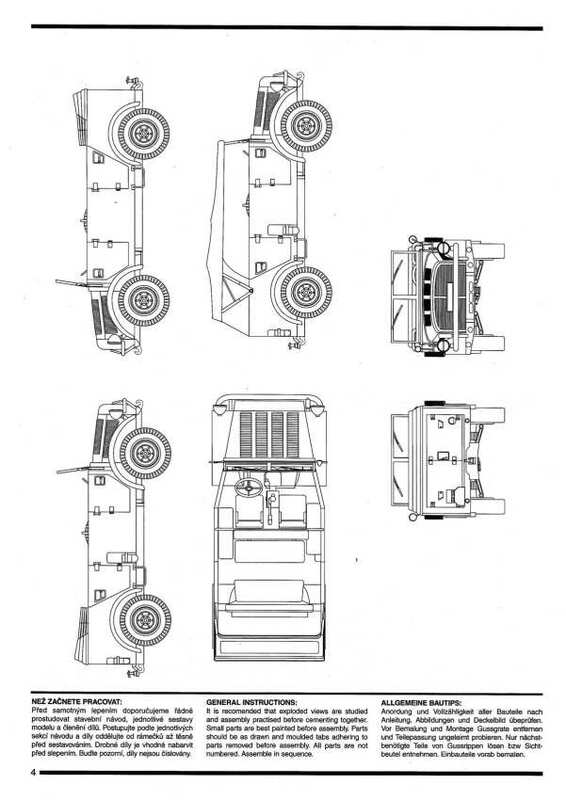 ), while the 1500A/01 has the top down and the spare mounted on the outside. 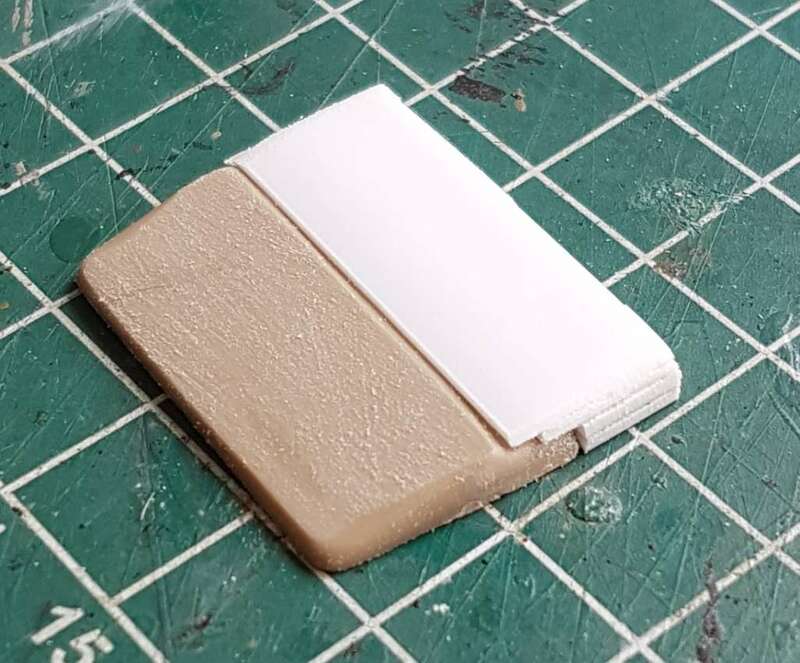 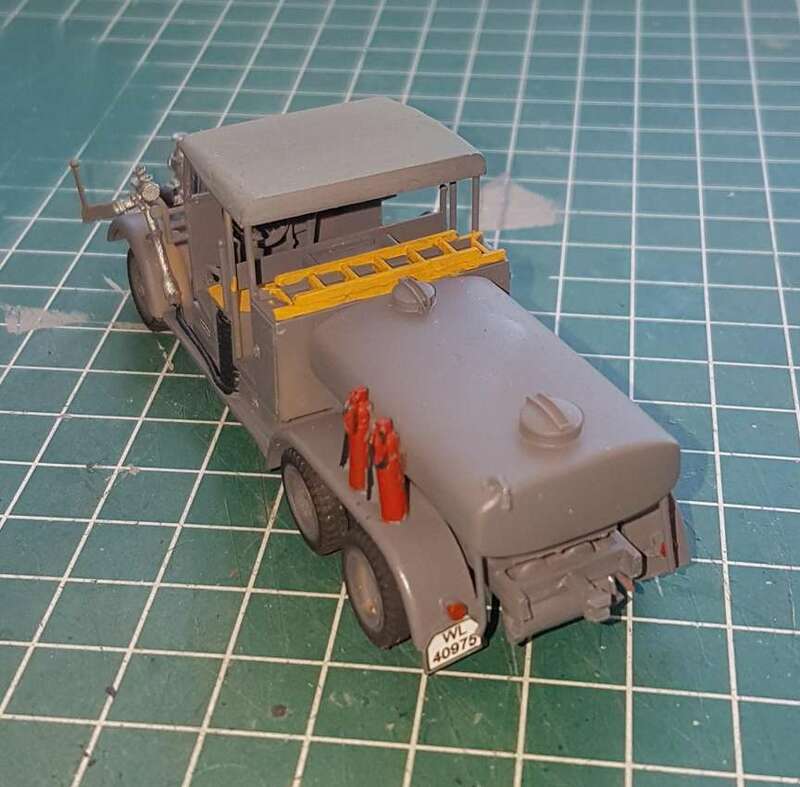 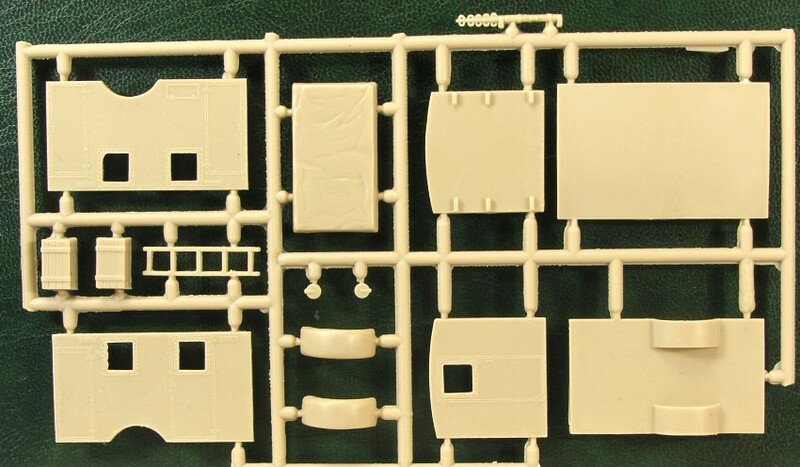 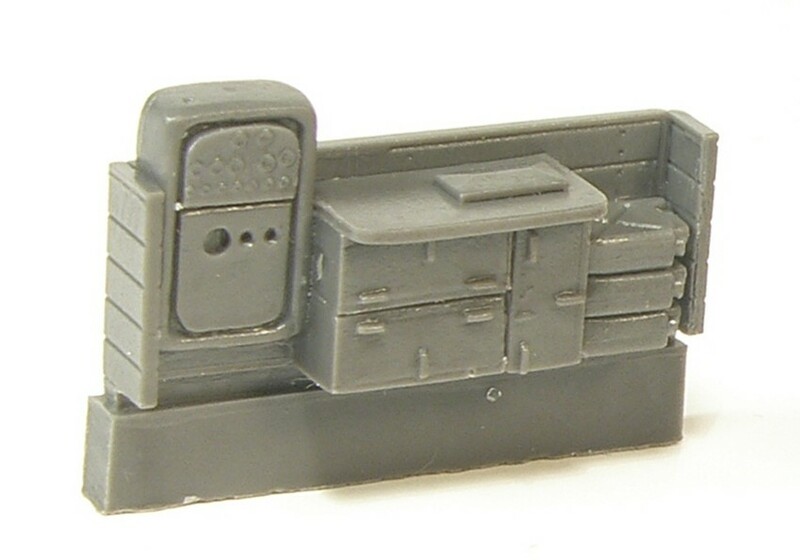 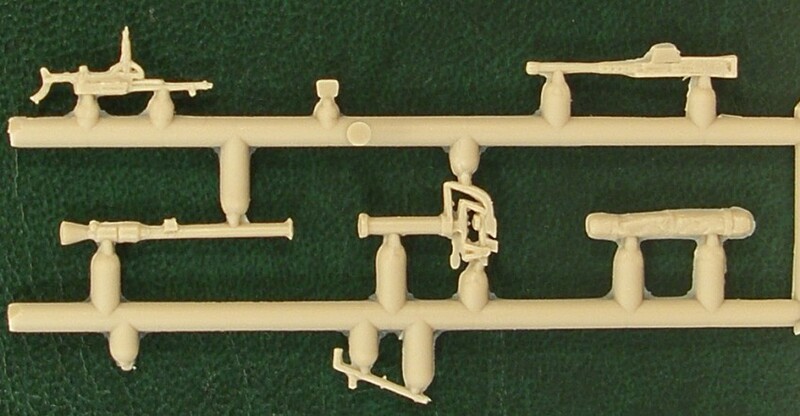 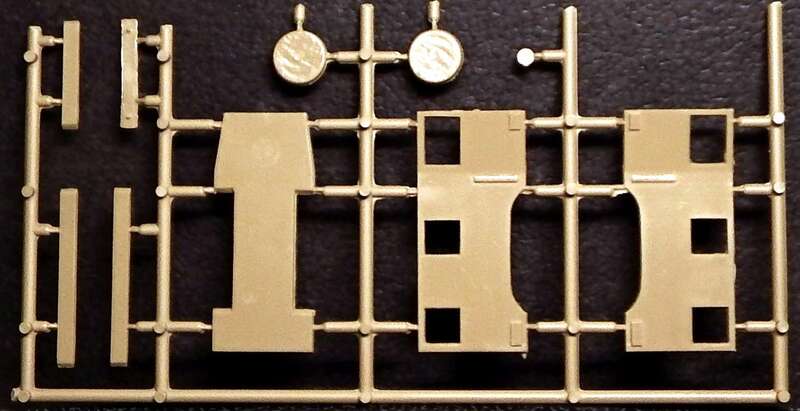 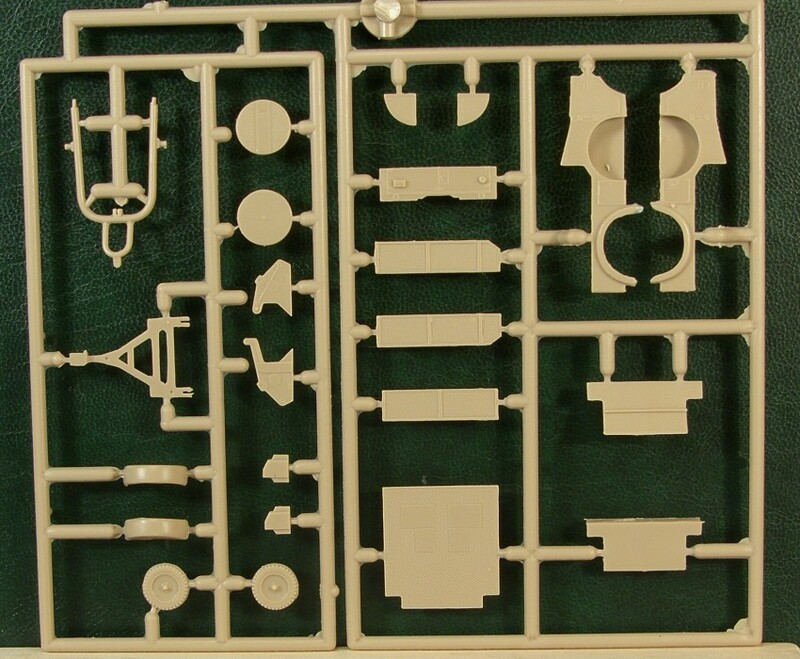 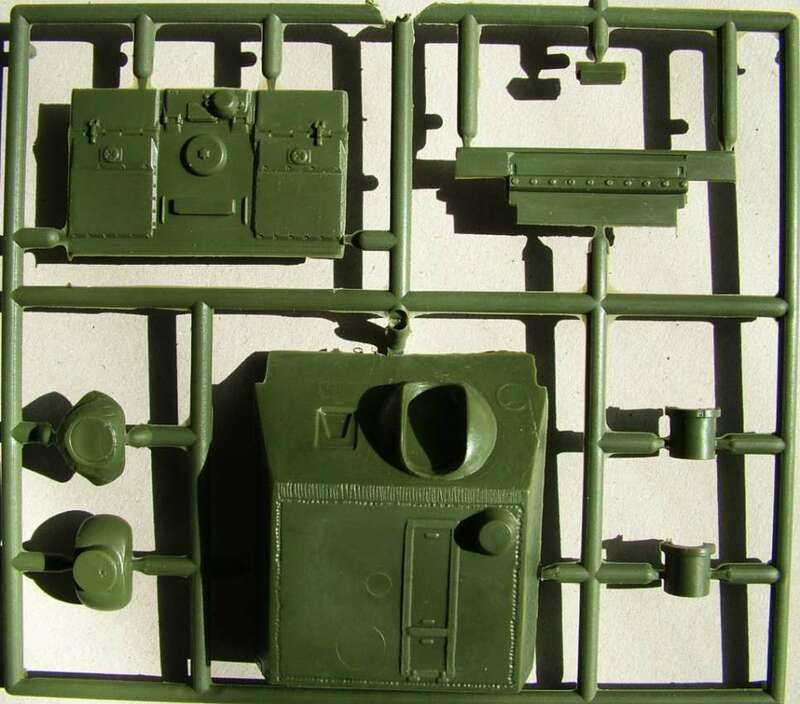 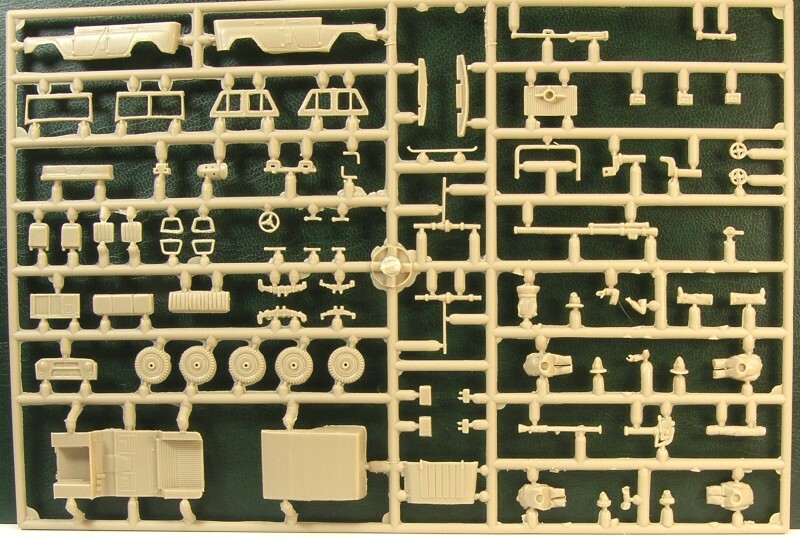 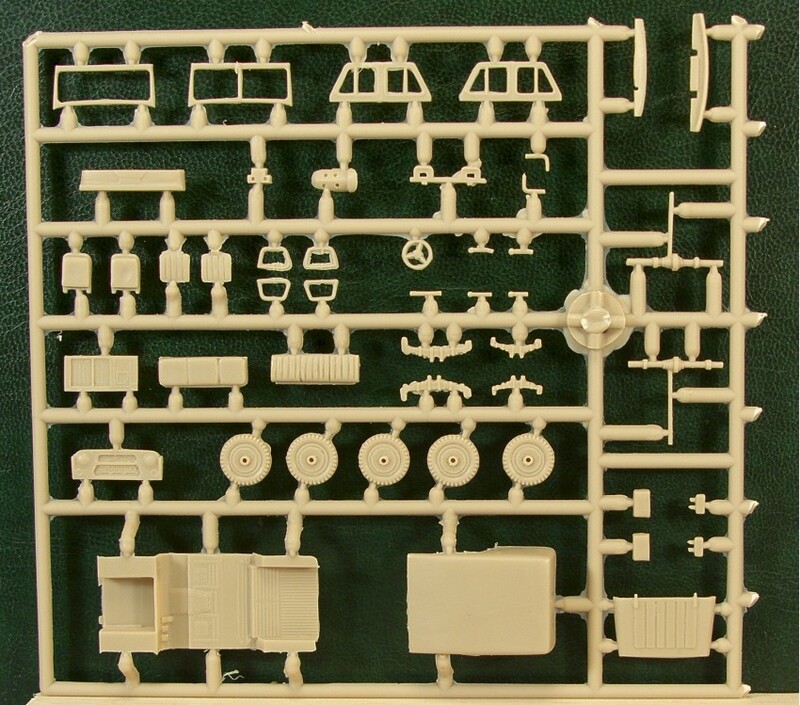 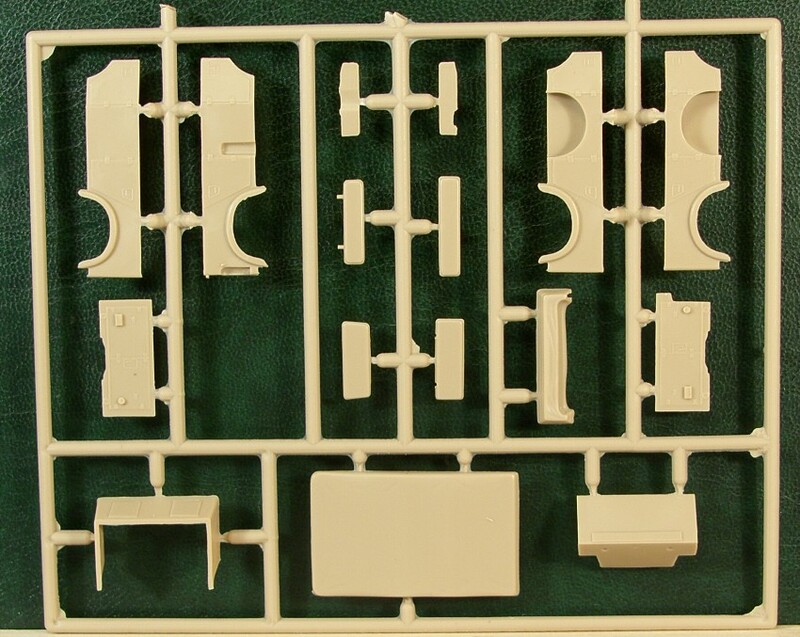 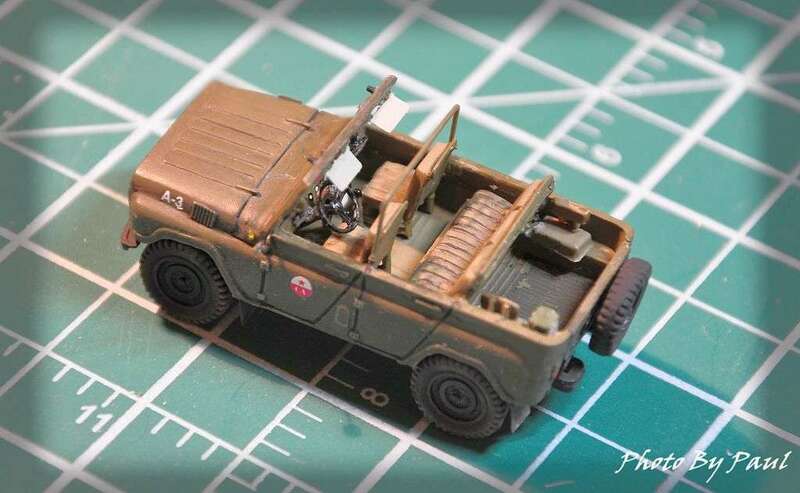 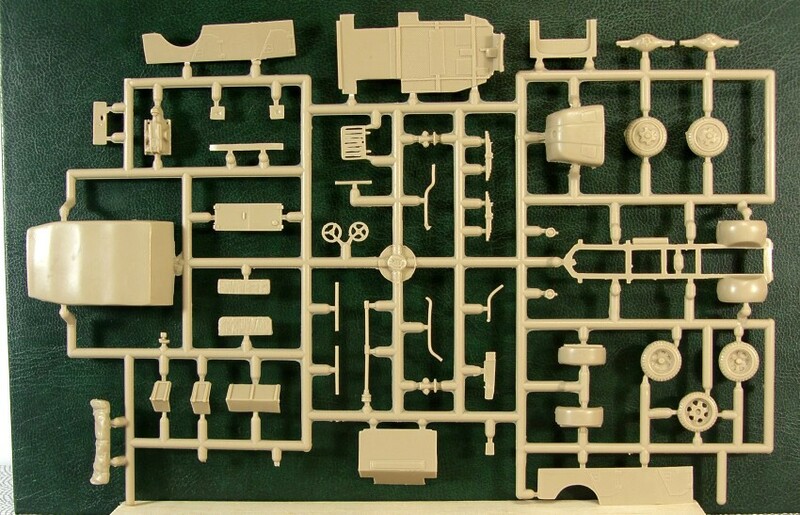 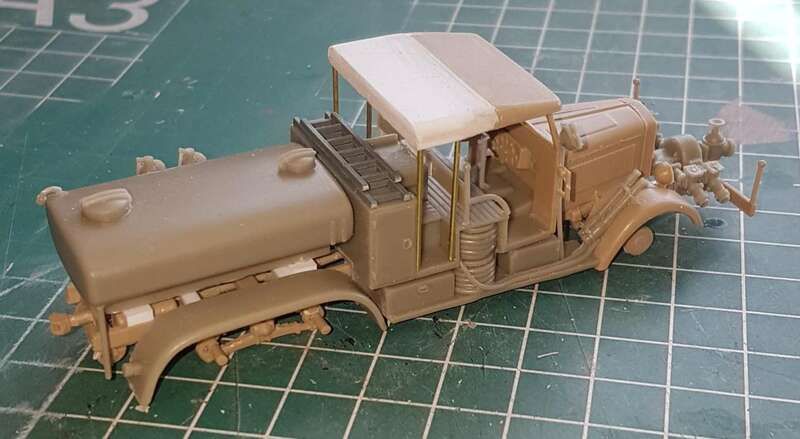 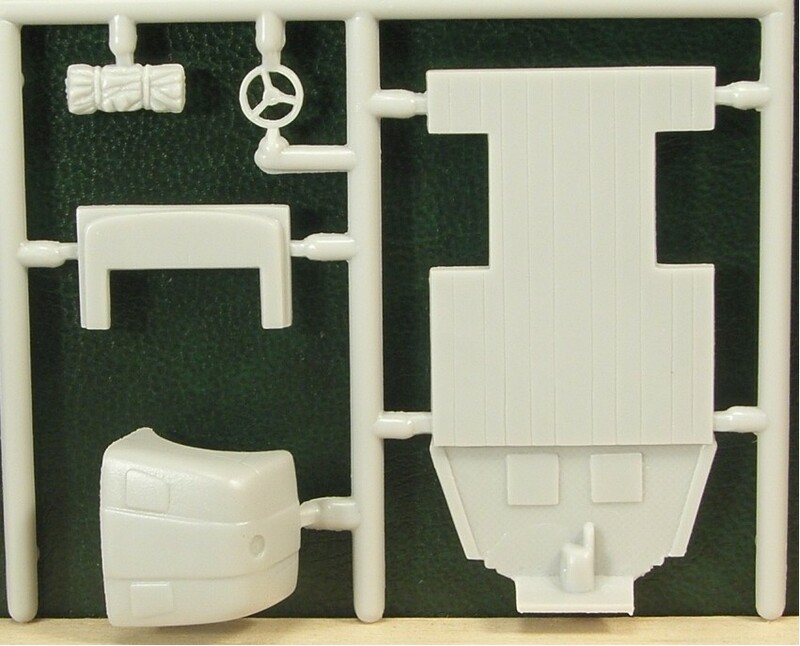 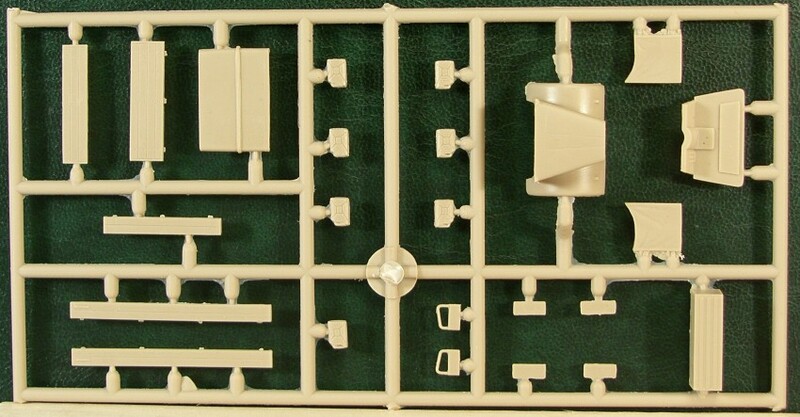 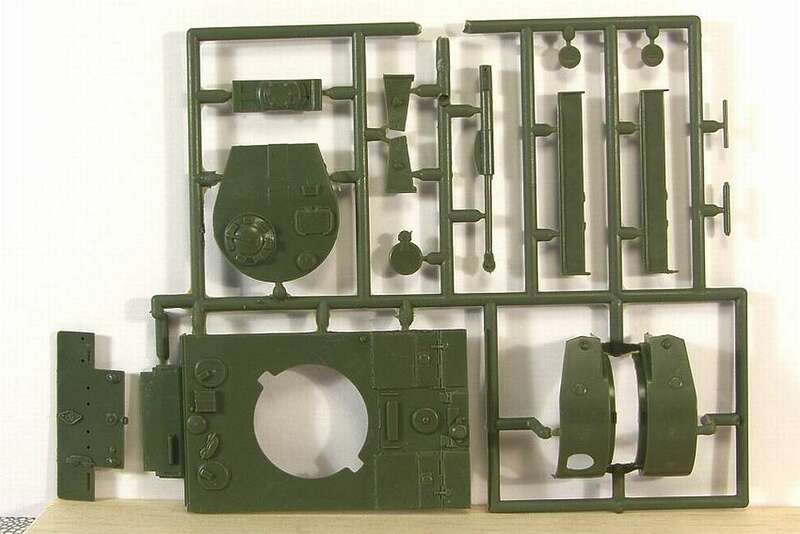 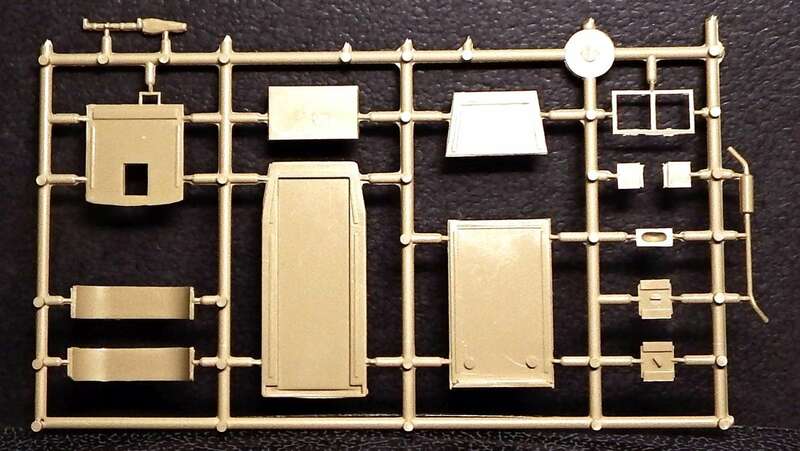 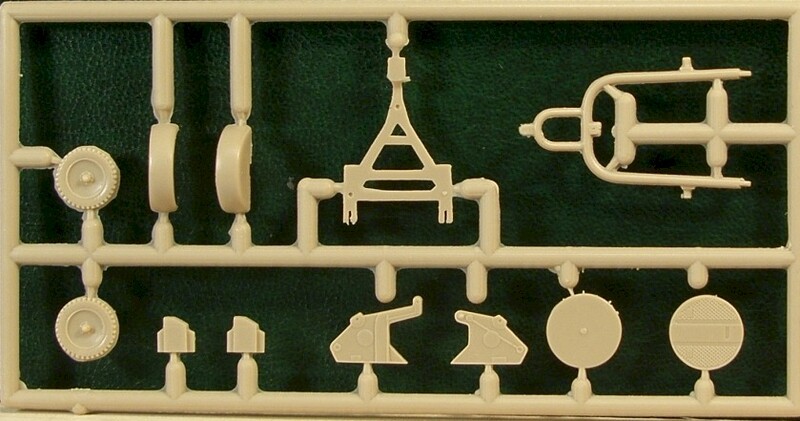 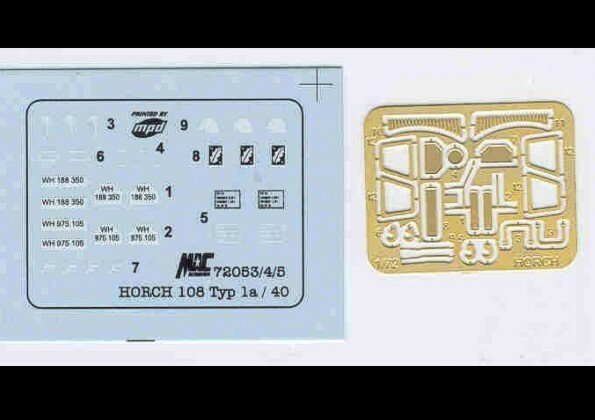 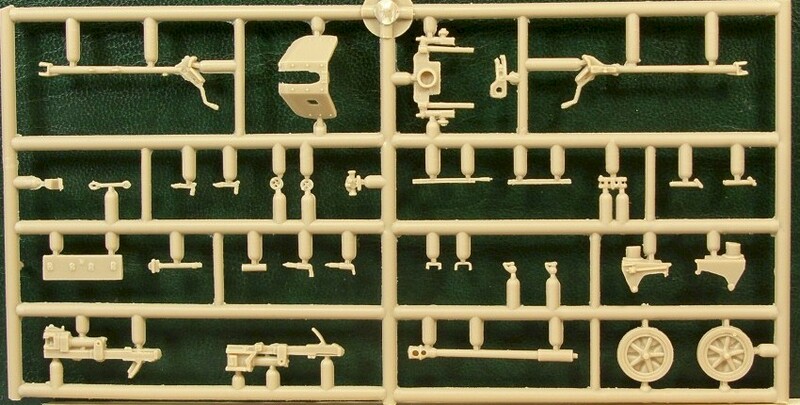 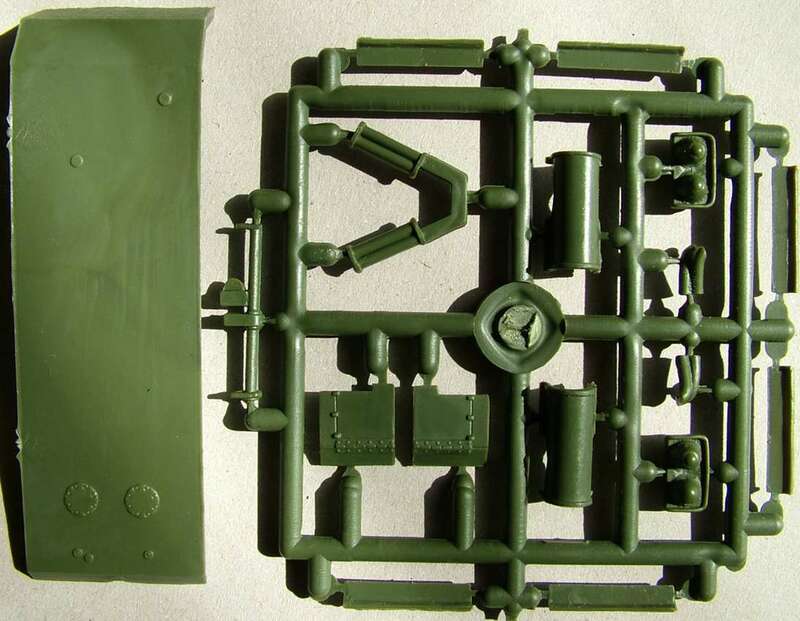 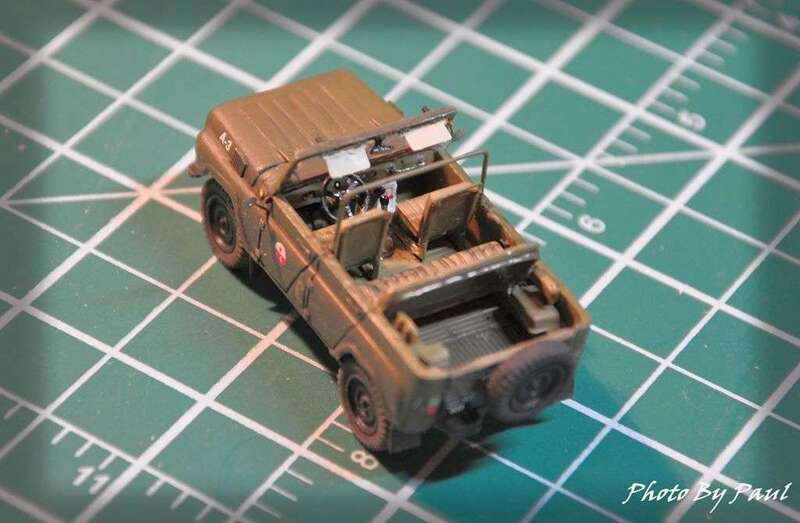 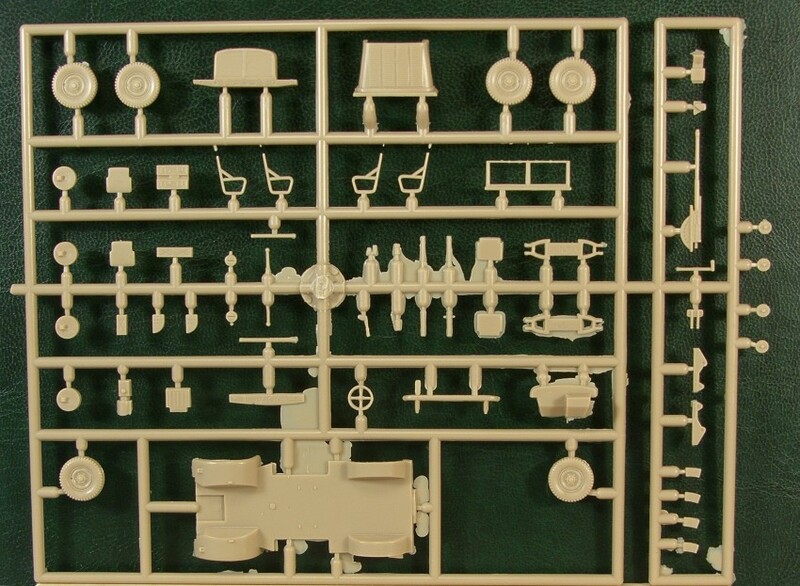 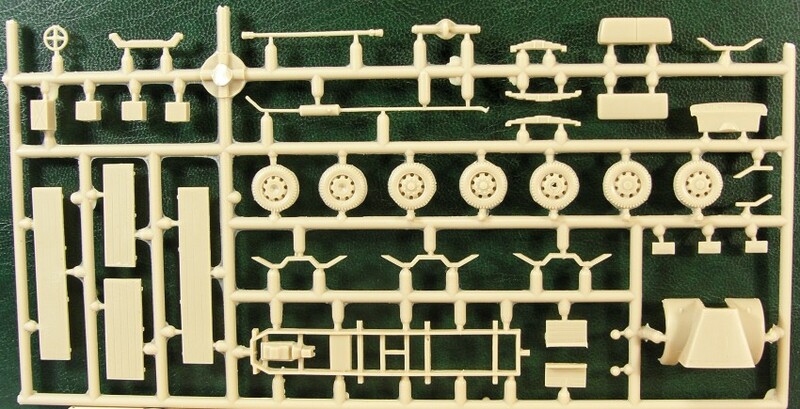 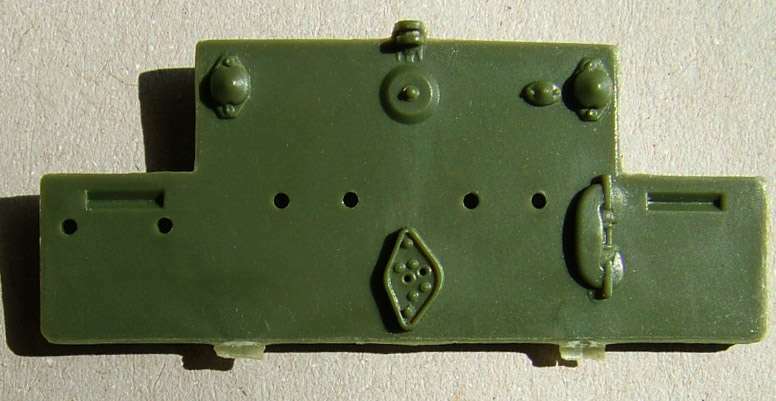 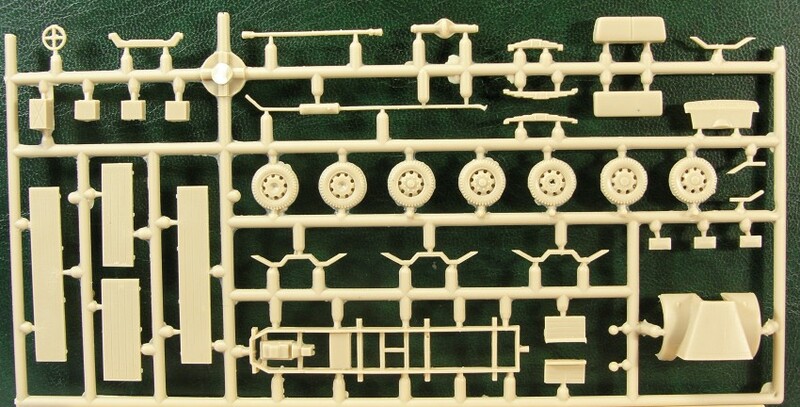 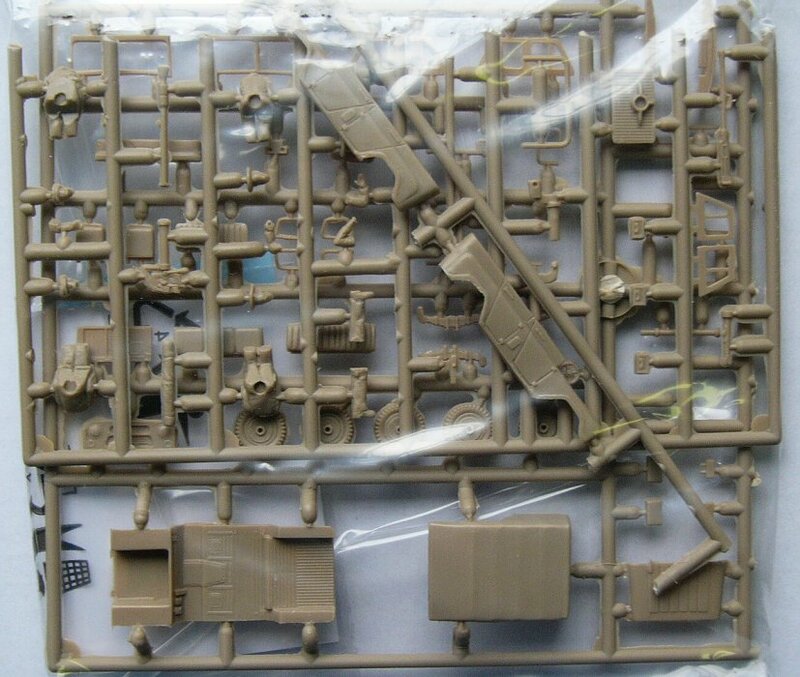 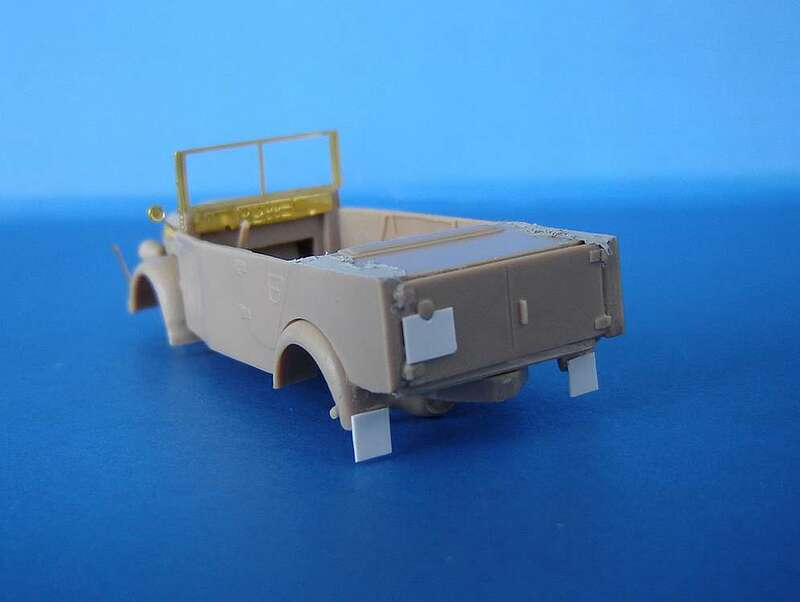 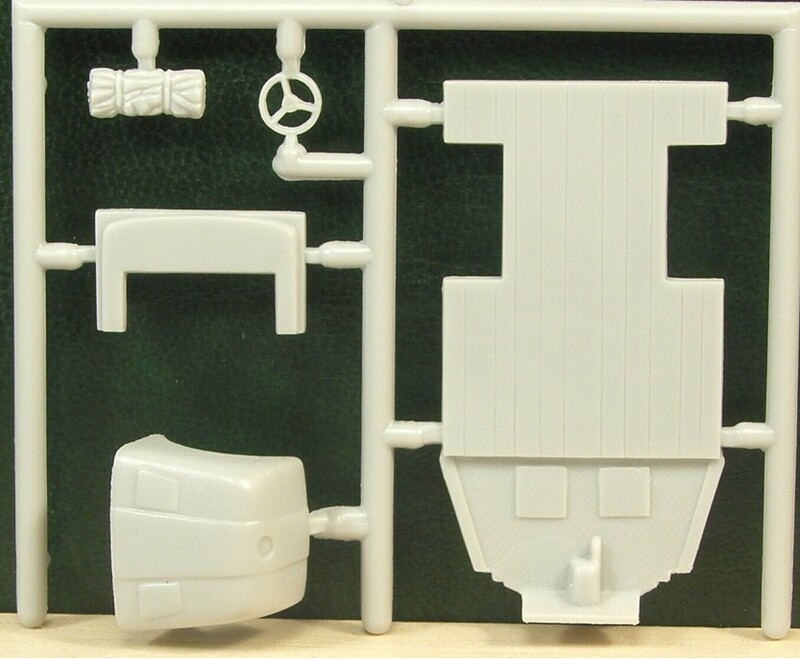 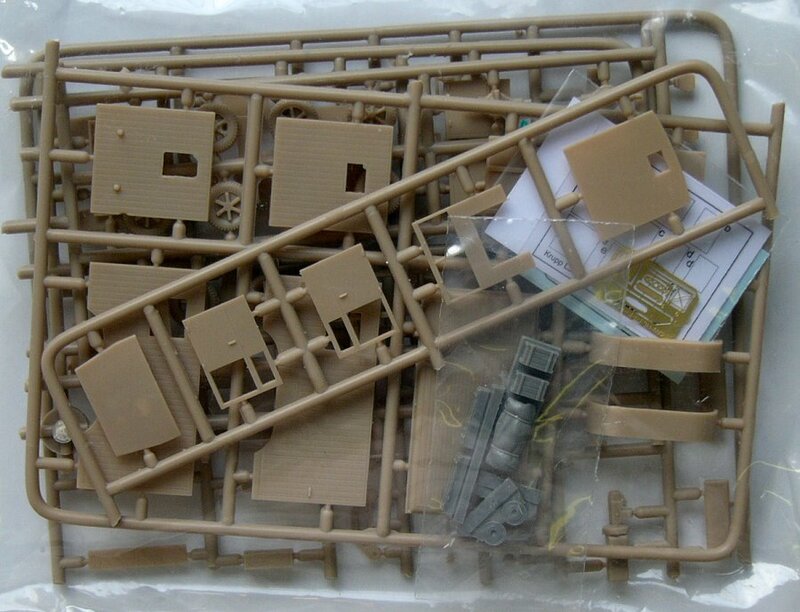 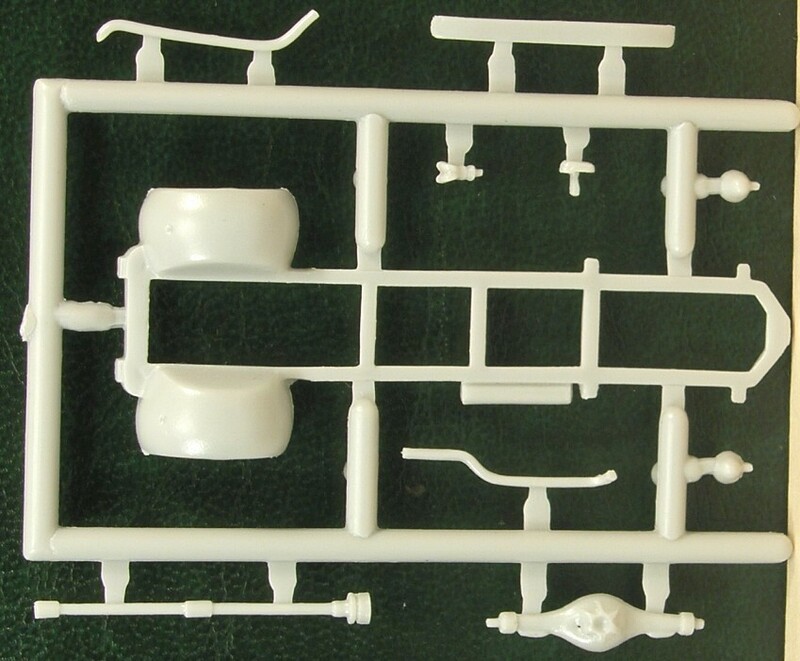 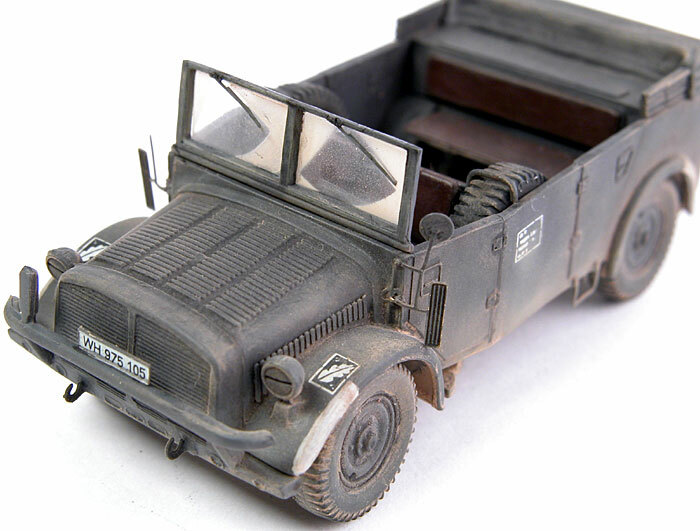 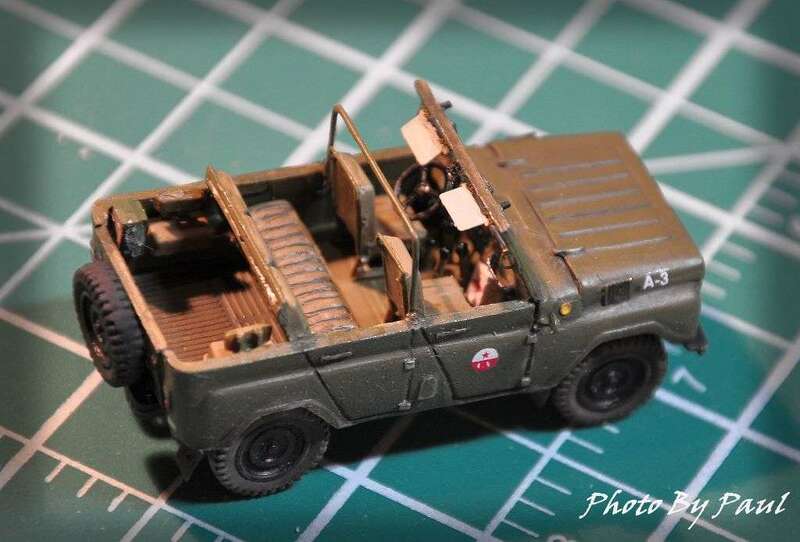 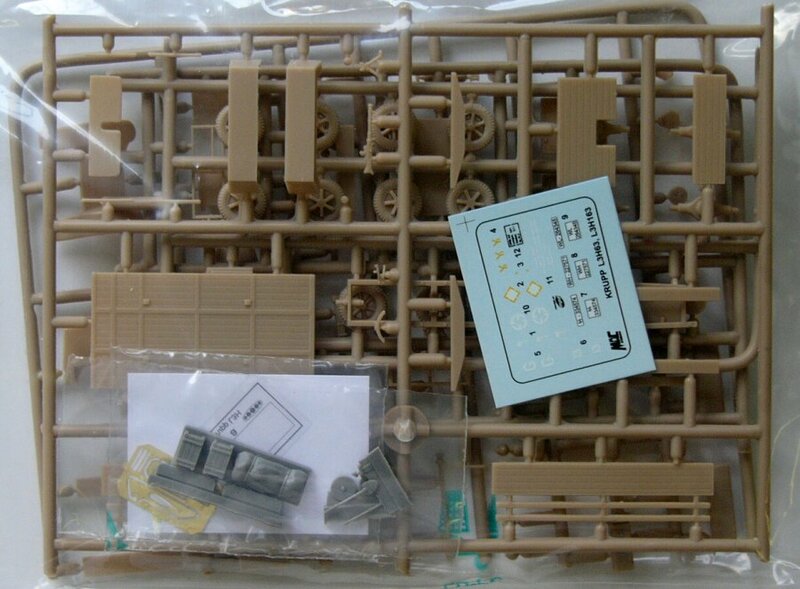 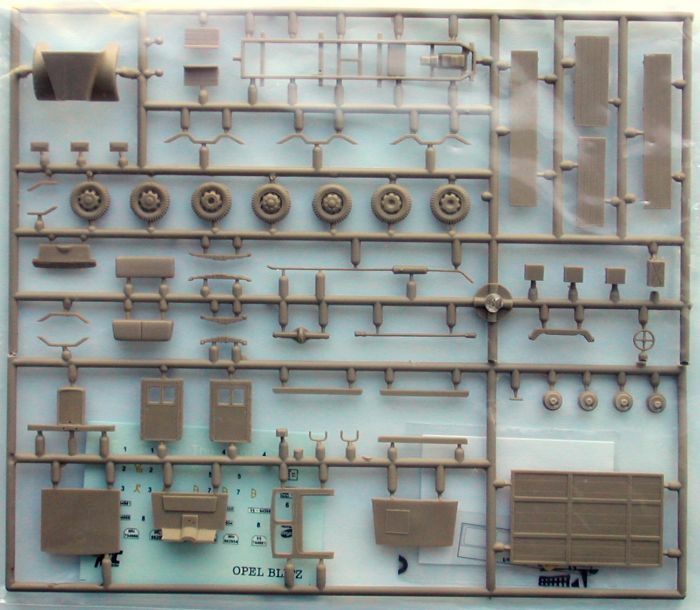 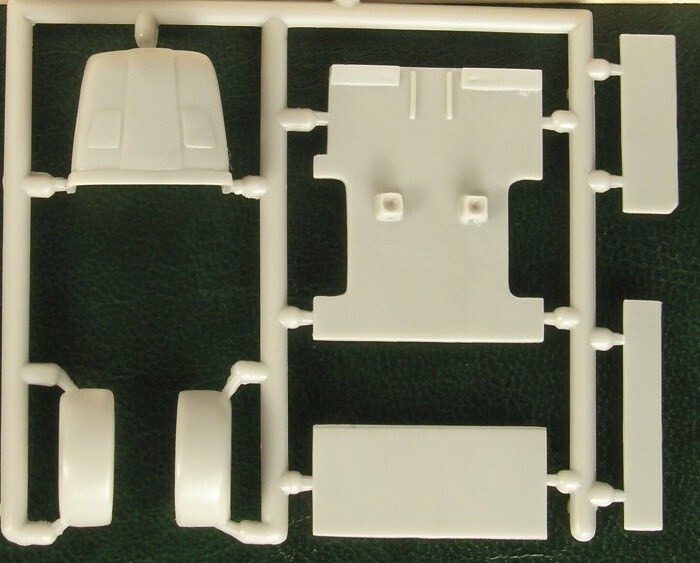 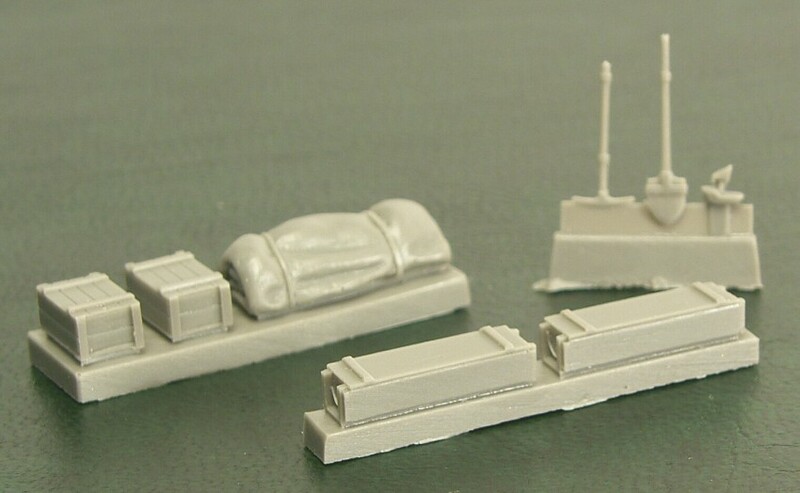 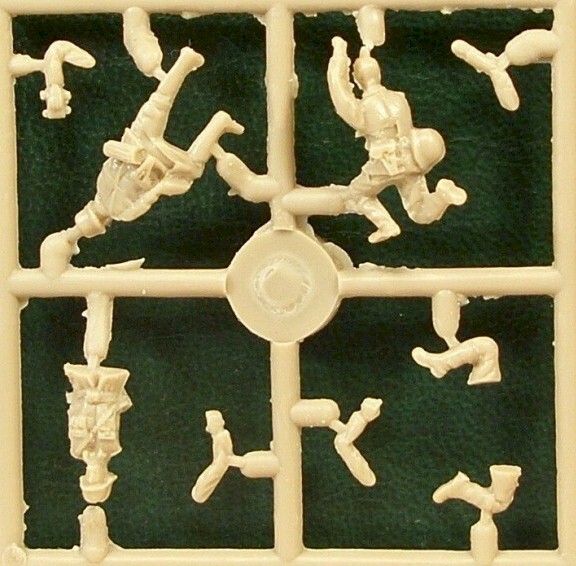 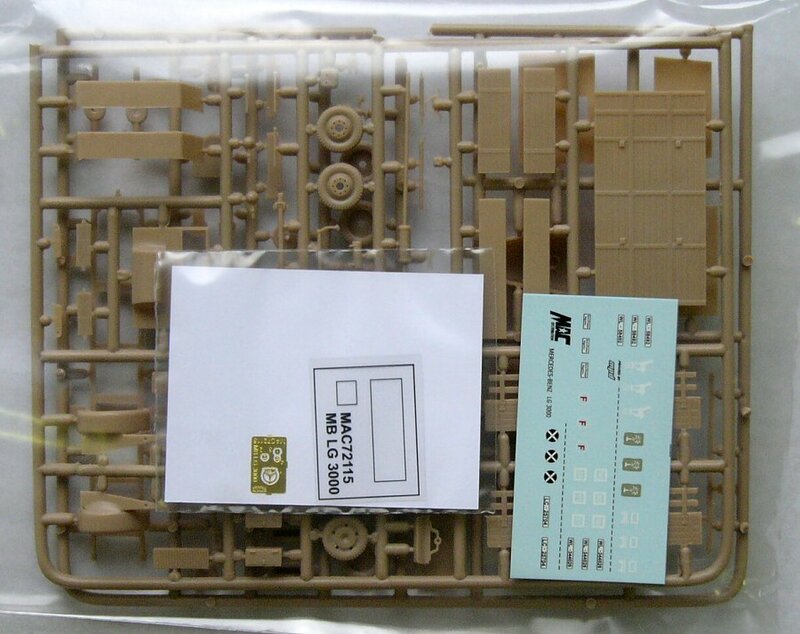 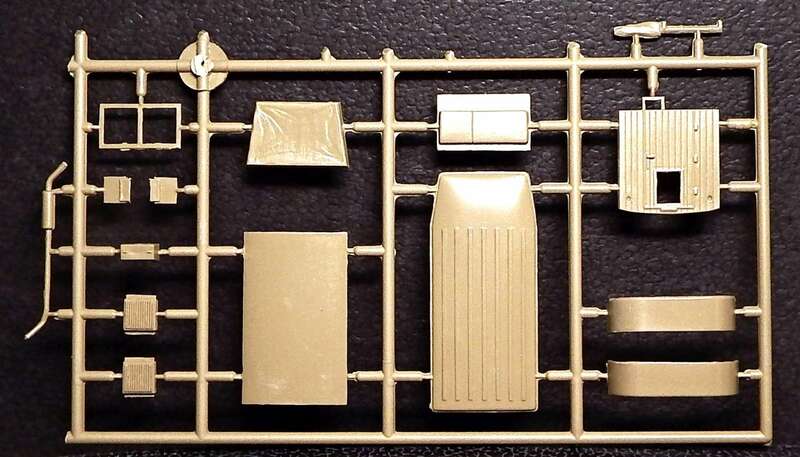 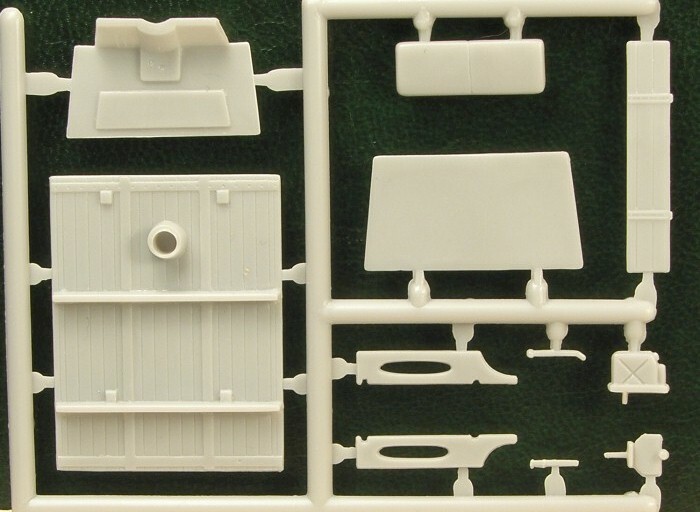 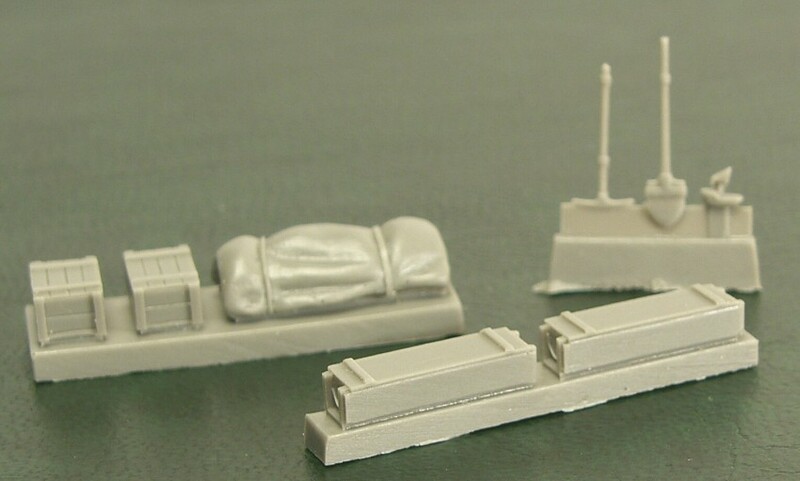 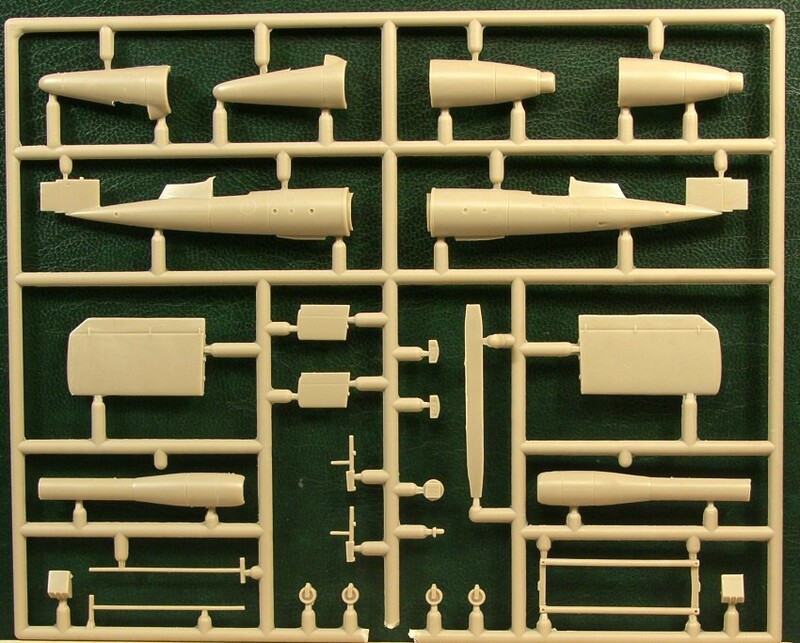 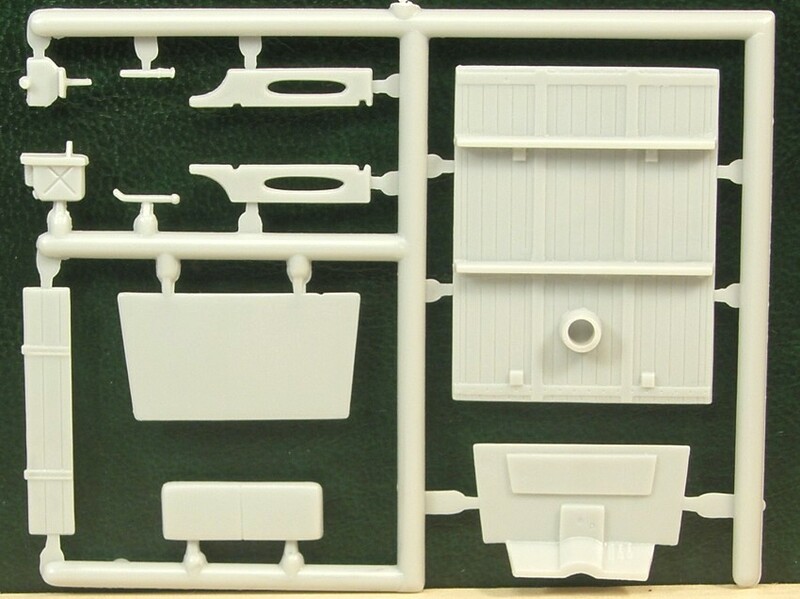 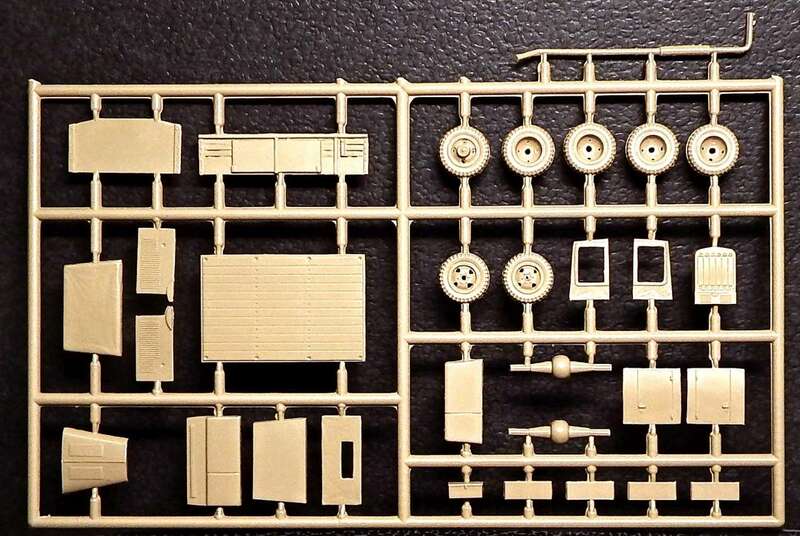 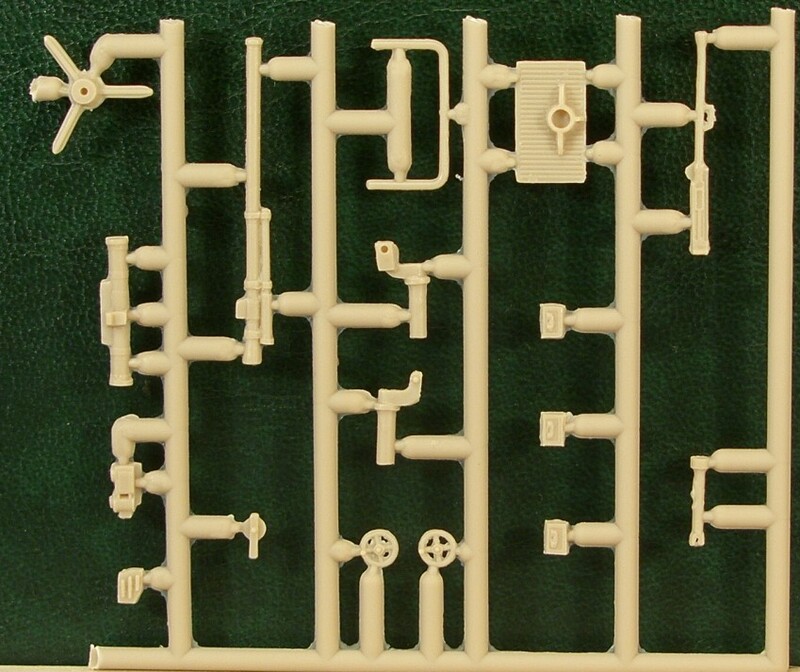 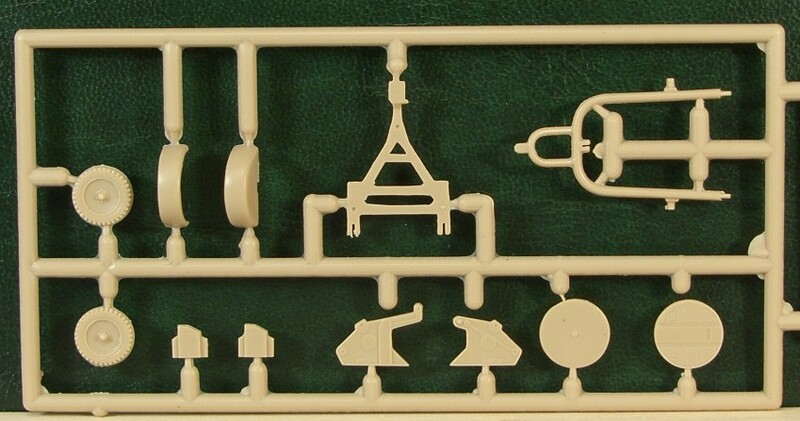 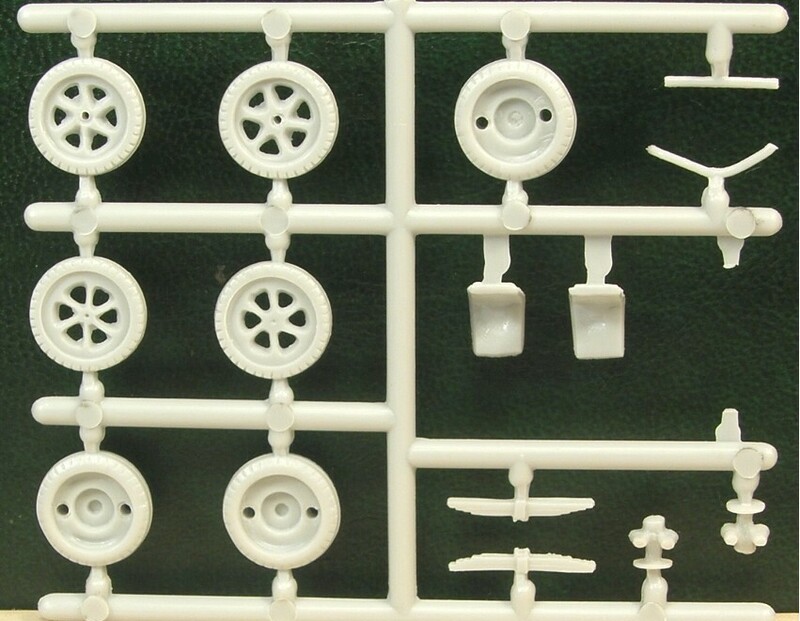 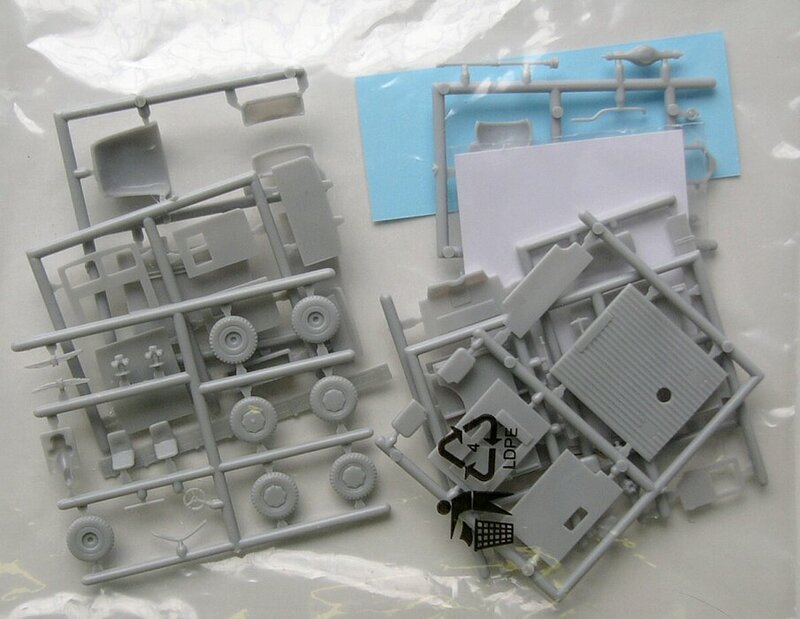 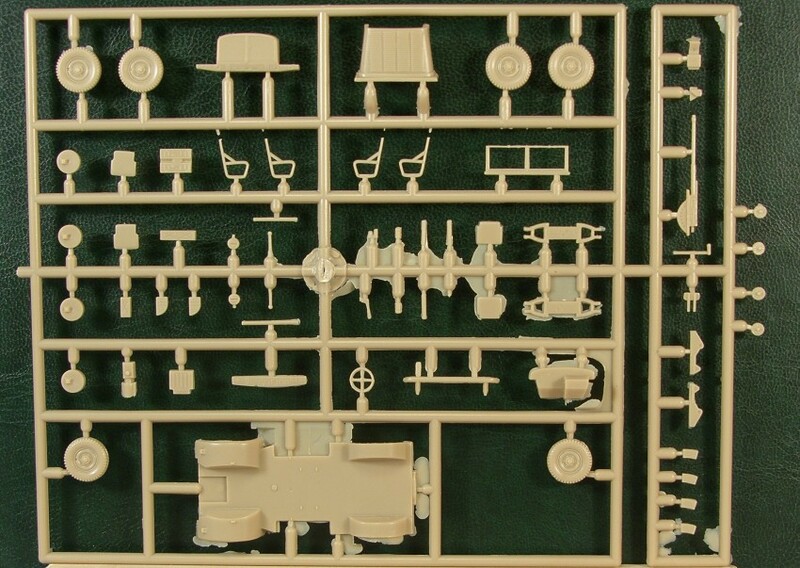 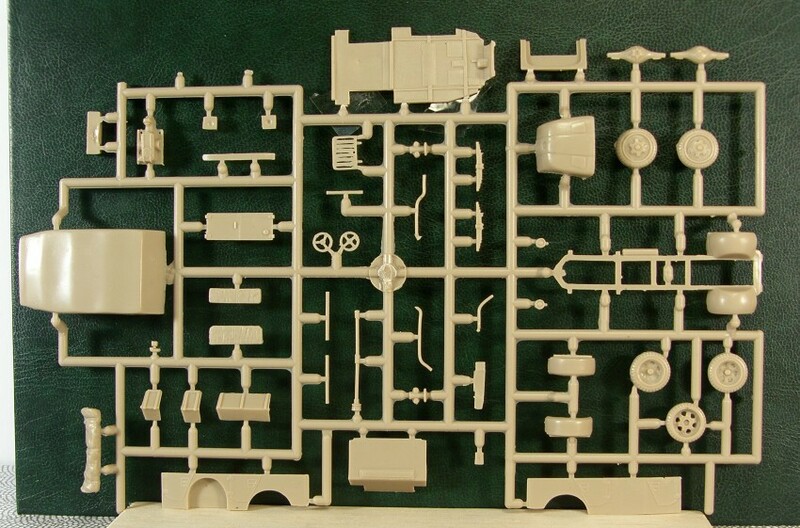 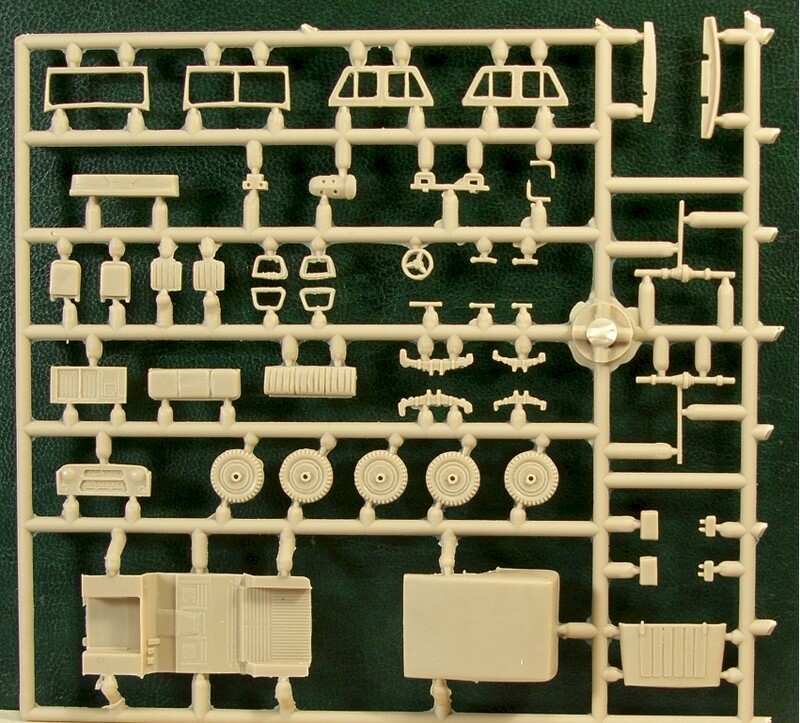 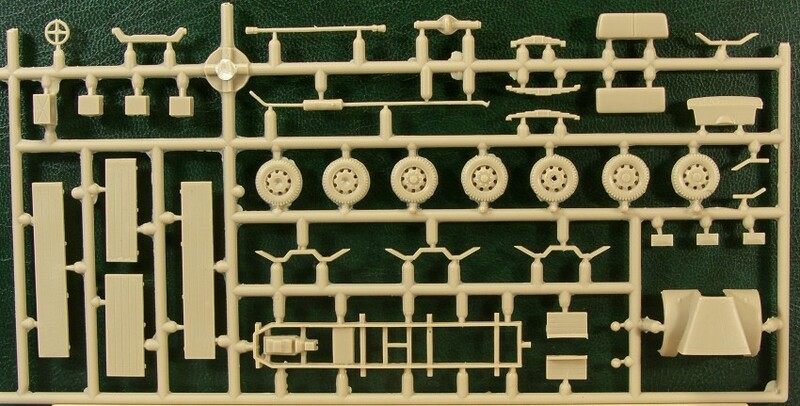 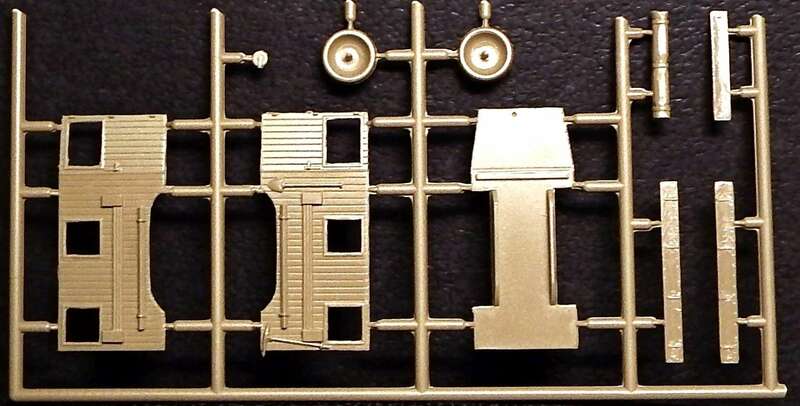 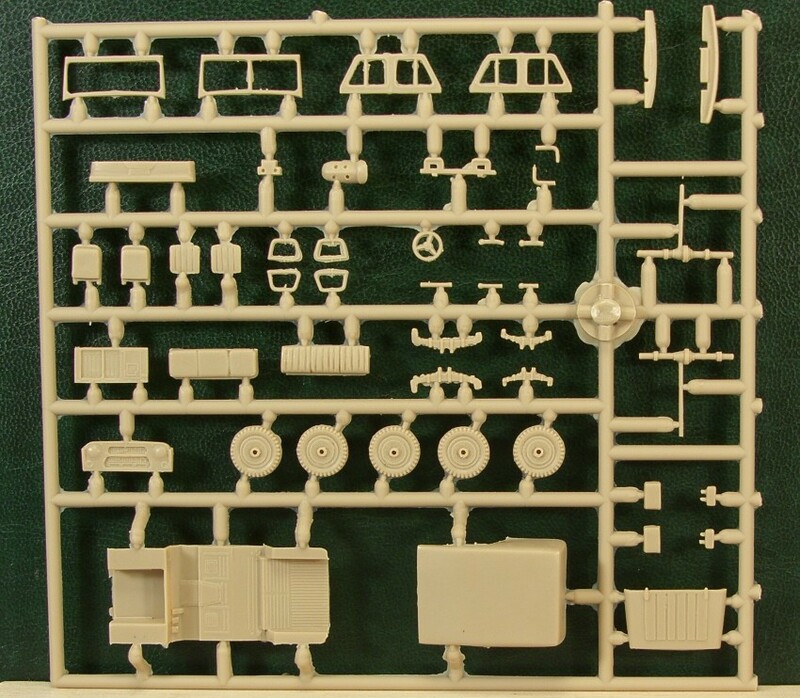 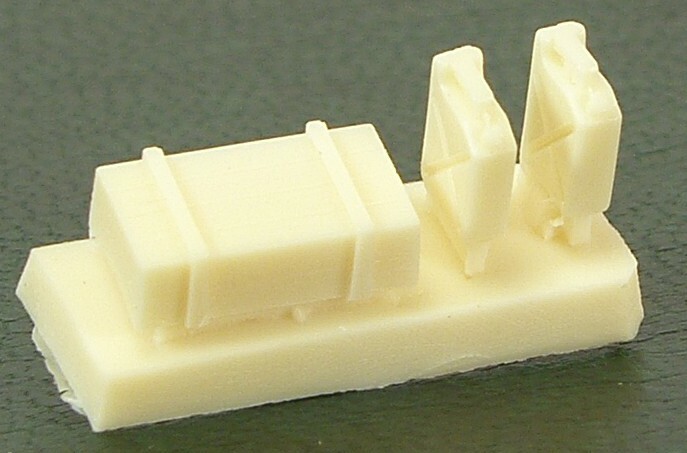 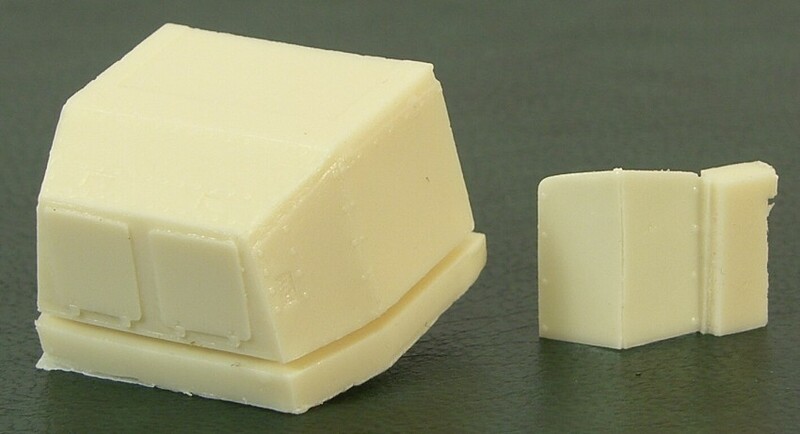 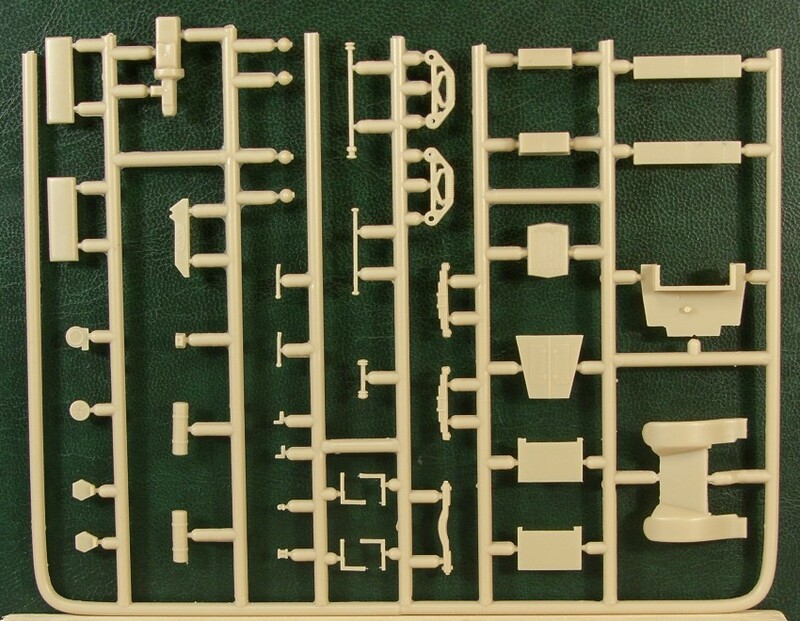 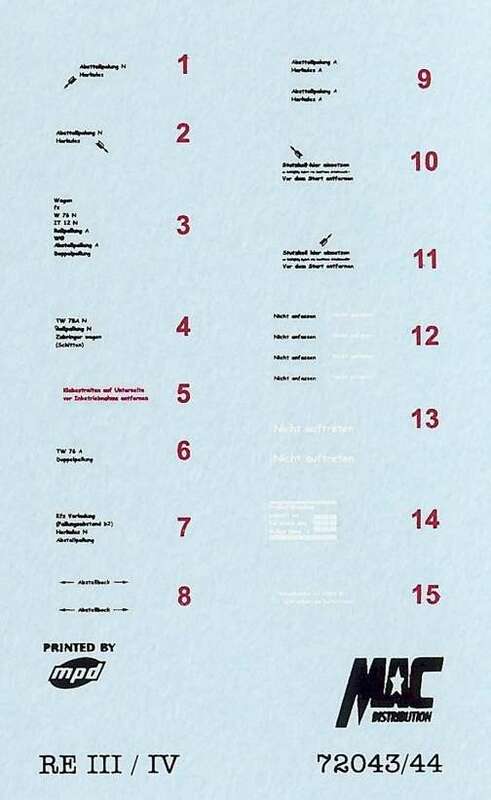 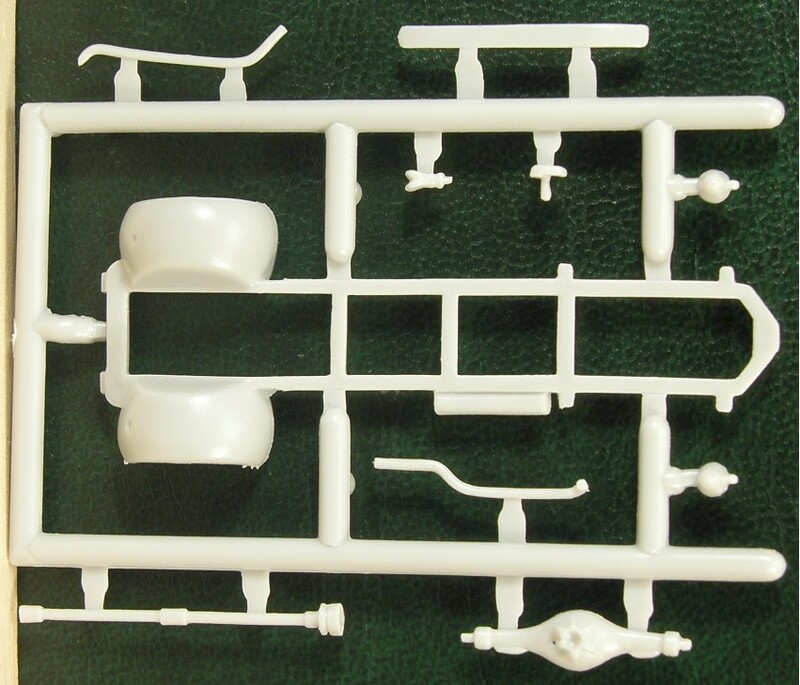 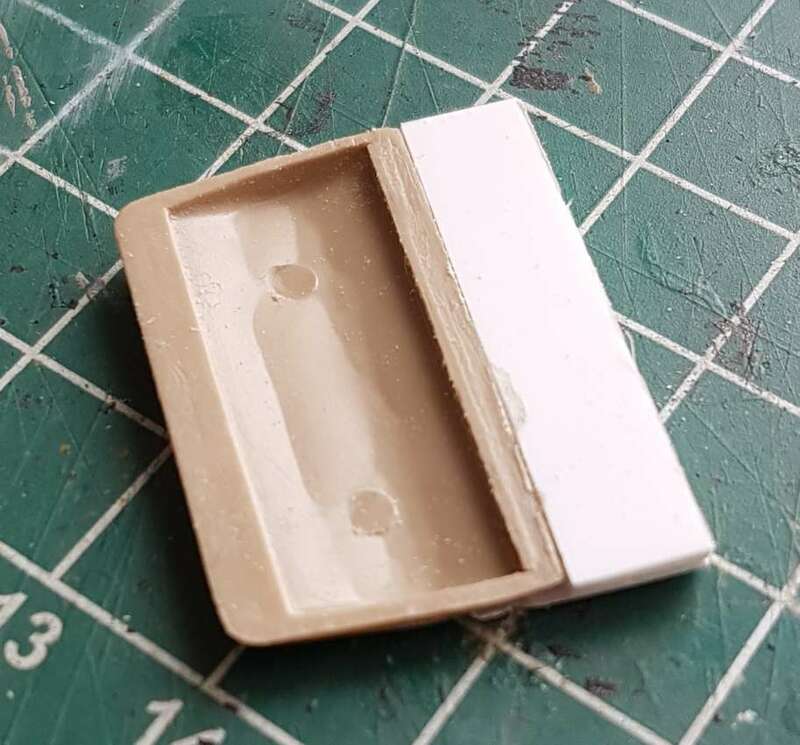 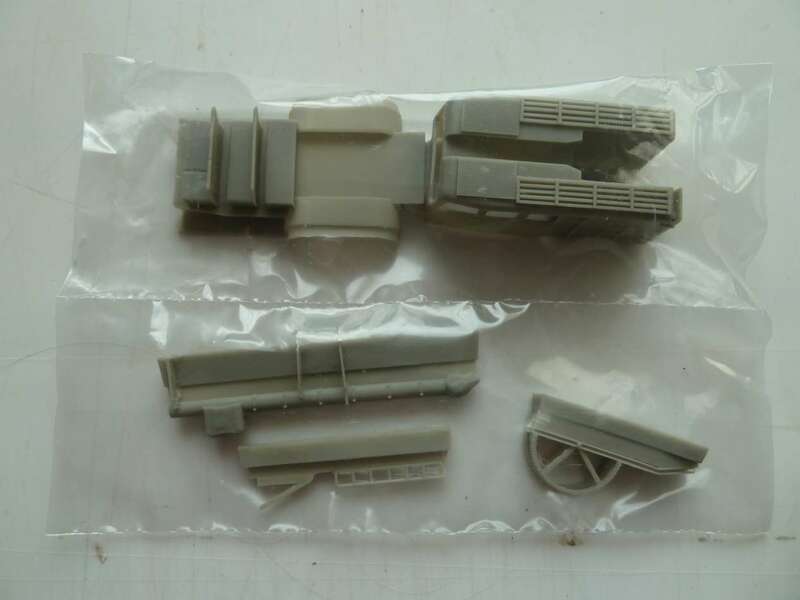 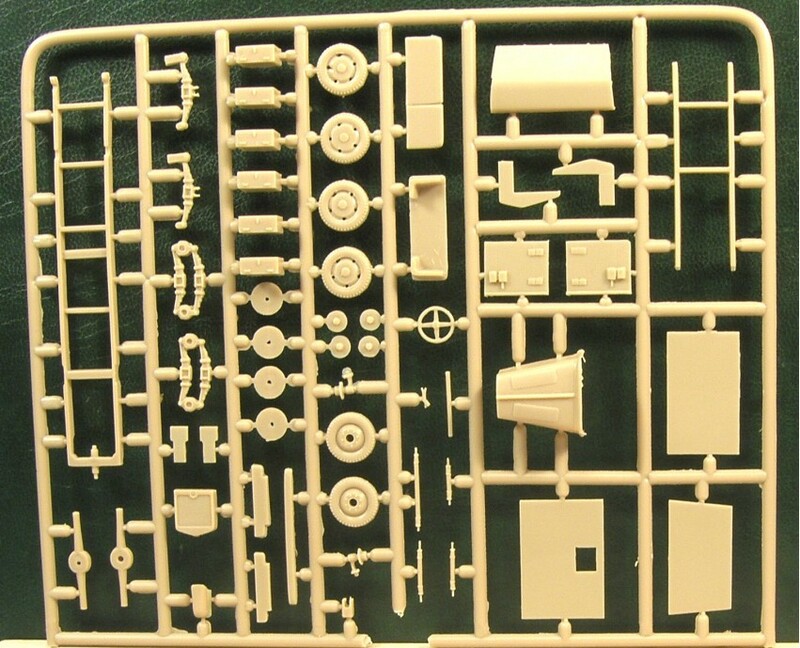 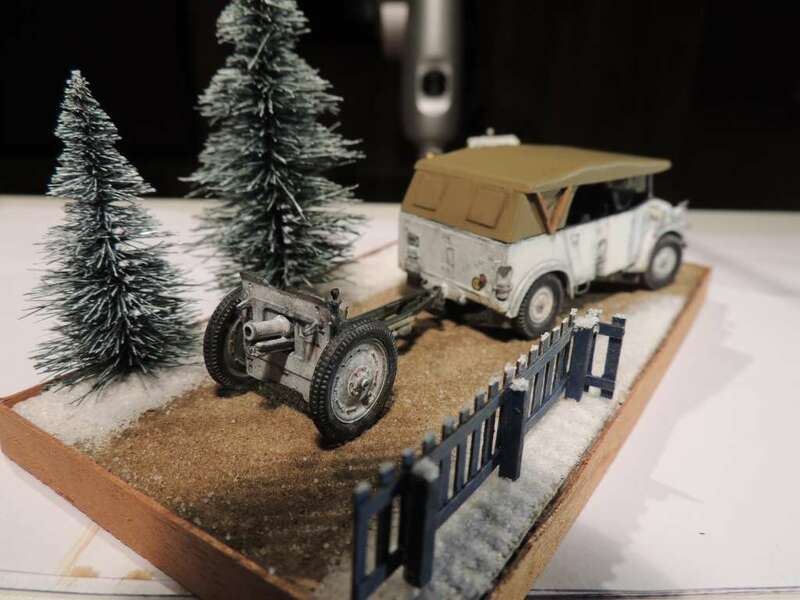 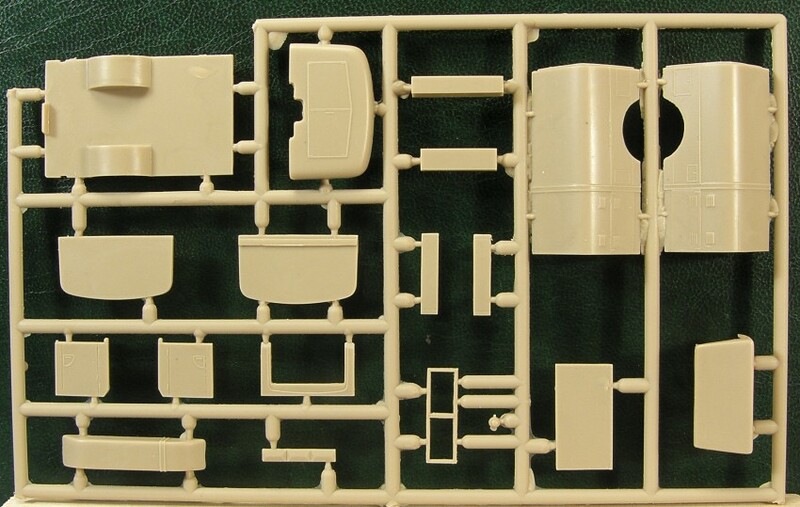 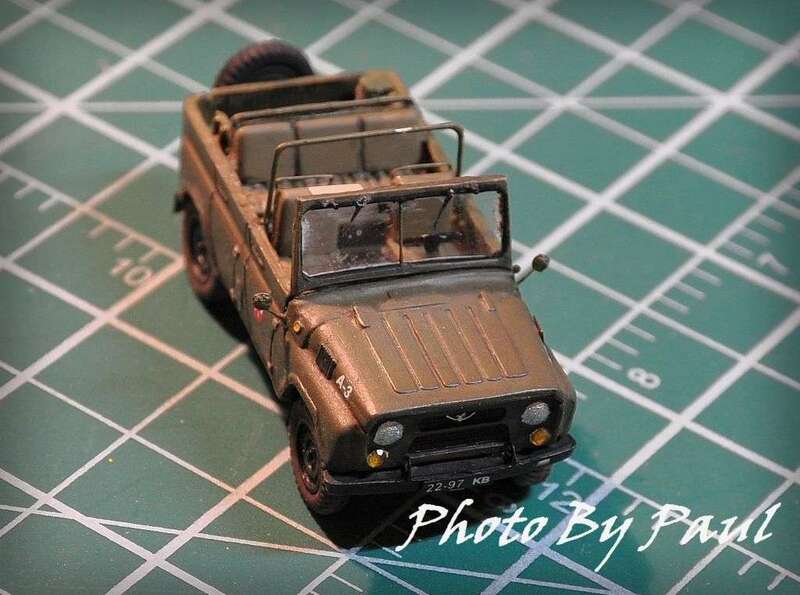 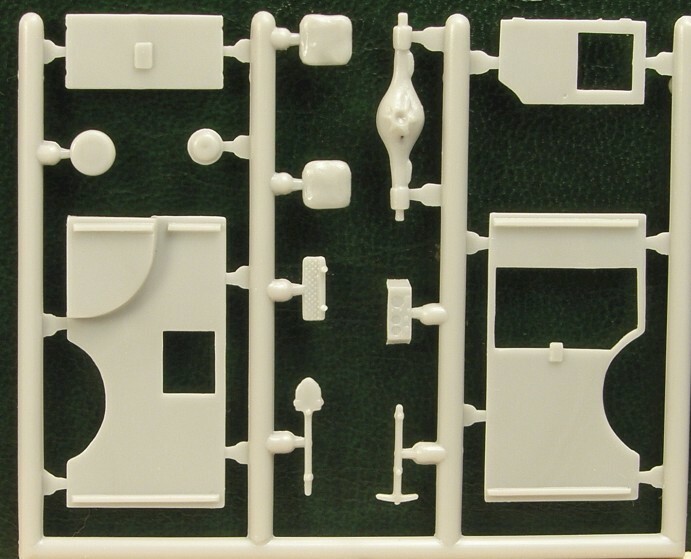 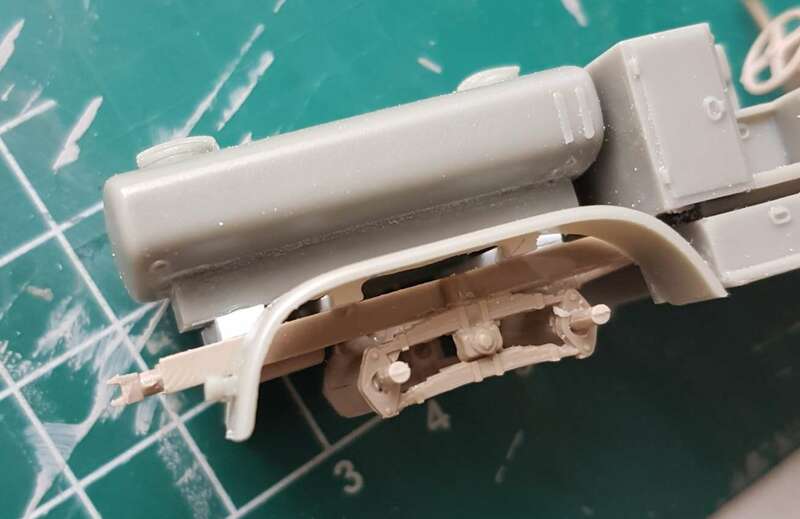 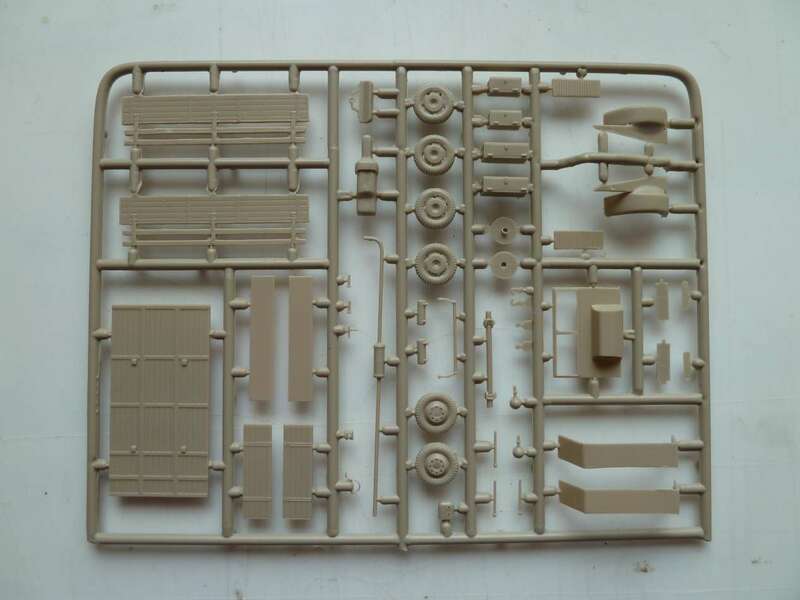 The parts for either version are in both kits ... each of which consists of one sprue of 45 crisp, cleanly injection moulded parts, a small fret of photo etched details and a small decal sheet. 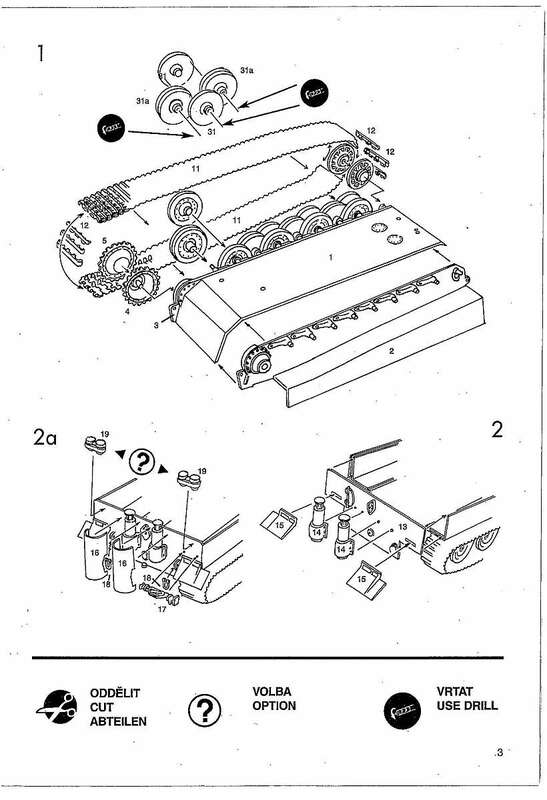 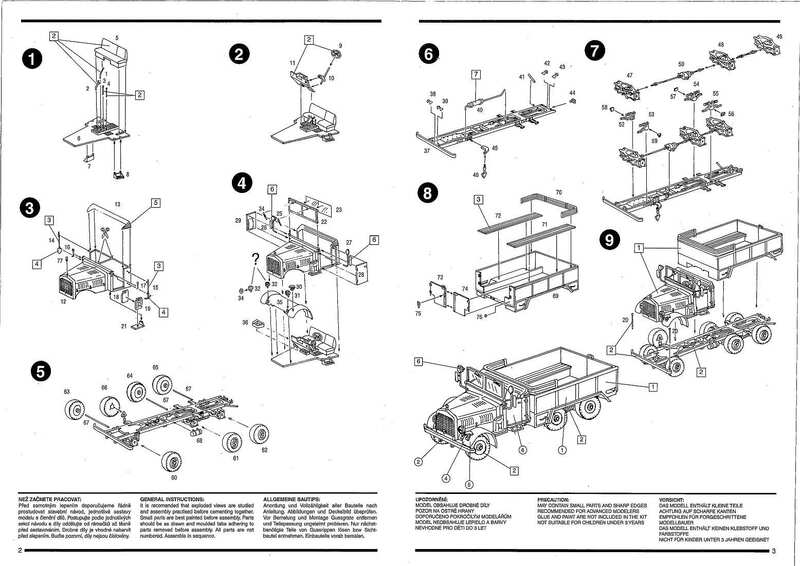 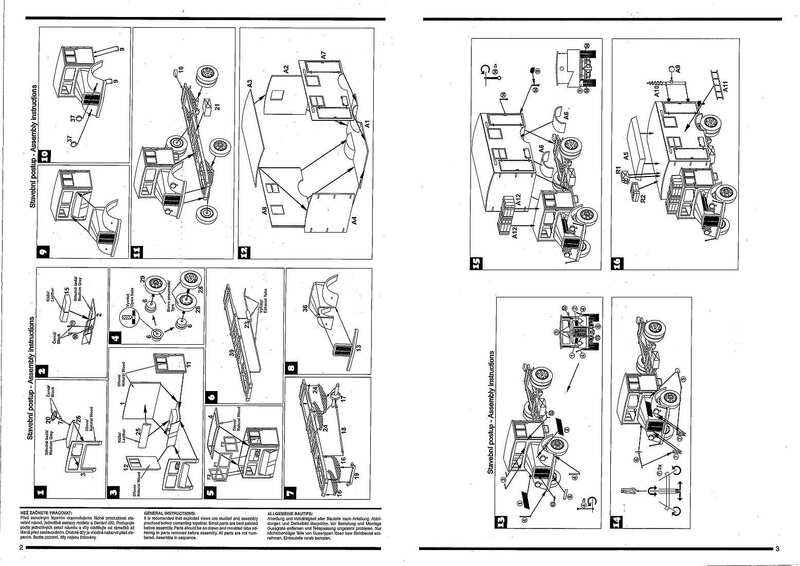 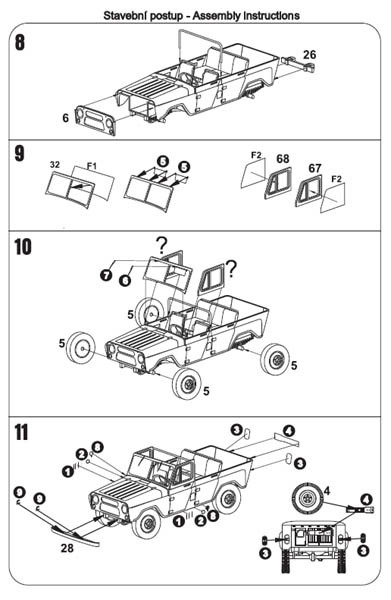 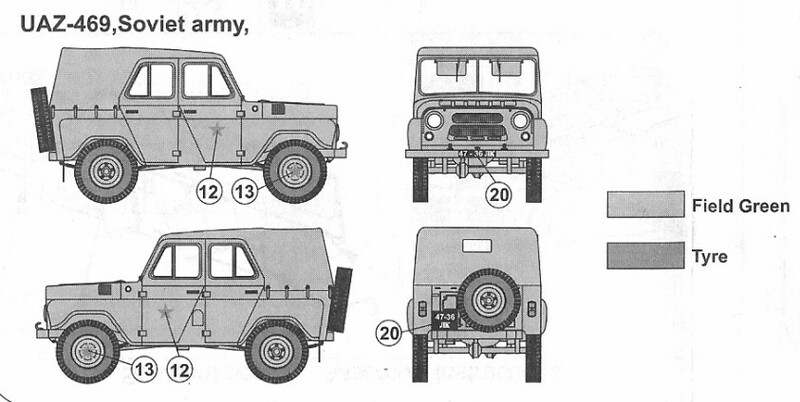 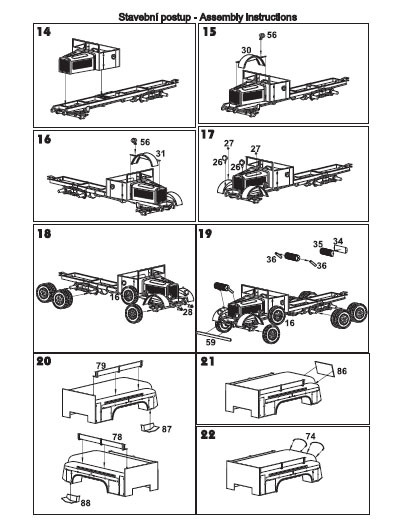 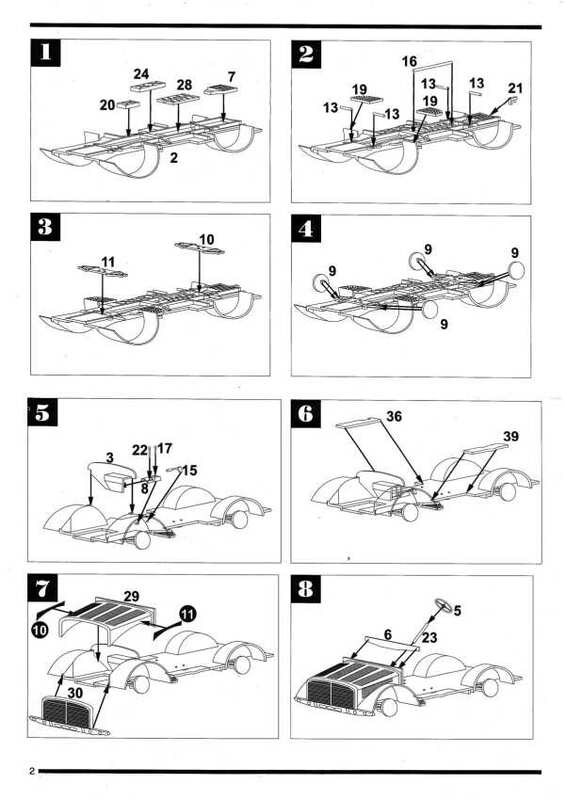 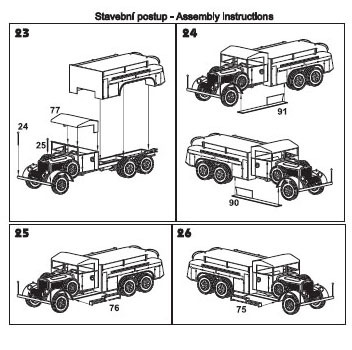 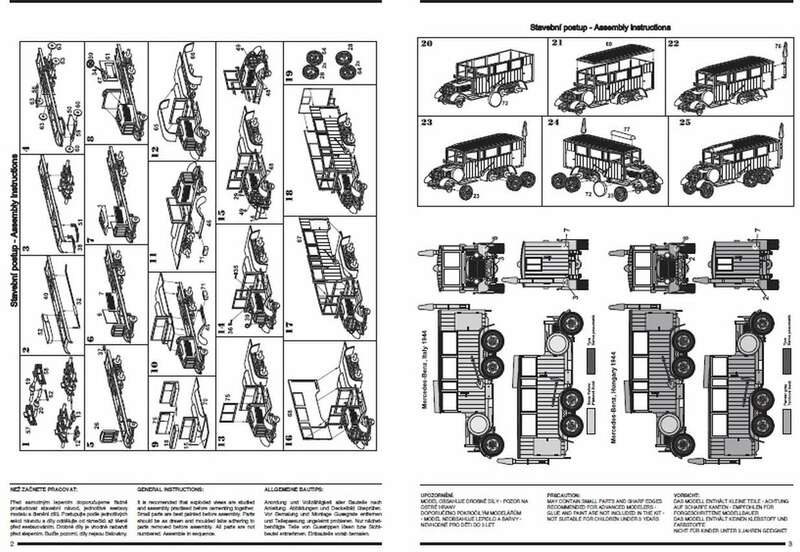 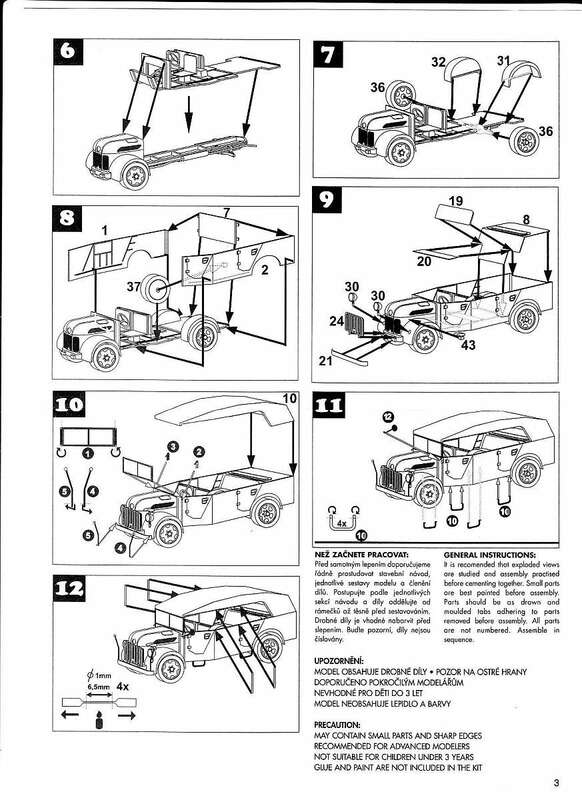 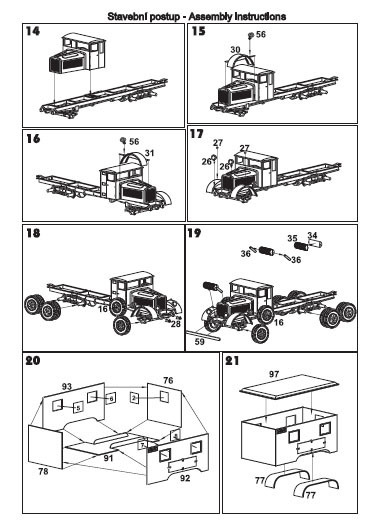 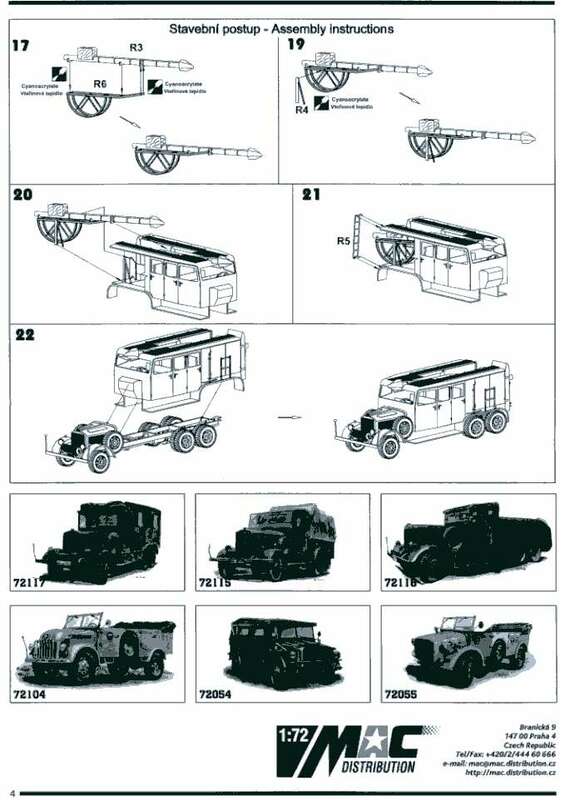 No engine is supplied but you do get the sump, separate chassis, drive shaft, axles and suspension (tyres are moulded onto the wheels). 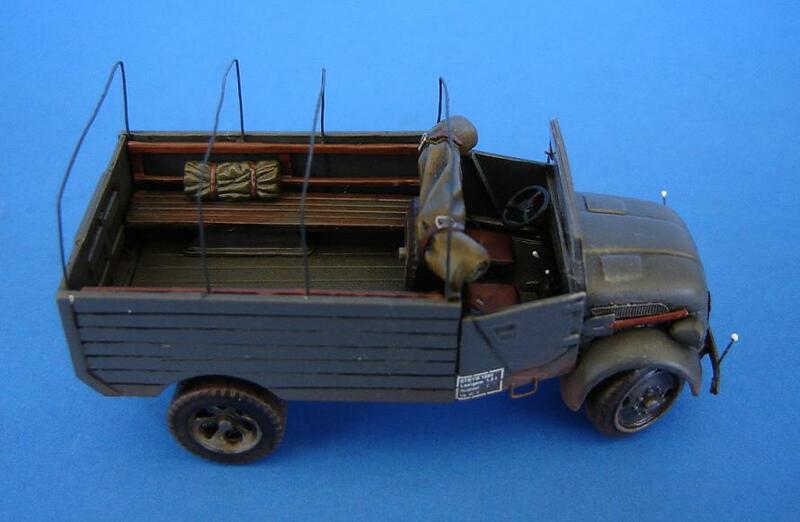 Interior detail is 'reasonable' with seats, dash board (with photo etched instruments) and steering wheel. 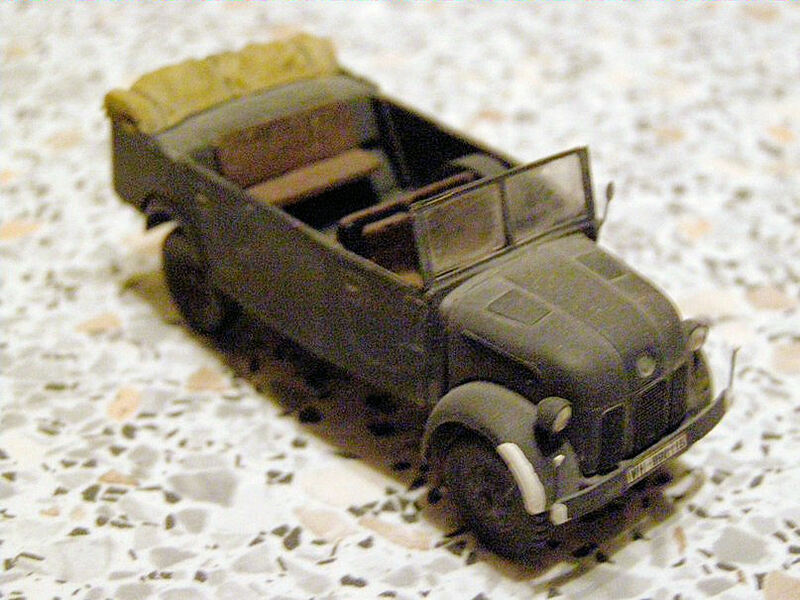 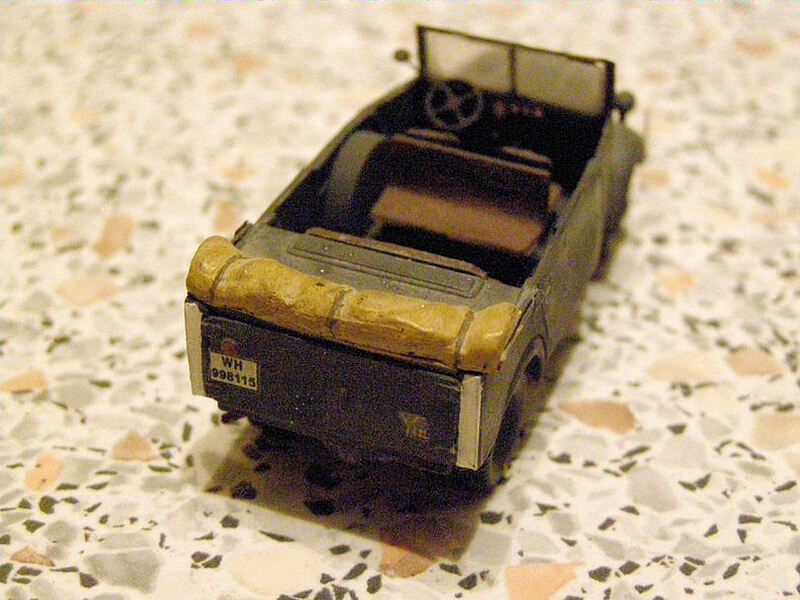 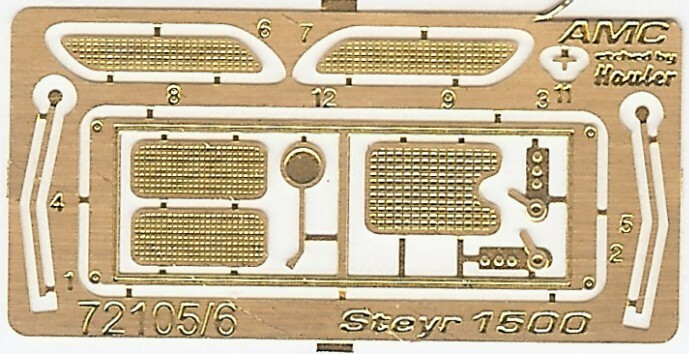 The radiator grills and side grills in the bonnet are represented by photo etched parts. 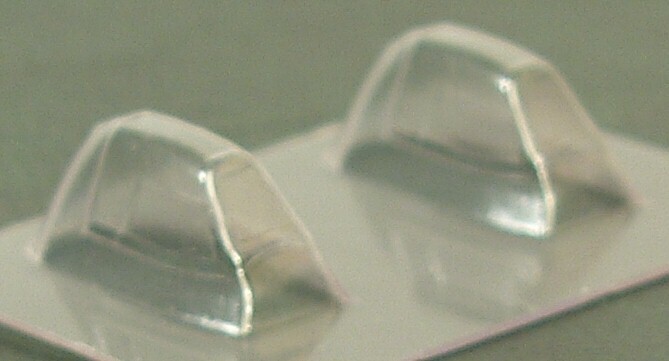 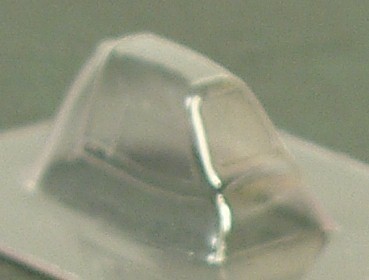 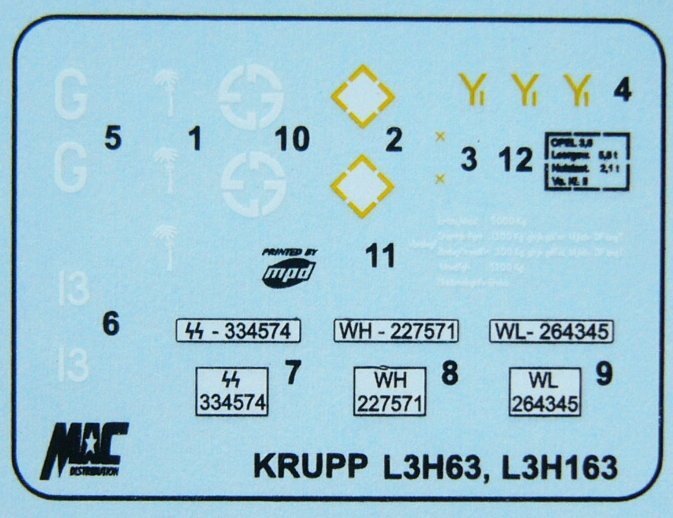 The windscreen frame is also photo etched with what appears to be a clear 'film' supplied to be used as the windscreen glass. 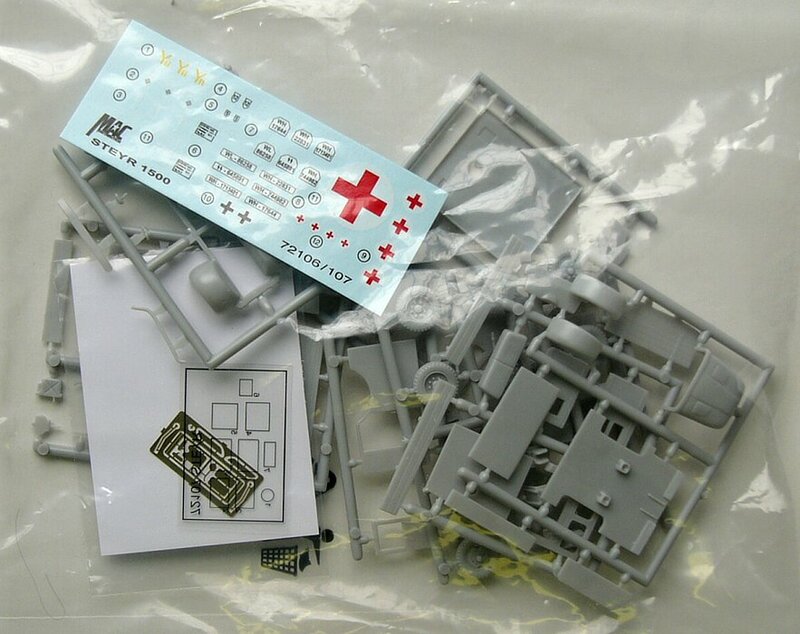 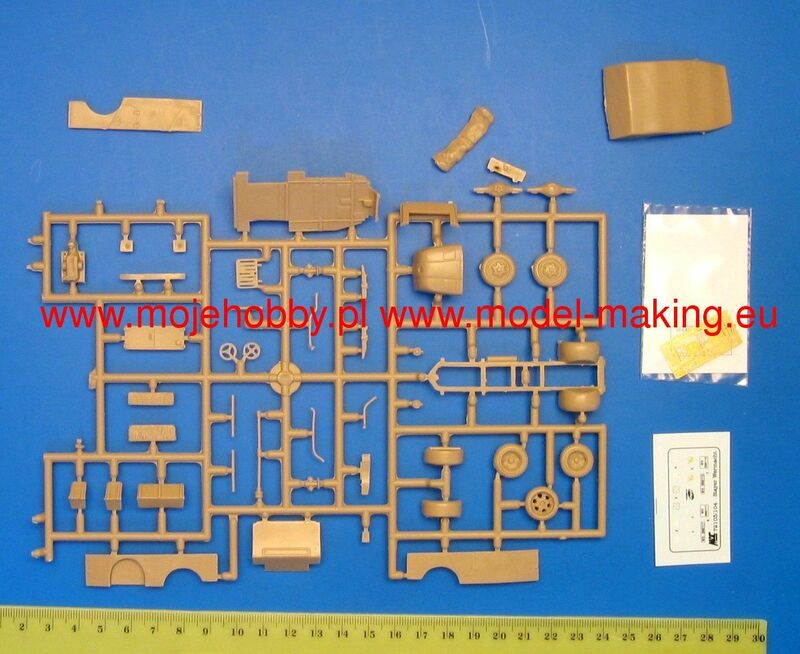 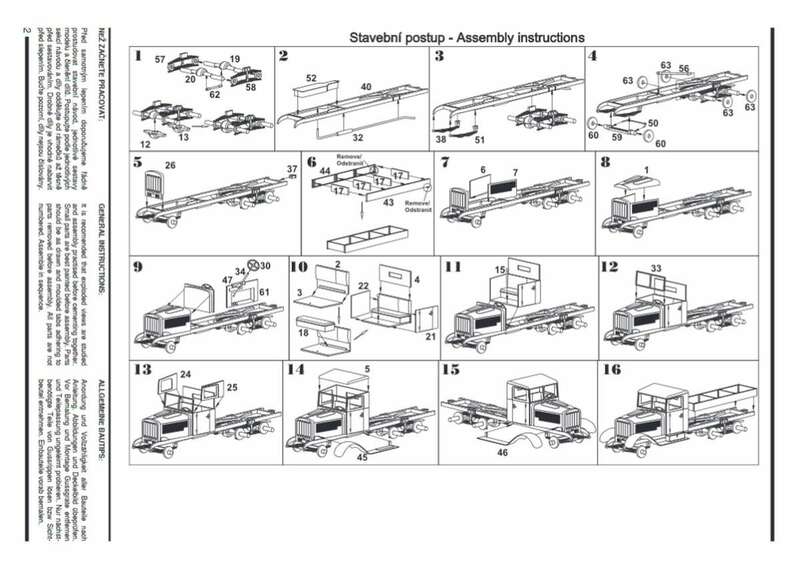 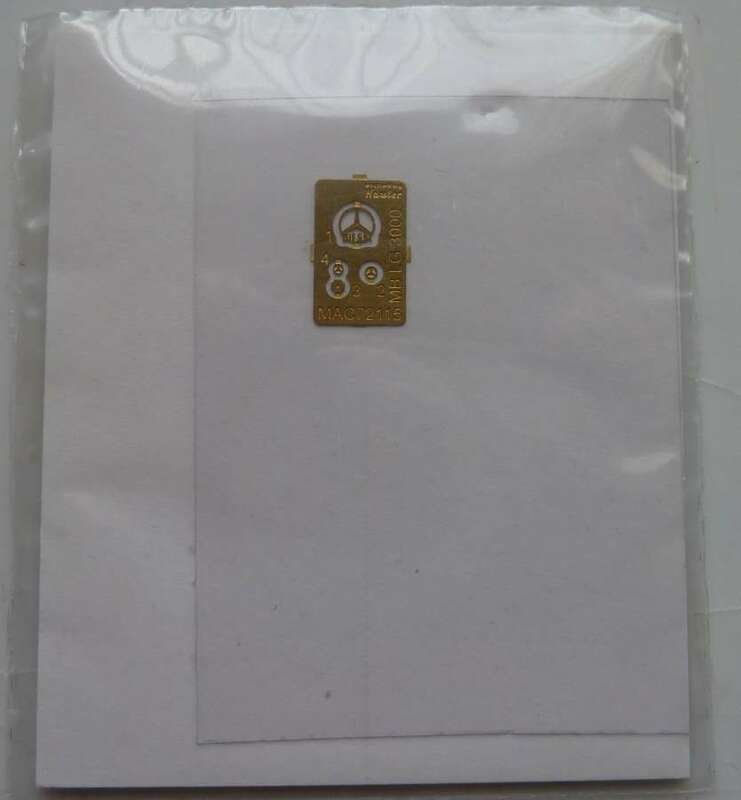 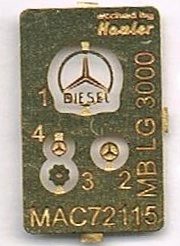 The kits are high quality, fine detailled, with small parts. 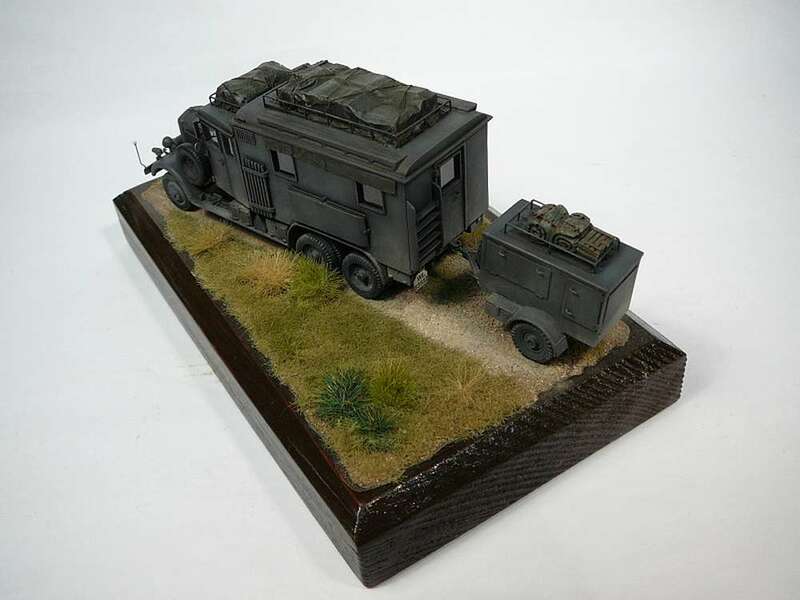 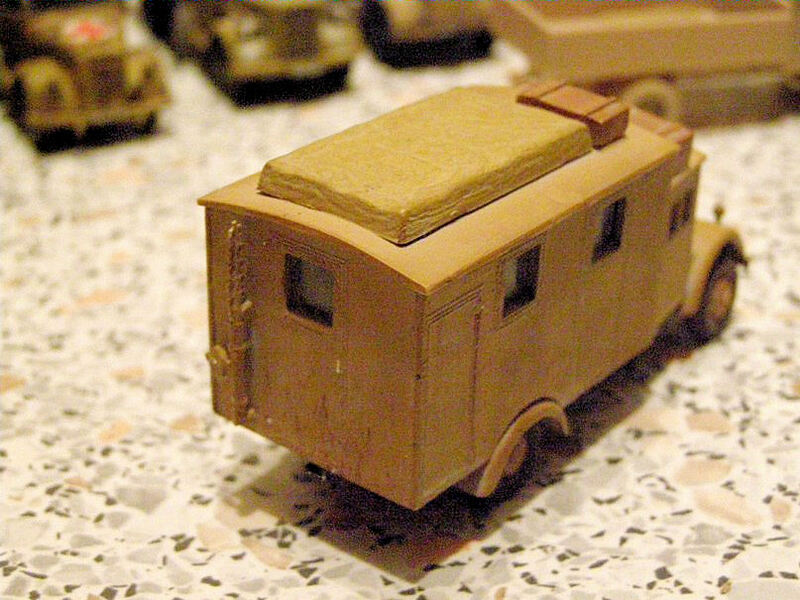 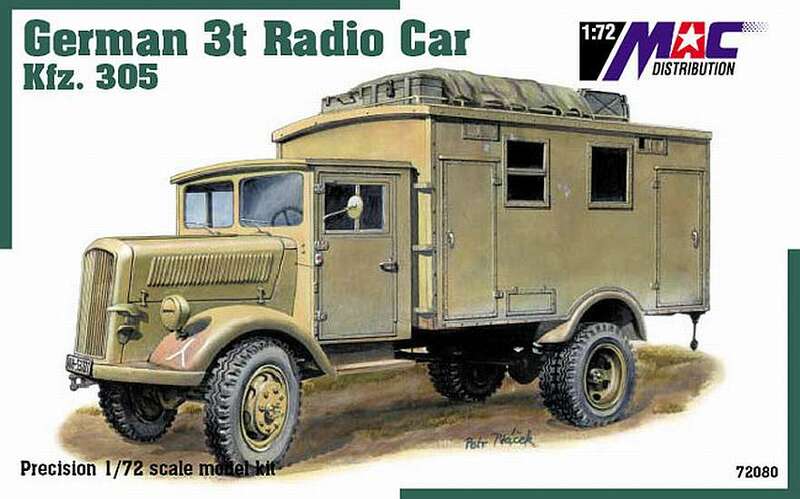 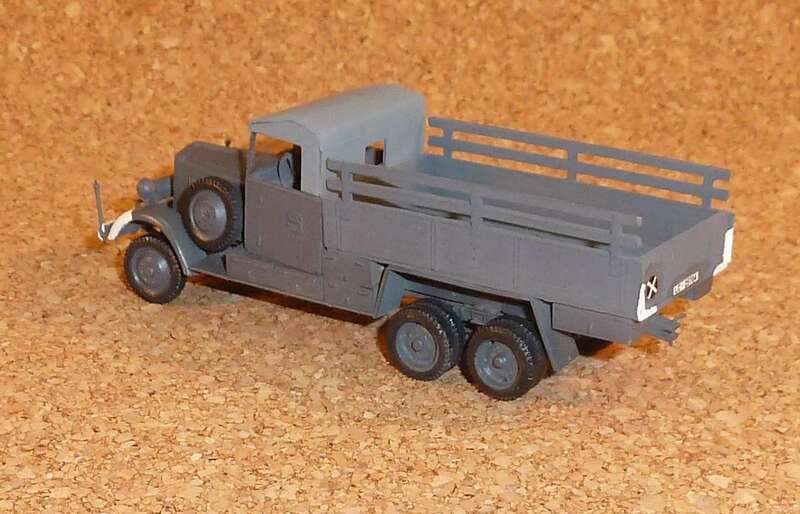 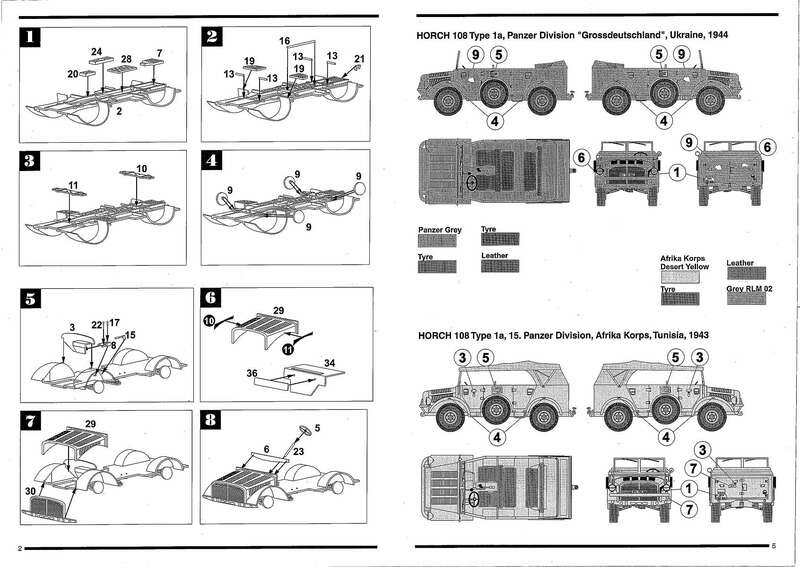 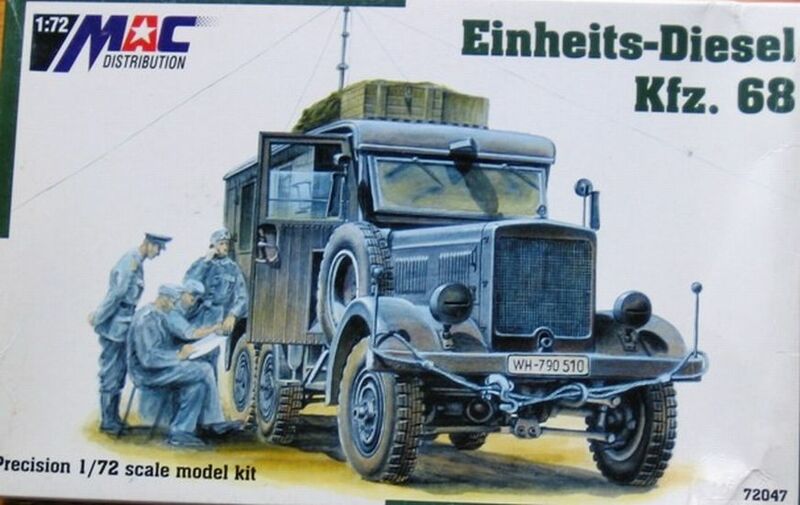 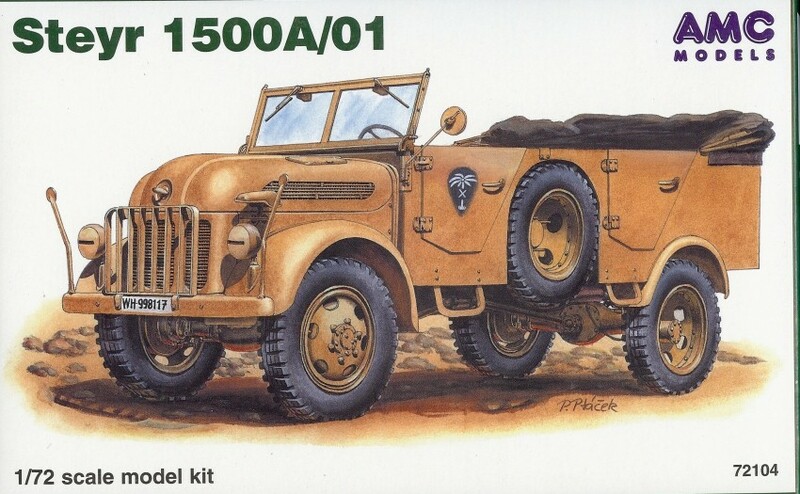 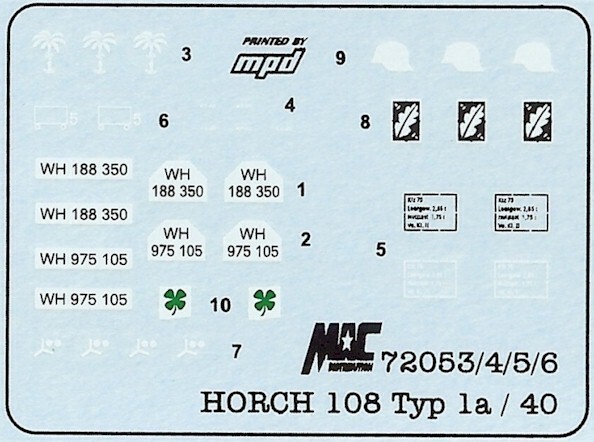 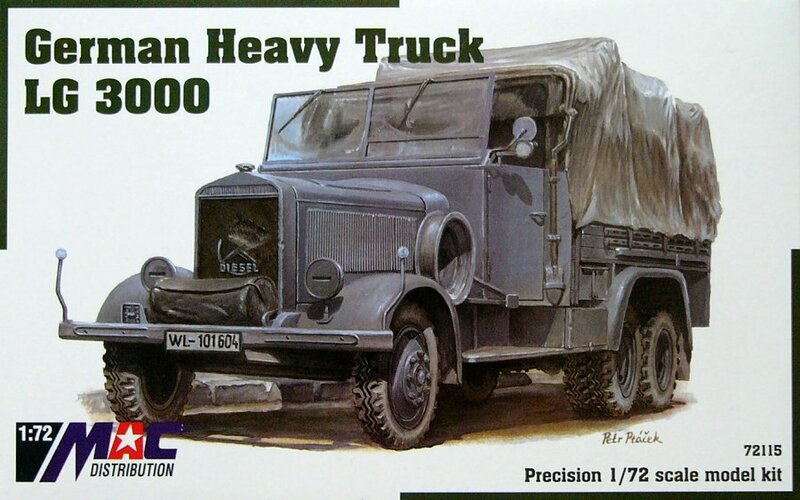 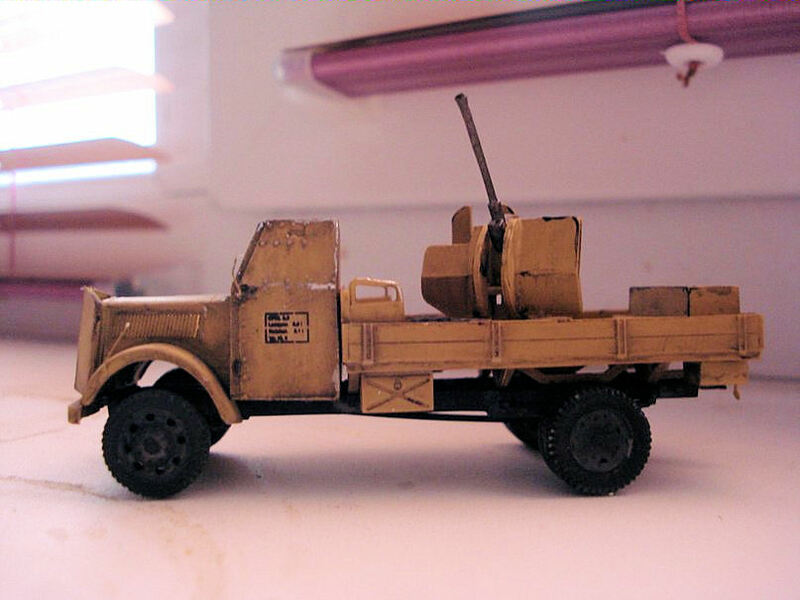 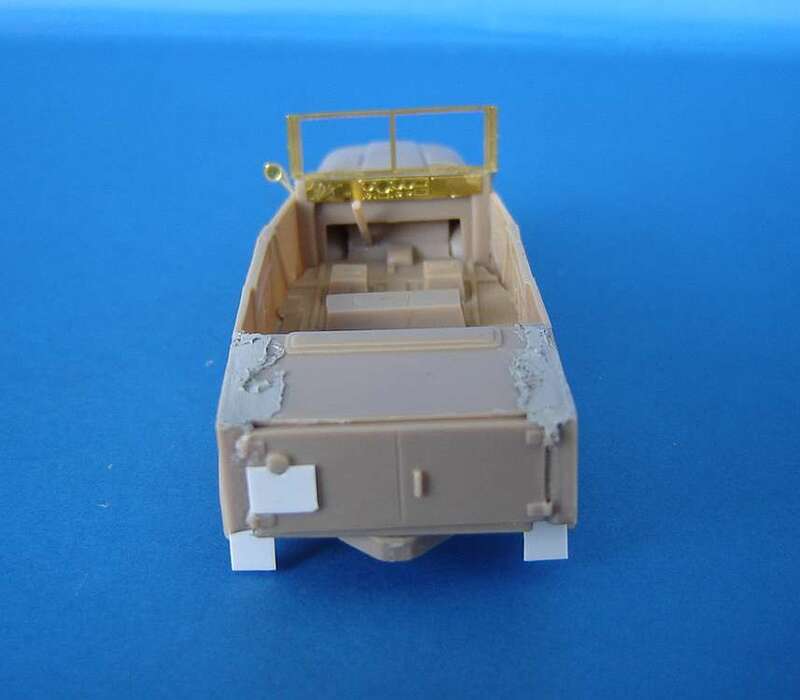 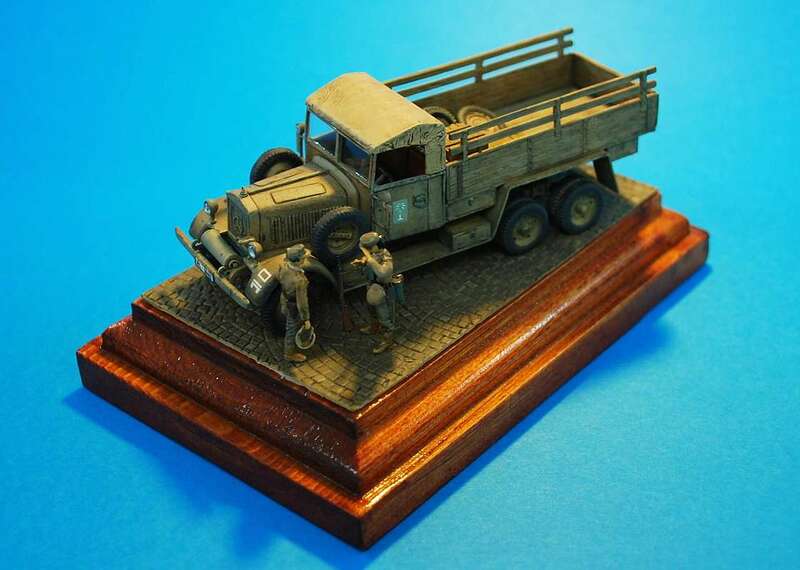 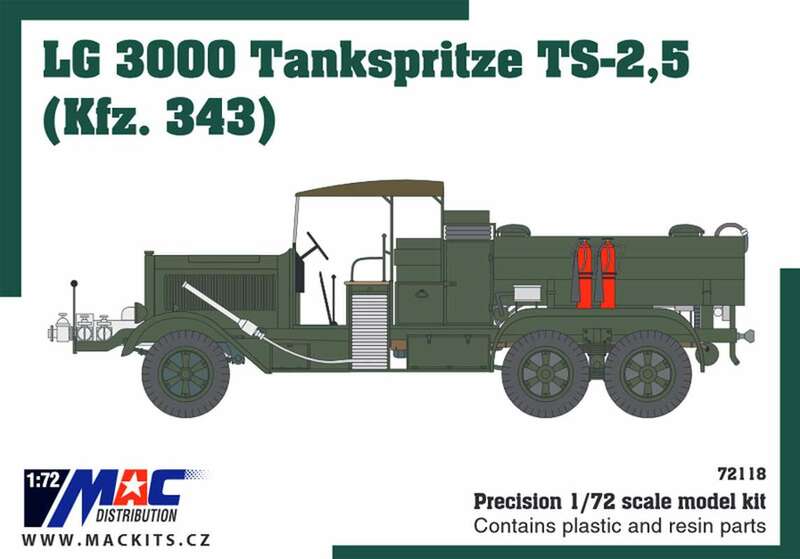 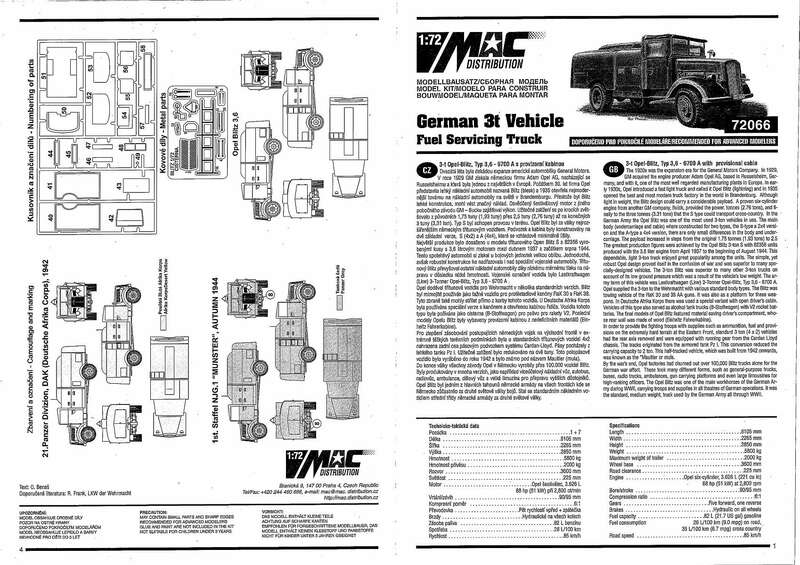 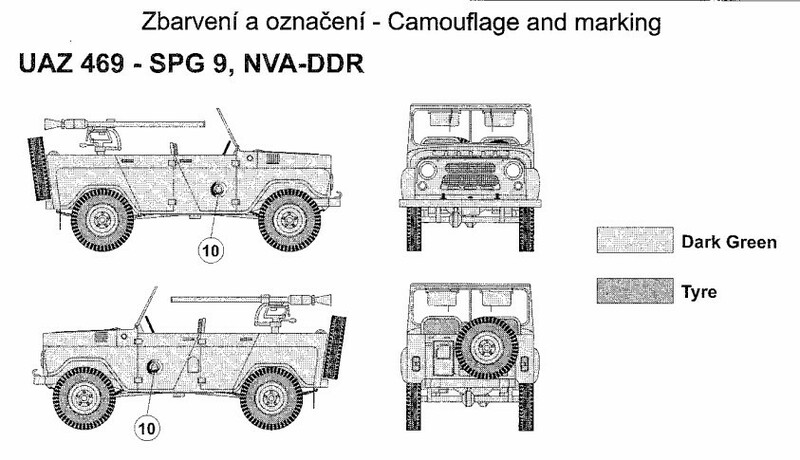 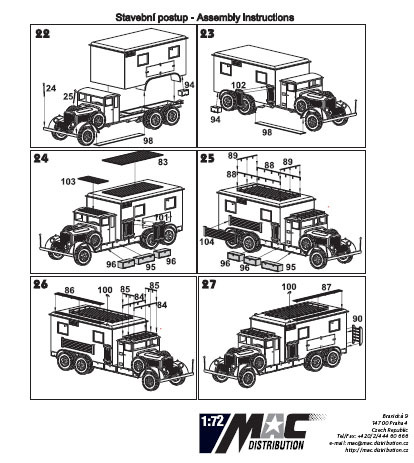 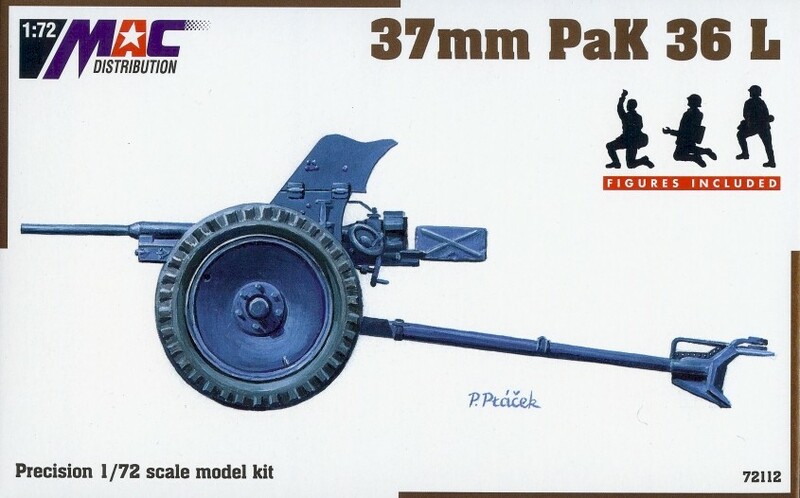 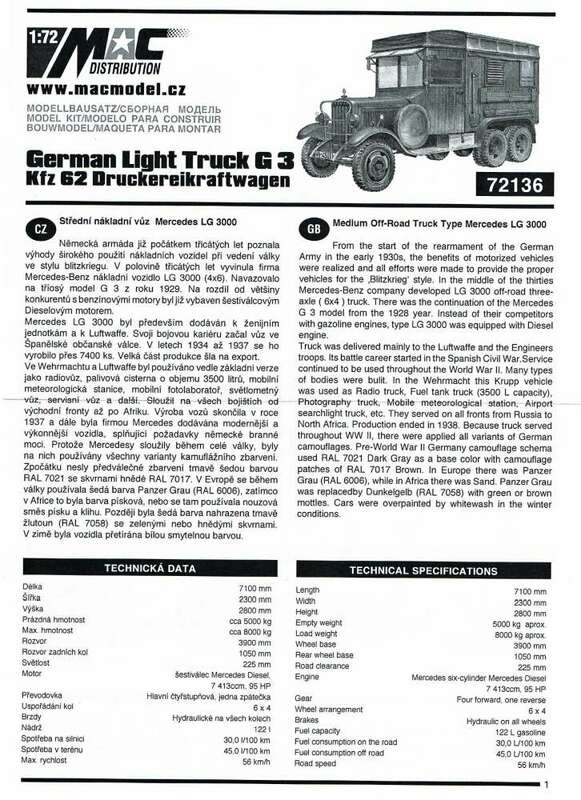 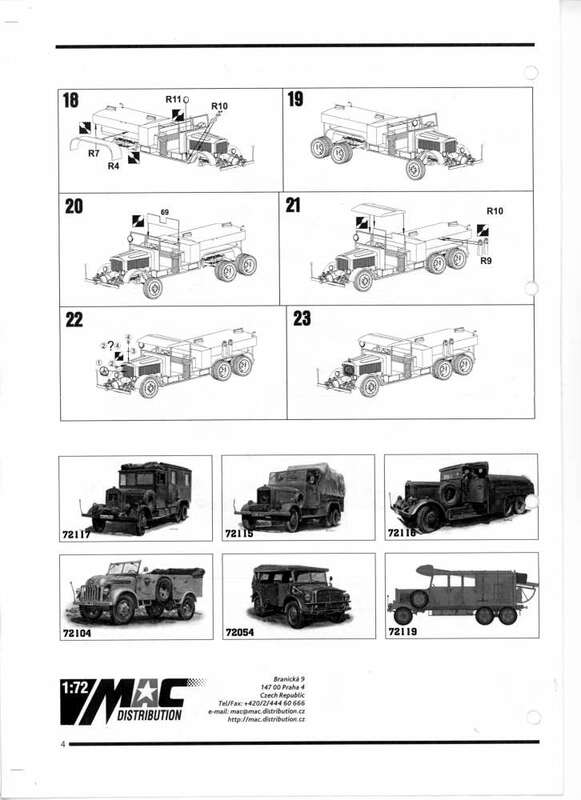 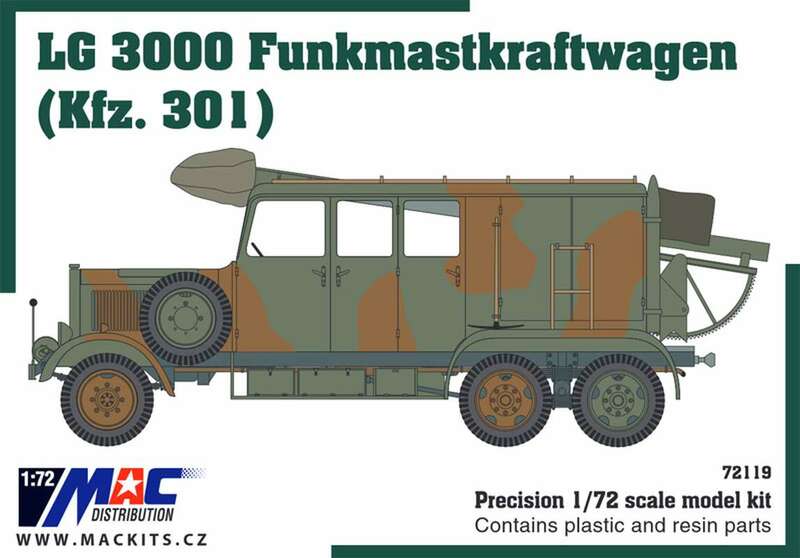 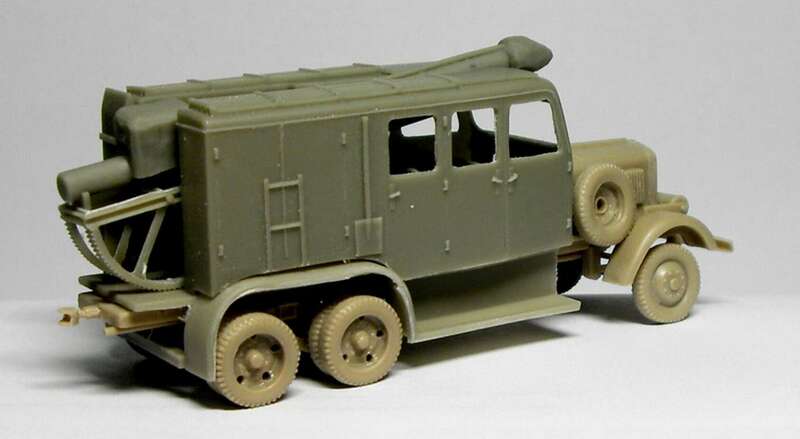 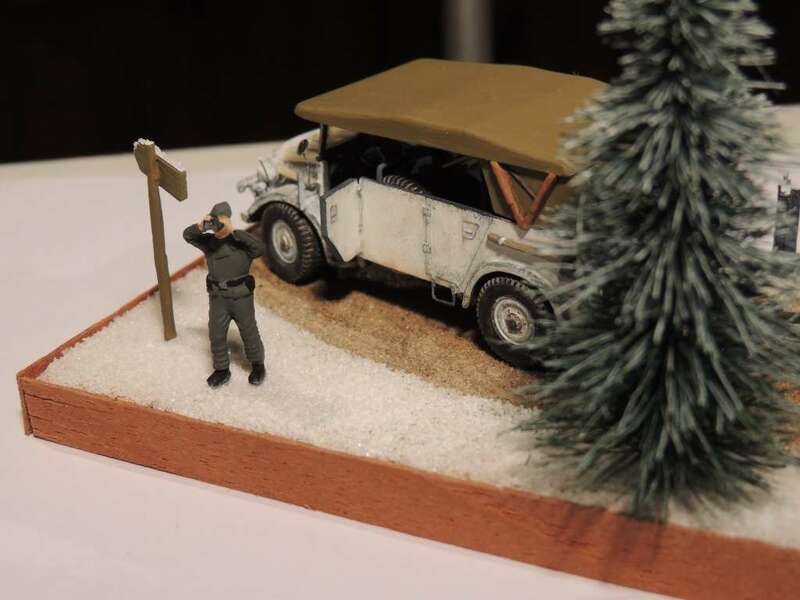 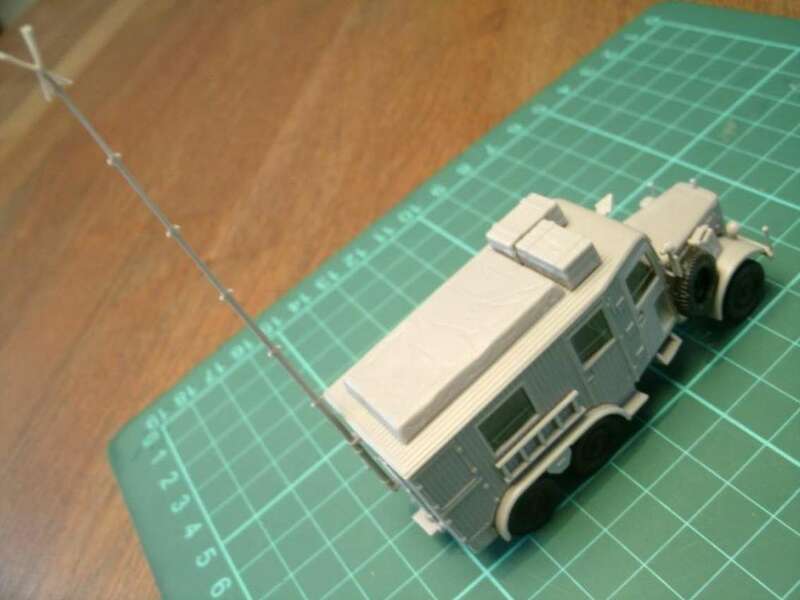 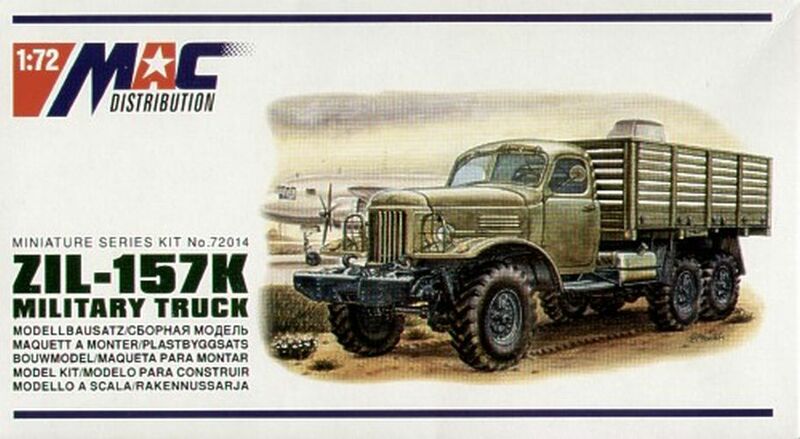 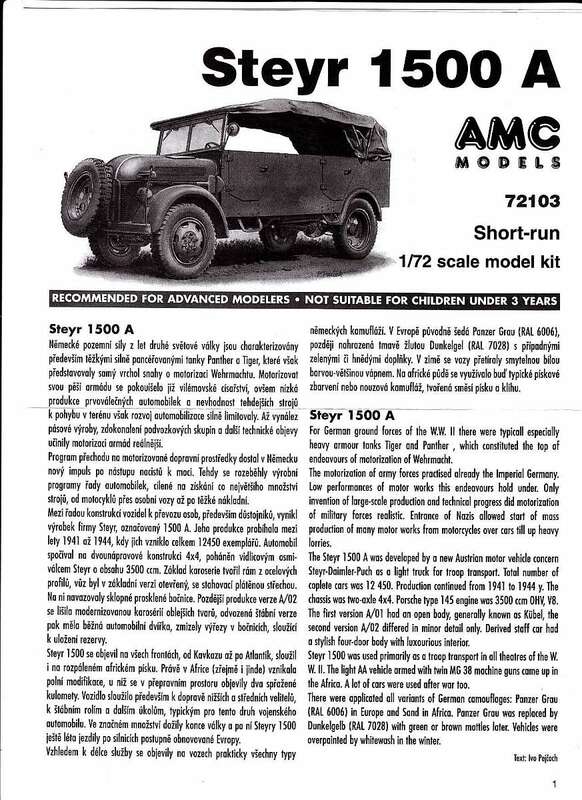 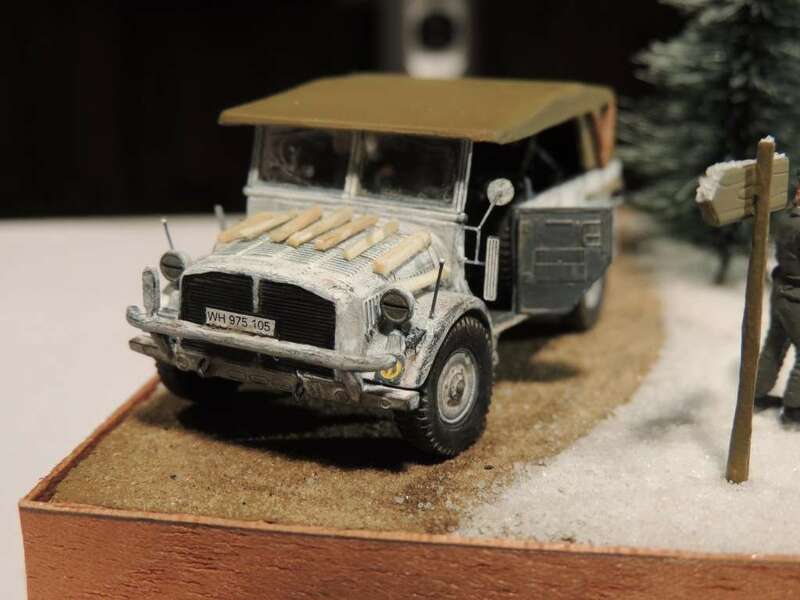 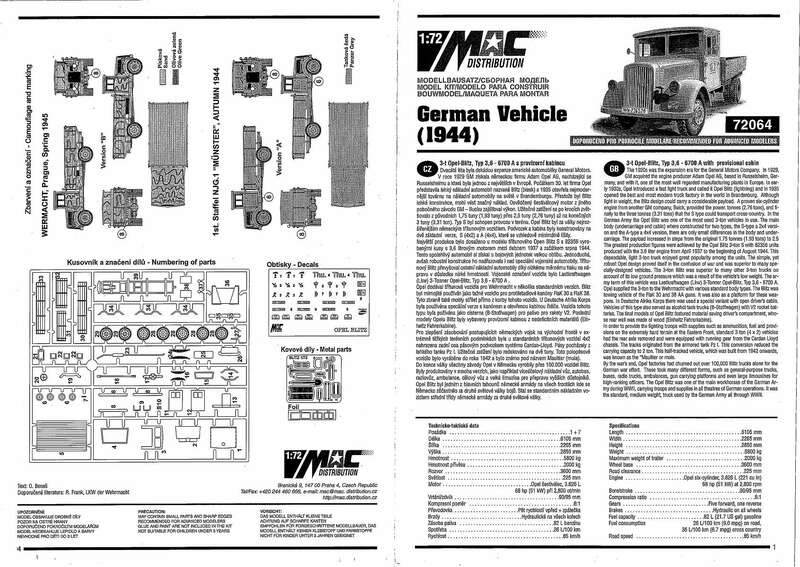 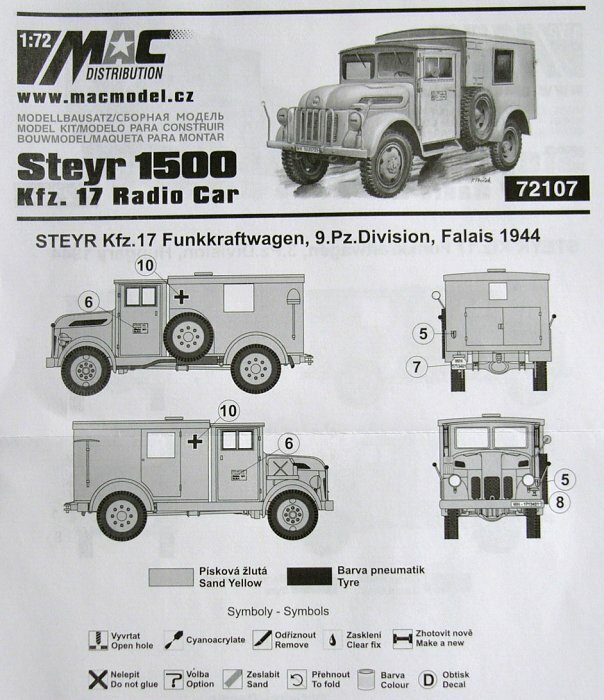 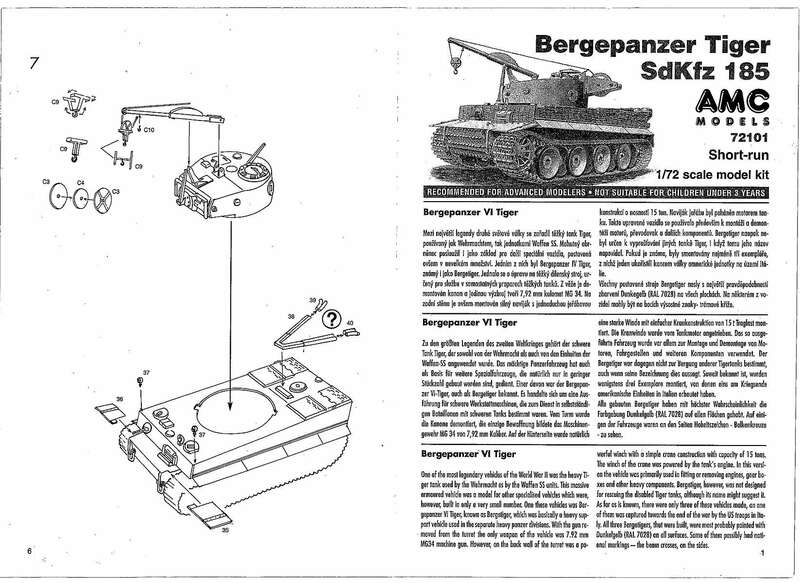 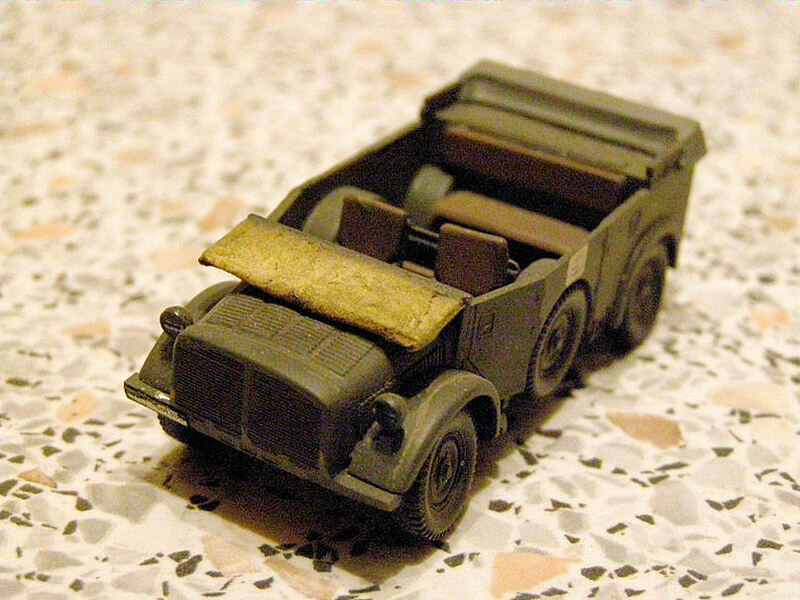 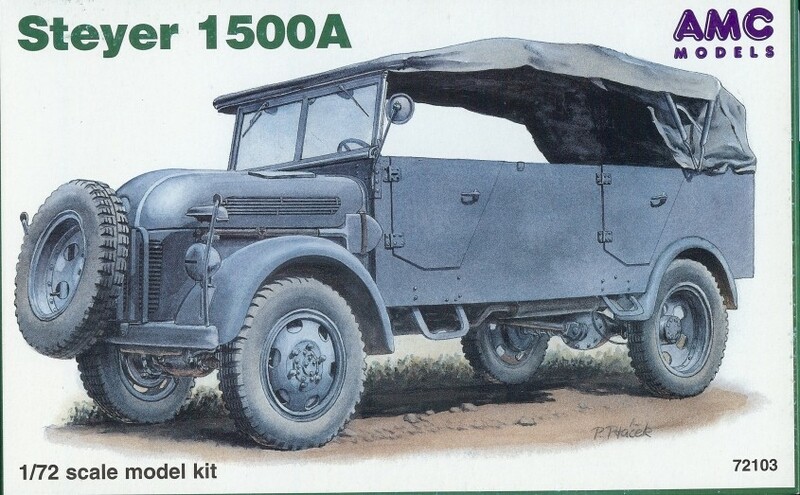 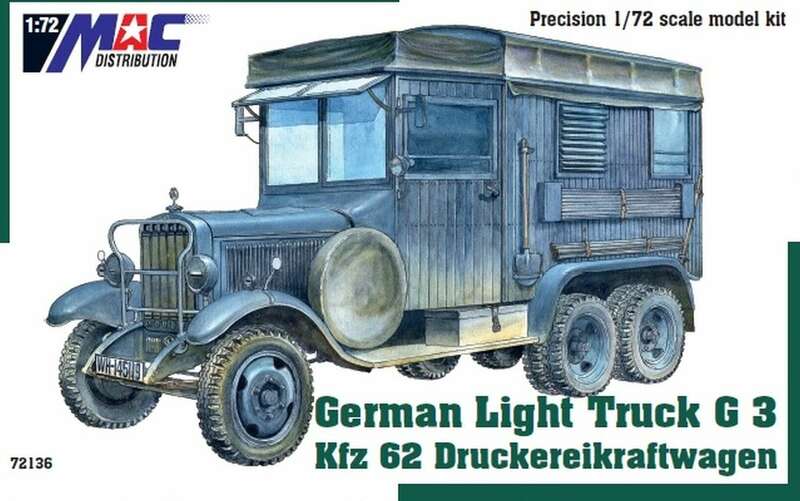 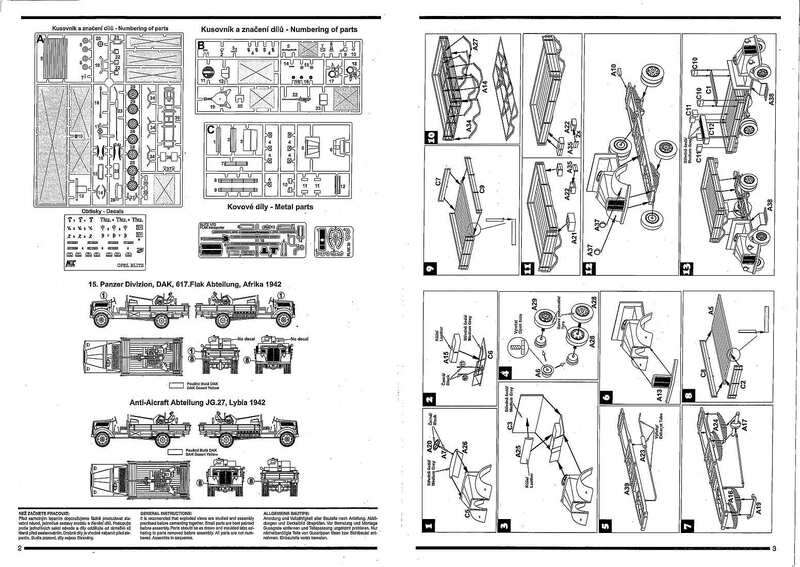 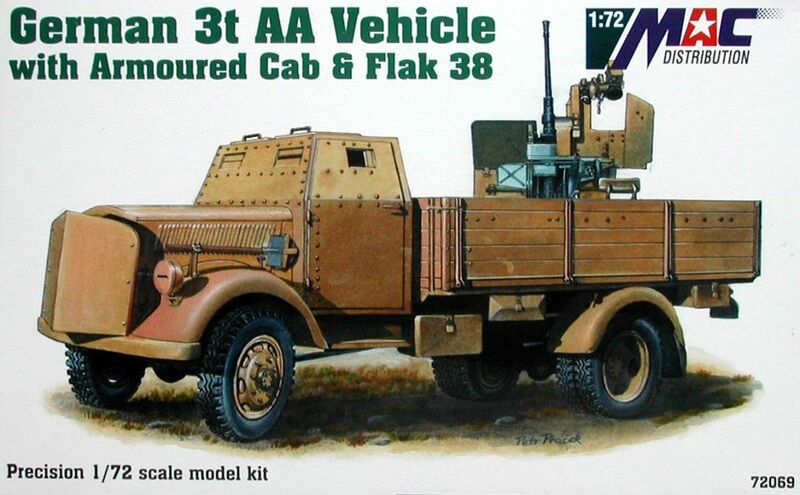 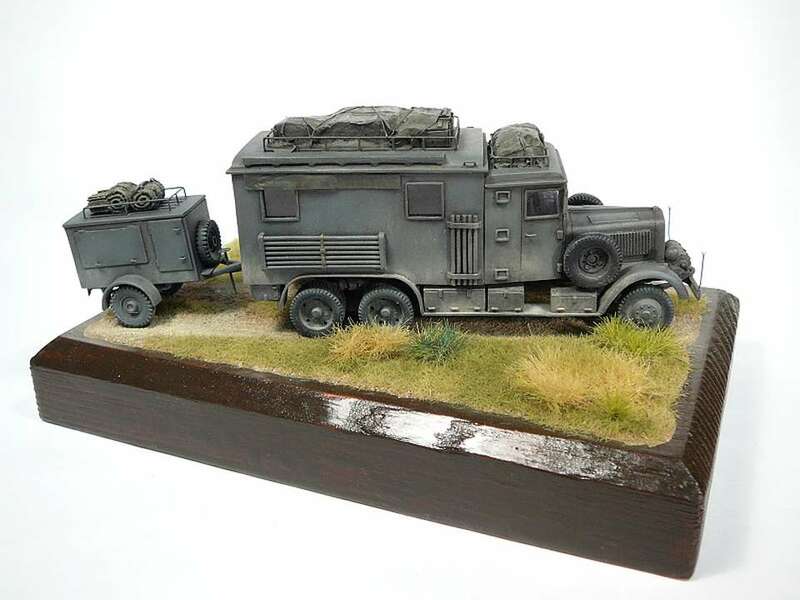 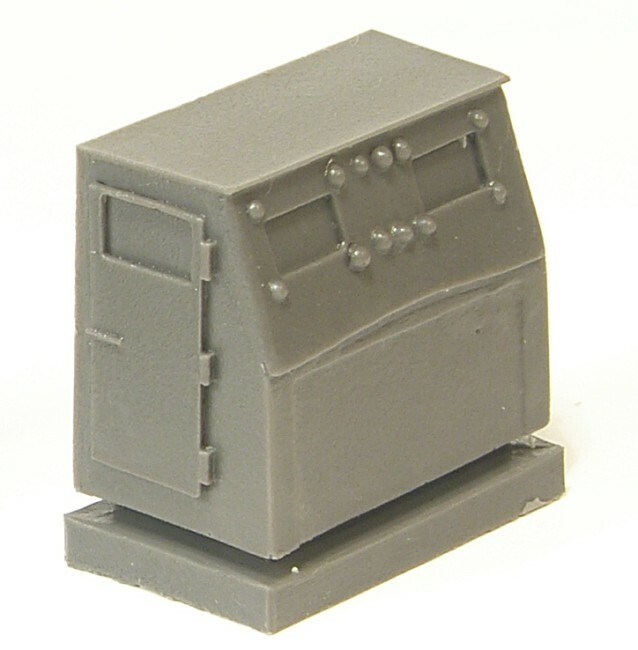 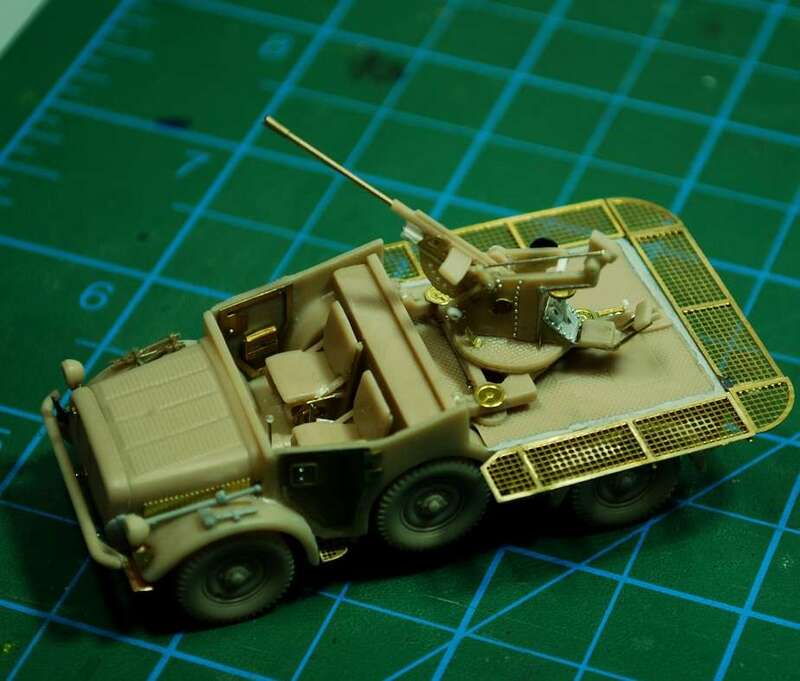 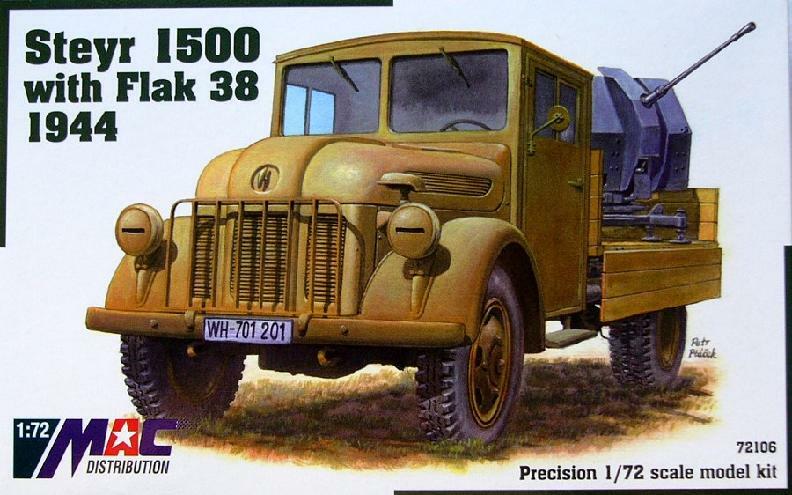 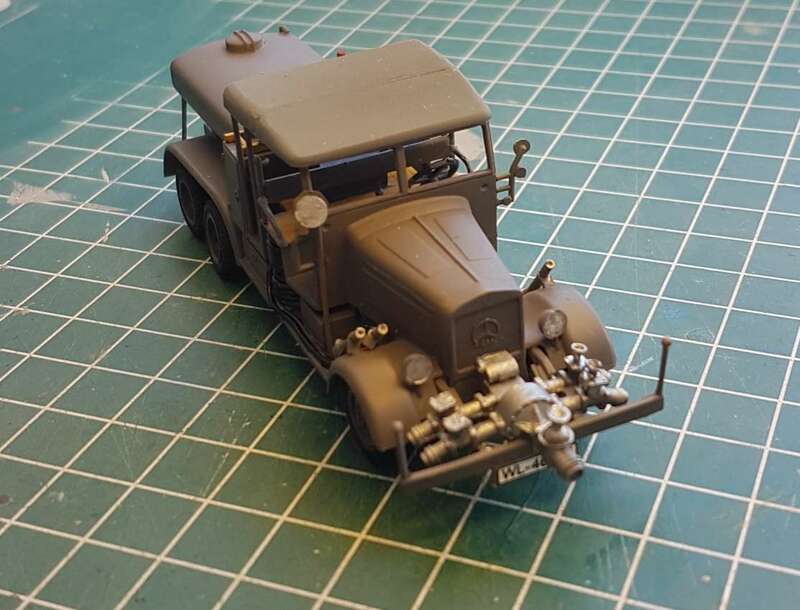 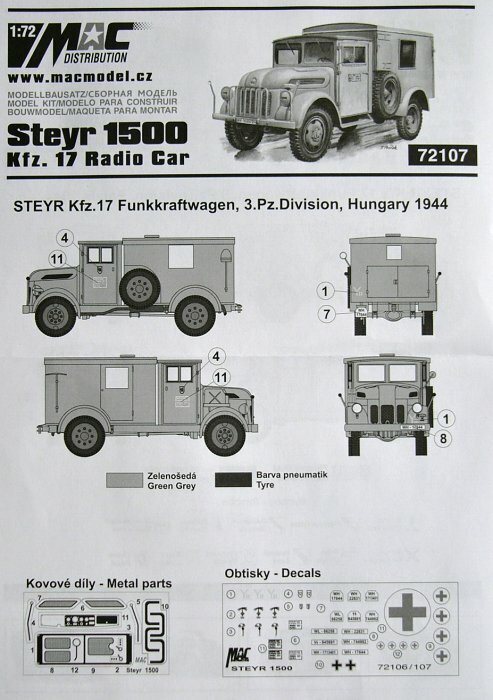 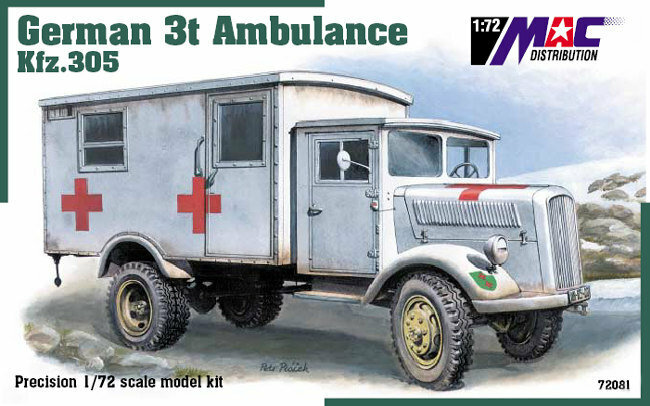 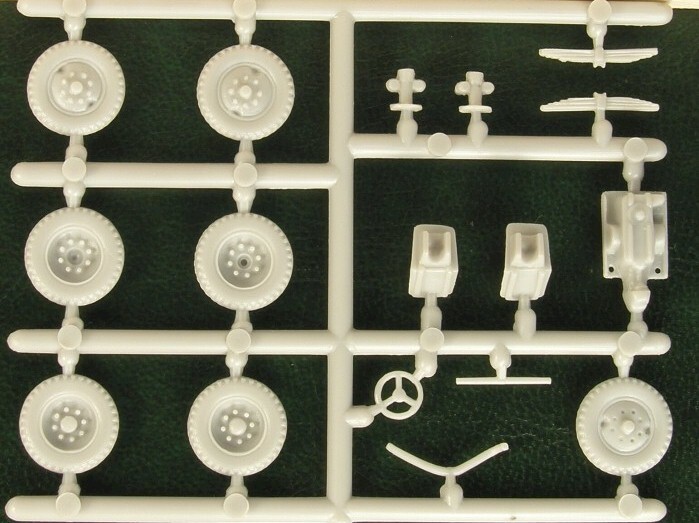 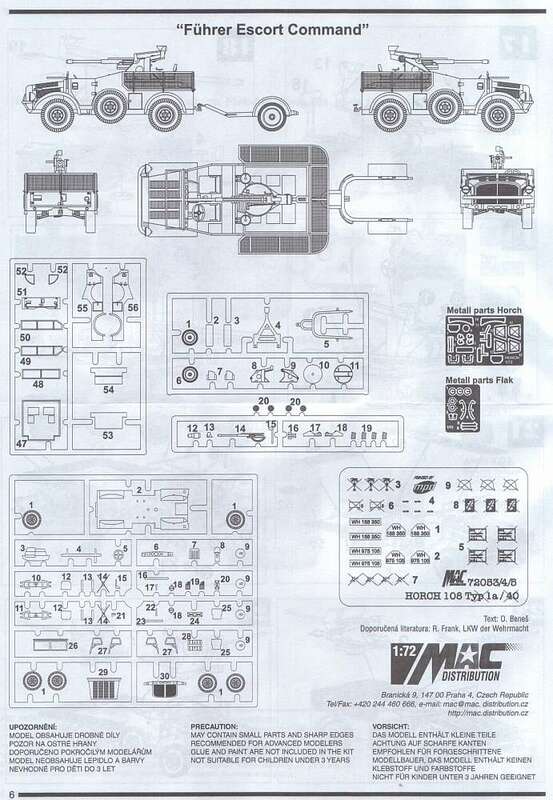 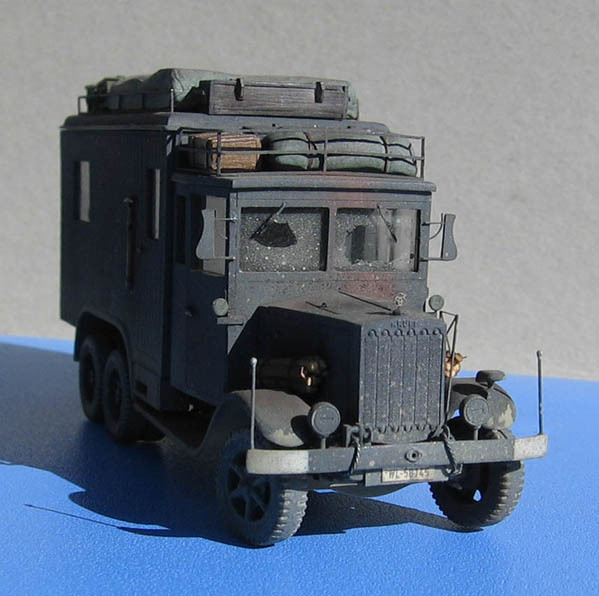 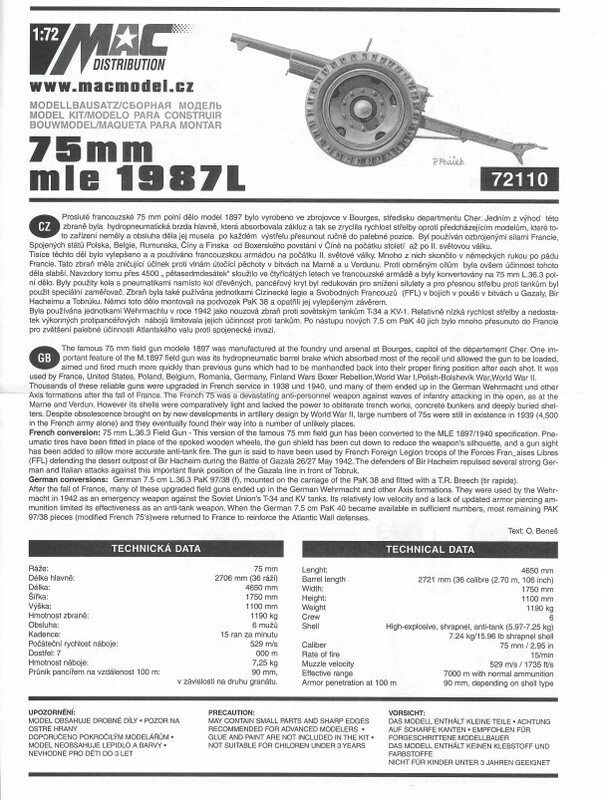 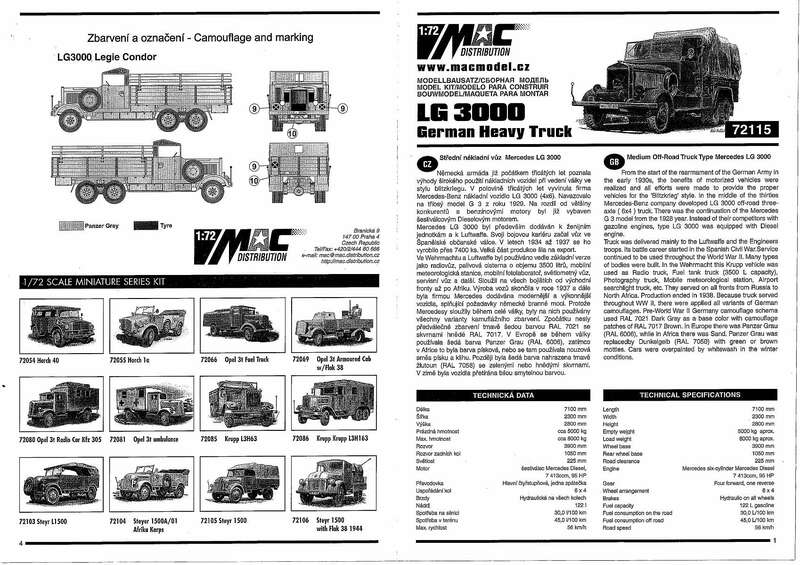 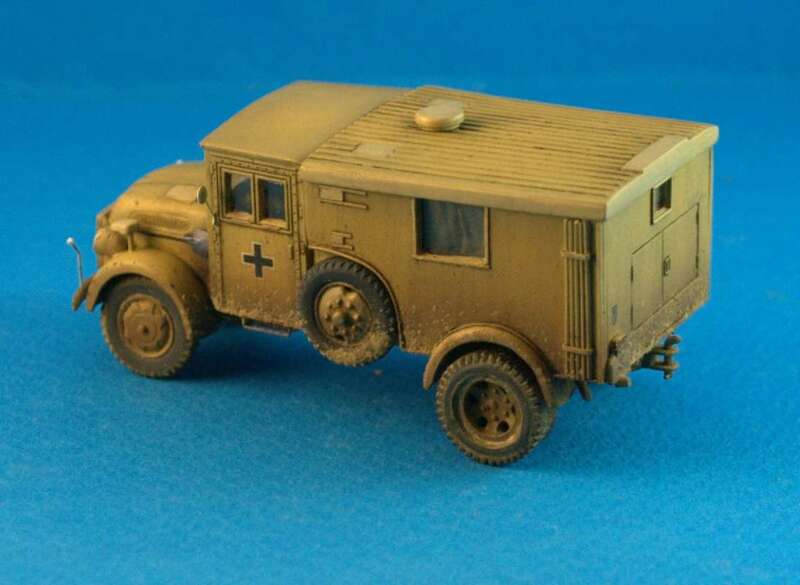 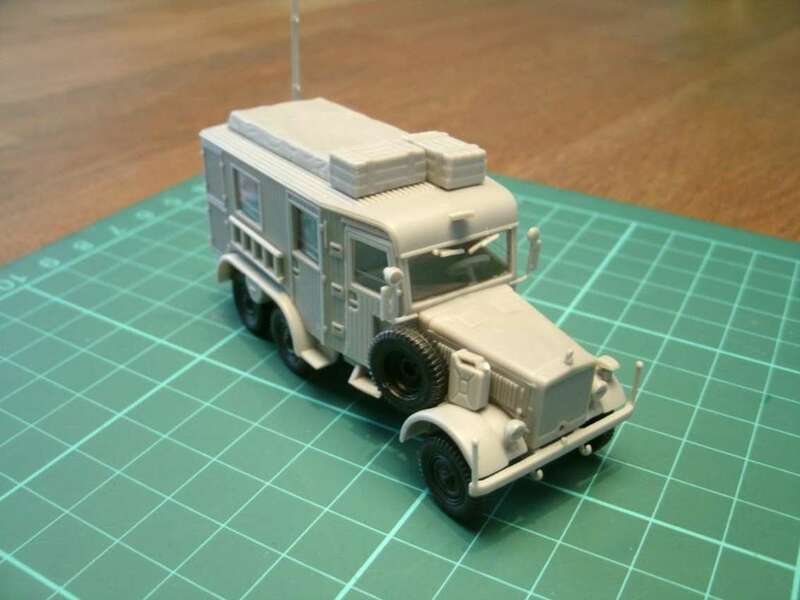 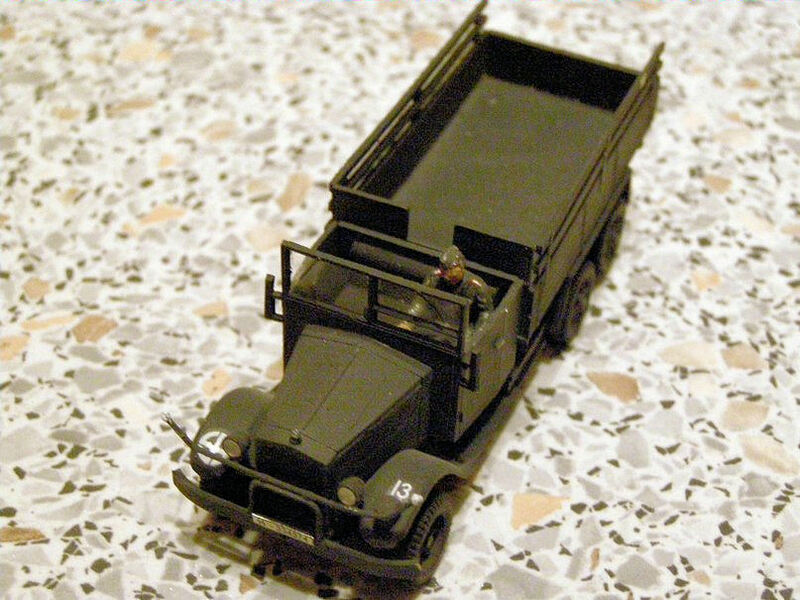 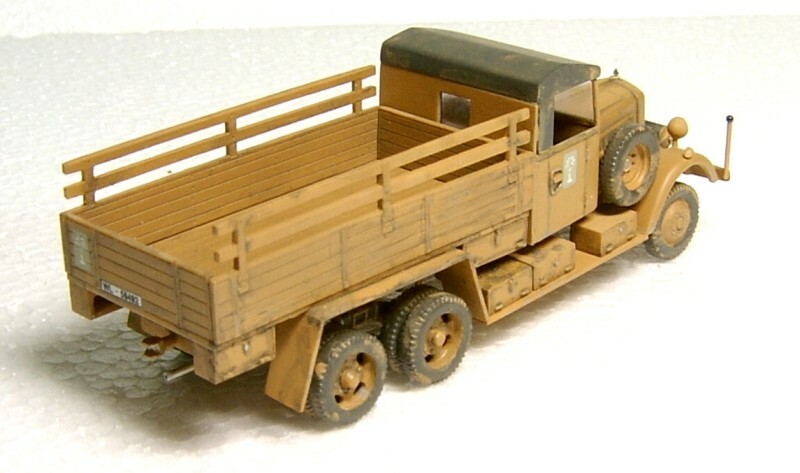 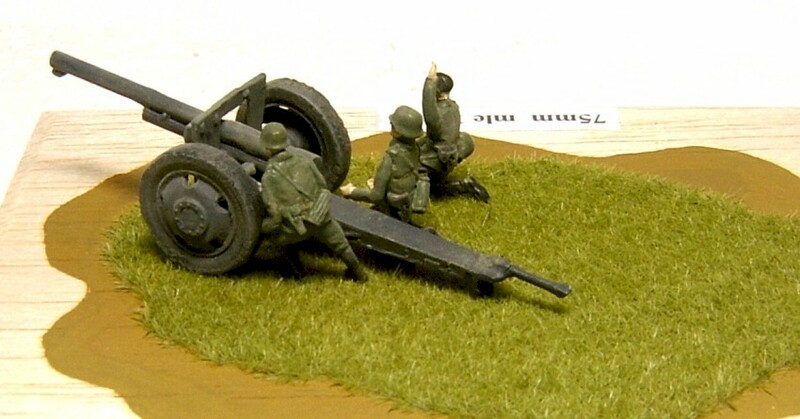 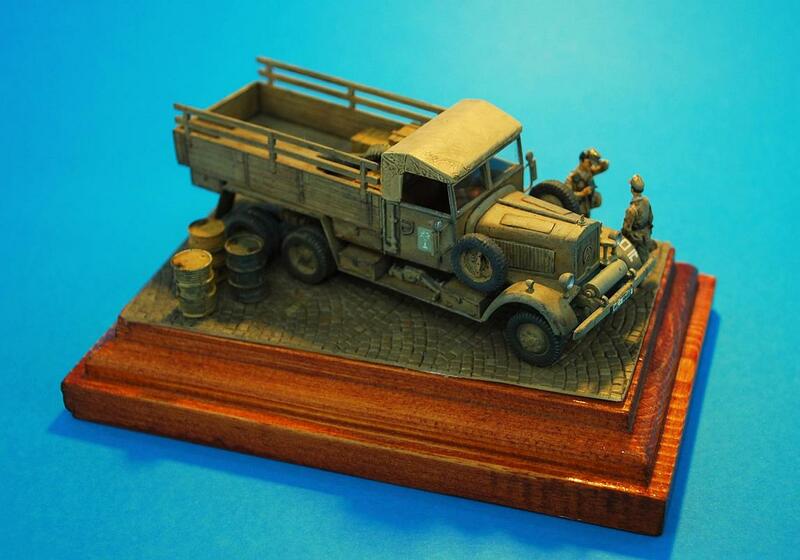 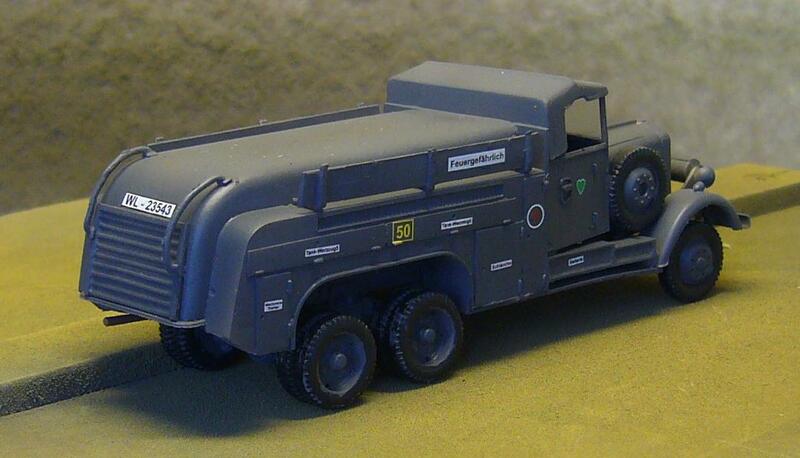 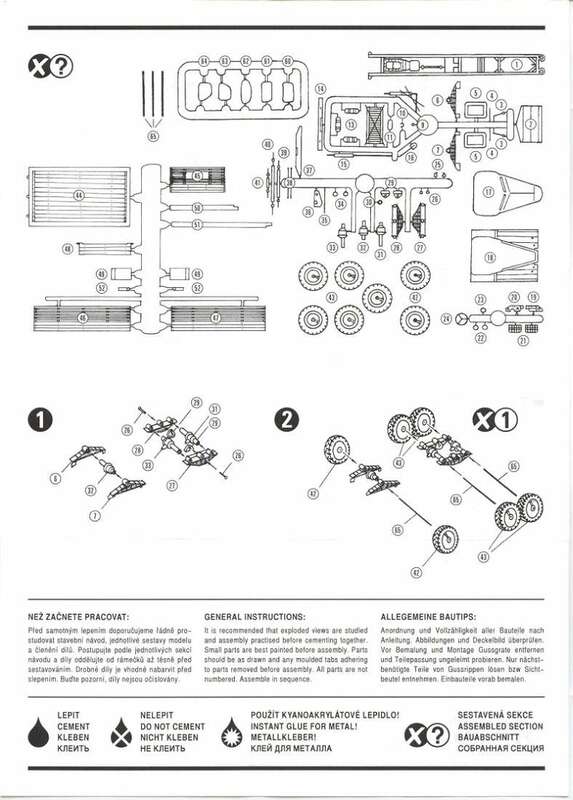 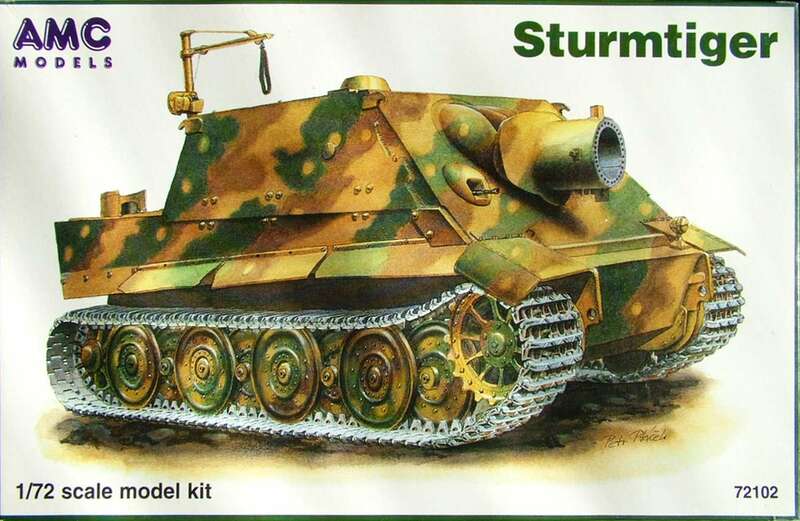 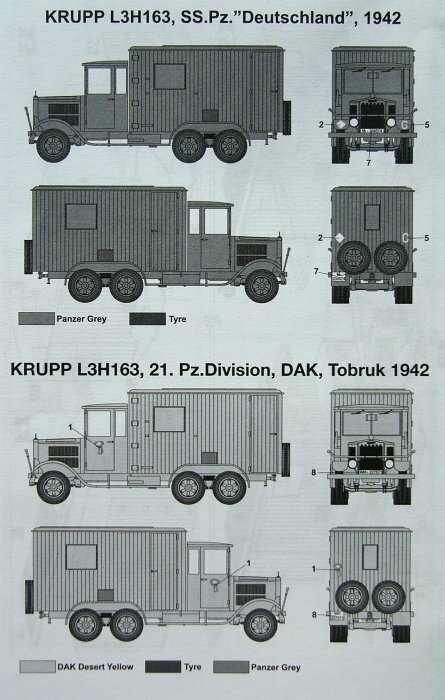 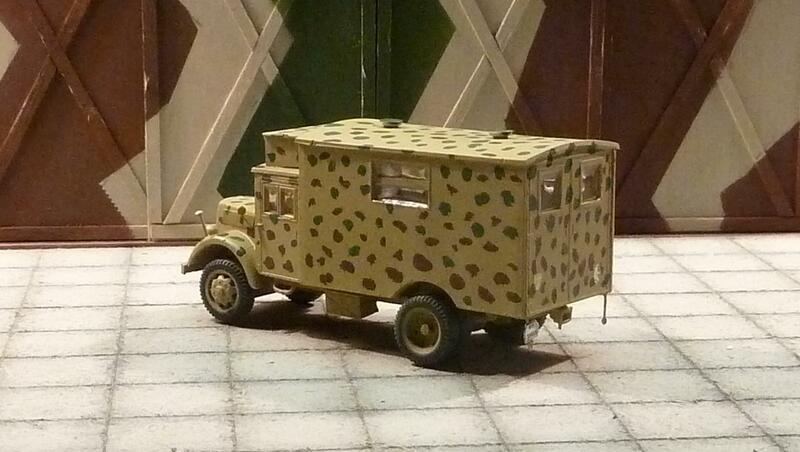 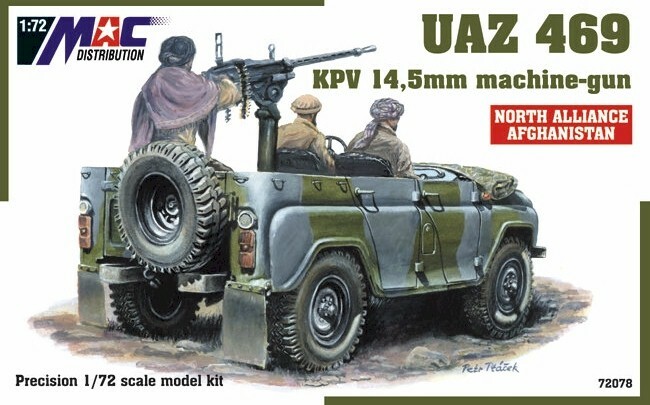 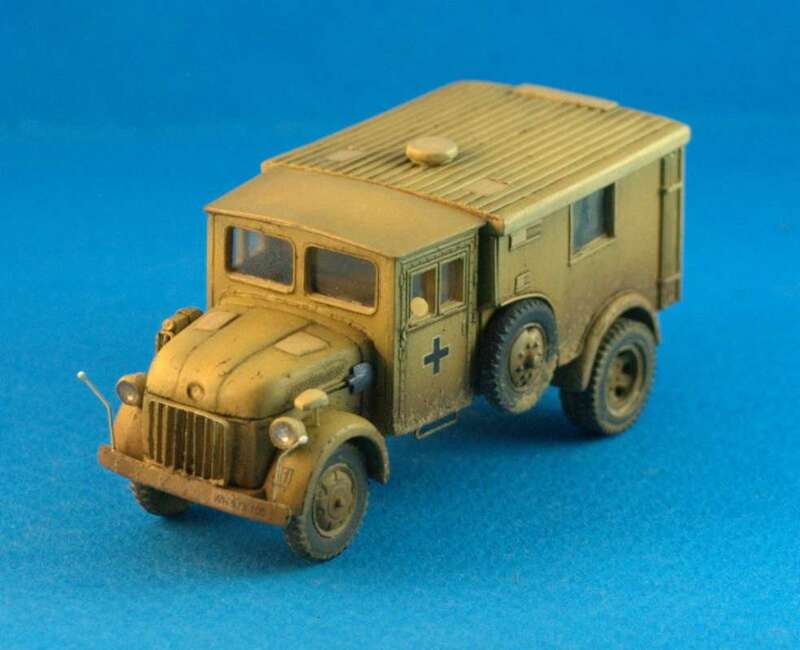 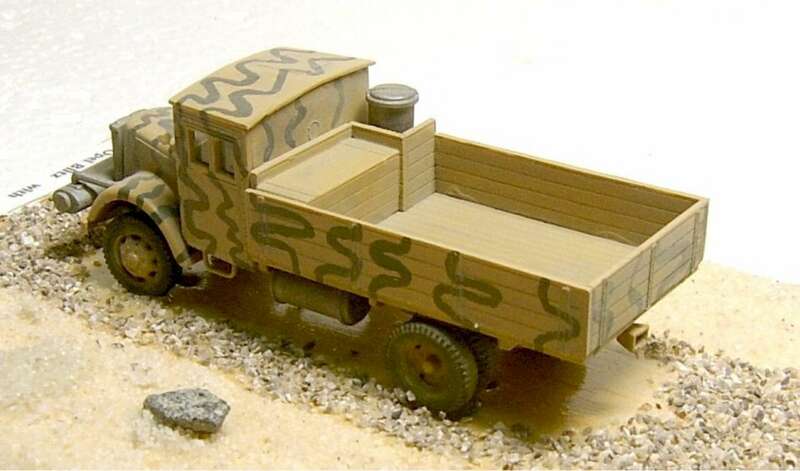 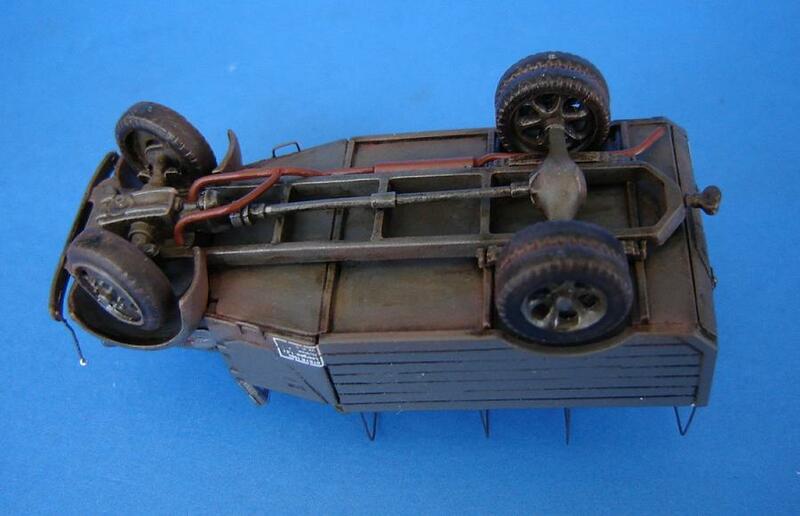 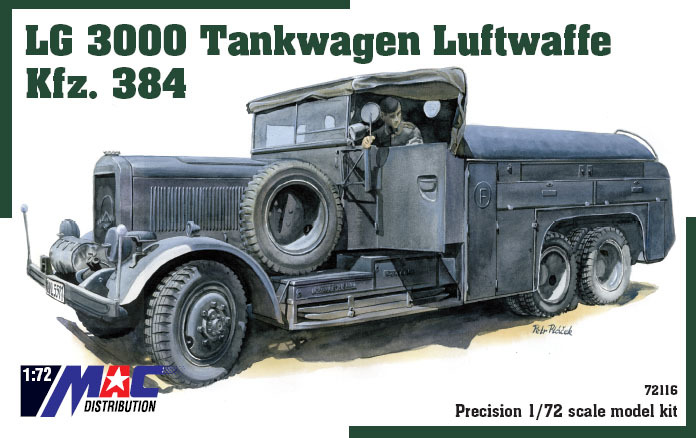 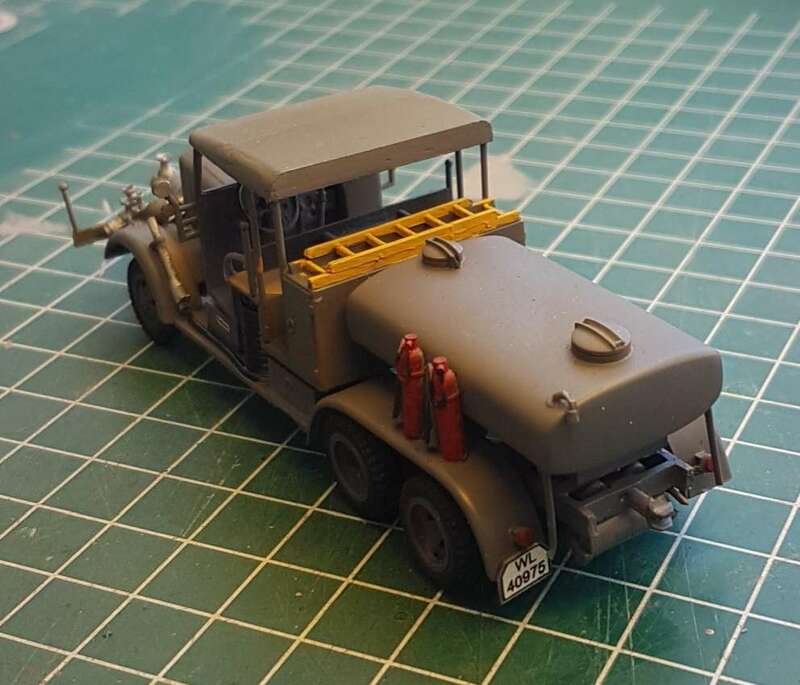 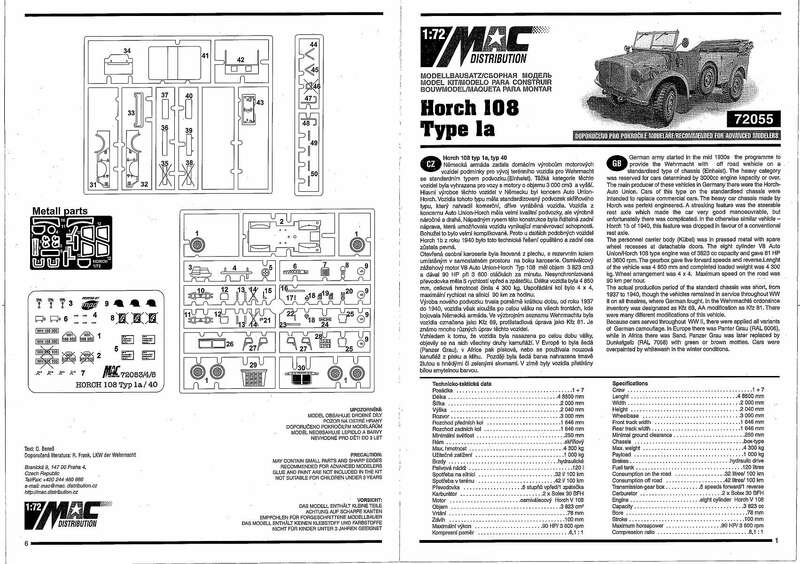 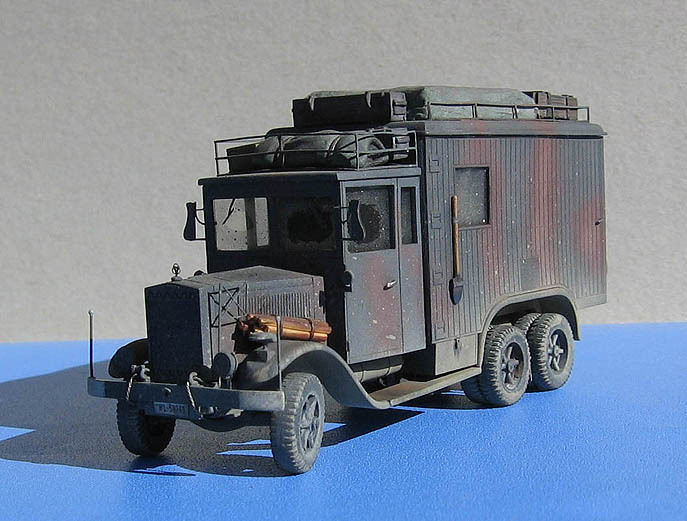 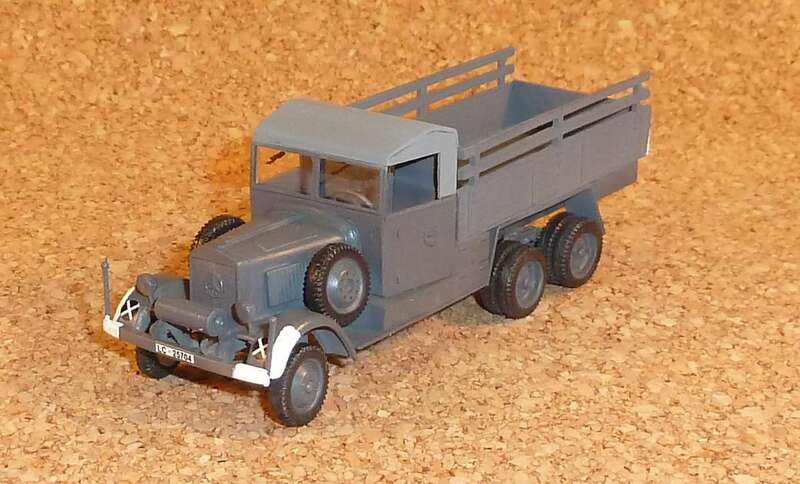 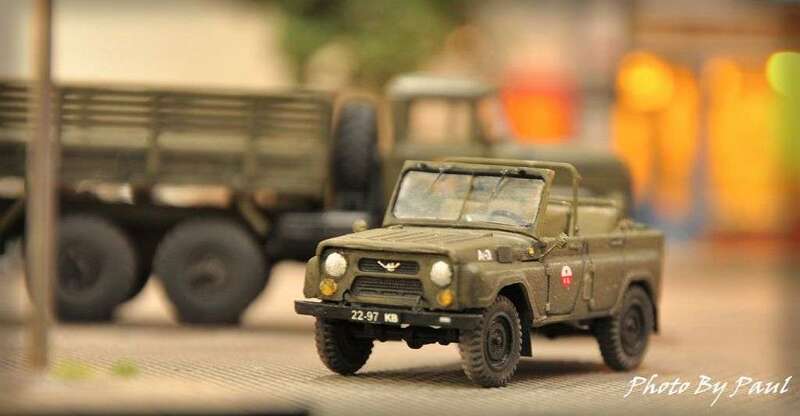 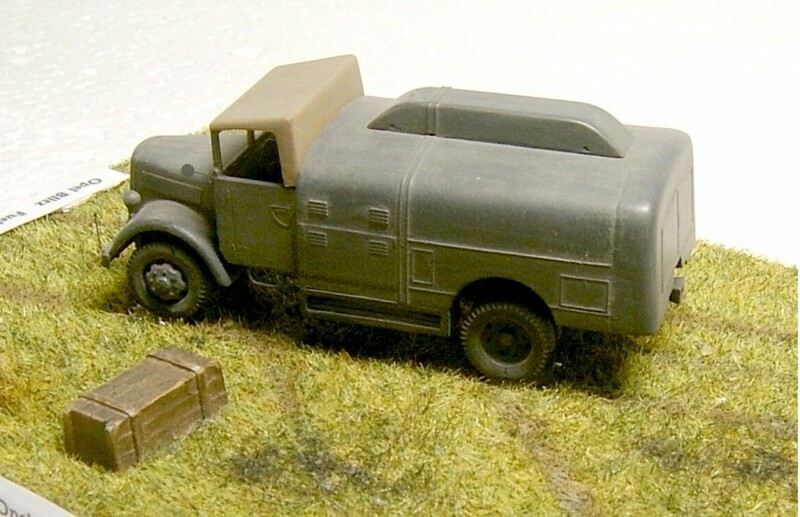 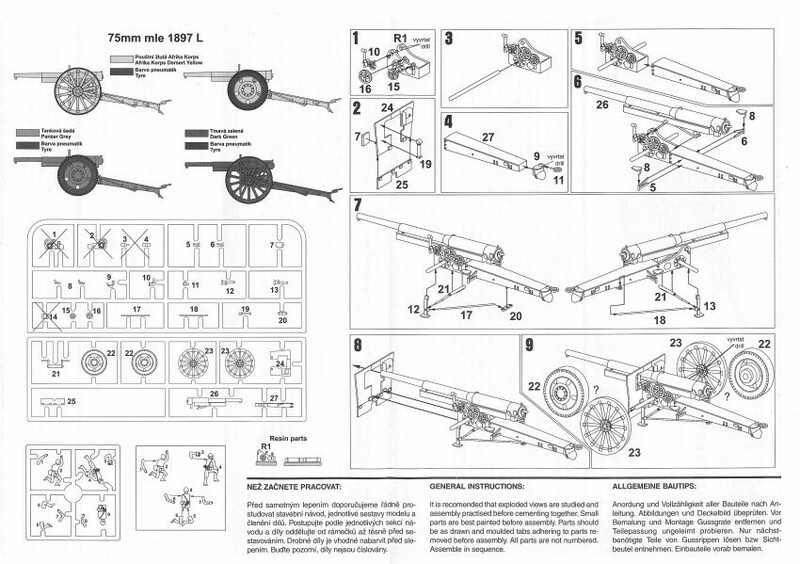 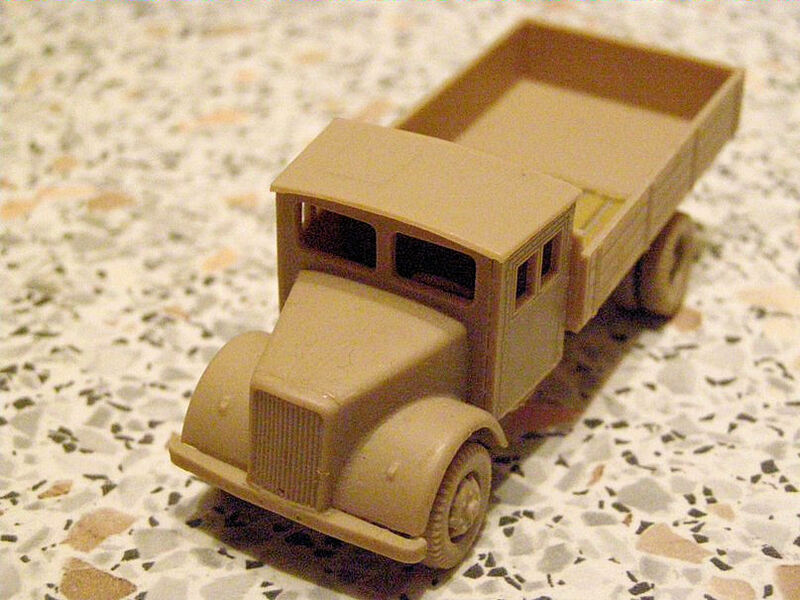 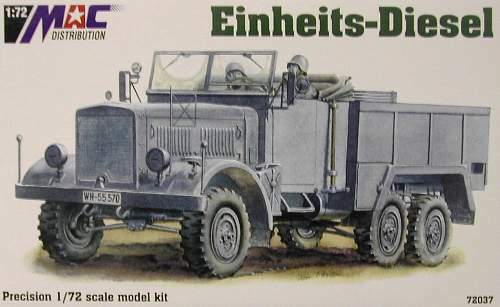 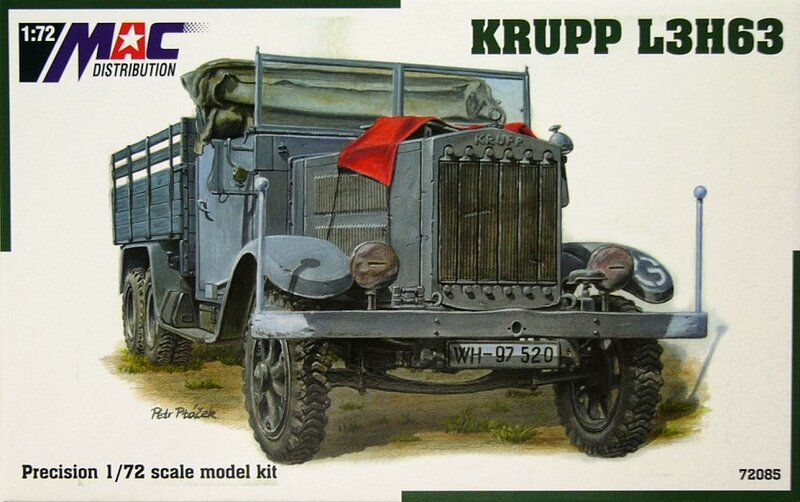 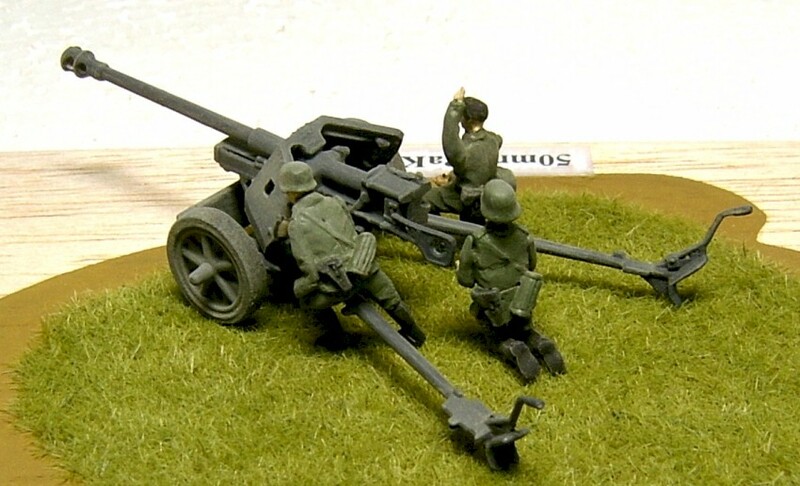 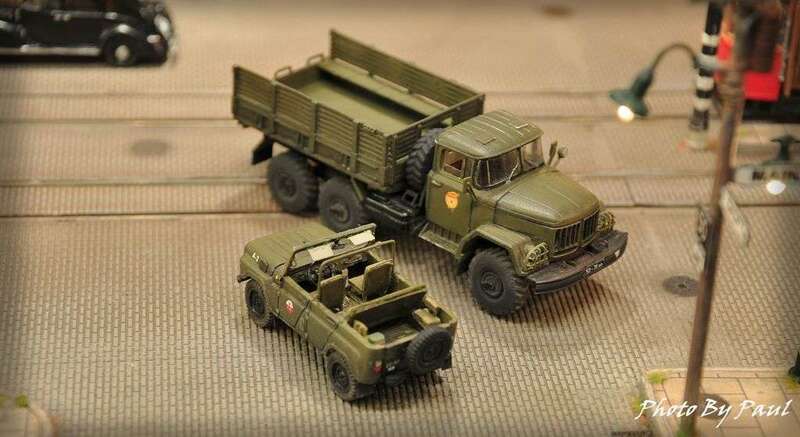 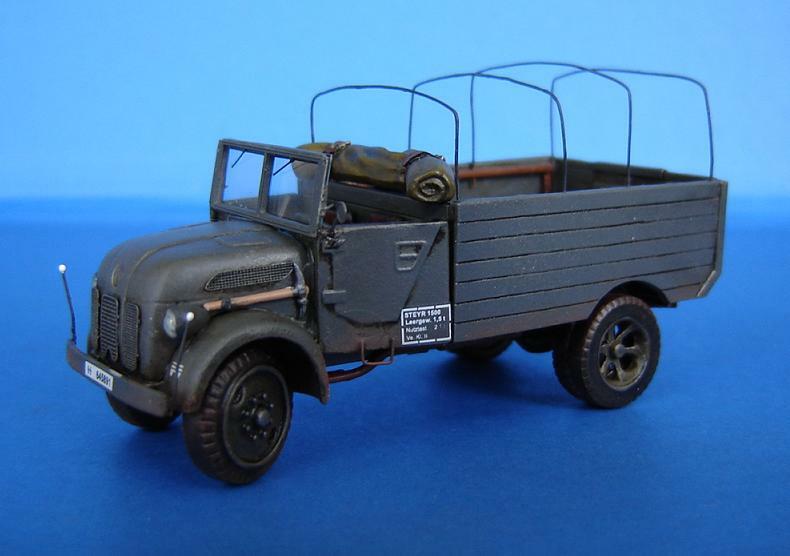 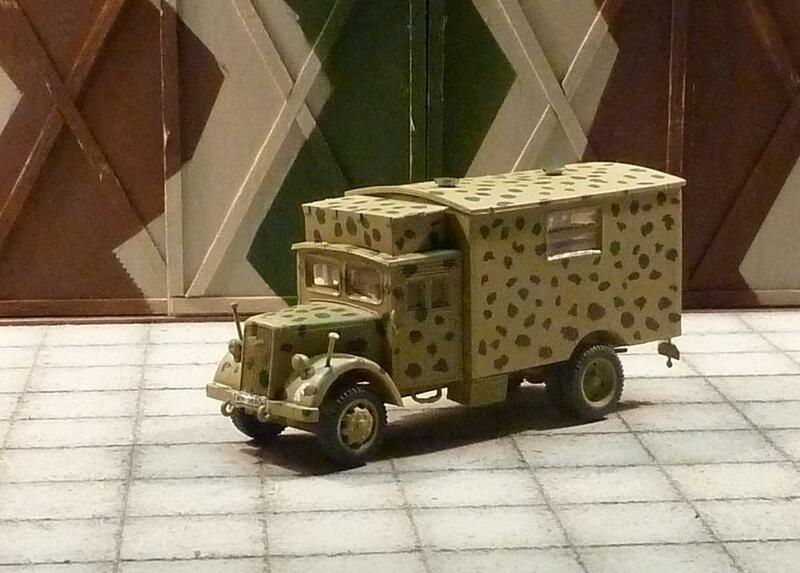 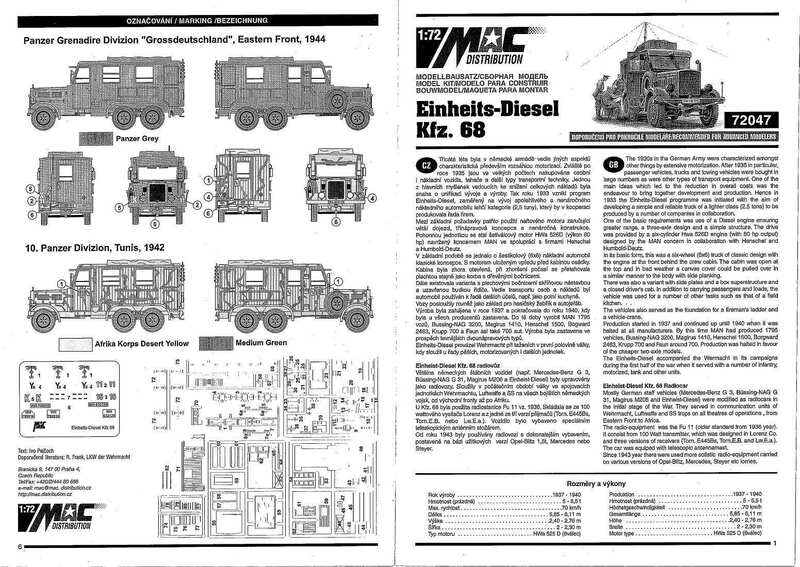 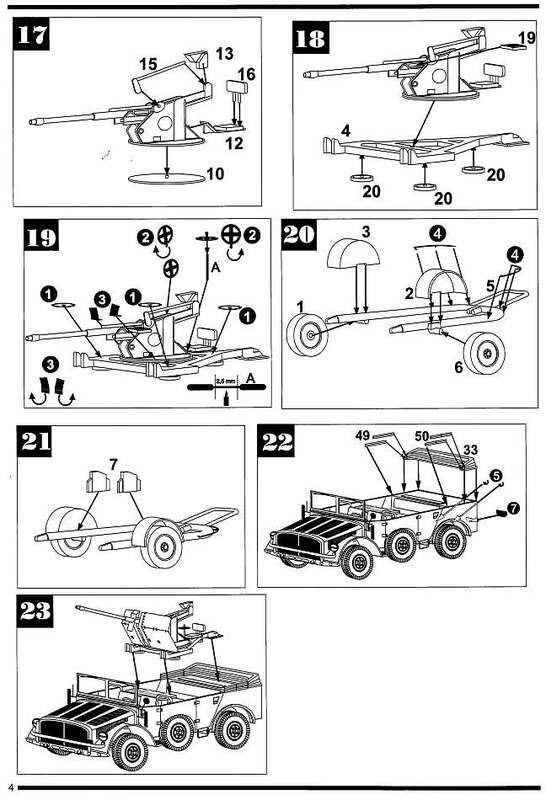 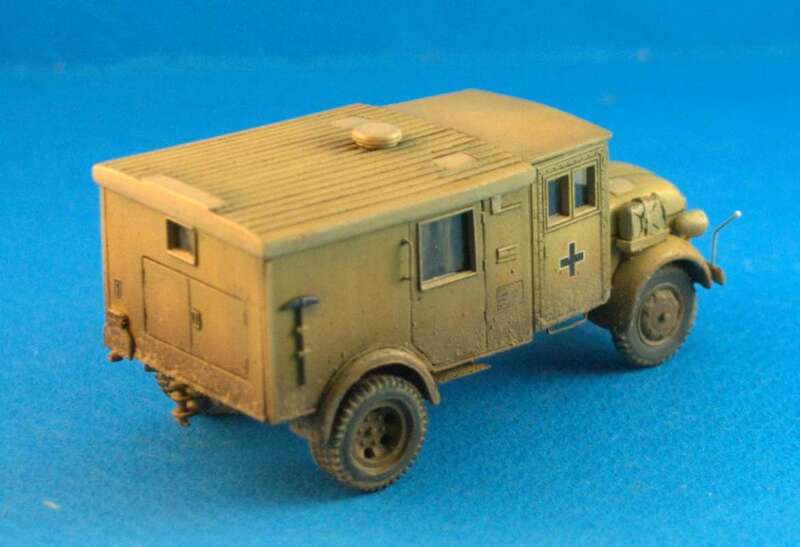 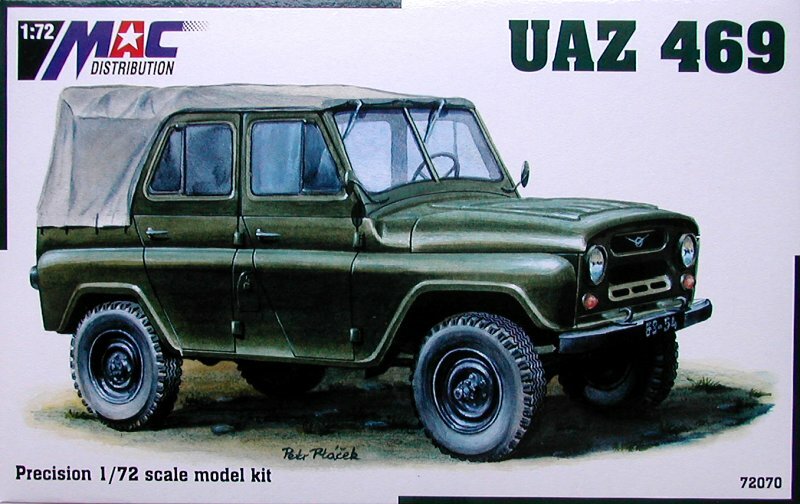 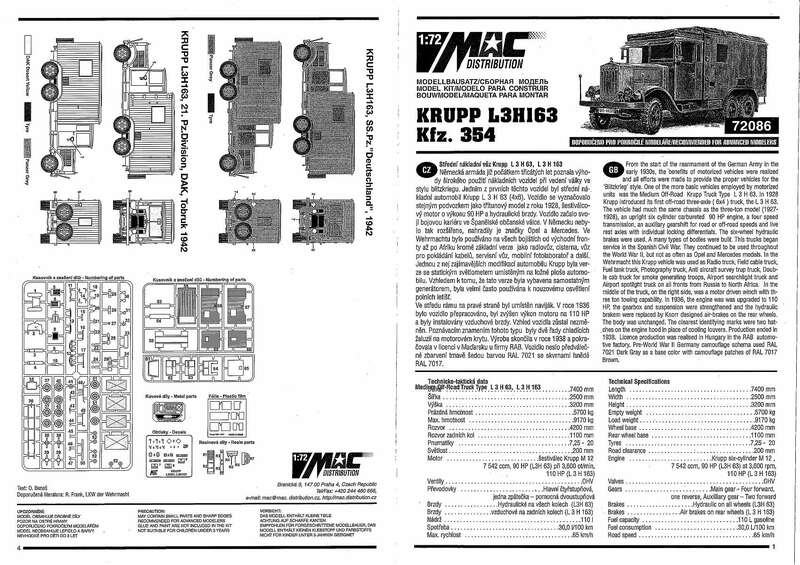 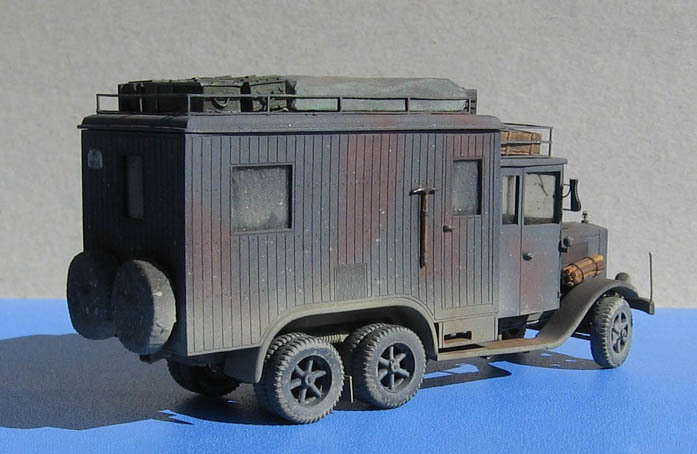 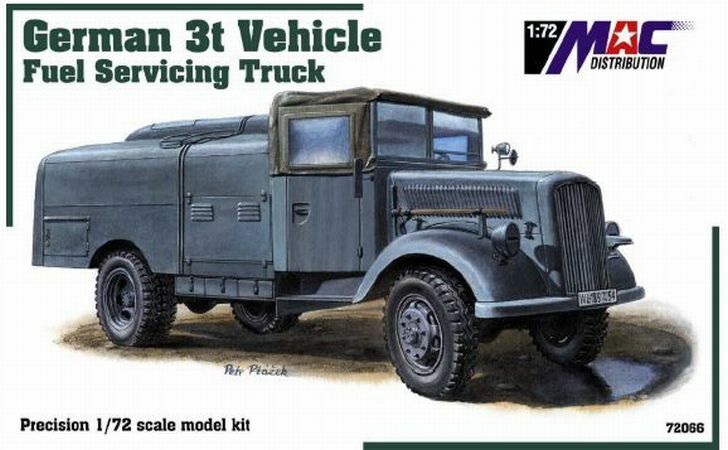 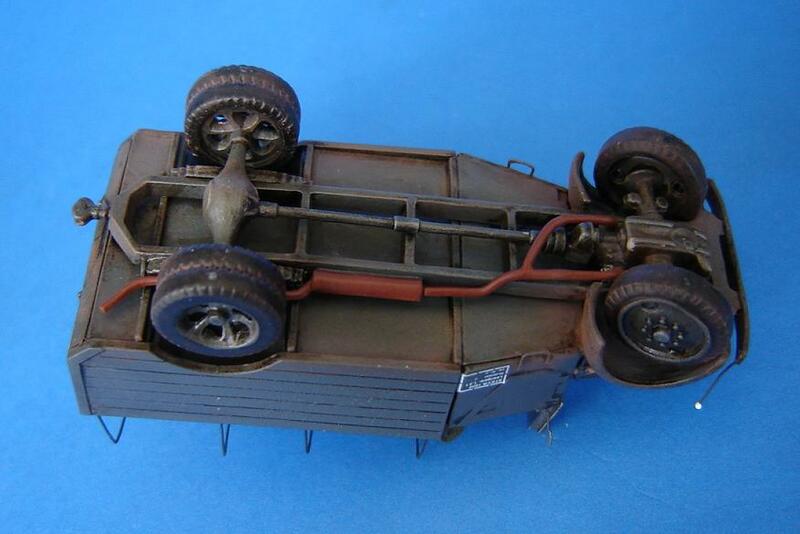 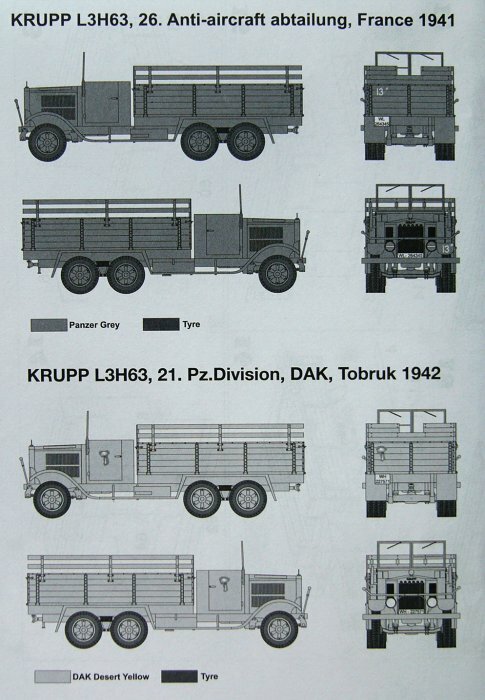 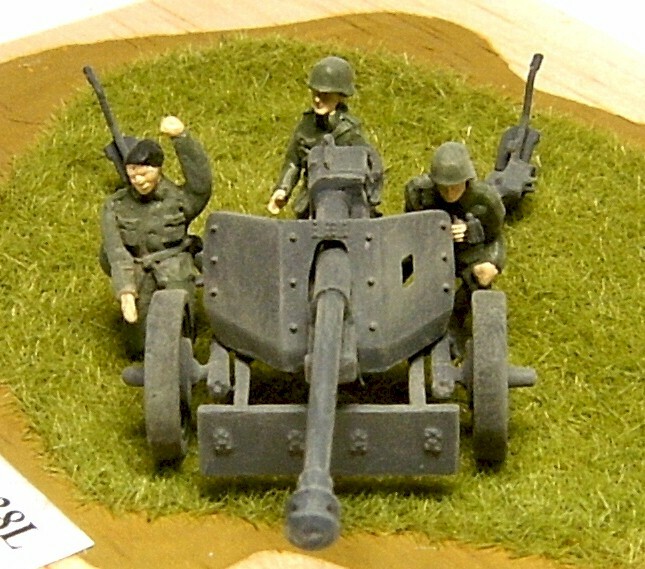 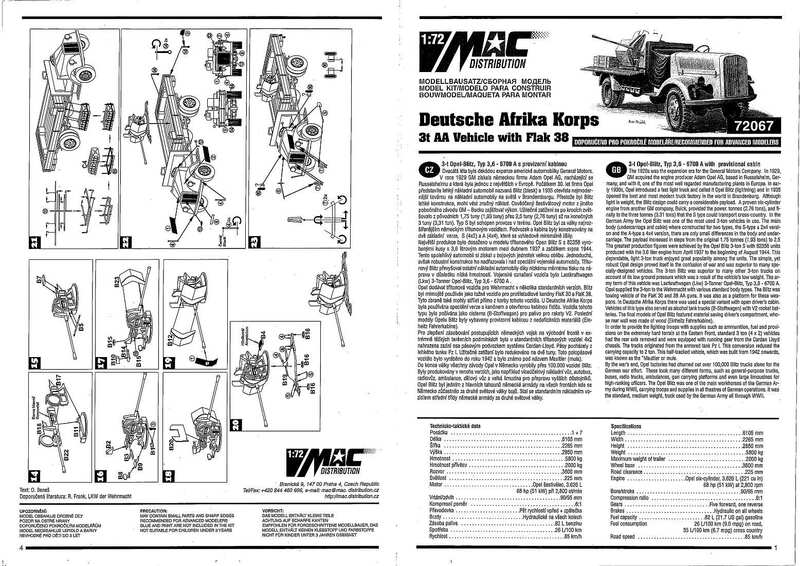 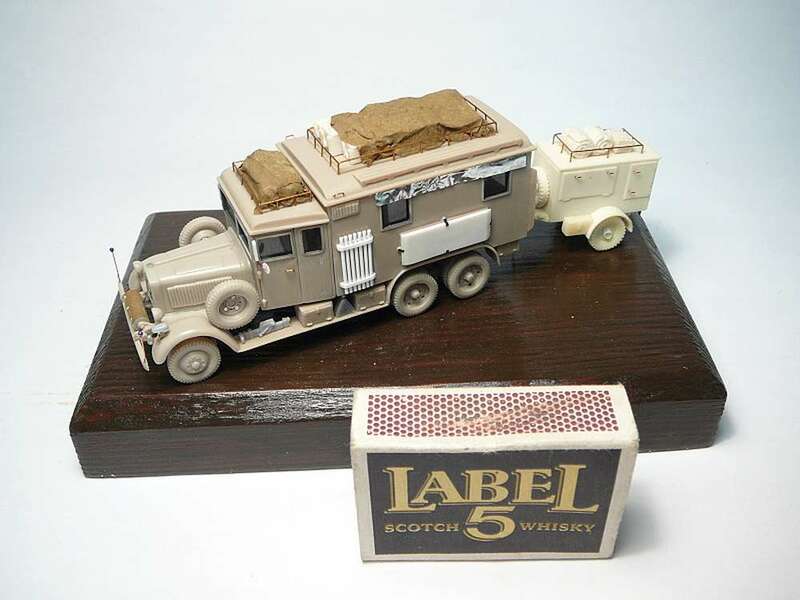 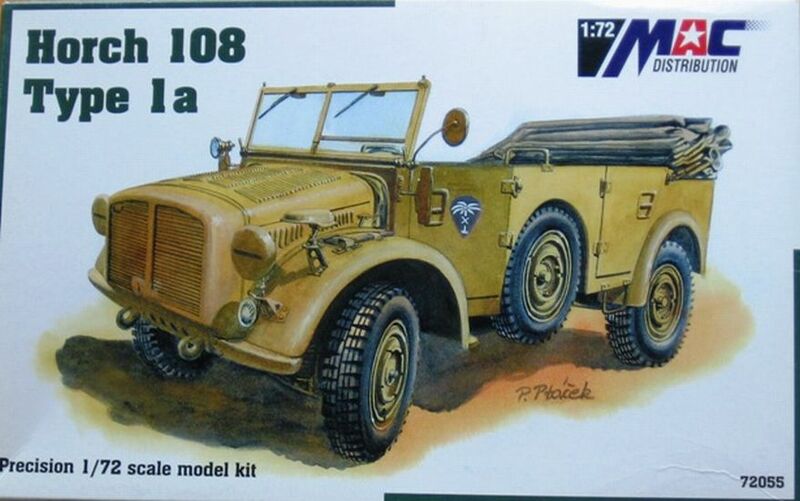 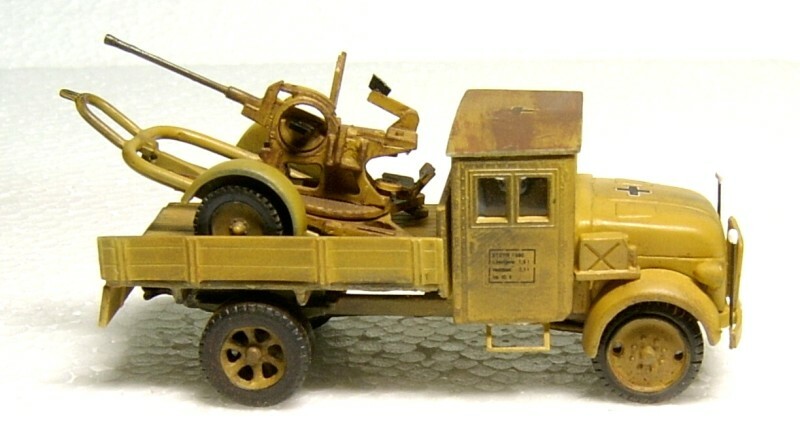 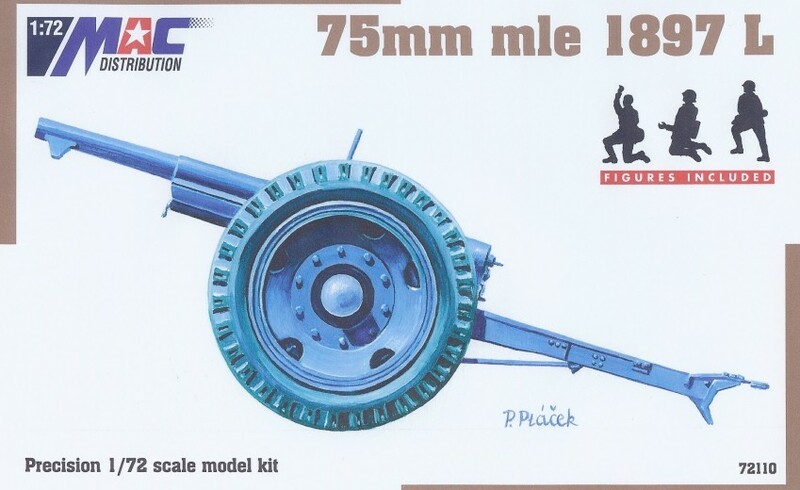 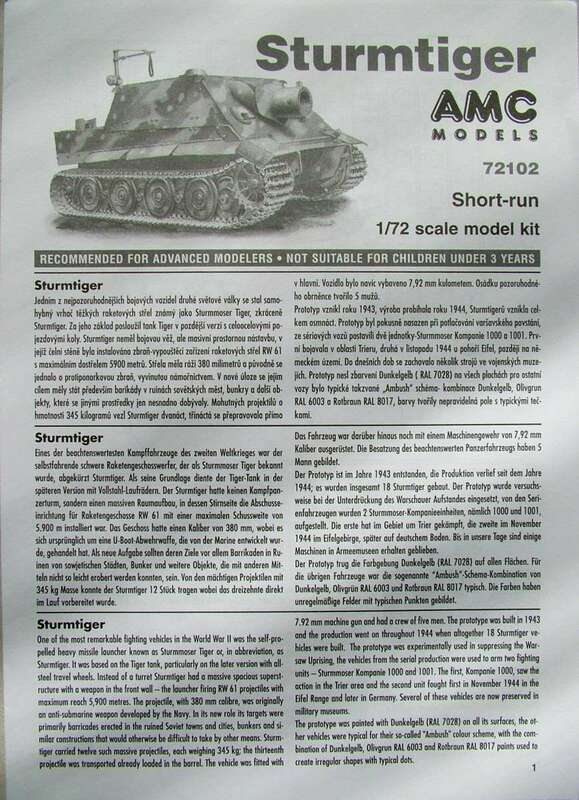 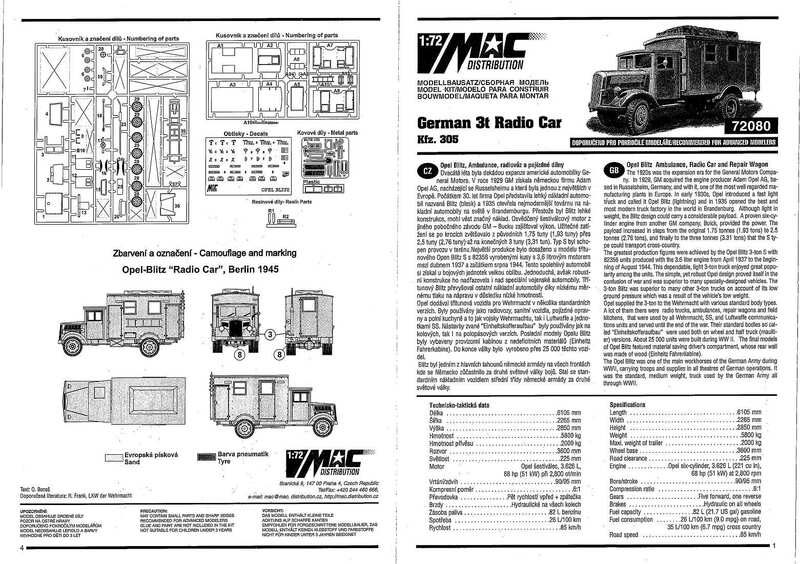 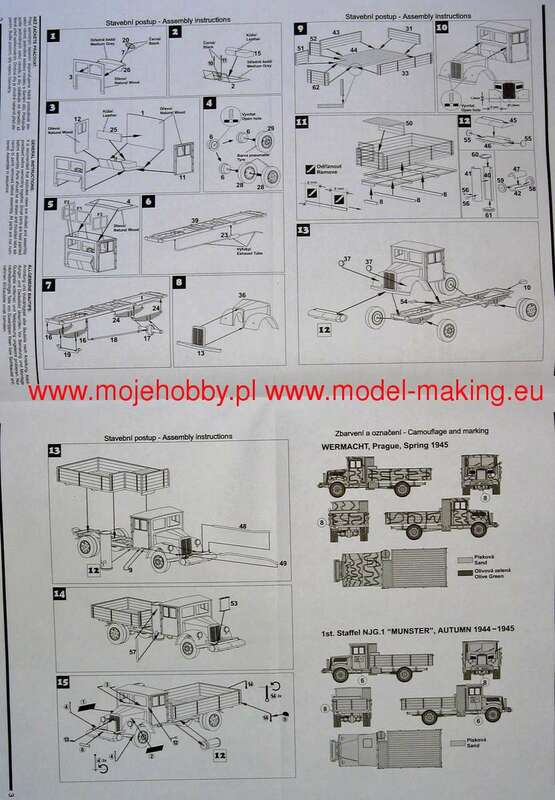 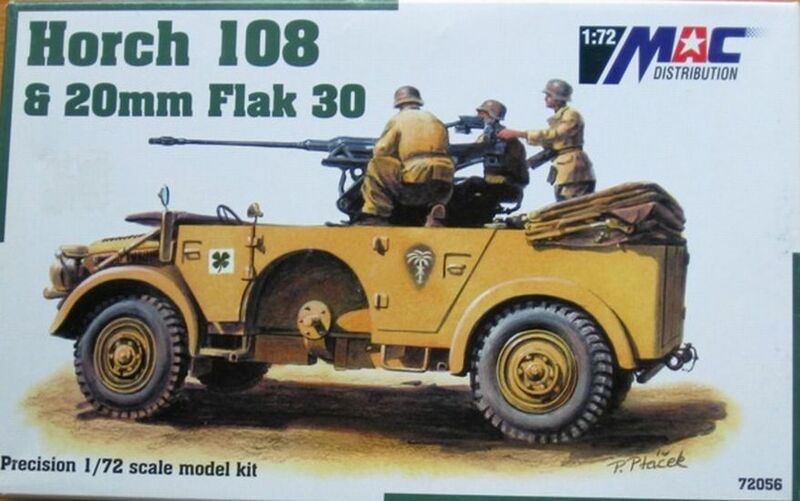 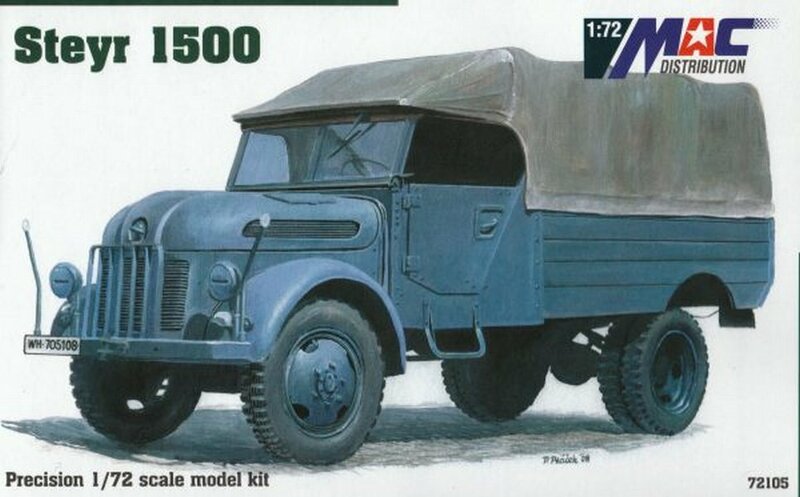 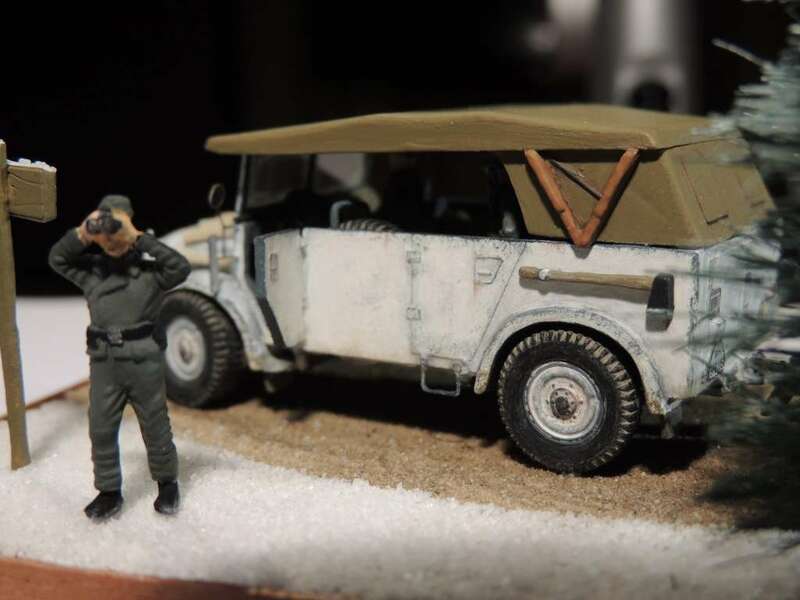 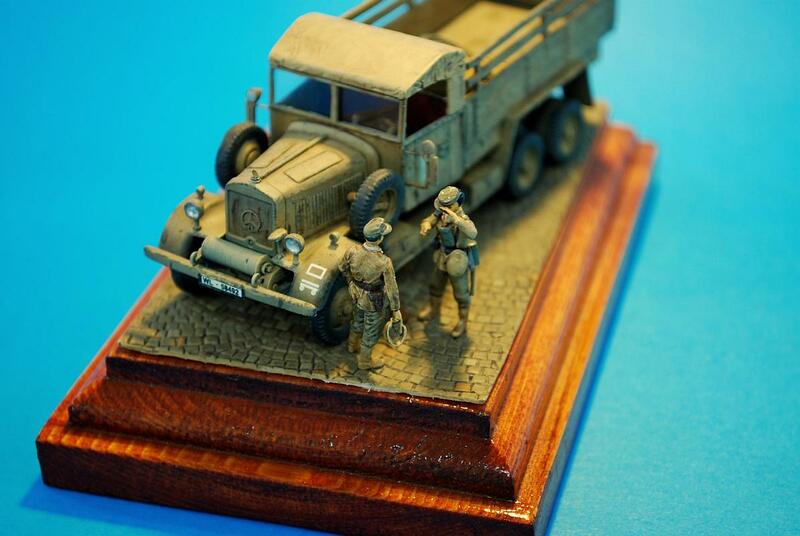 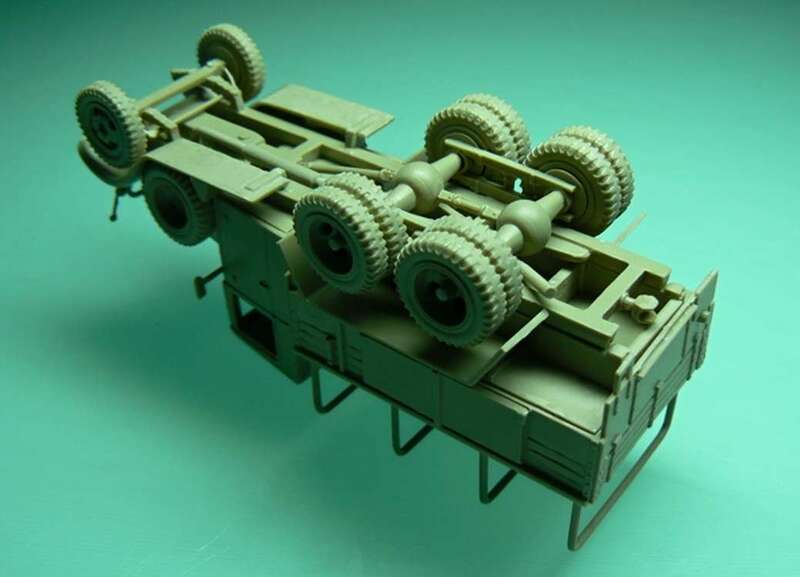 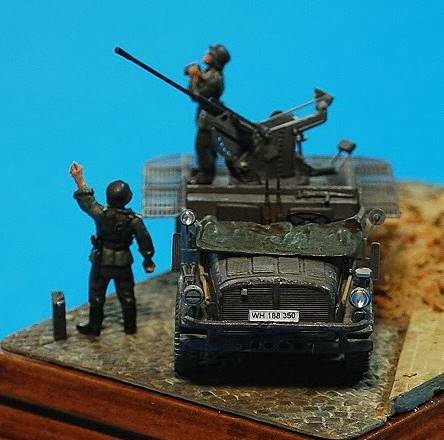 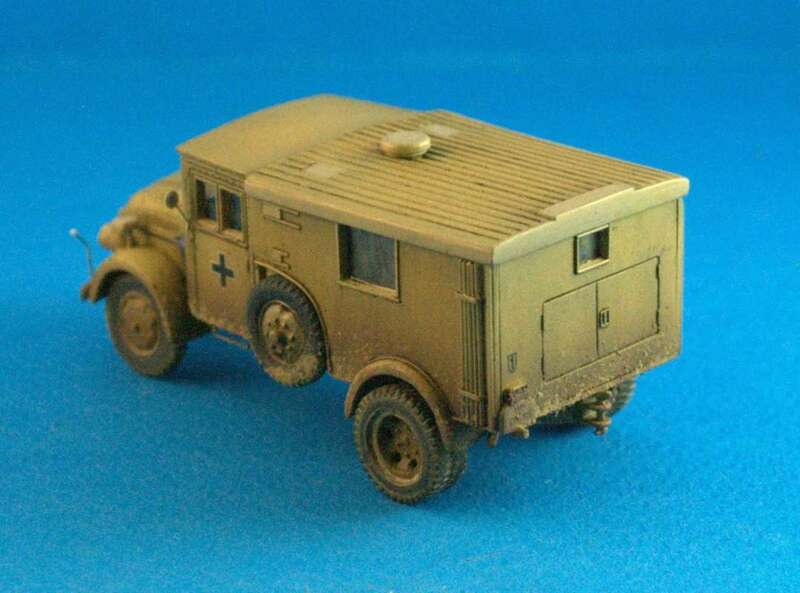 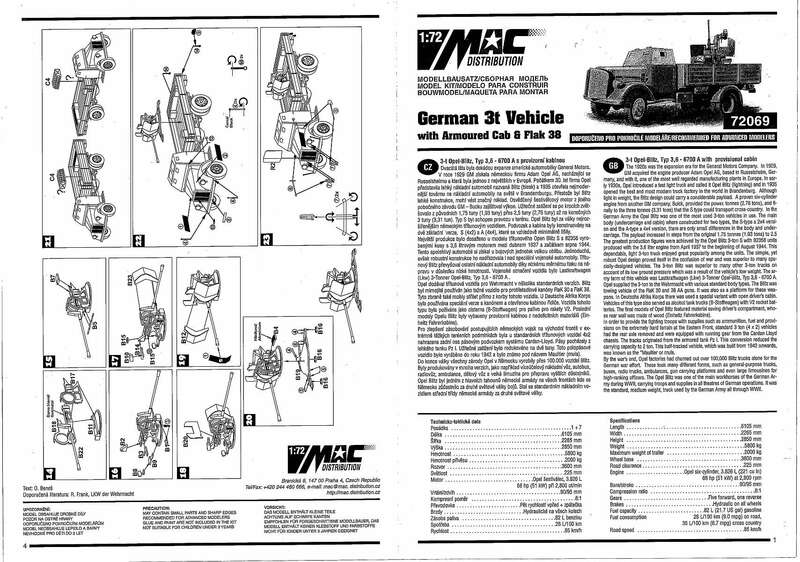 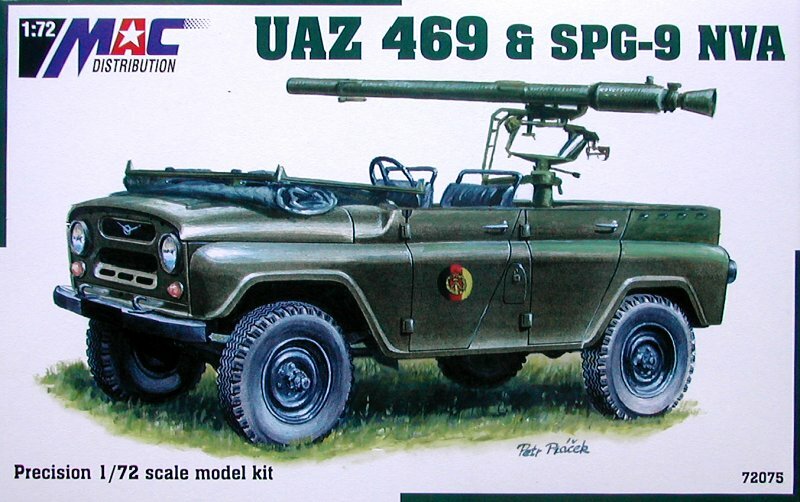 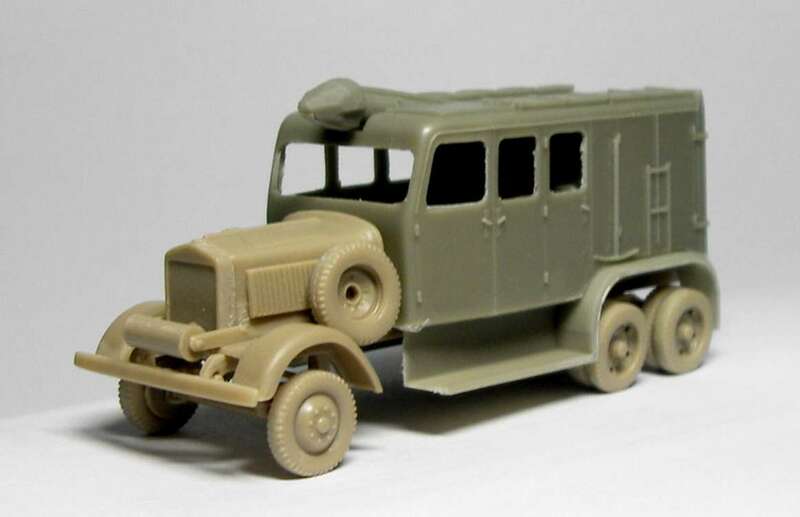 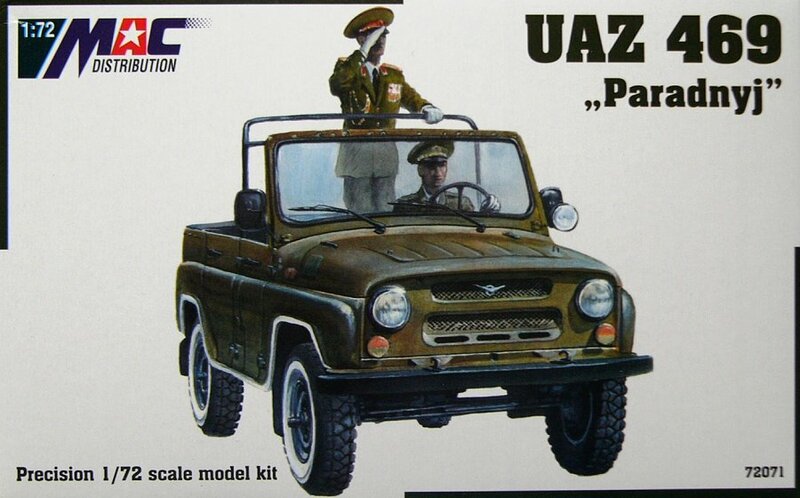 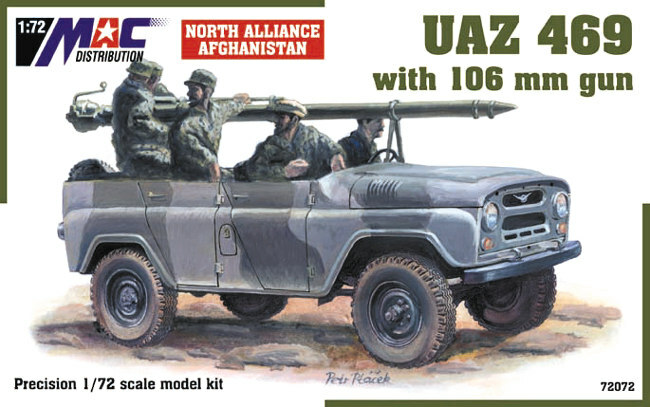 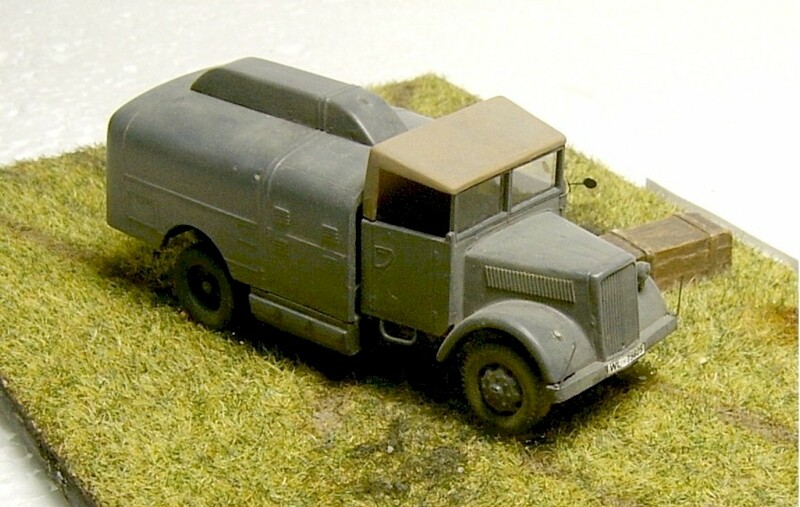 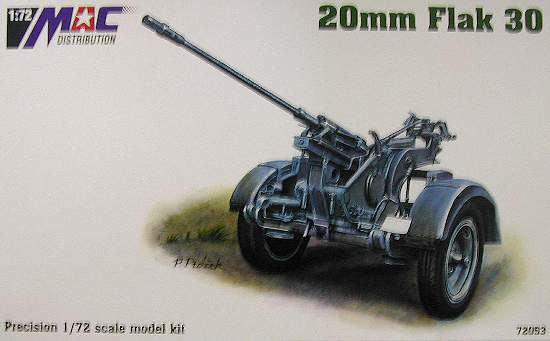 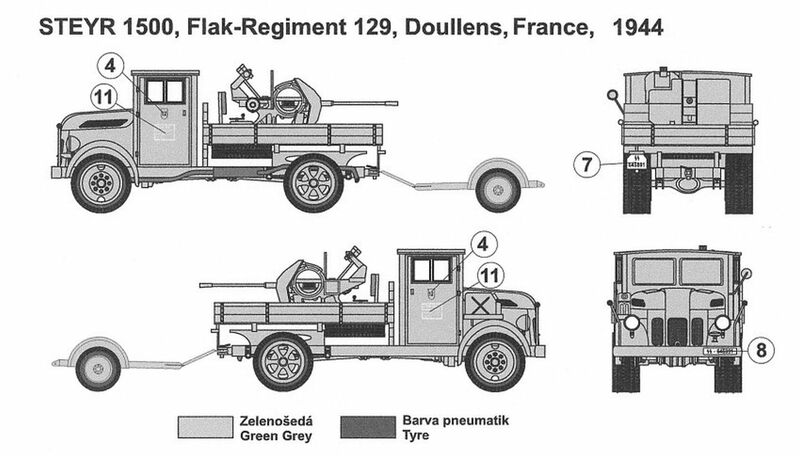 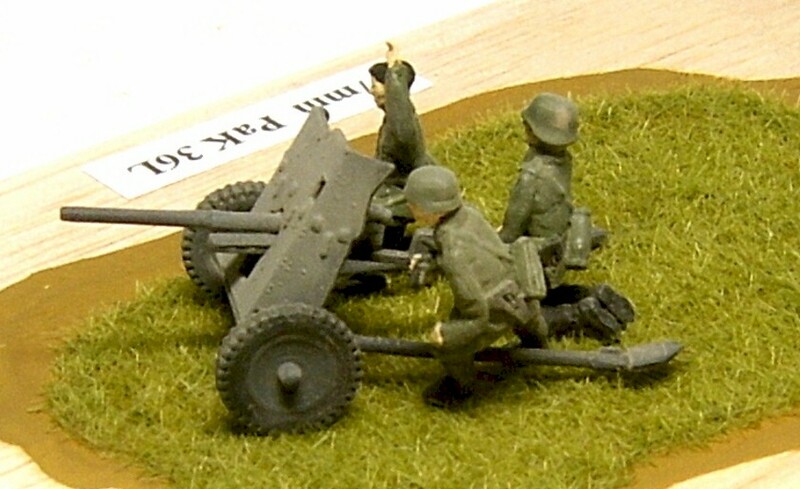 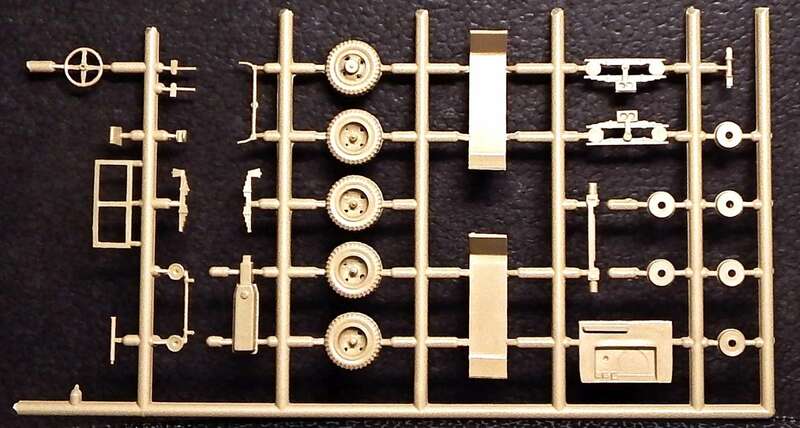 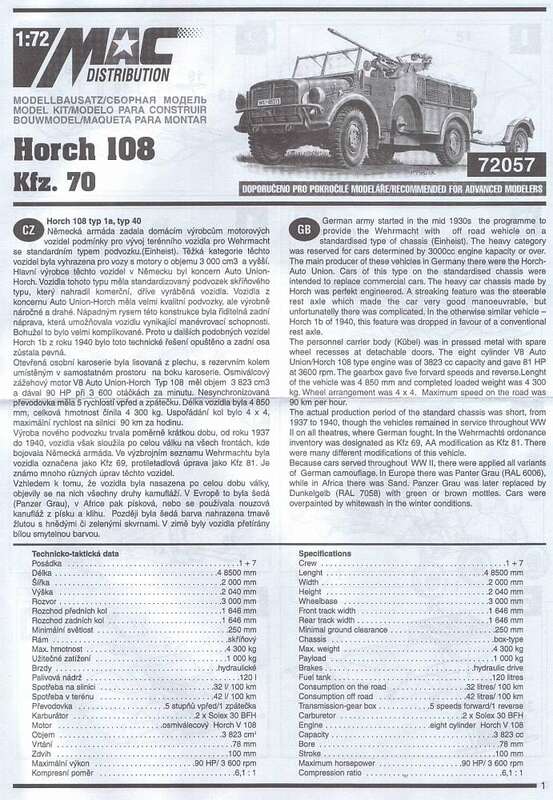 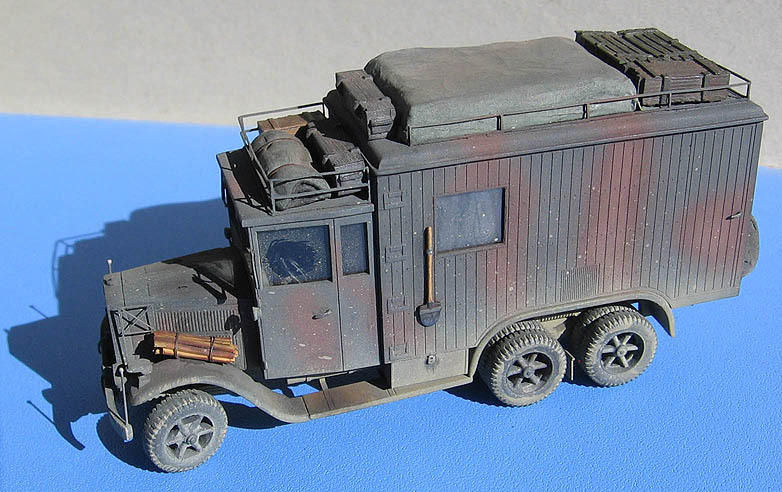 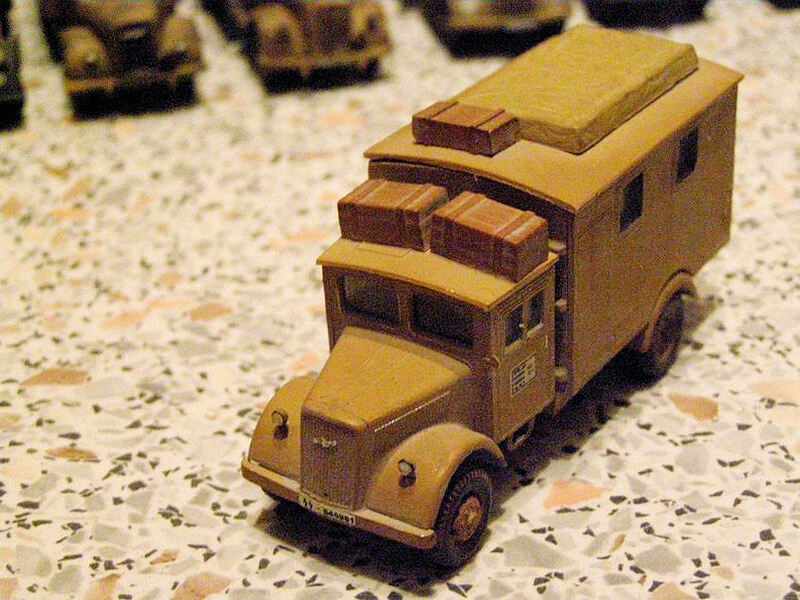 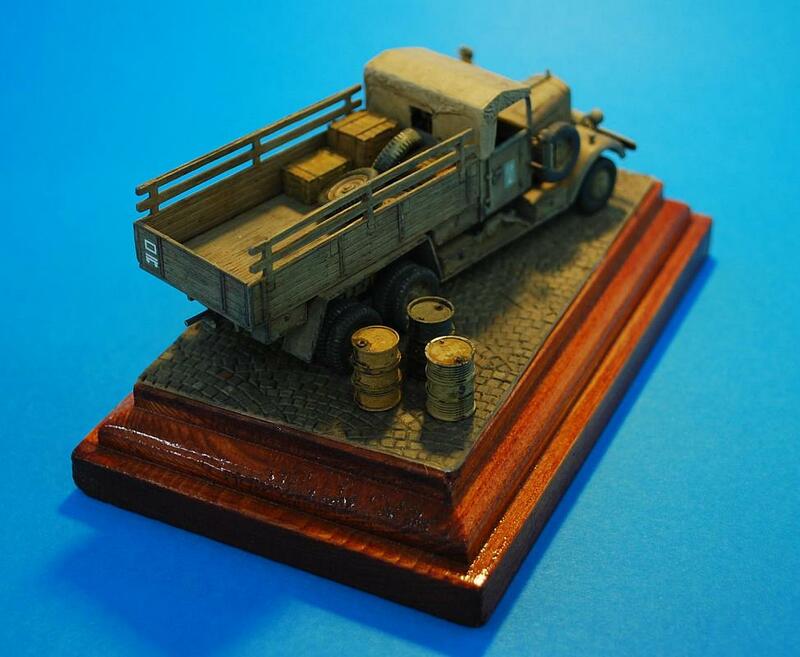 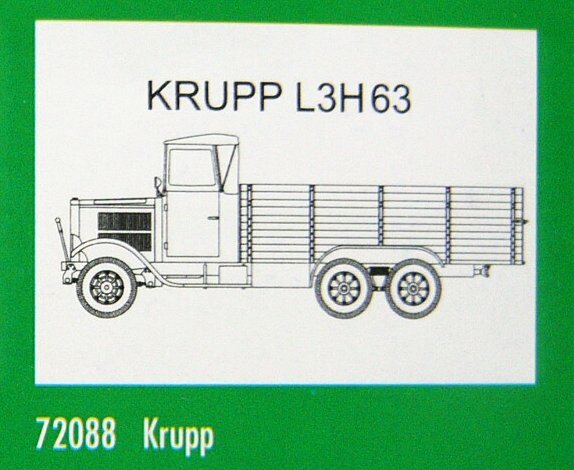 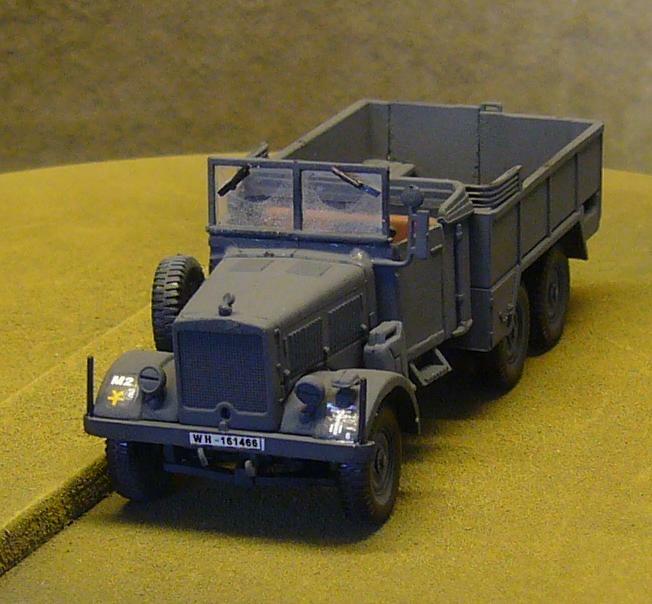 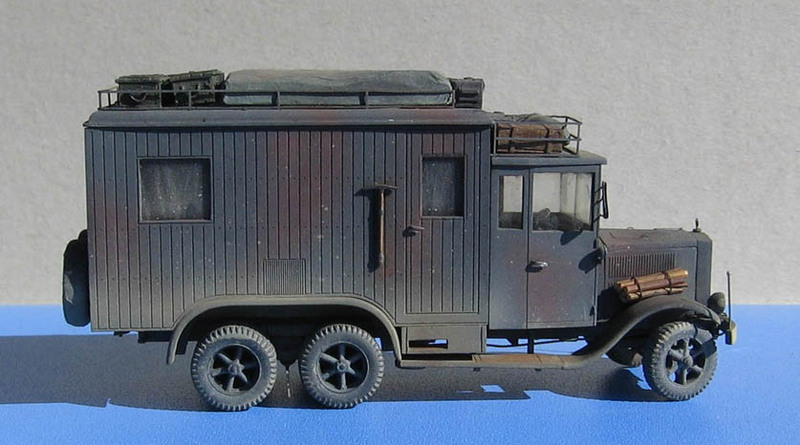 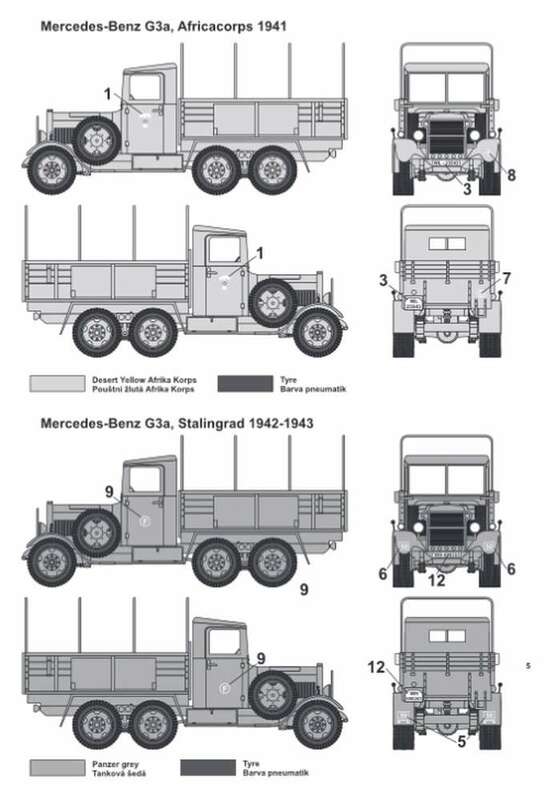 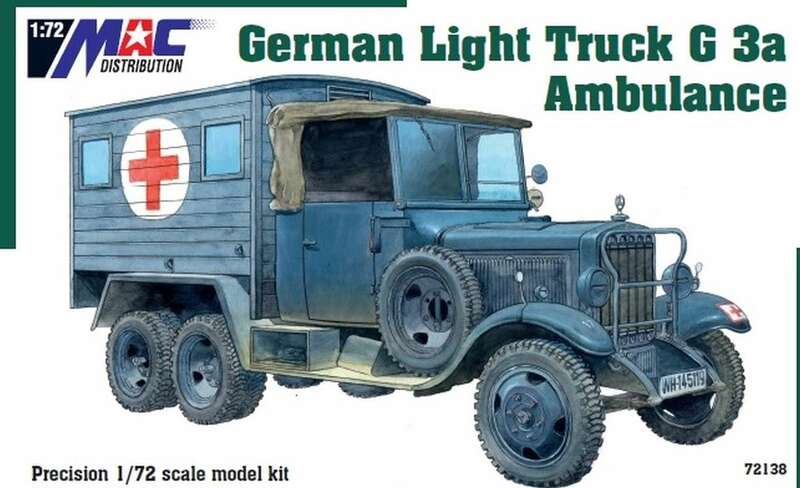 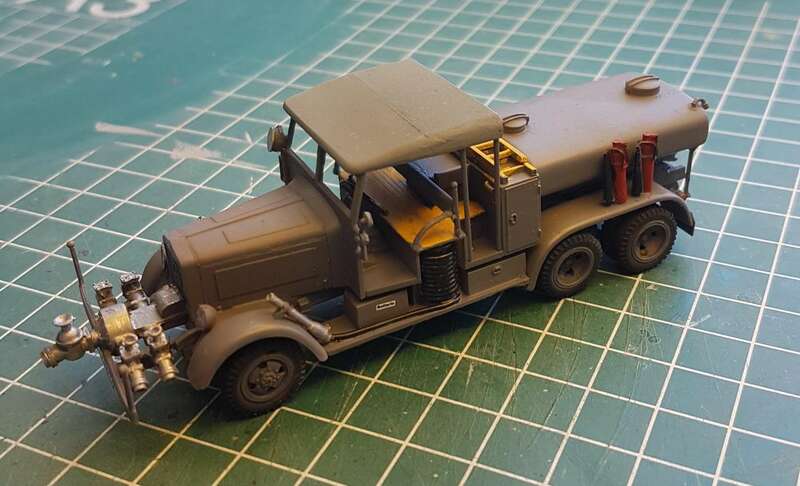 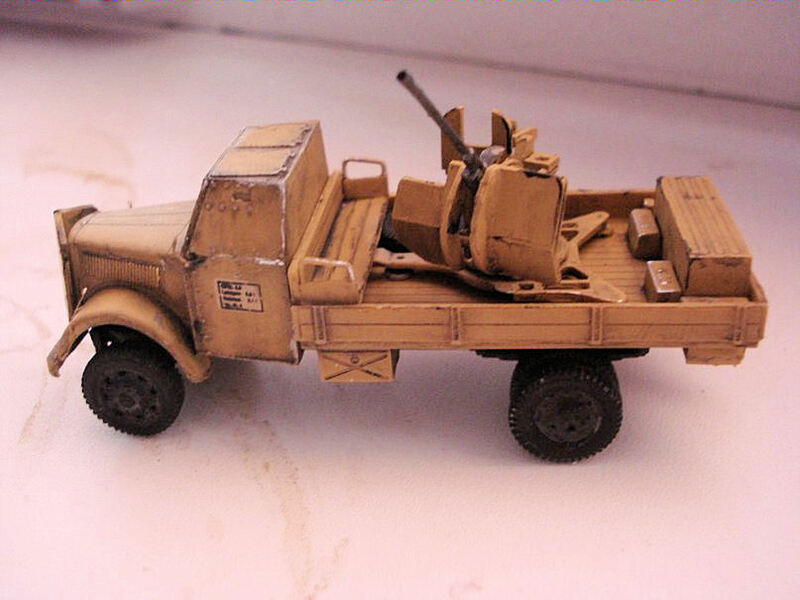 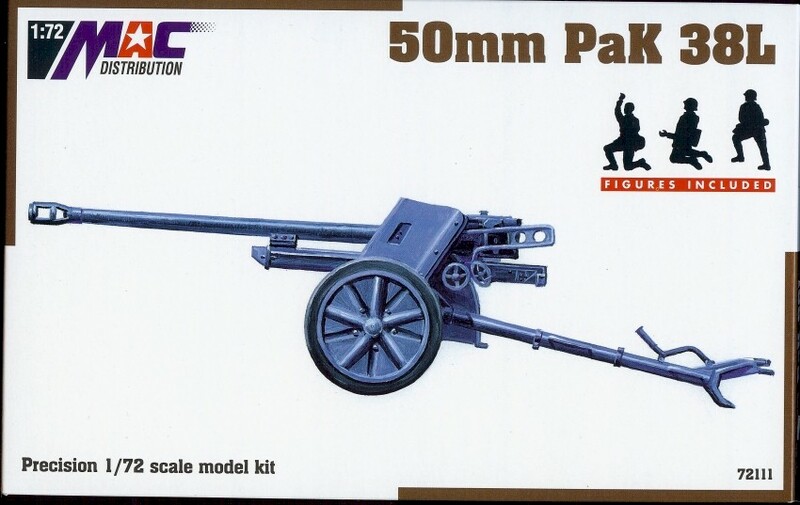 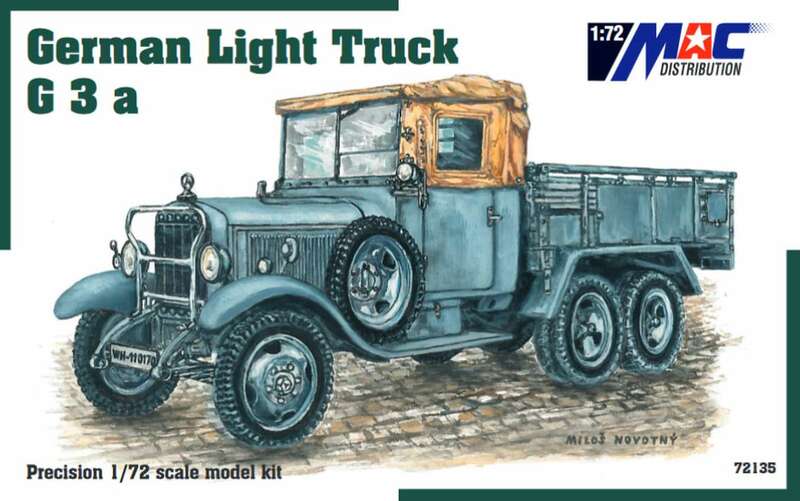 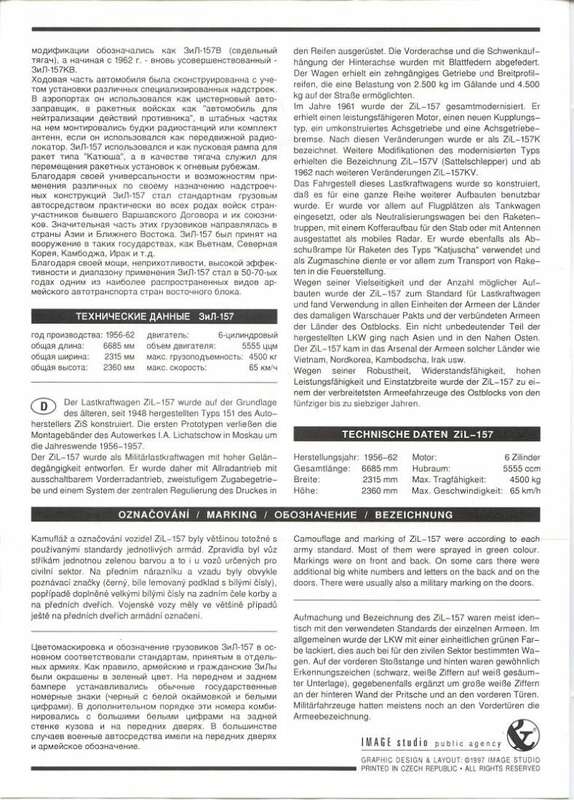 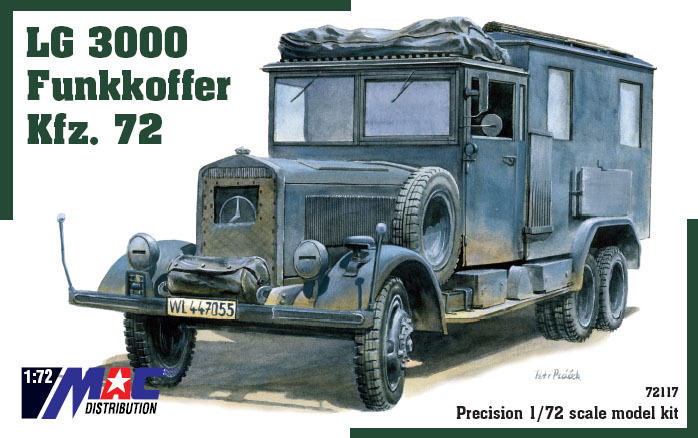 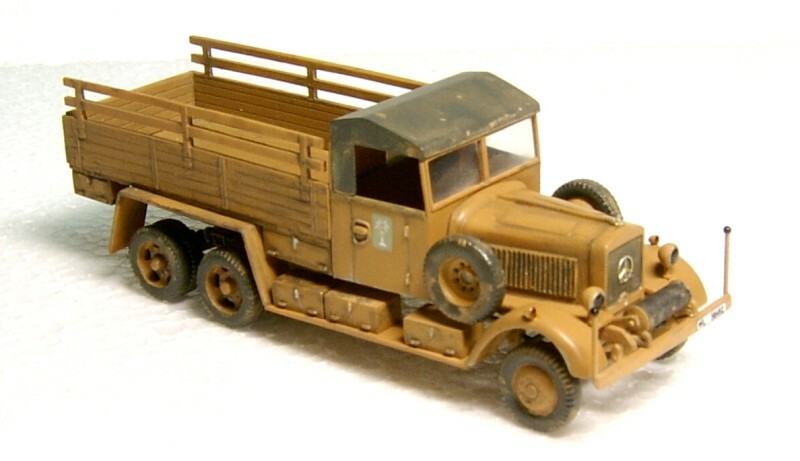 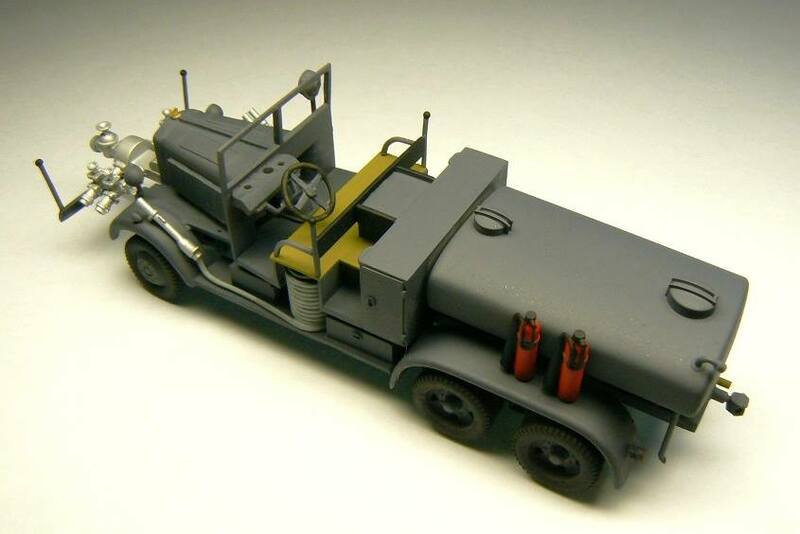 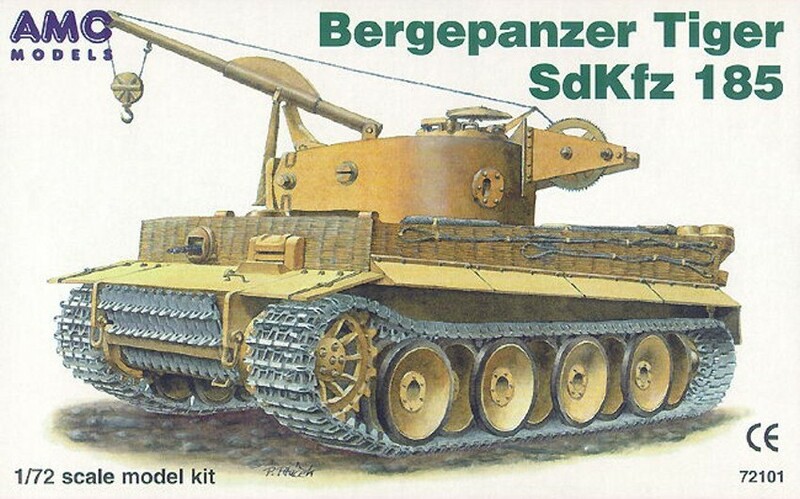 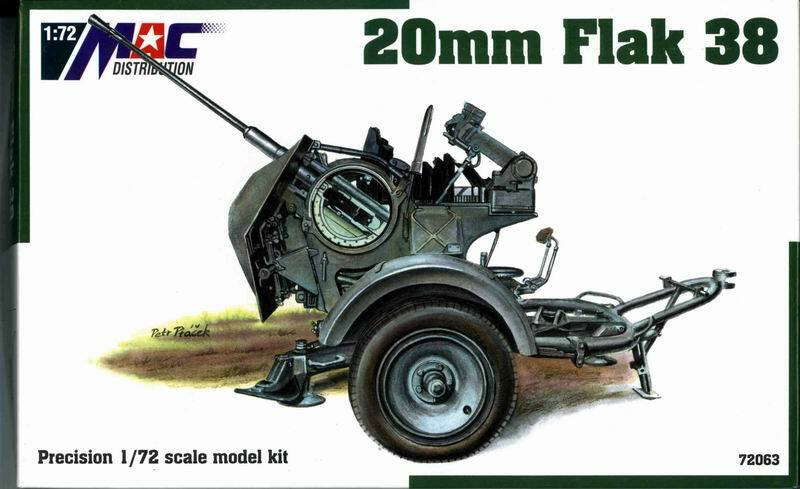 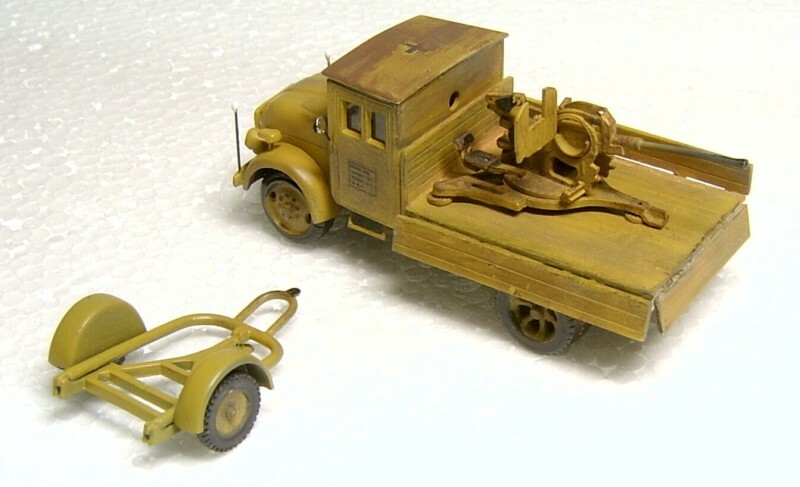 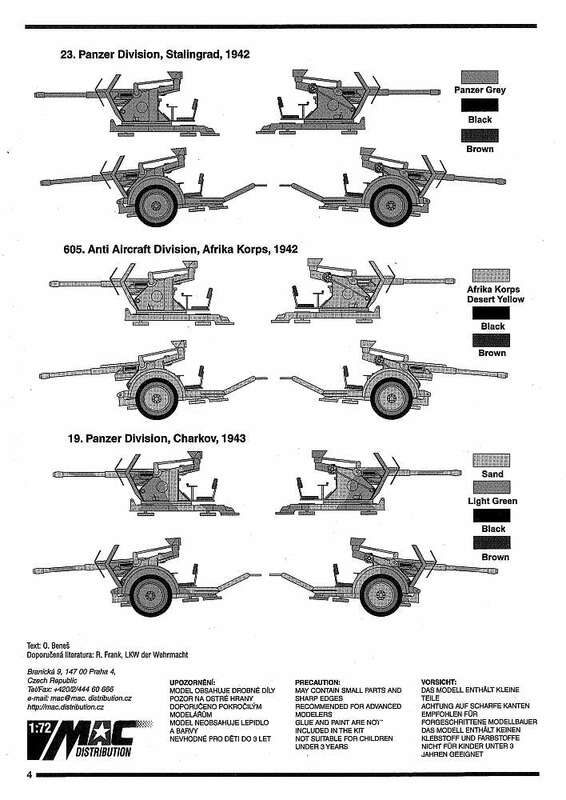 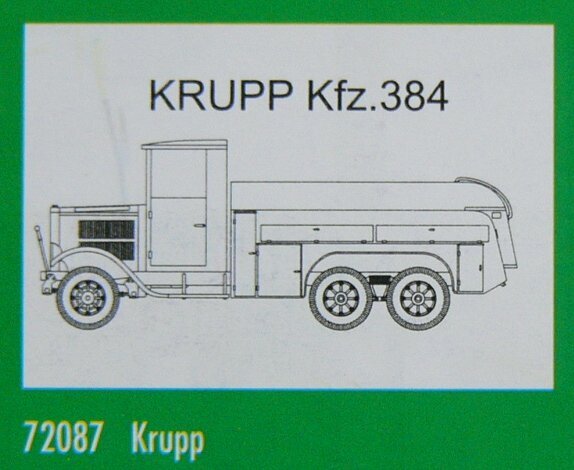 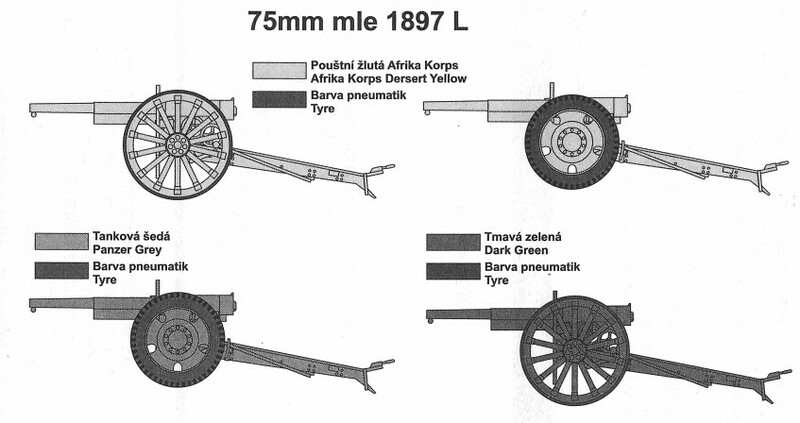 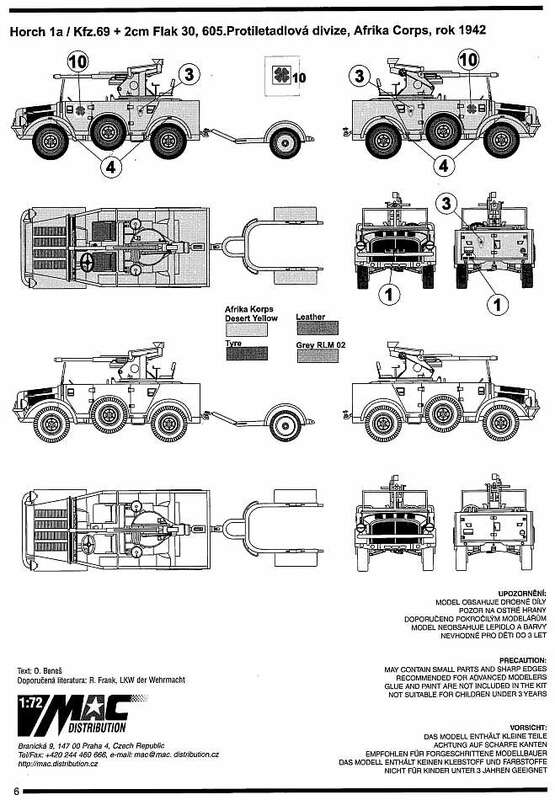 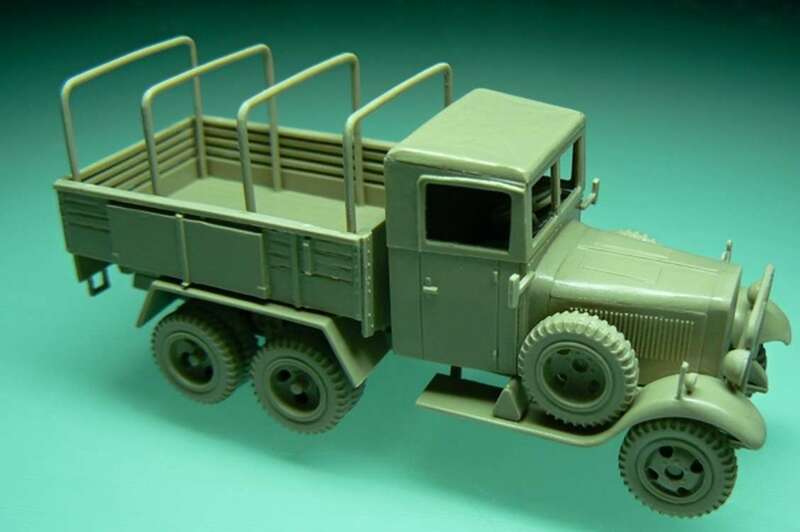 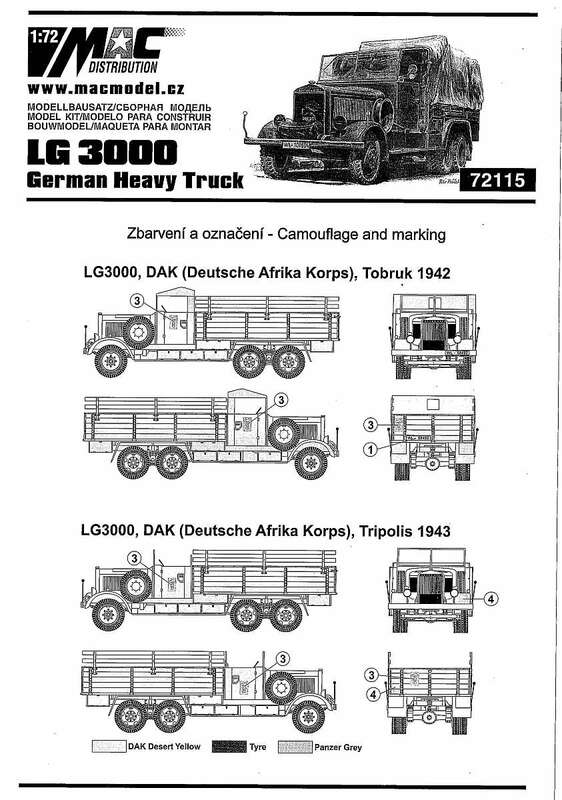 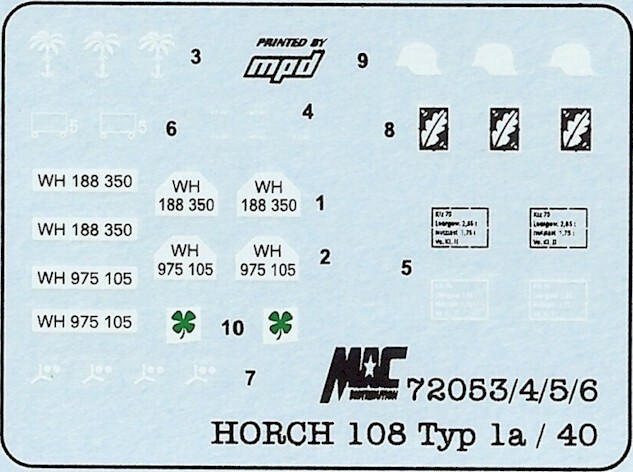 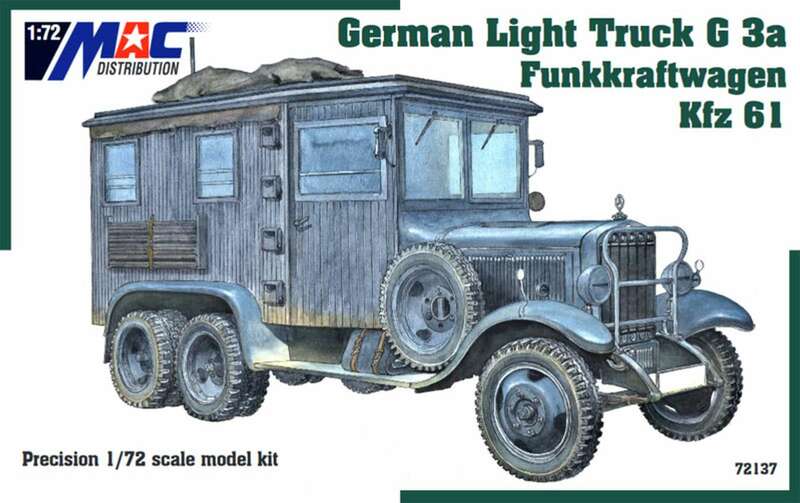 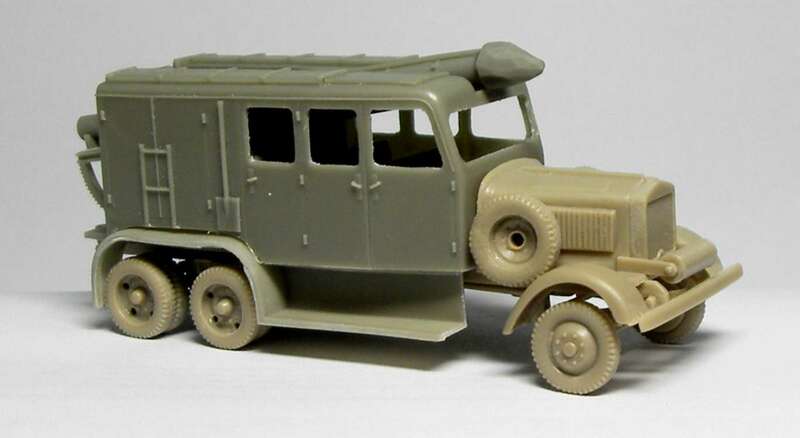 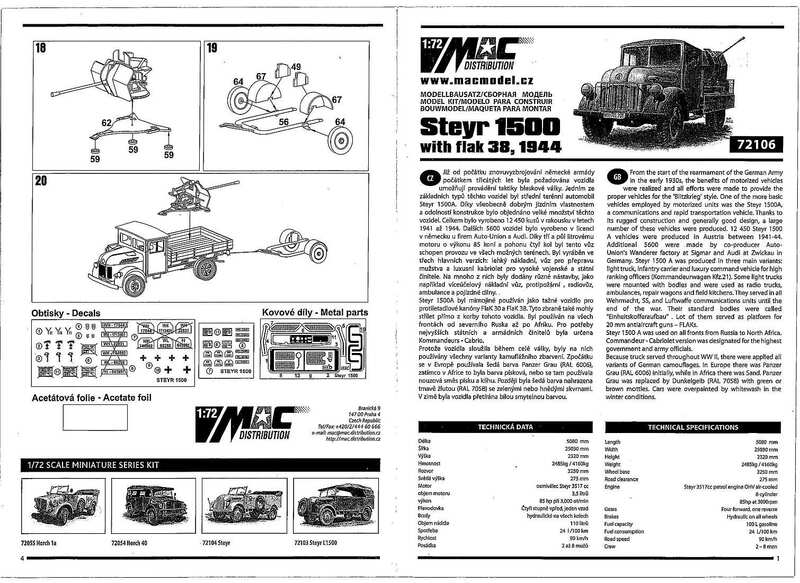 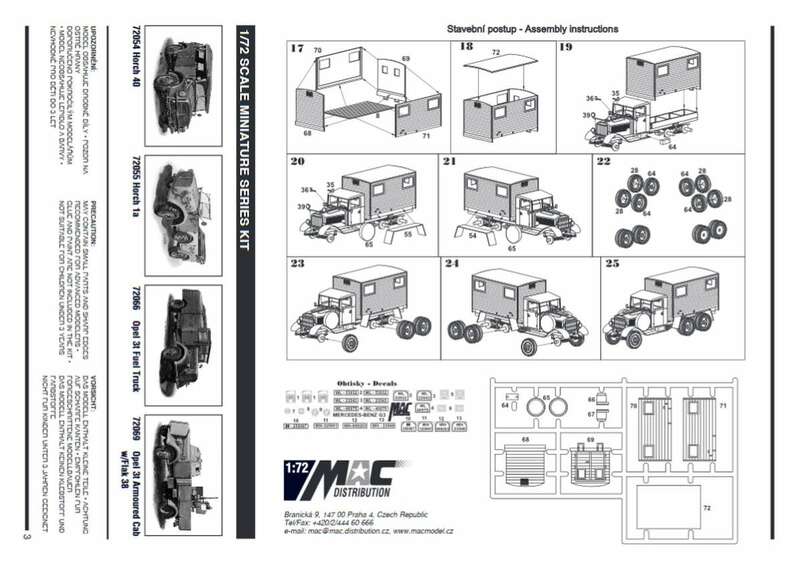 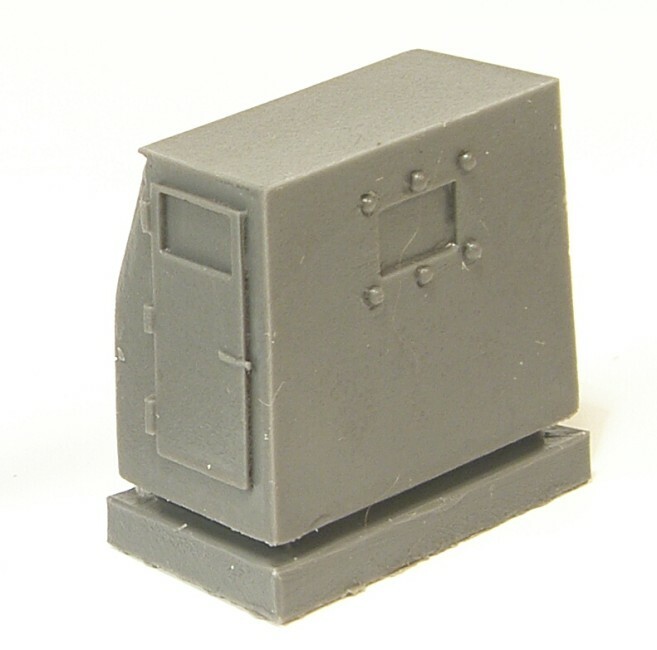 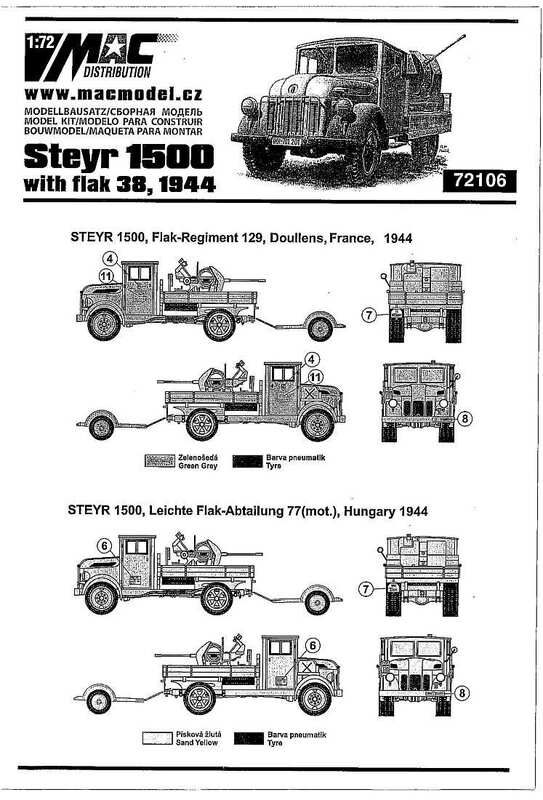 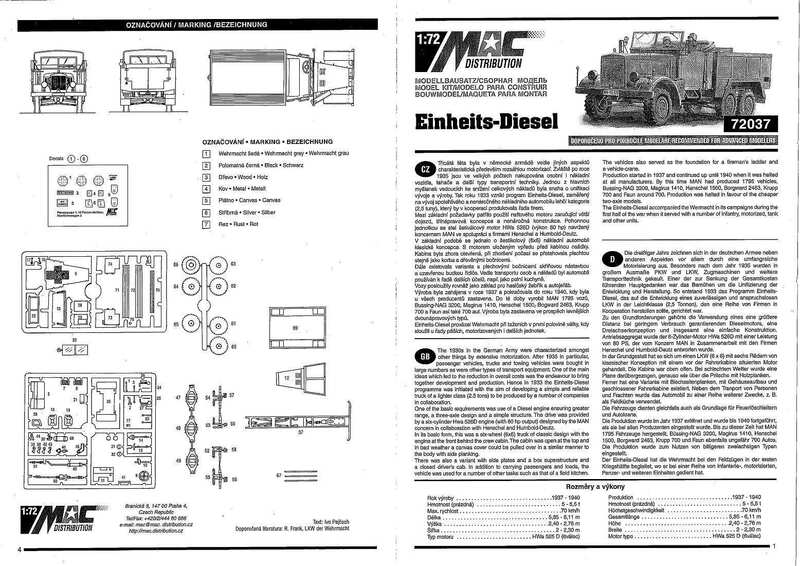 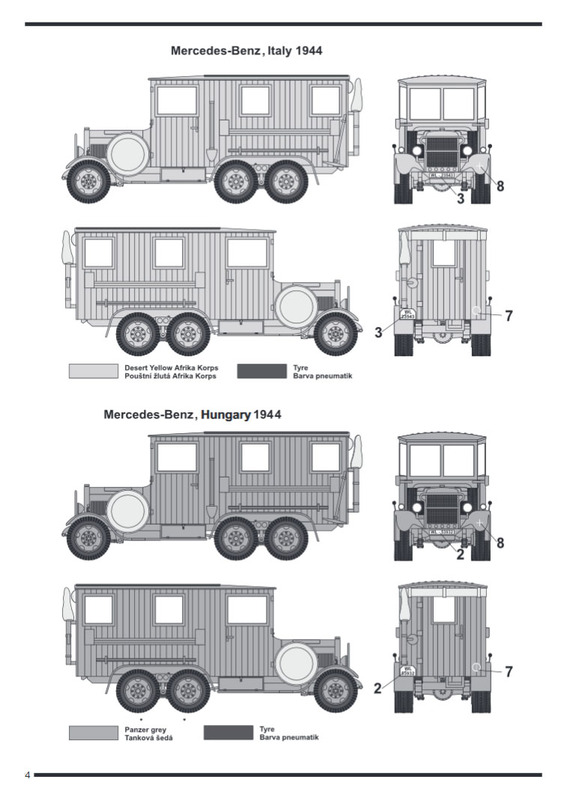 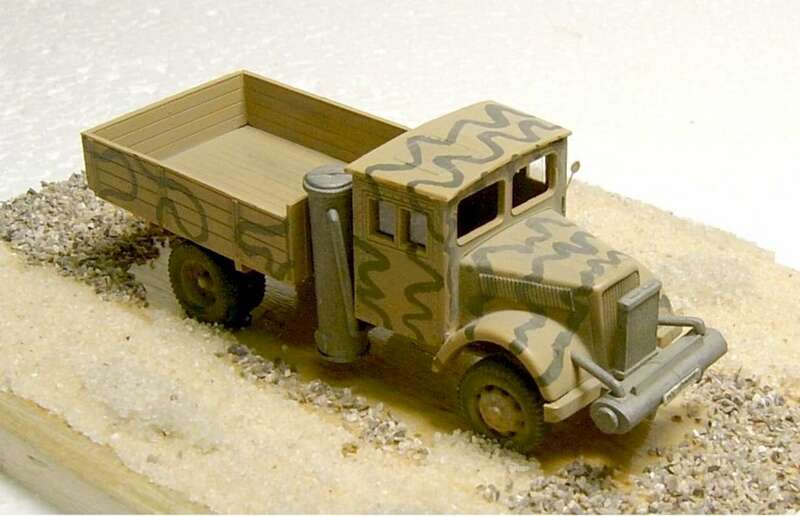 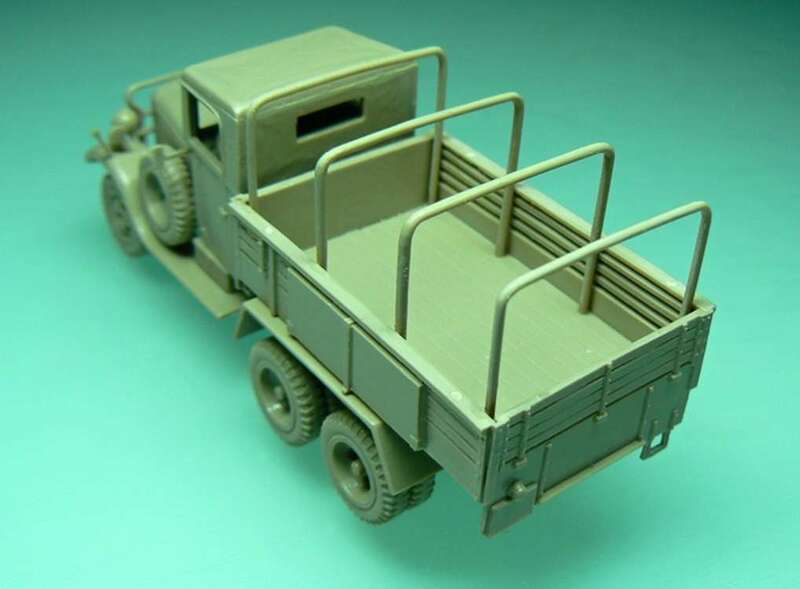 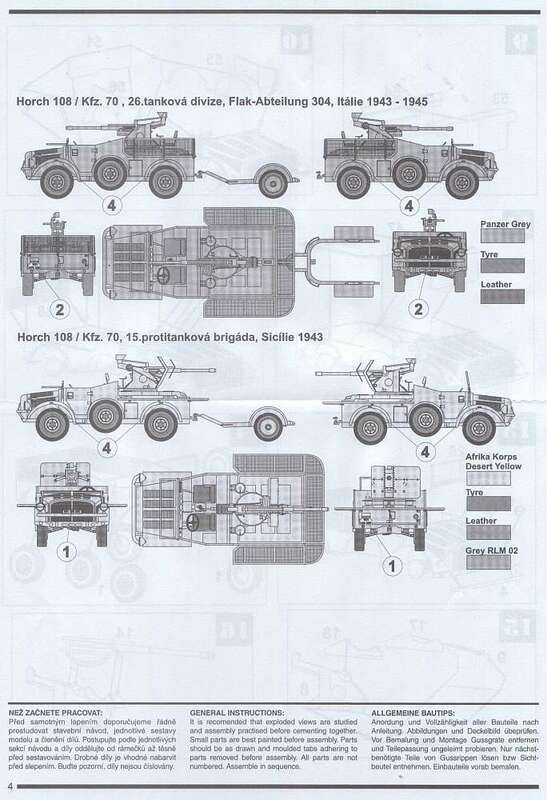 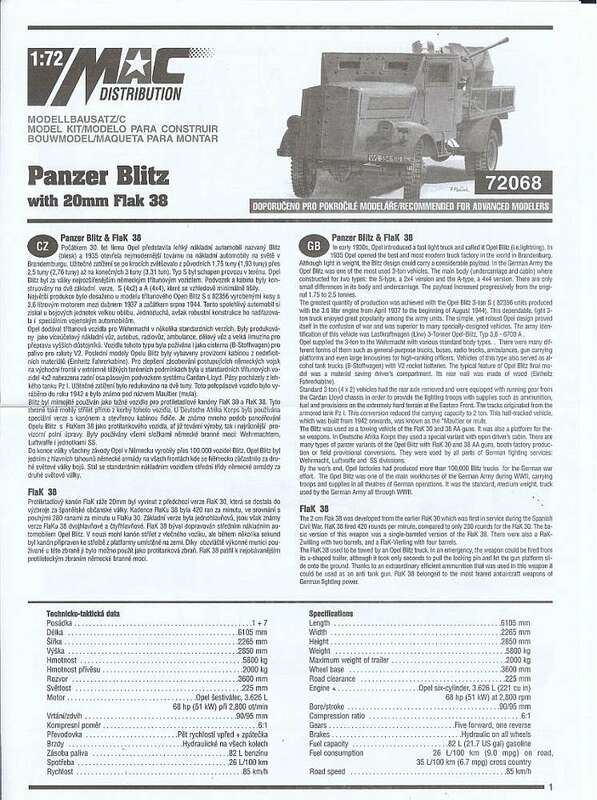 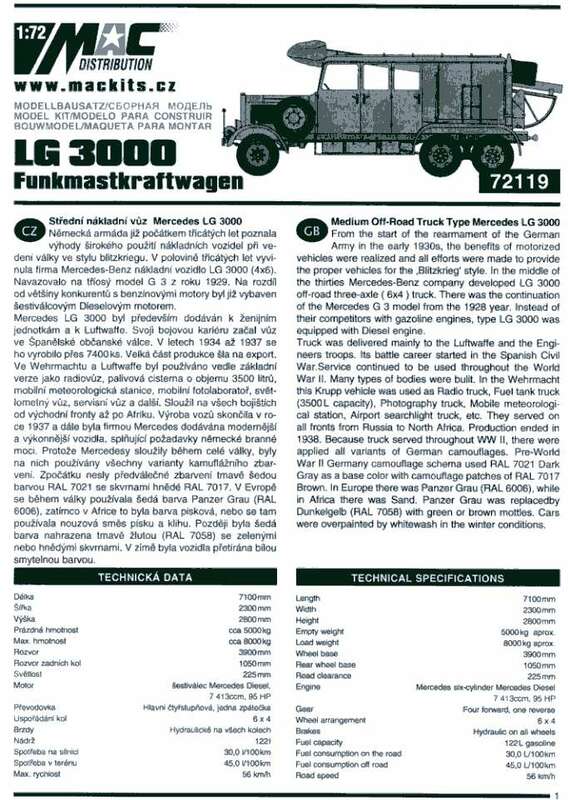 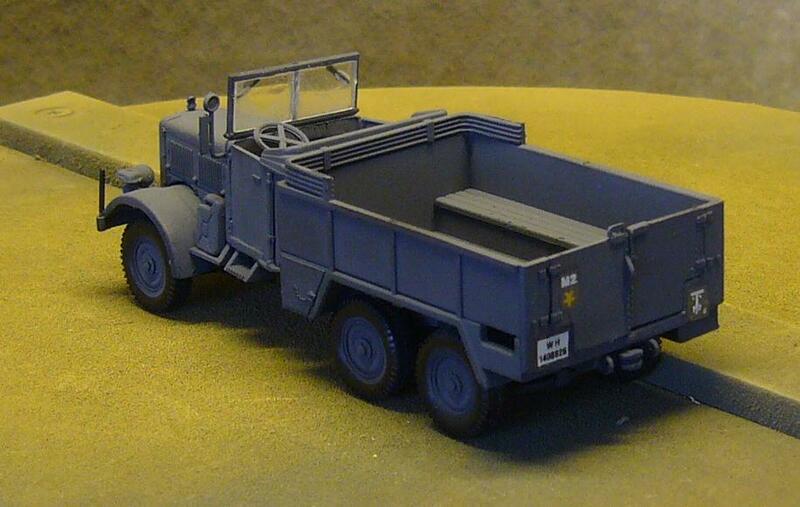 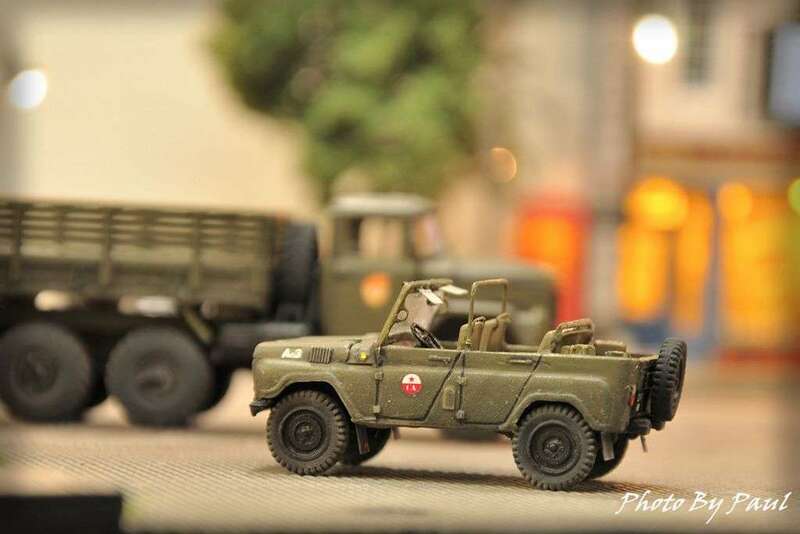 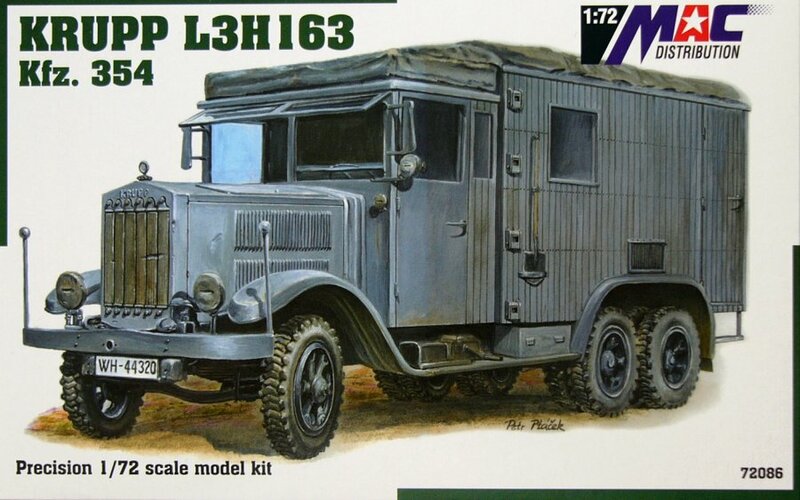 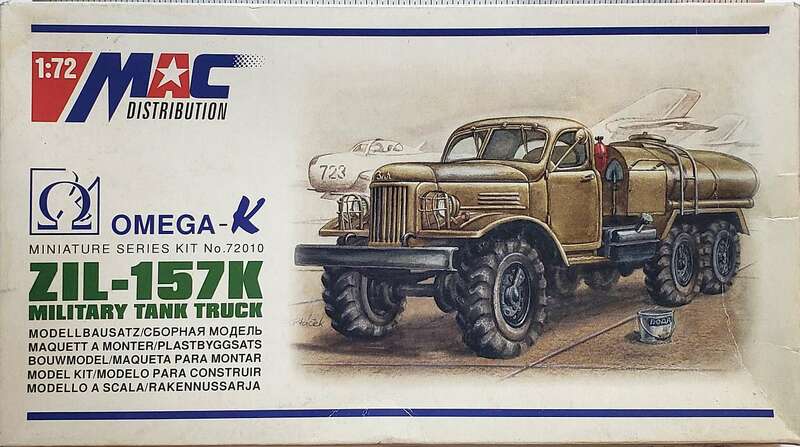 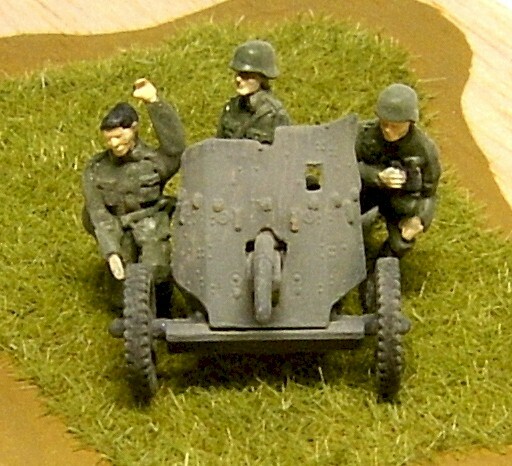 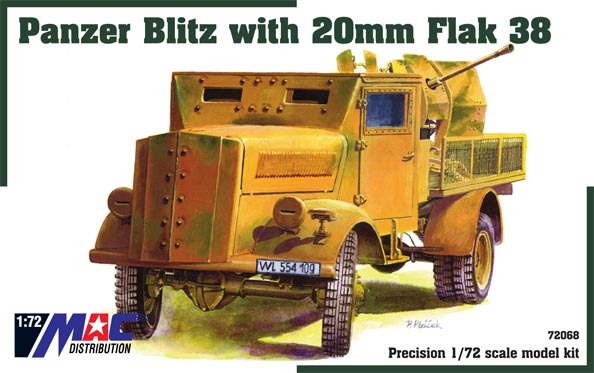 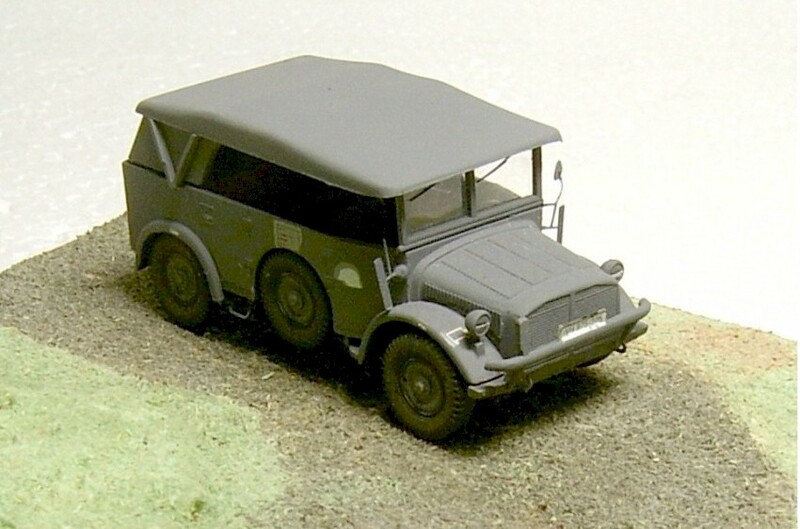 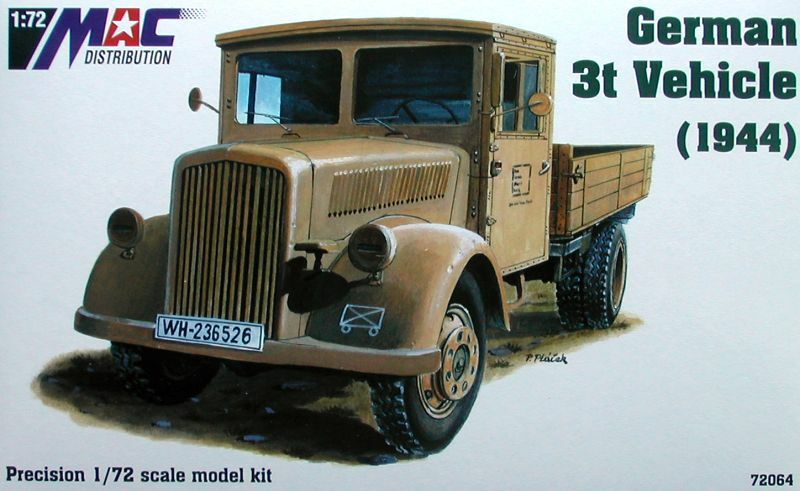 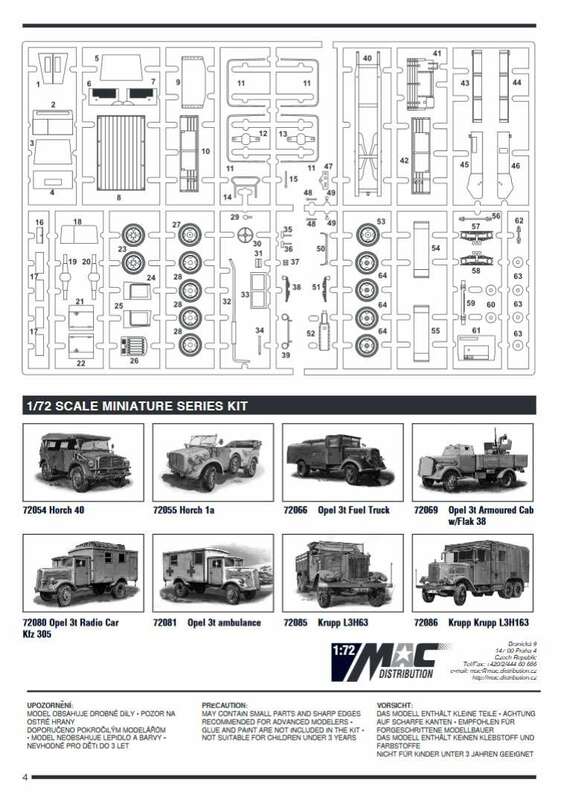 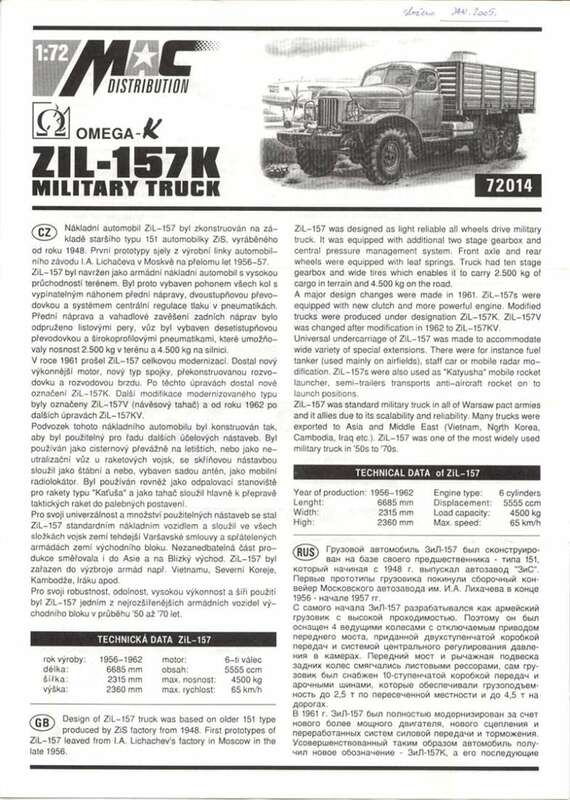 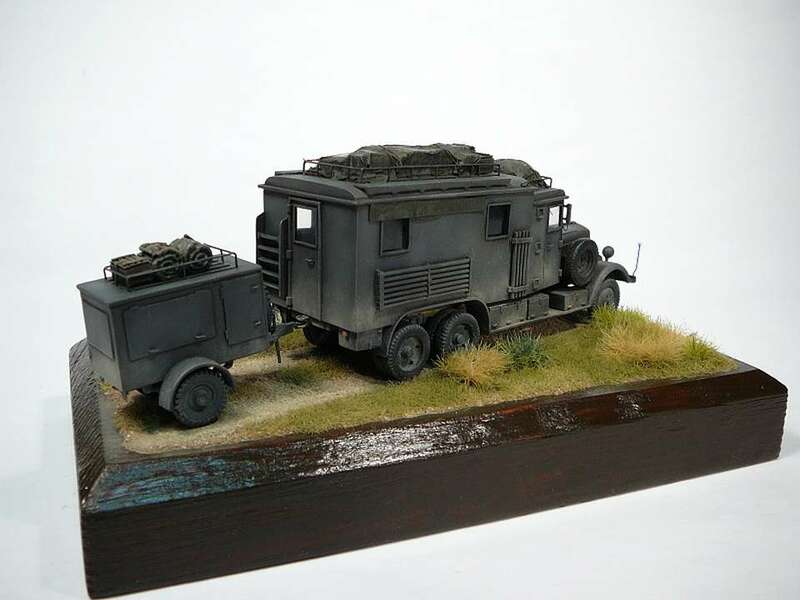 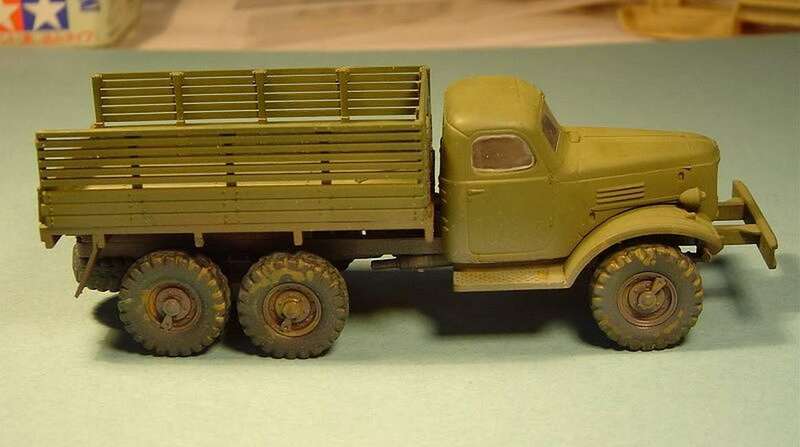 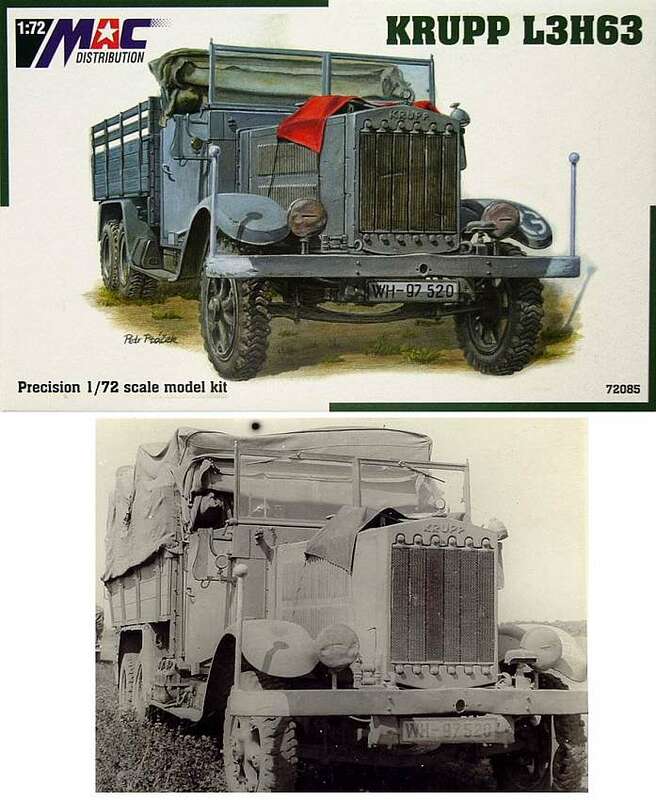 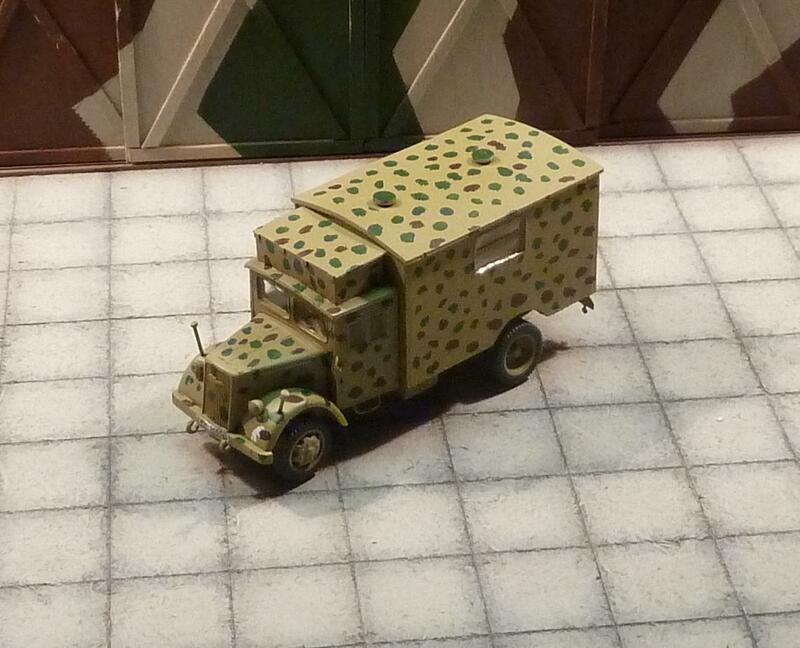 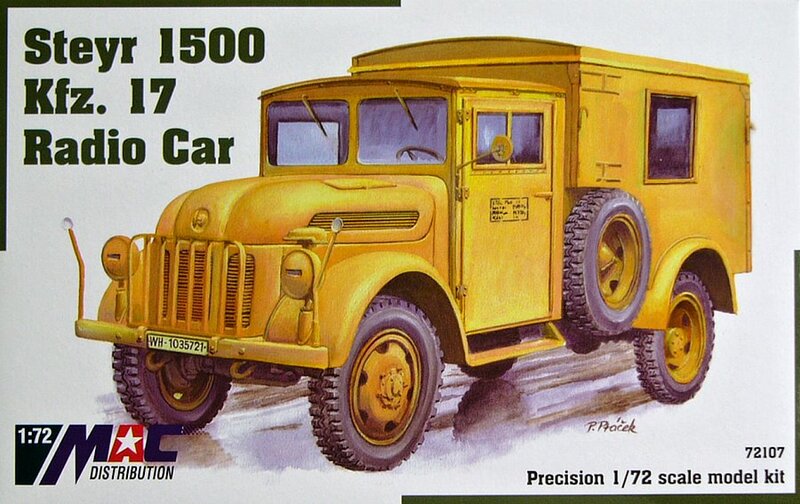 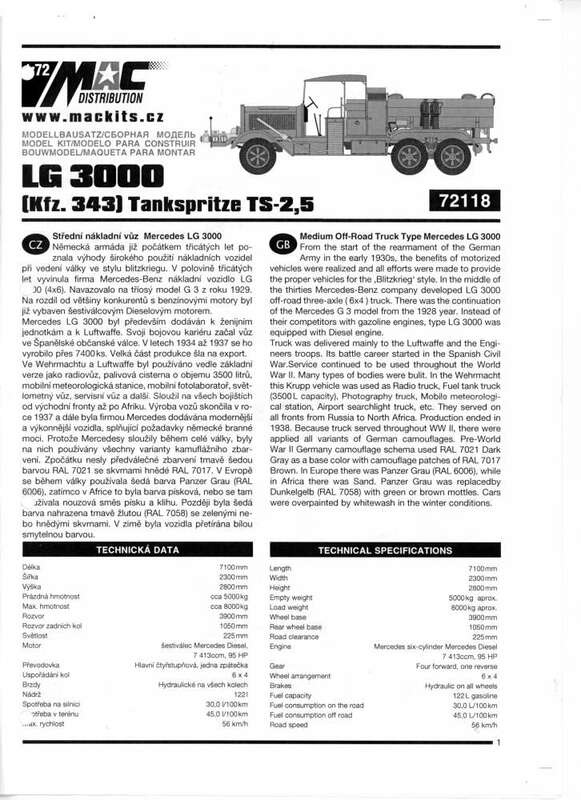 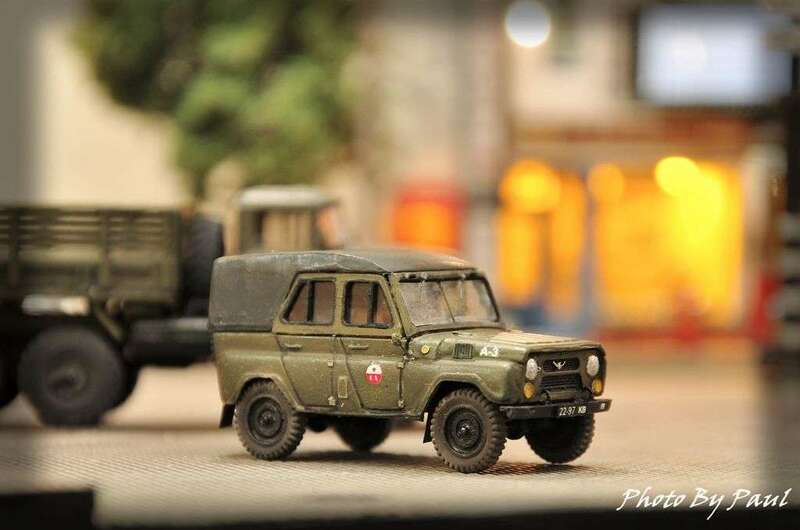 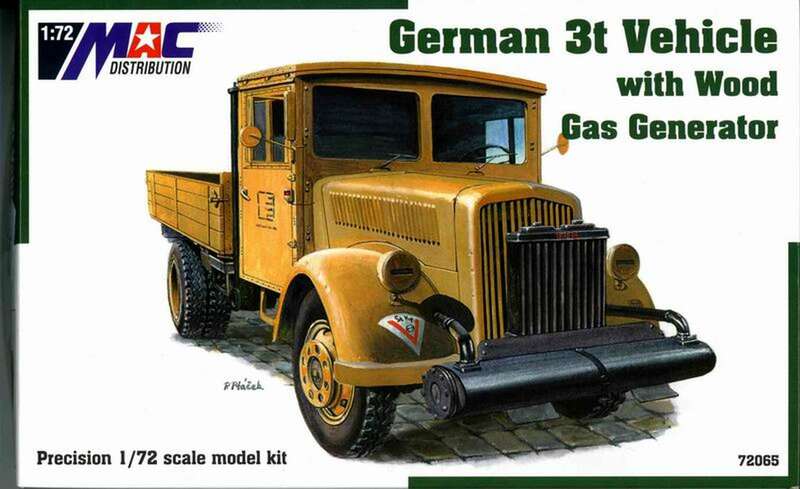 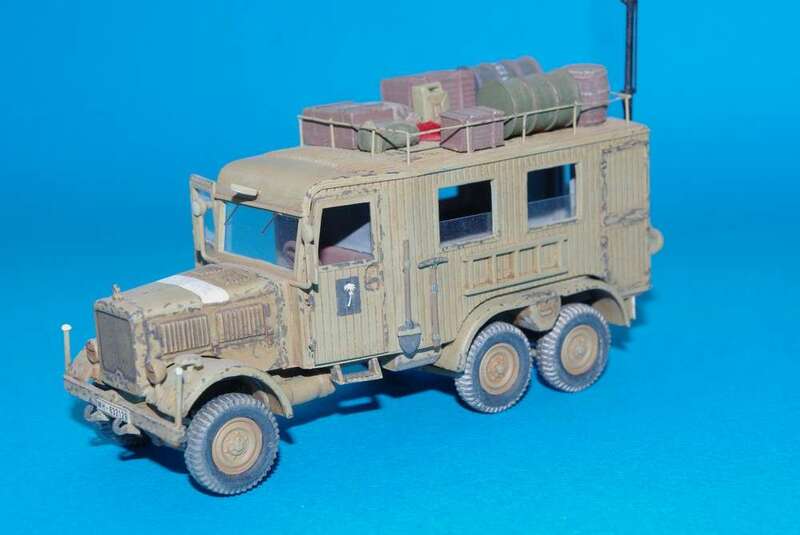 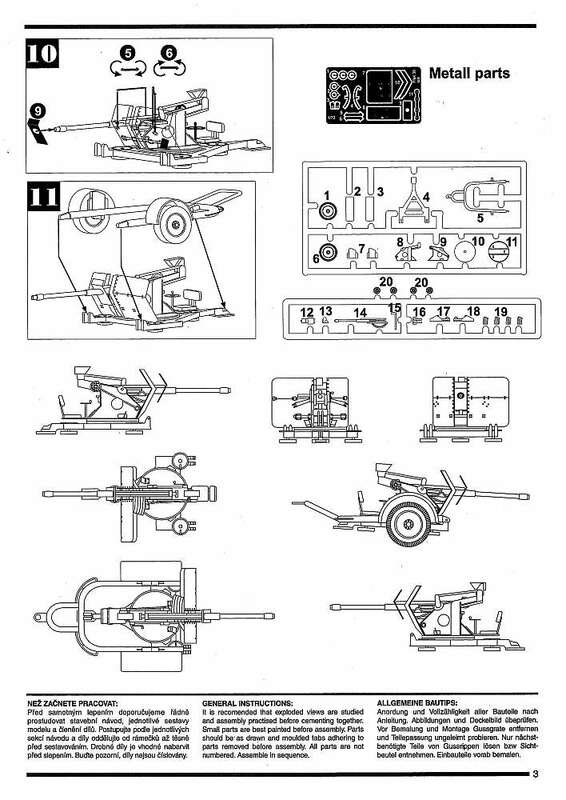 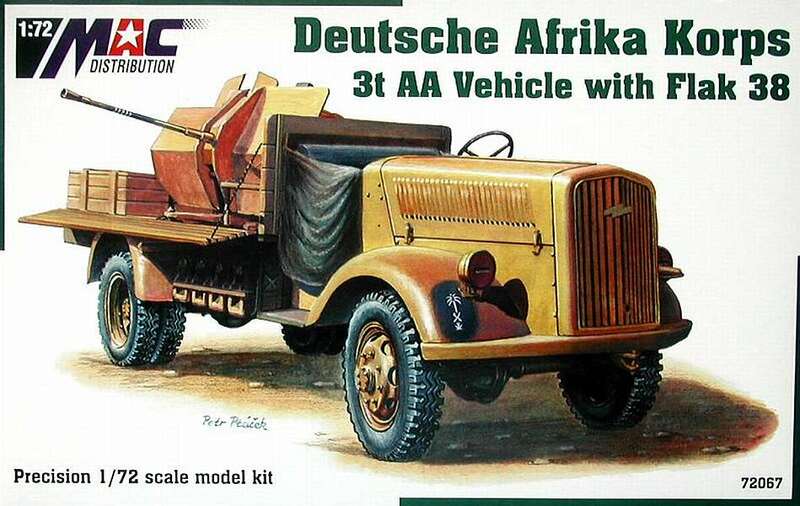 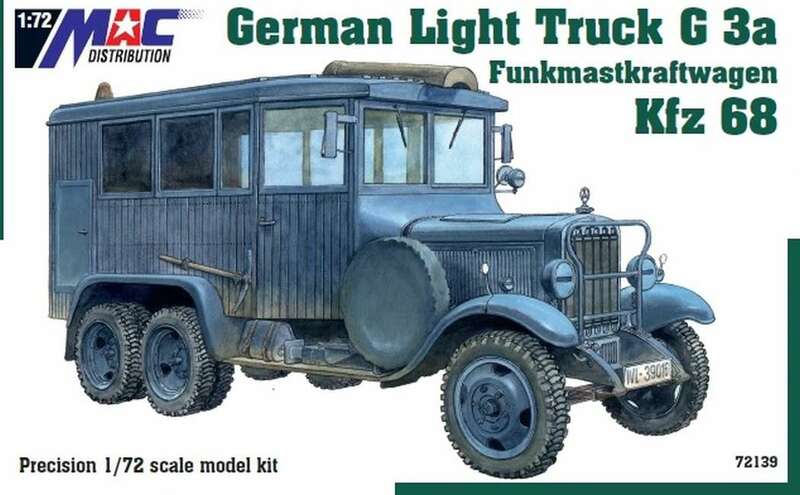 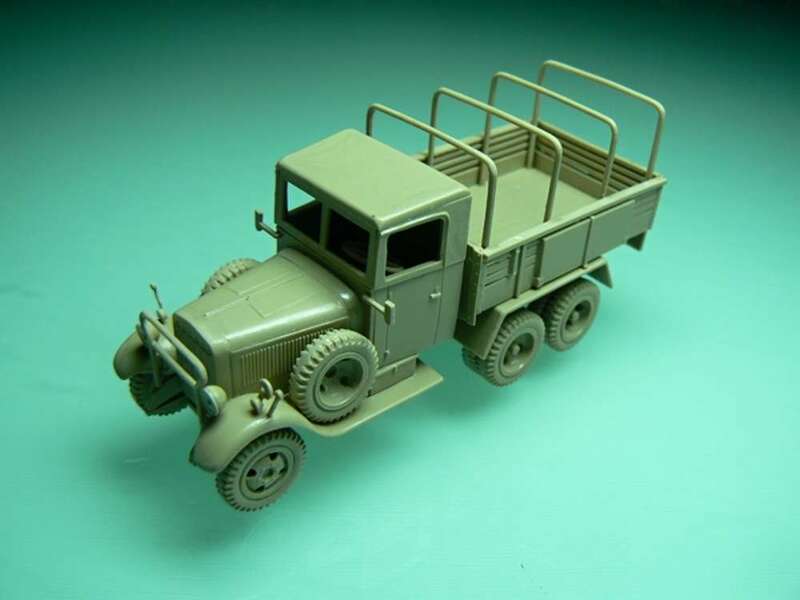 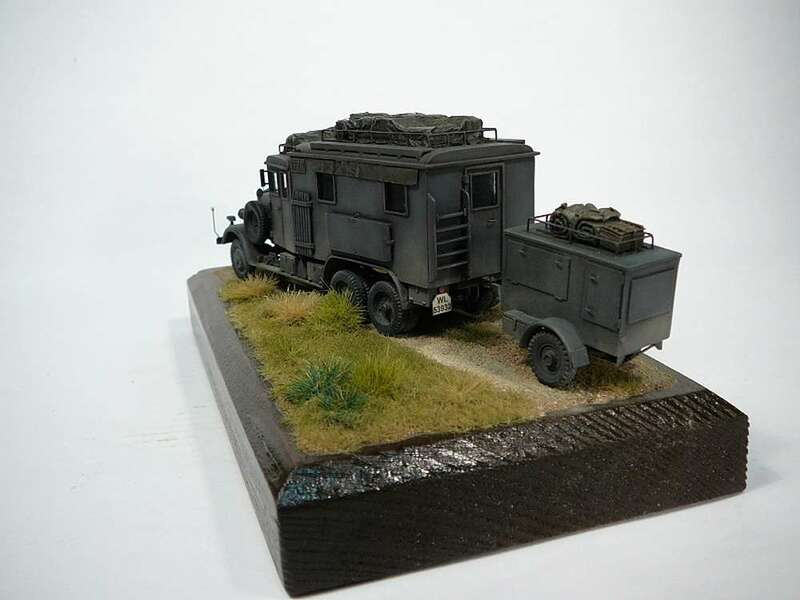 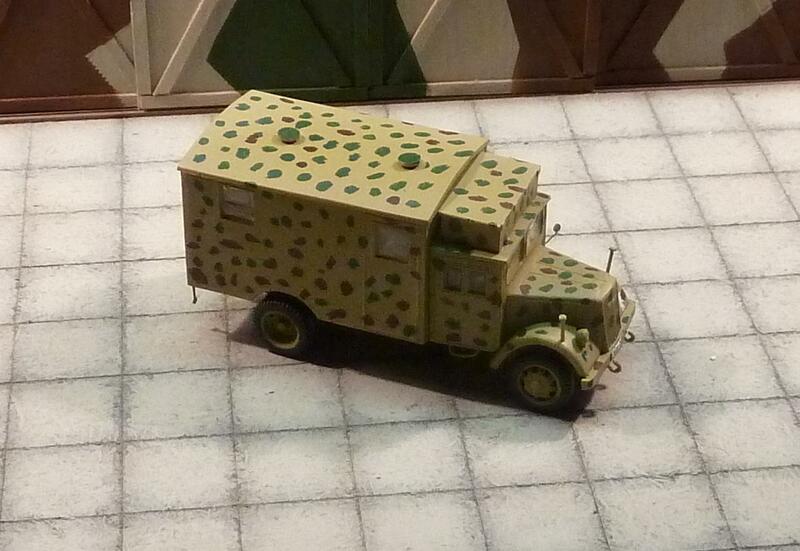 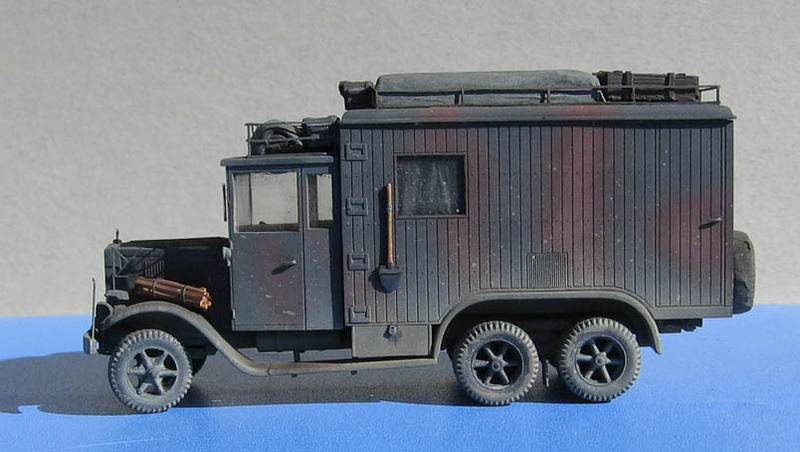 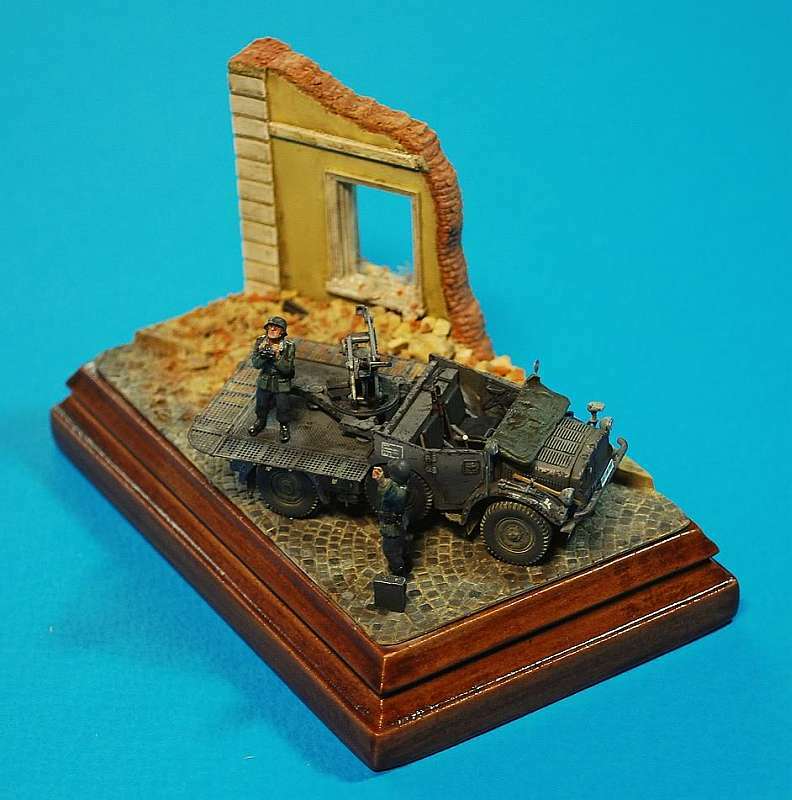 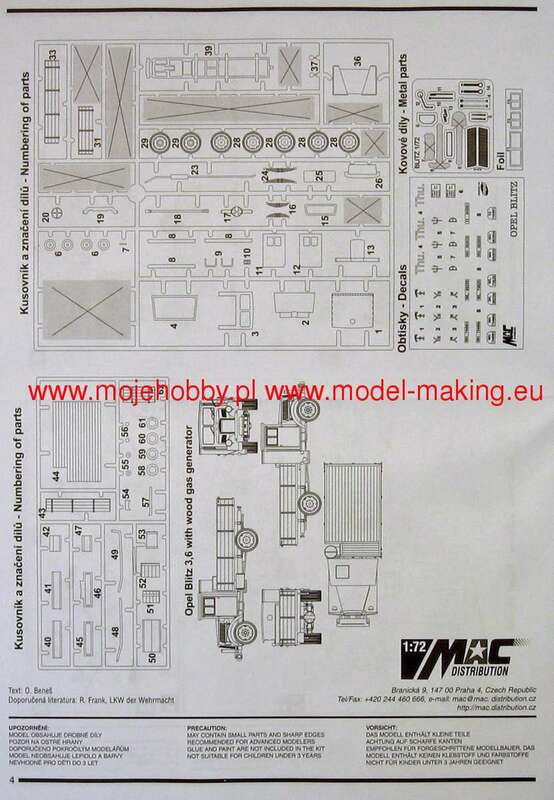 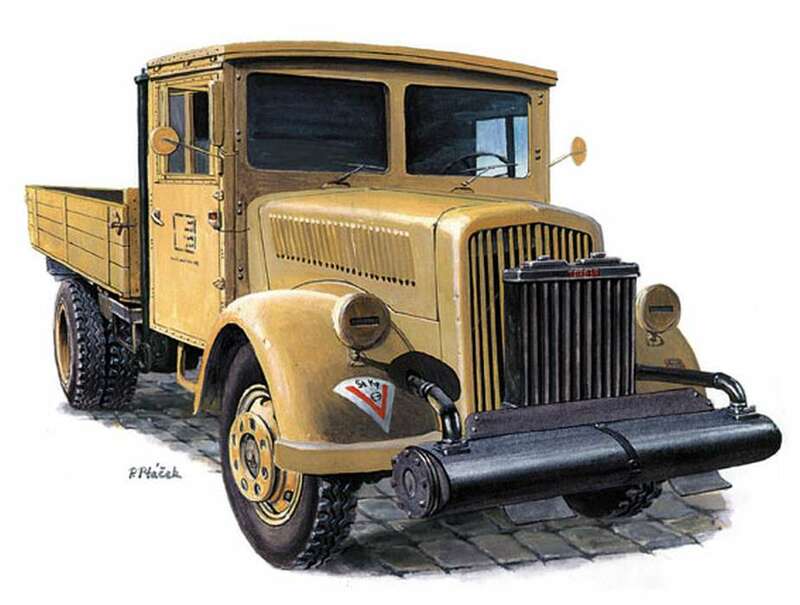 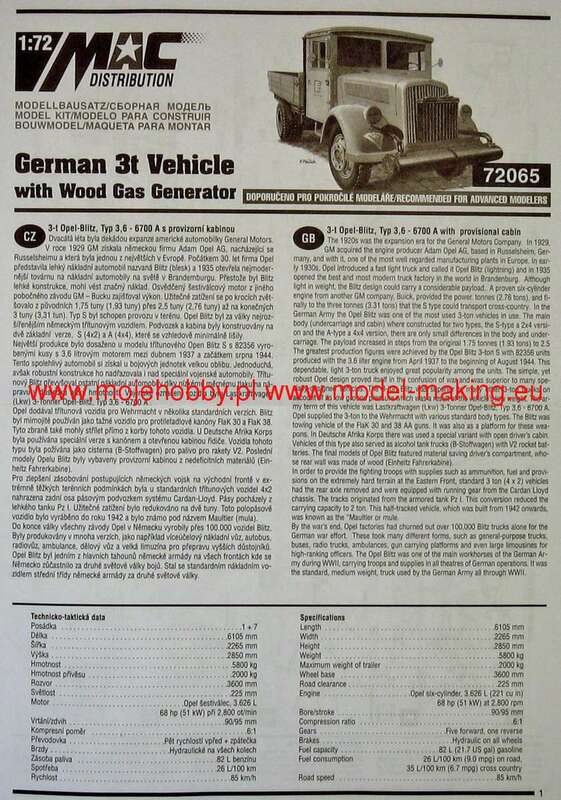 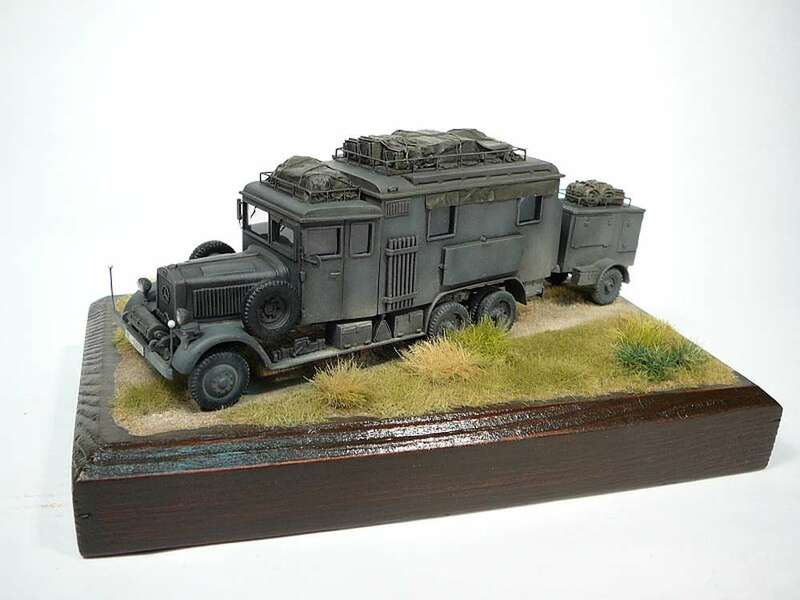 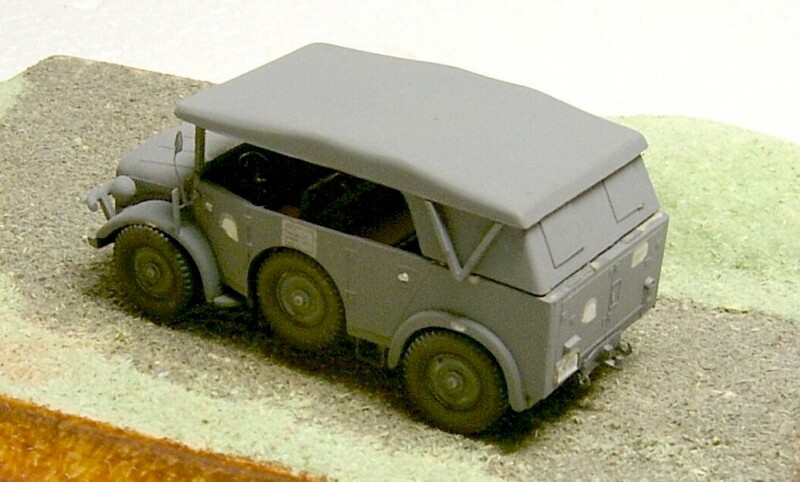 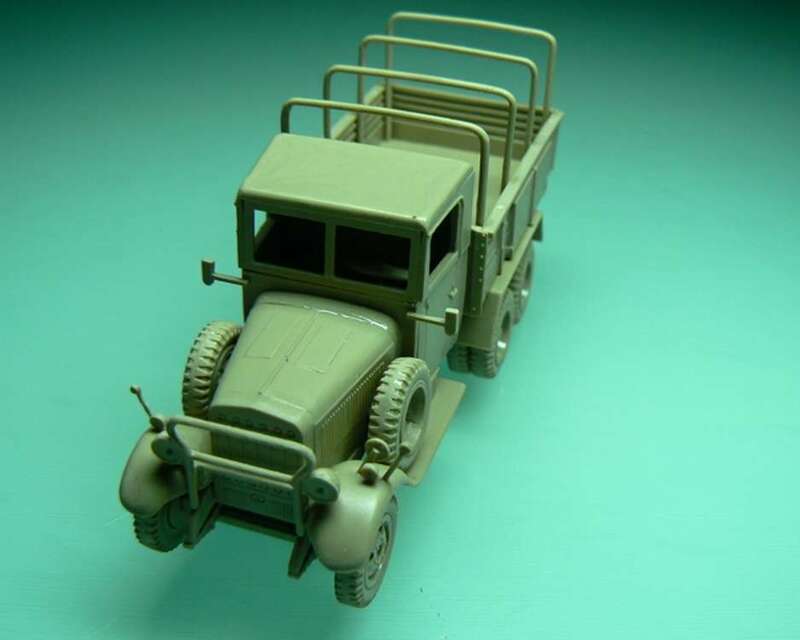 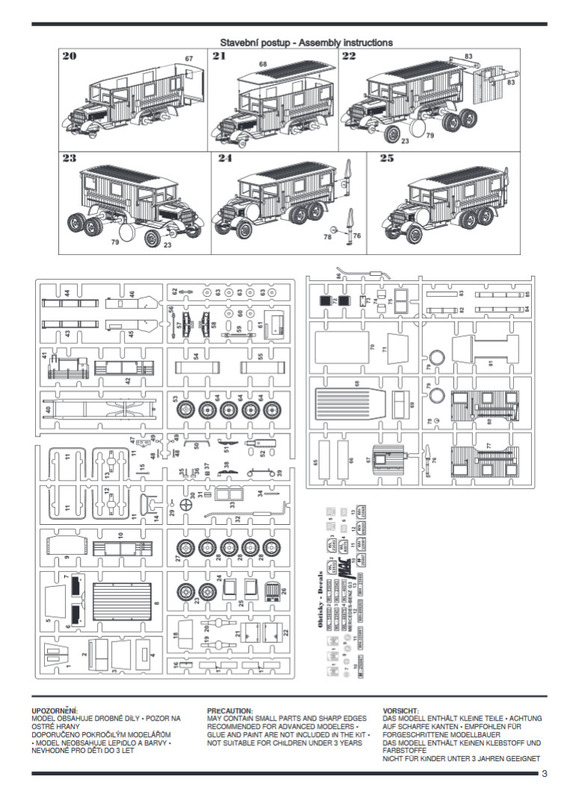 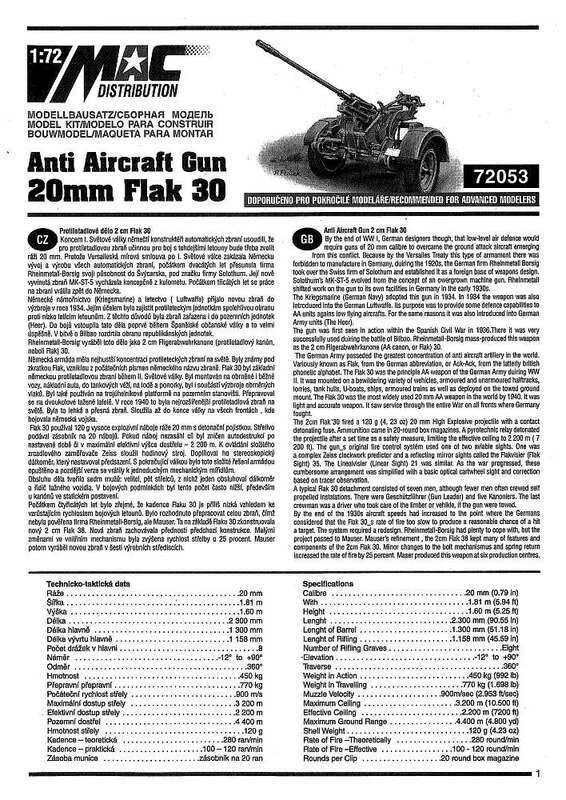 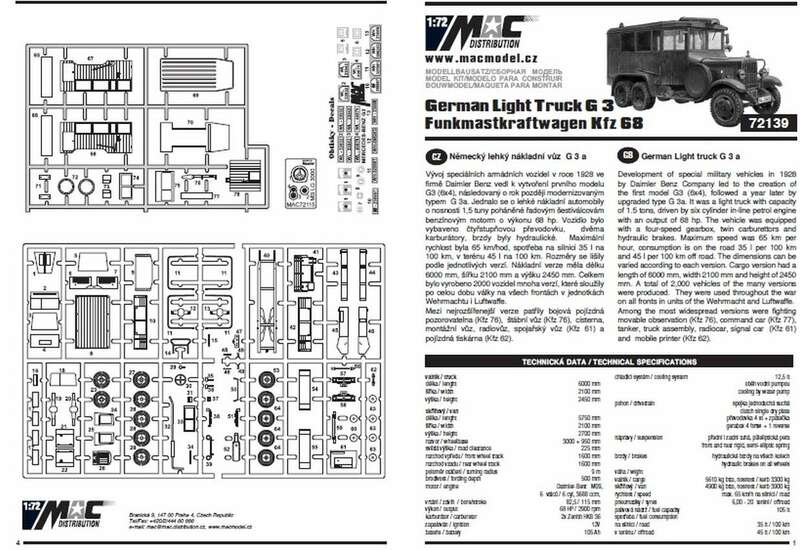 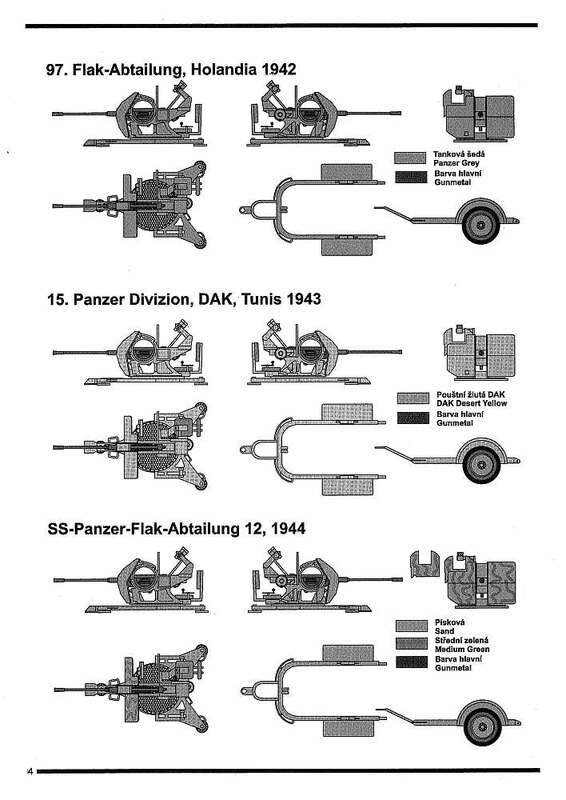 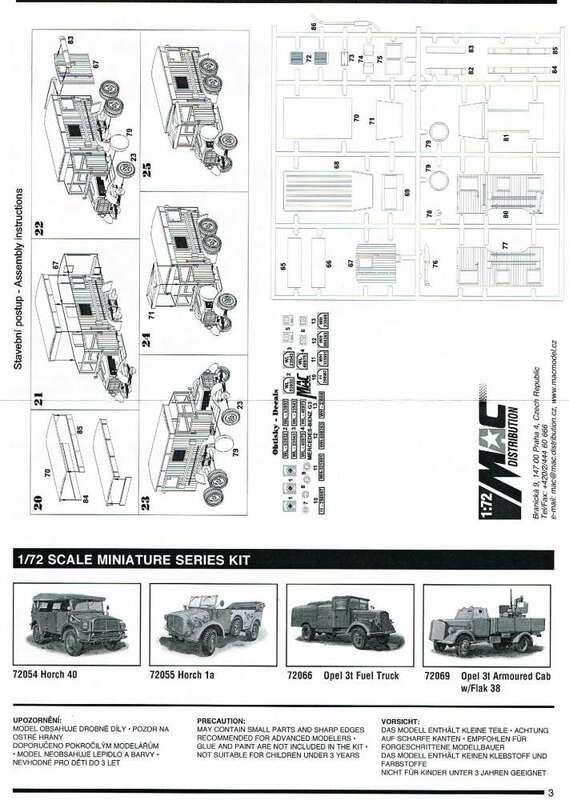 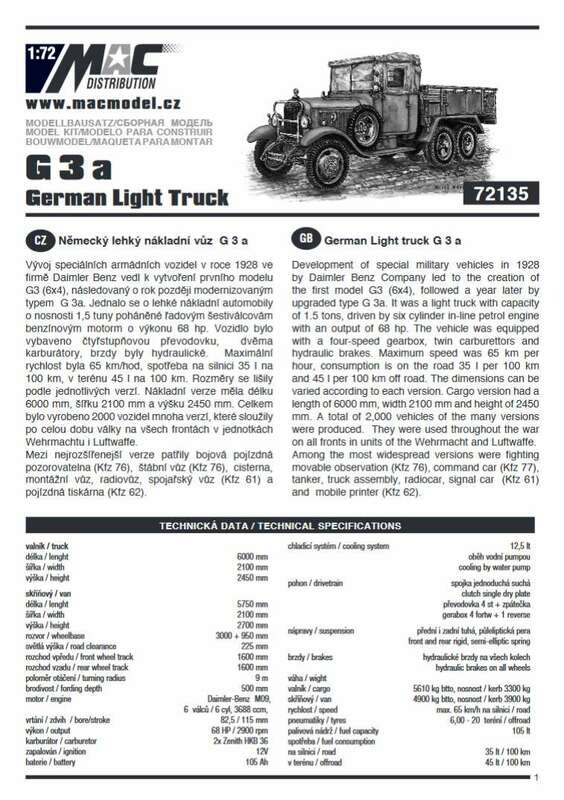 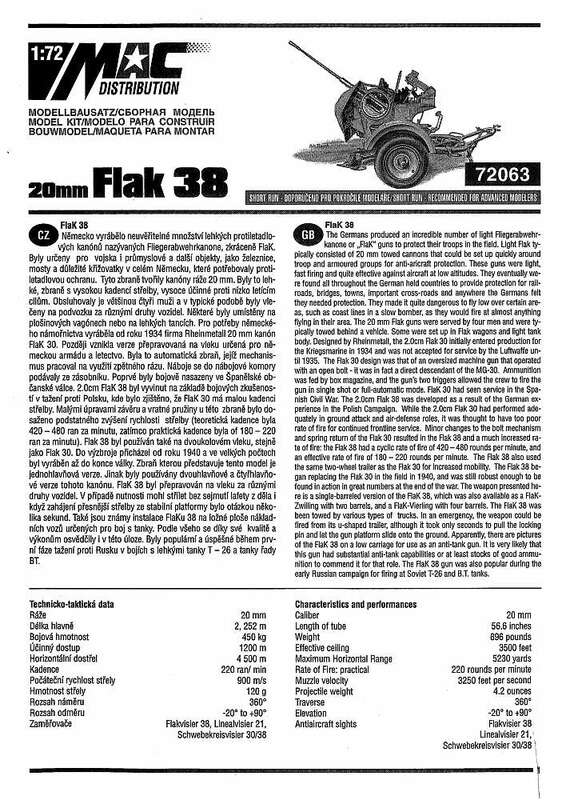 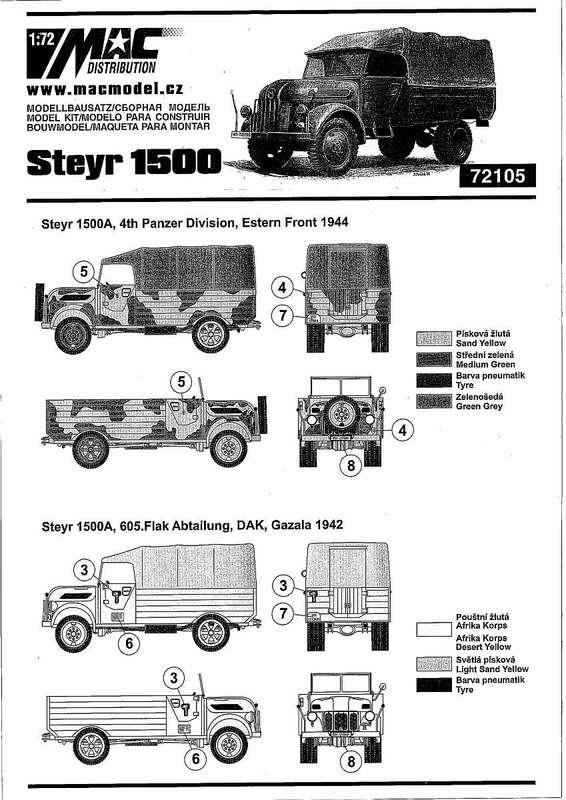 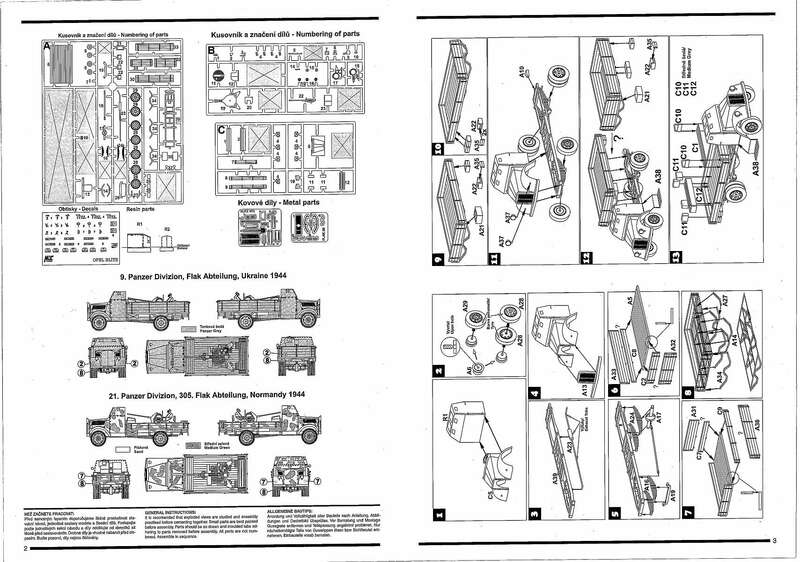 Mac's 'new' release consists of the 20mm Flak 30 and the Horch 108 Kfz 70 (which is not available as a separate kit). 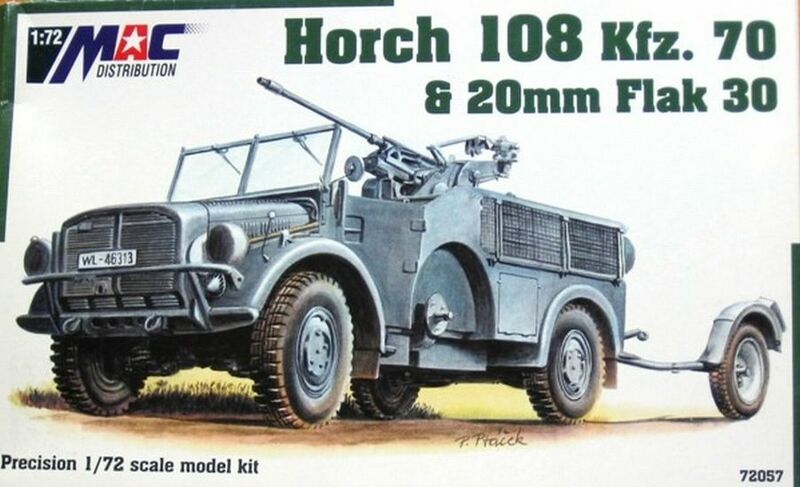 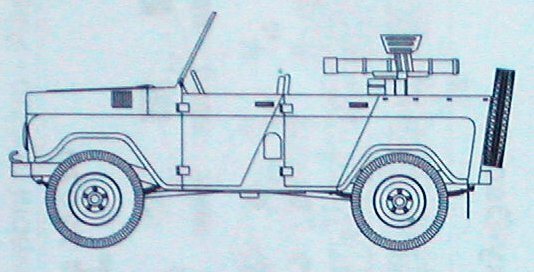 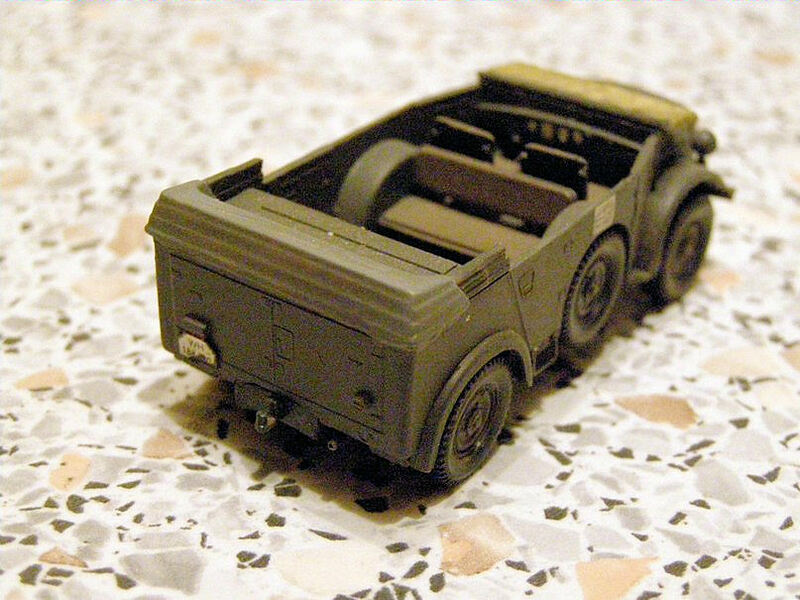 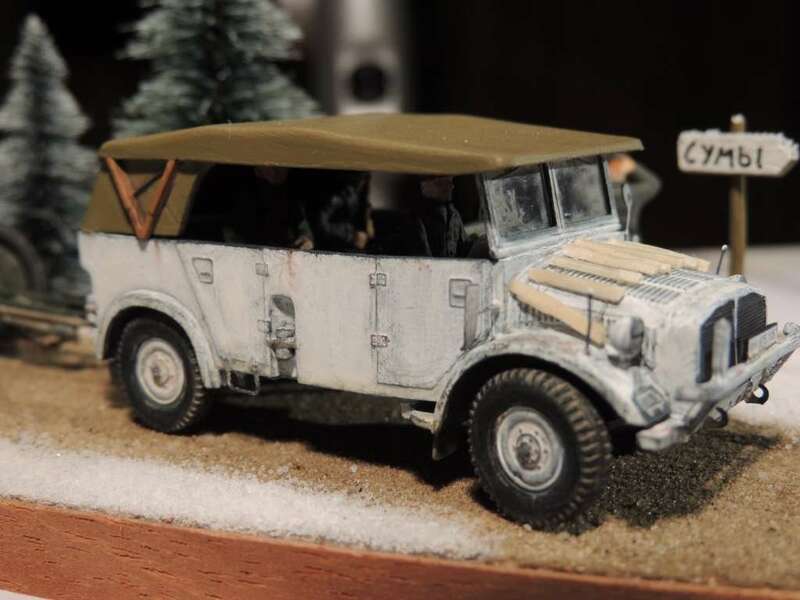 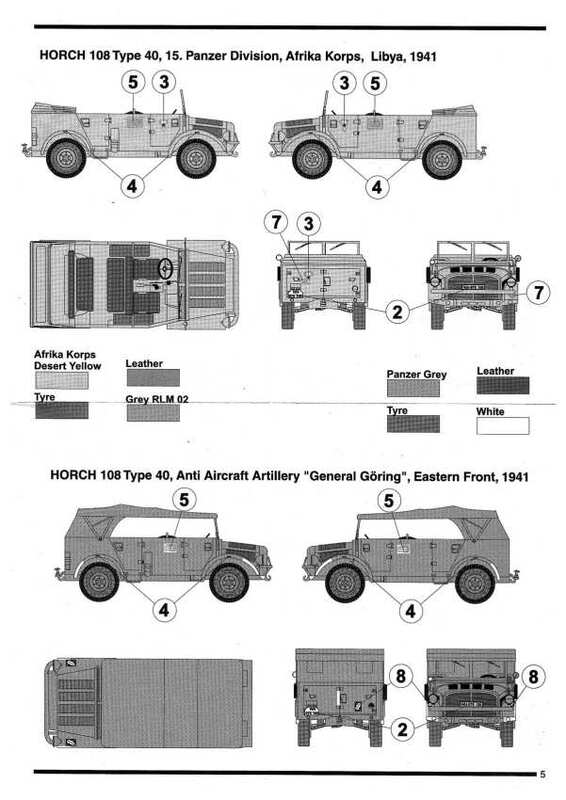 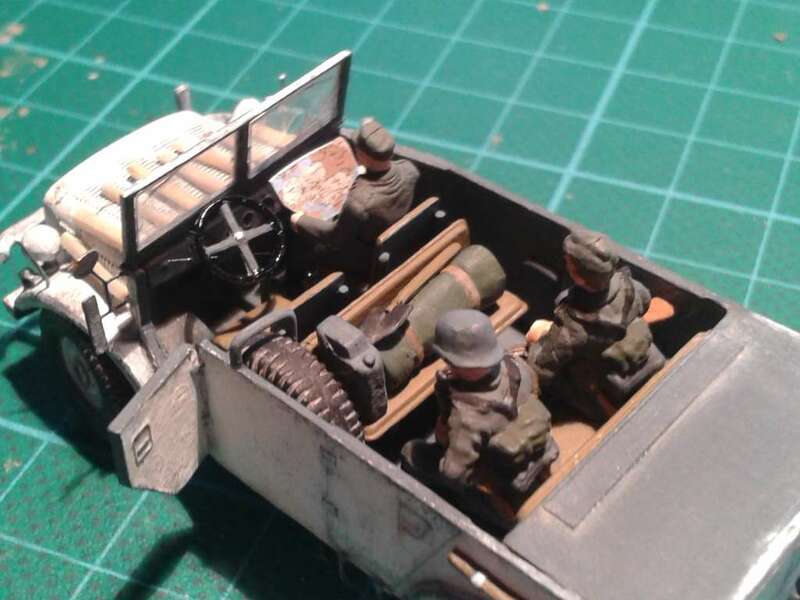 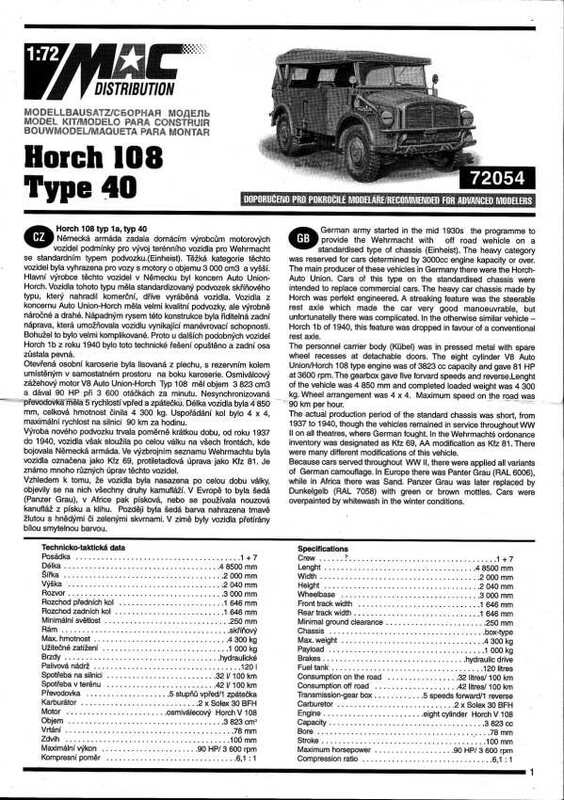 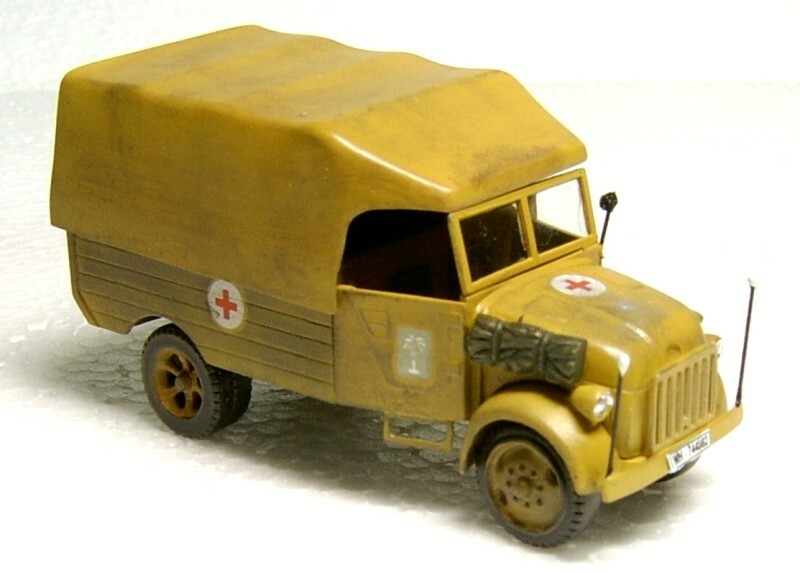 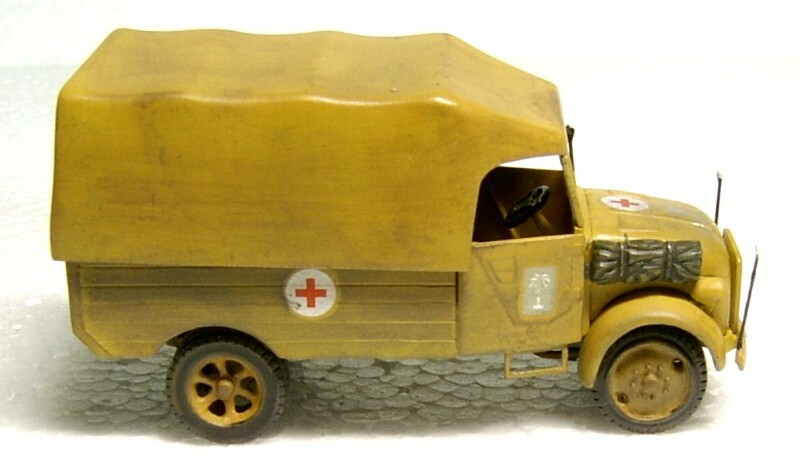 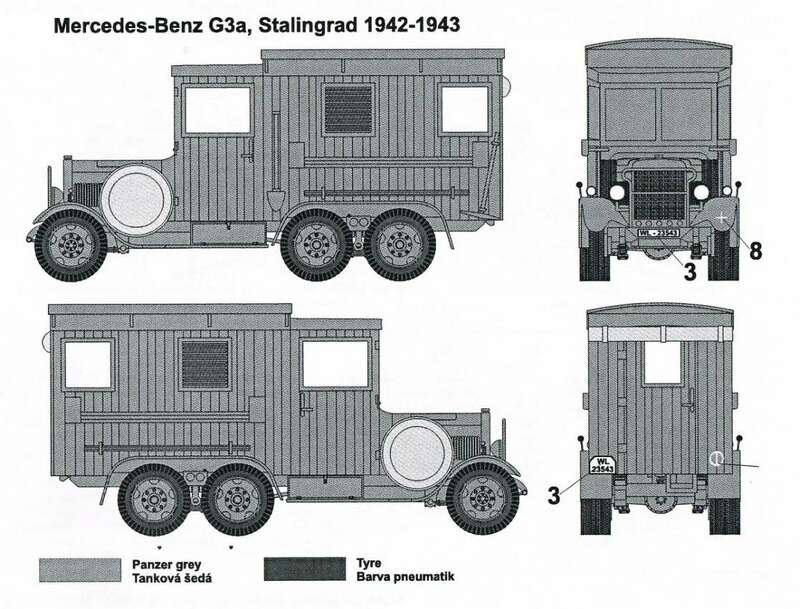 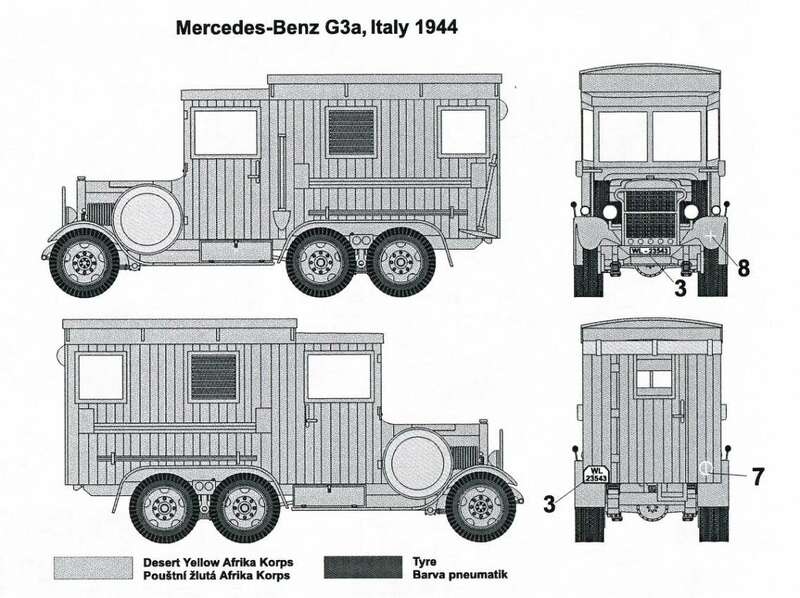 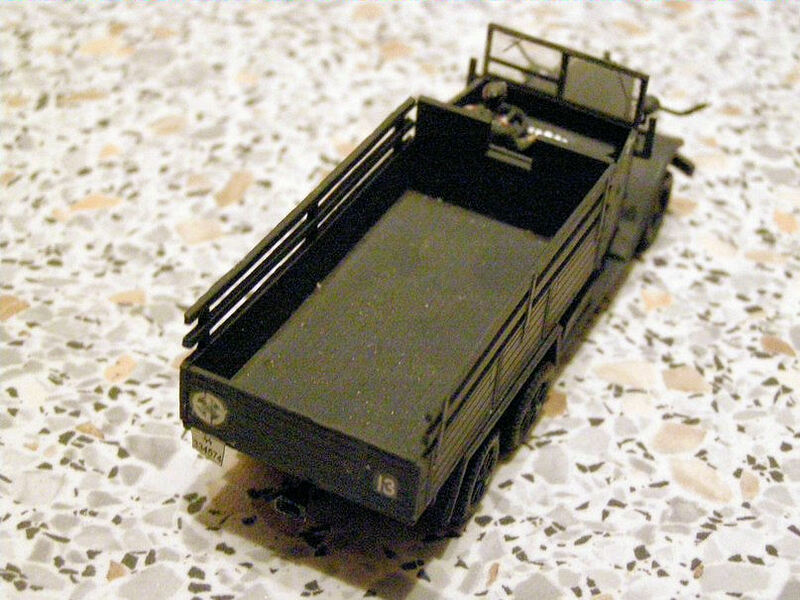 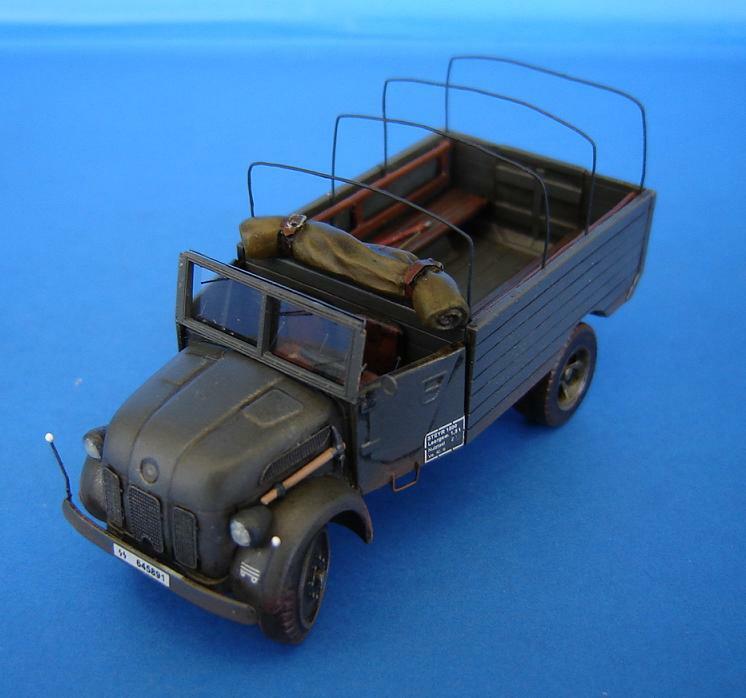 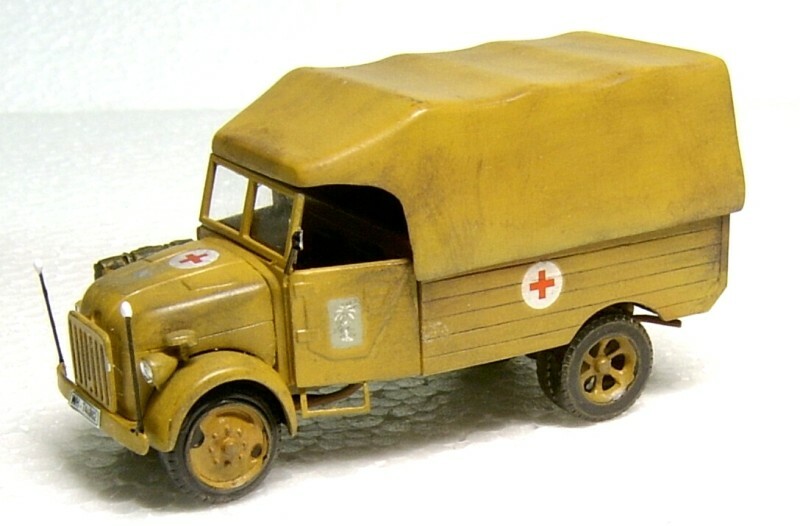 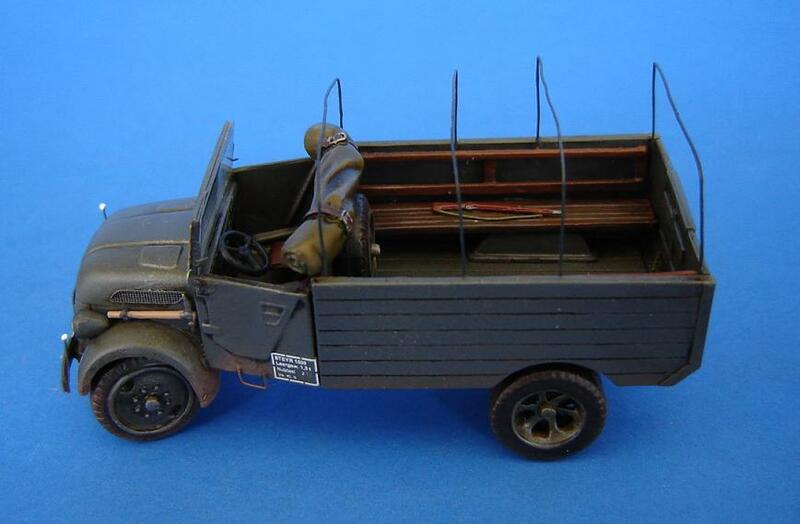 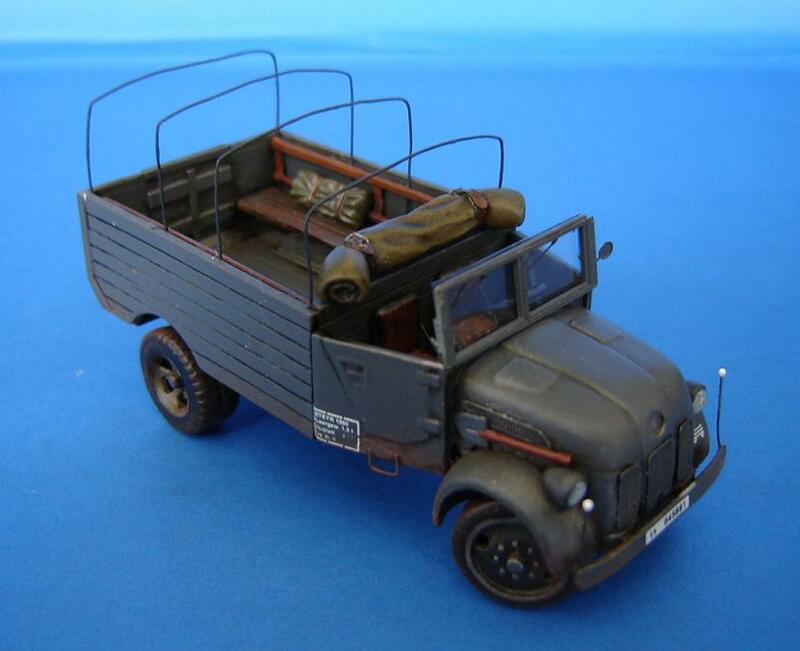 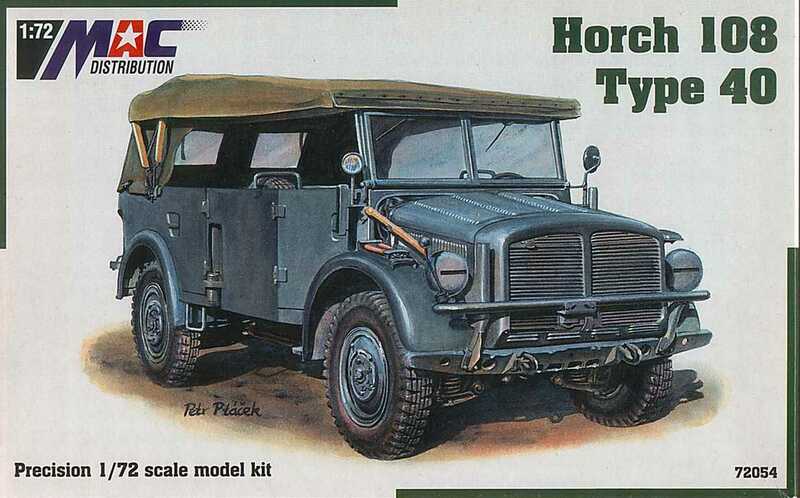 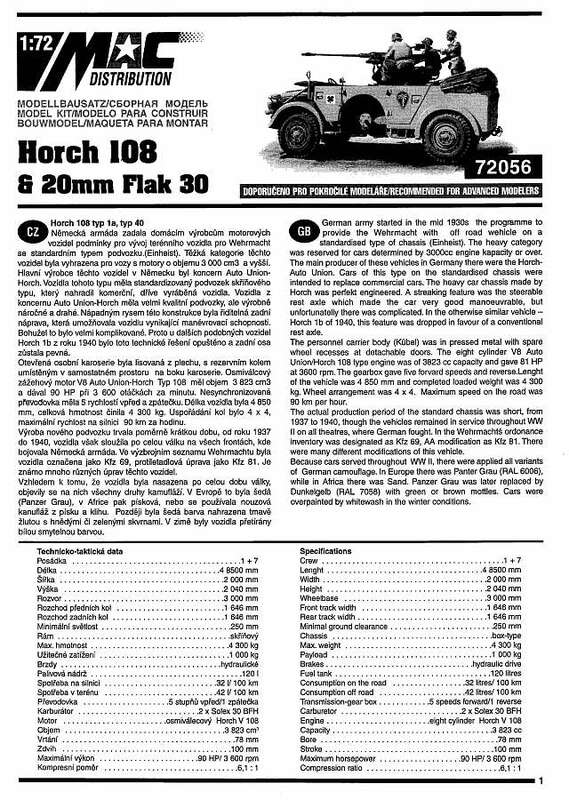 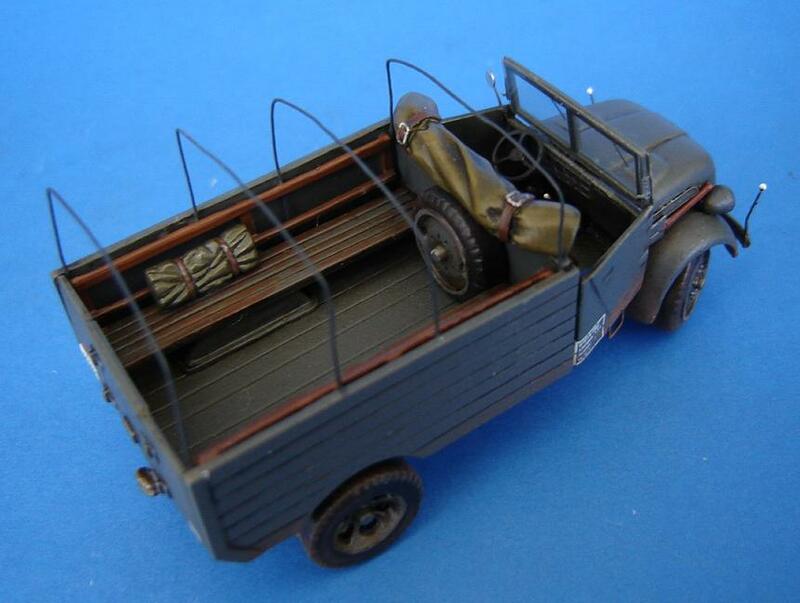 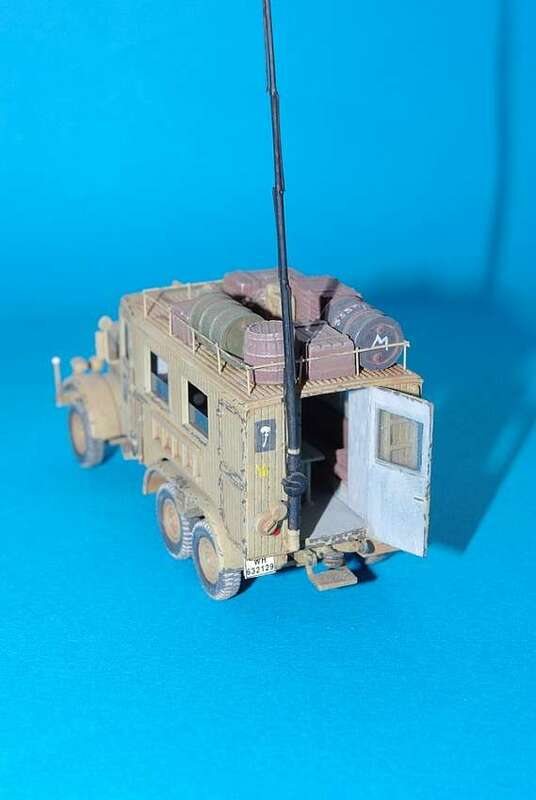 This version of the Horch is virtually the same as the type 1a except the gun is mounted in the back, replacing the rear seats...and instead of a folded canvas awning there are 'mesh' (but moulded in plastic, rather than photo etched) side screens. 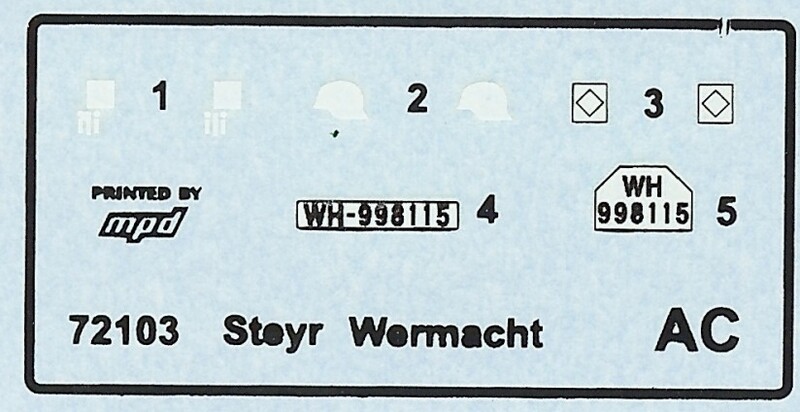 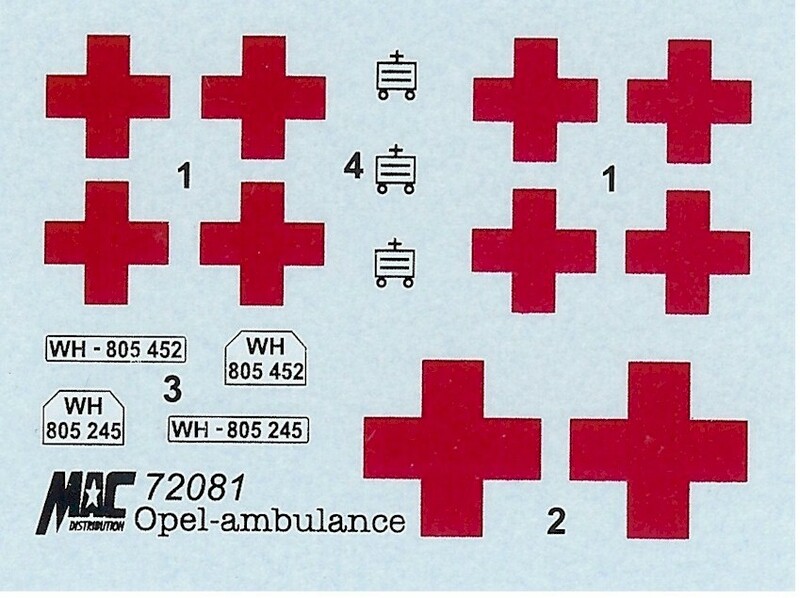 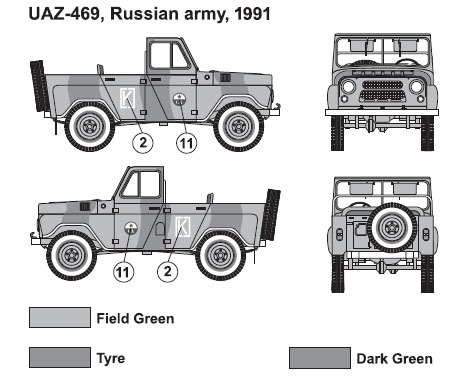 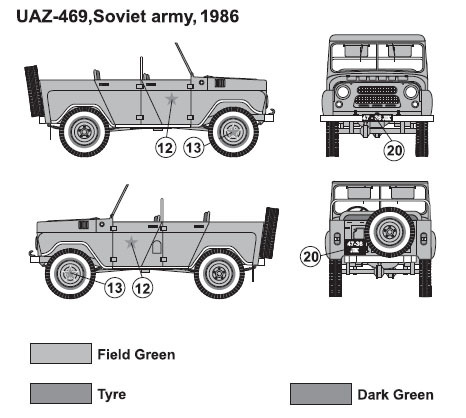 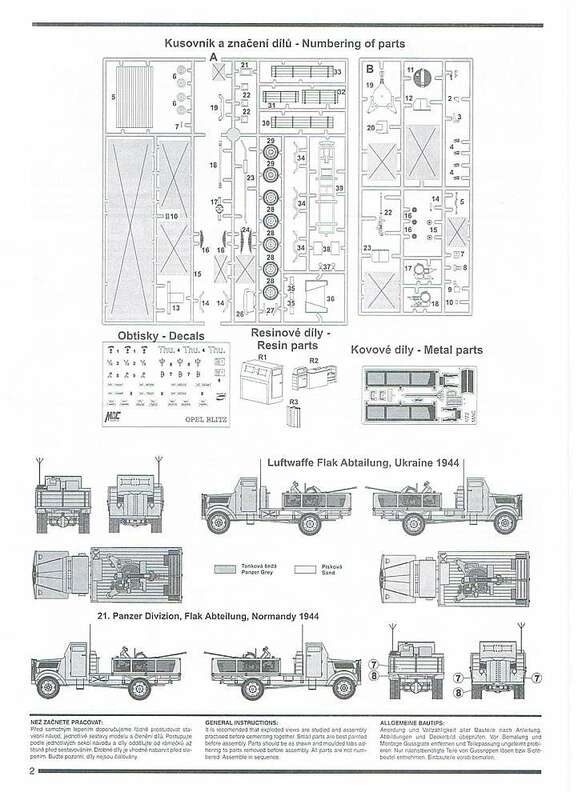 In all, there are 82 crisp, clean injection moulded parts, two small photoetched frets and a set of decals with markings for two vehicles. 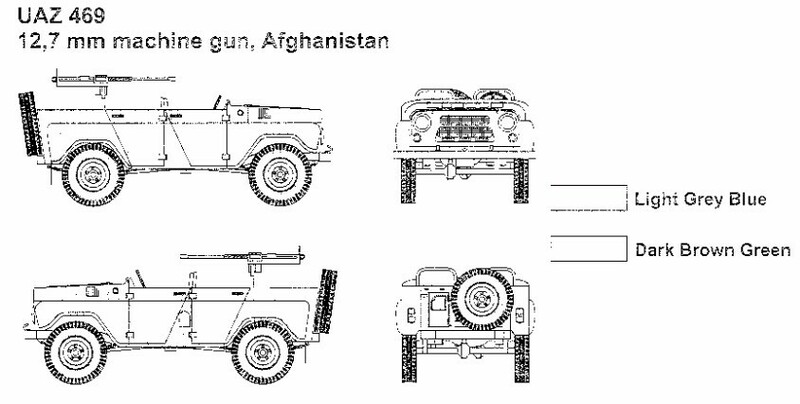 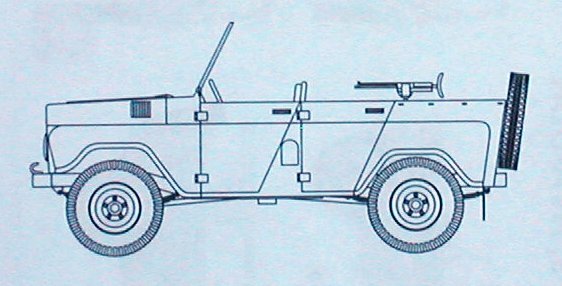 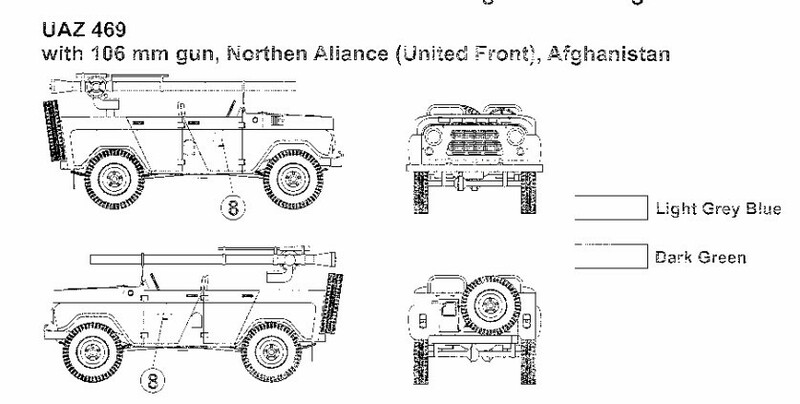 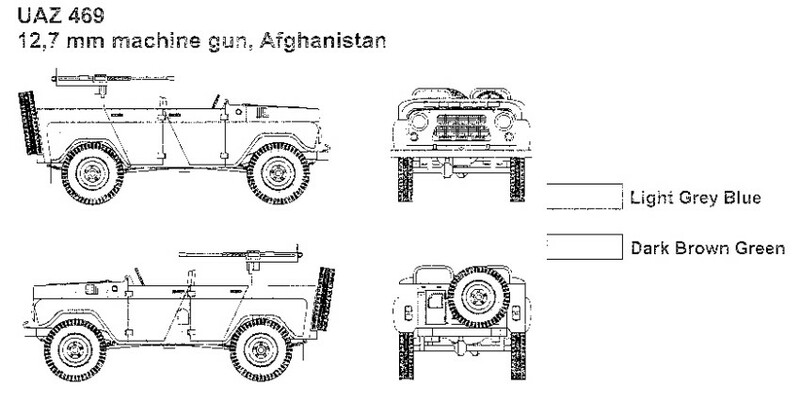 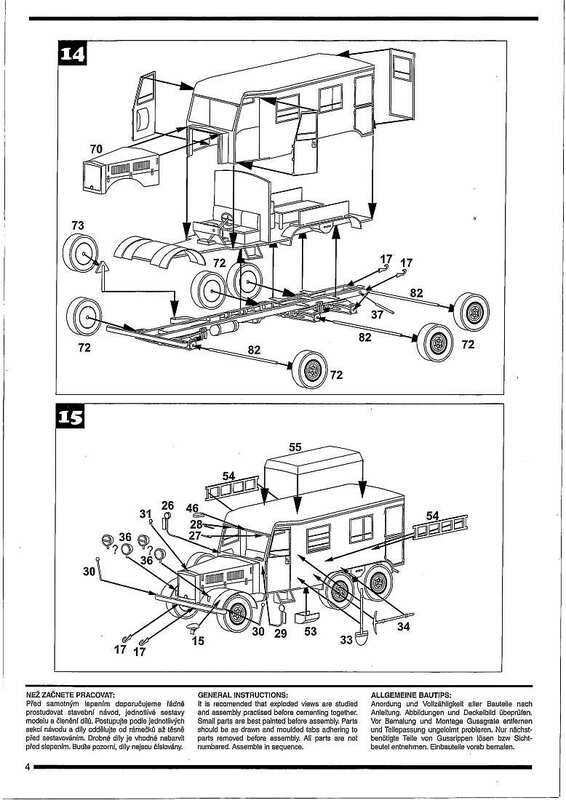 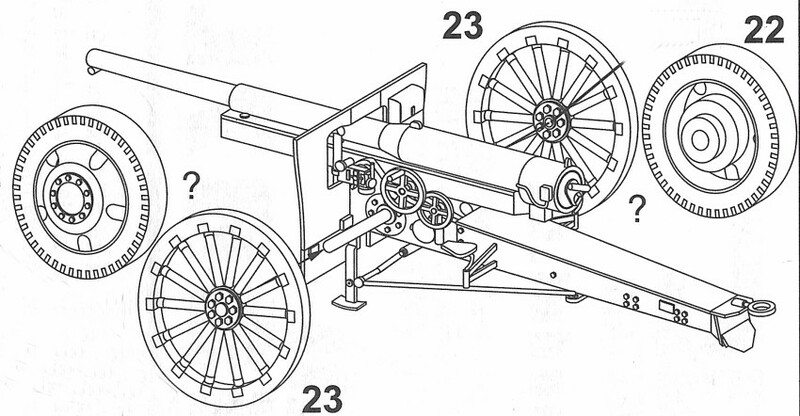 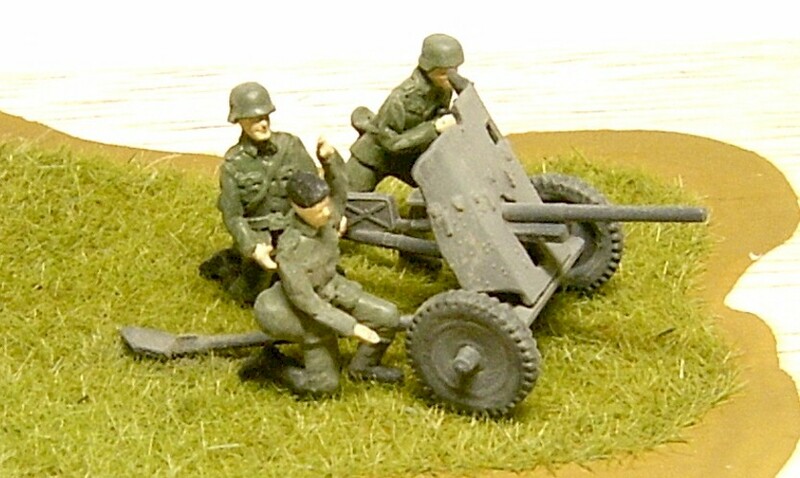 Options include mounting the gun facing the front, facing the rear, side screens up or down ... or even leaving the gun on the trailer. 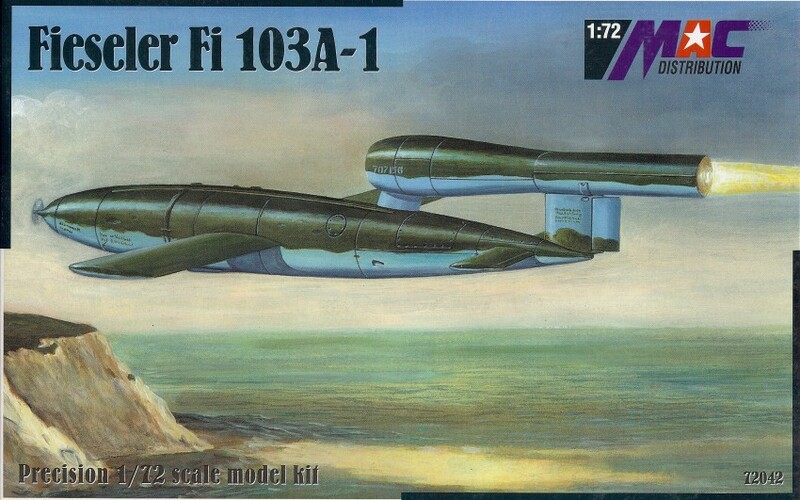 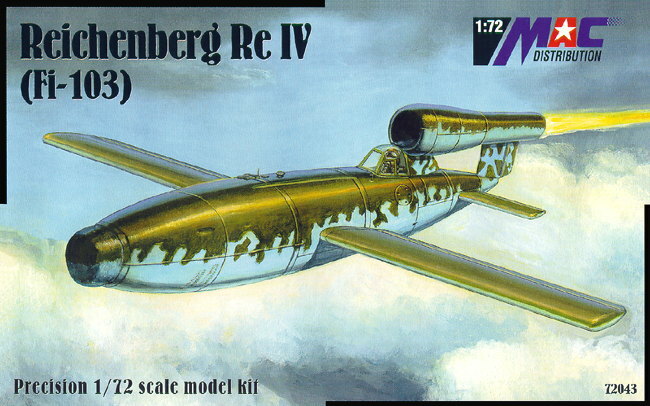 Fieseler FI 103A / V1 Rocket A nice little kit, but bloody expensive for a 1/72 V-1...even if it is limited to 1890 copies (I wonder who came up with that number, rather than 2000...?). 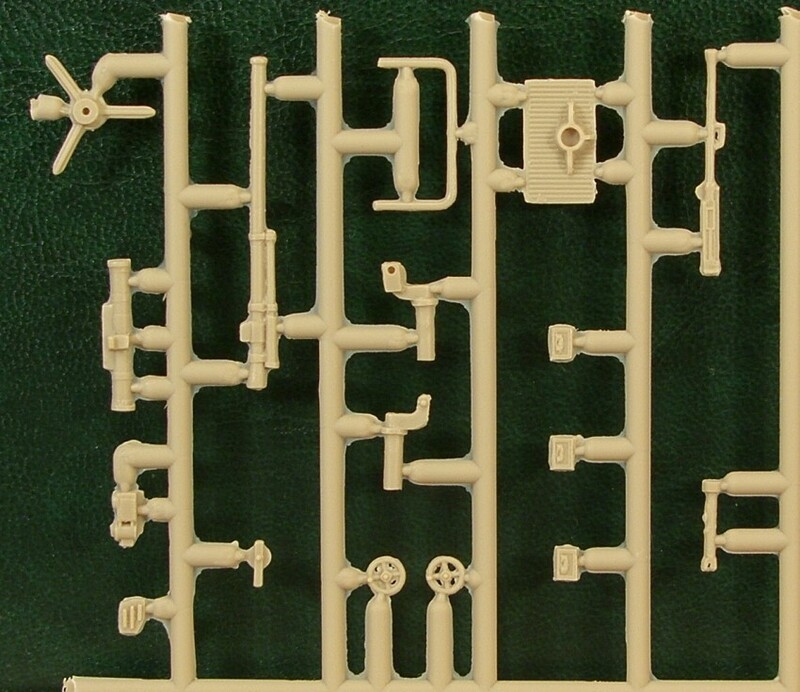 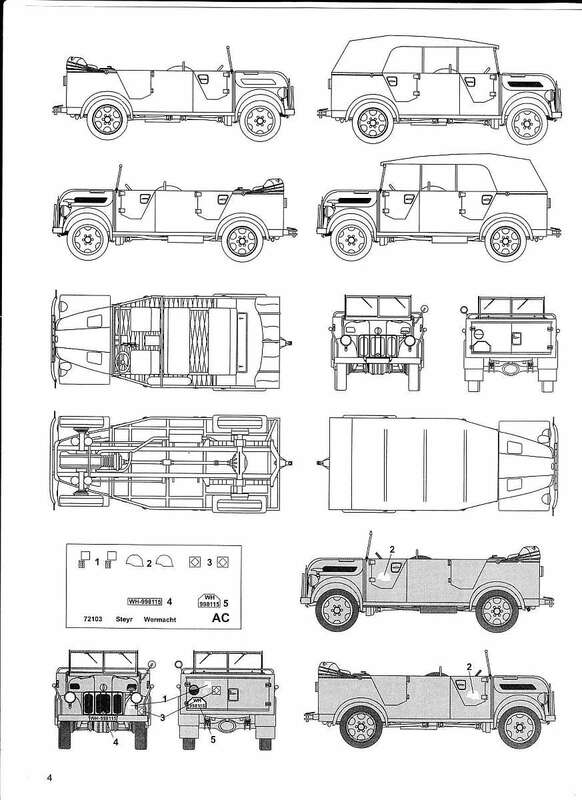 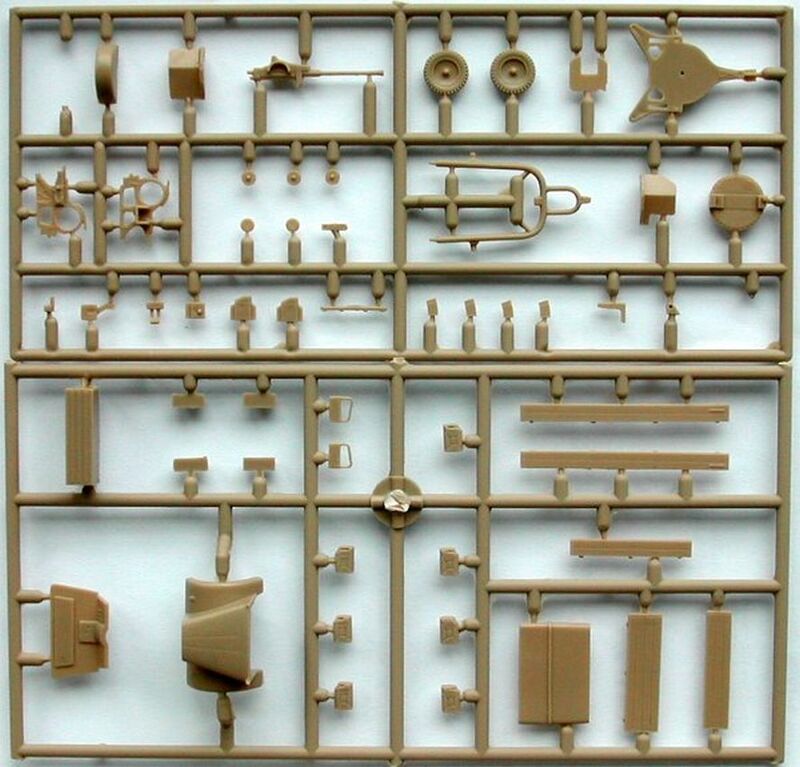 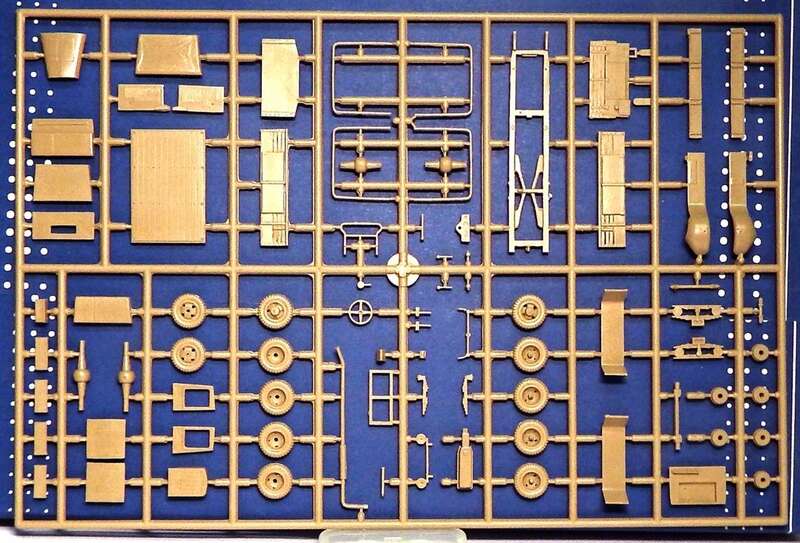 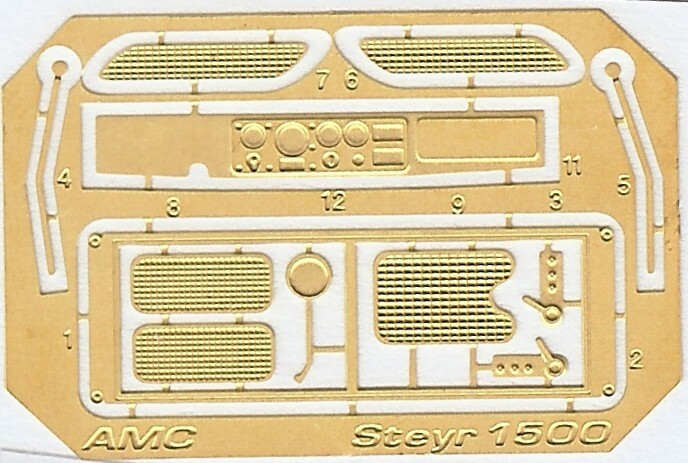 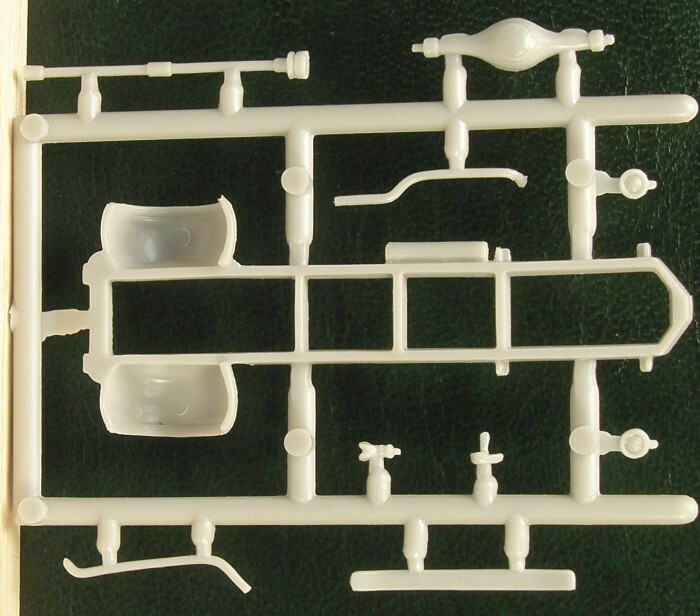 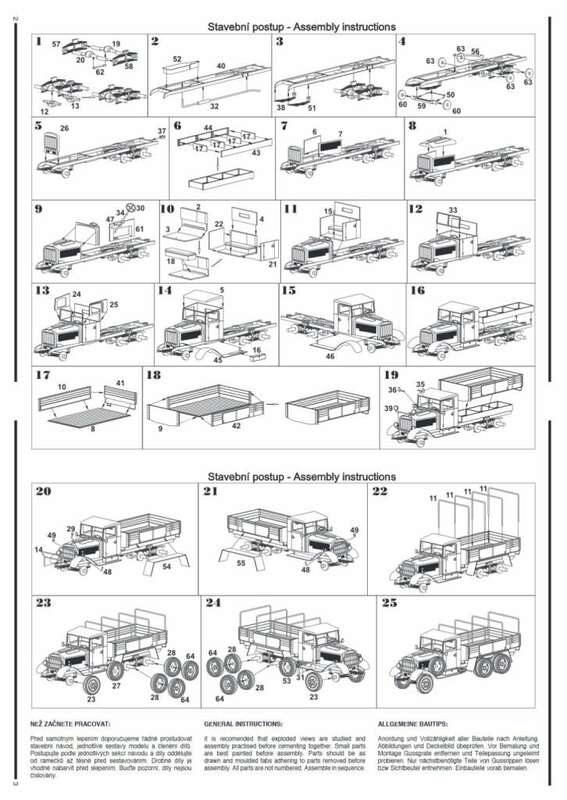 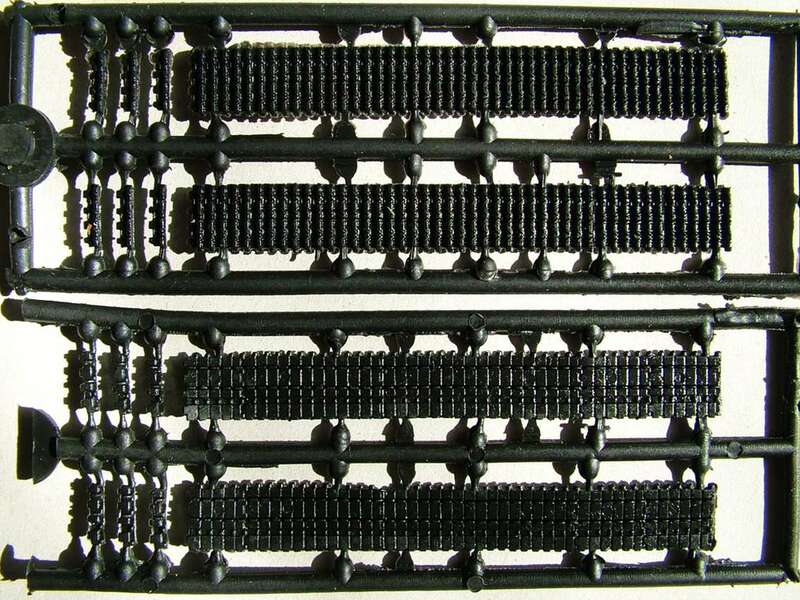 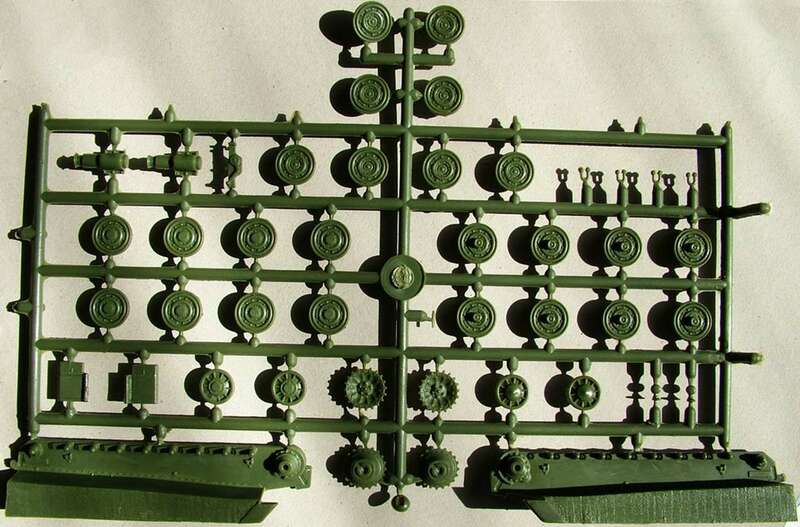 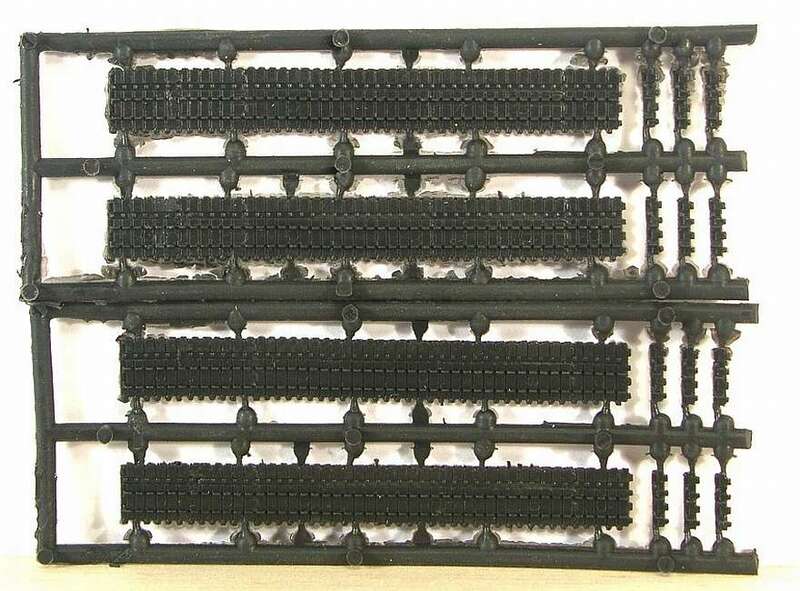 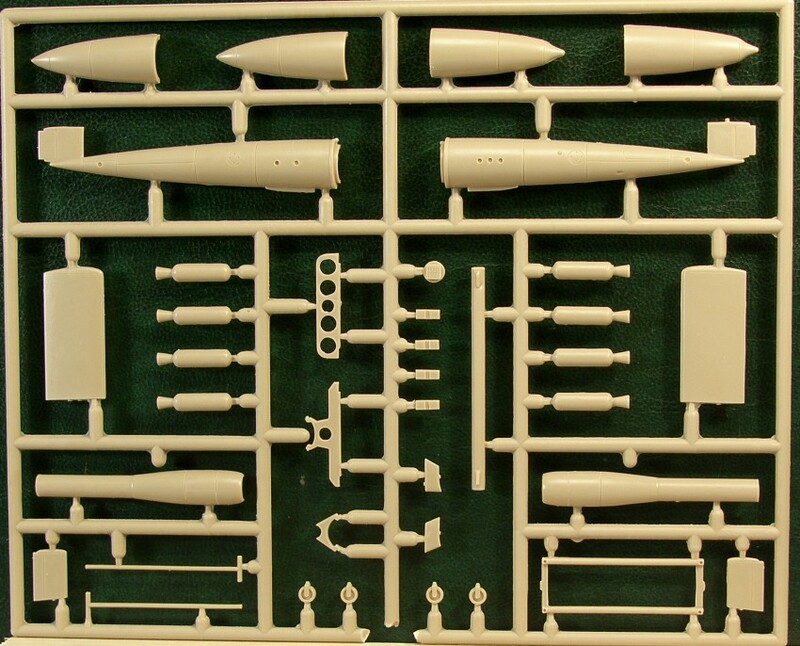 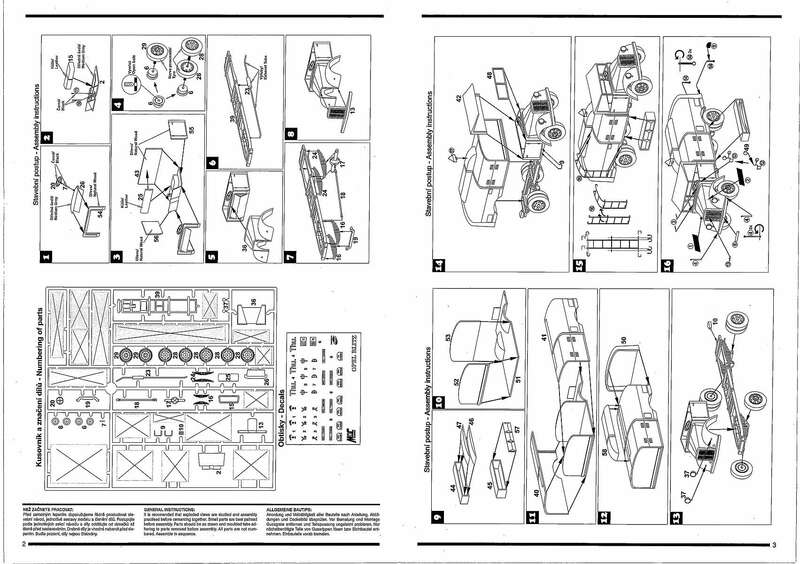 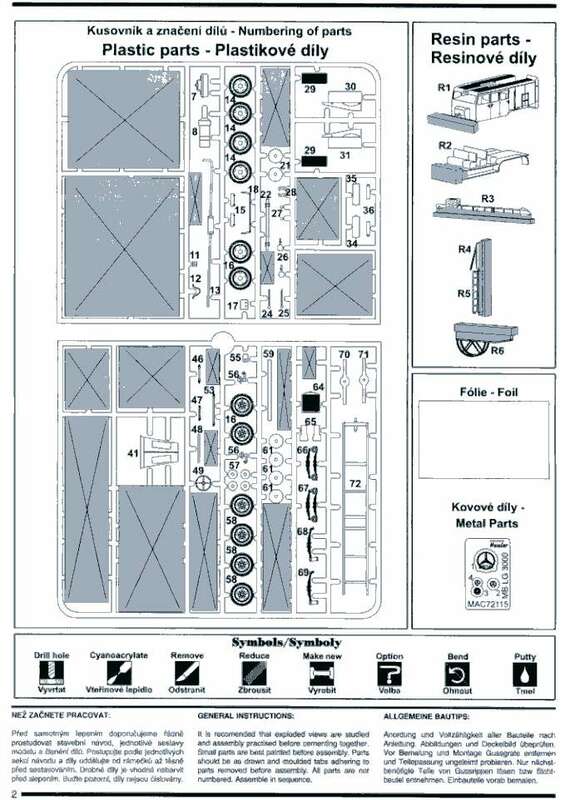 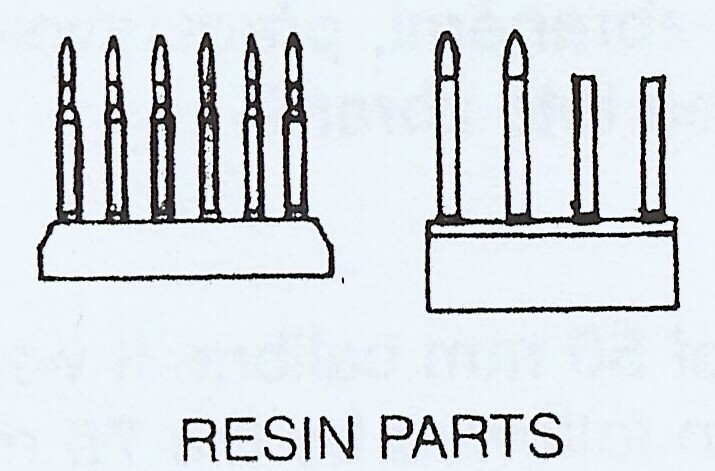 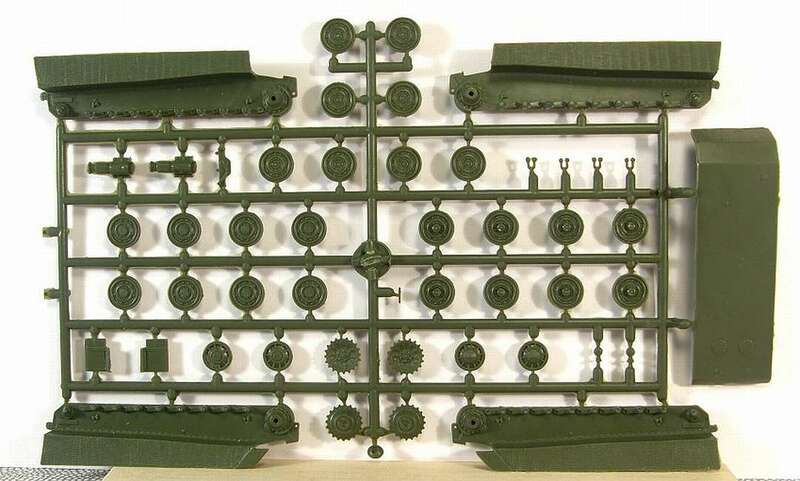 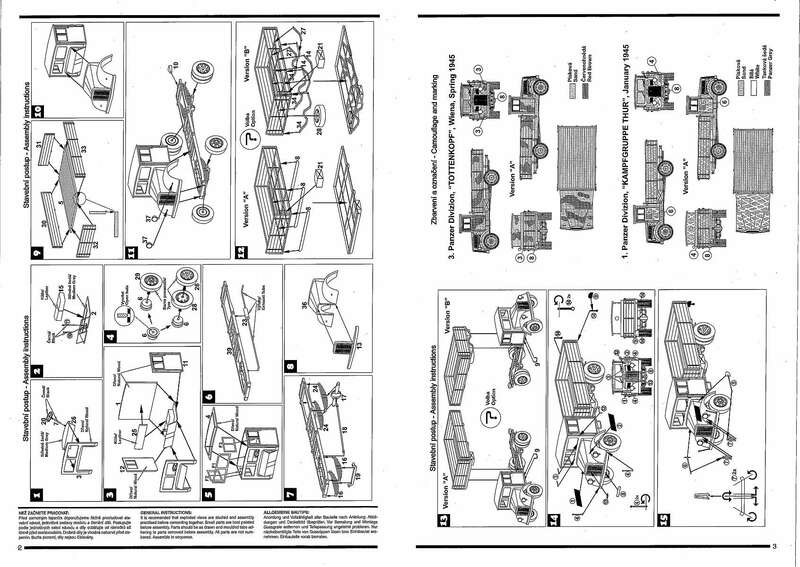 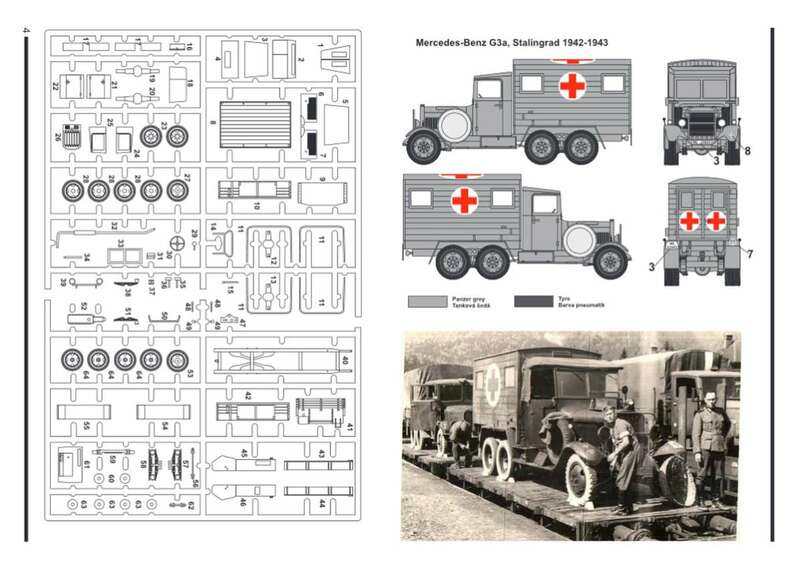 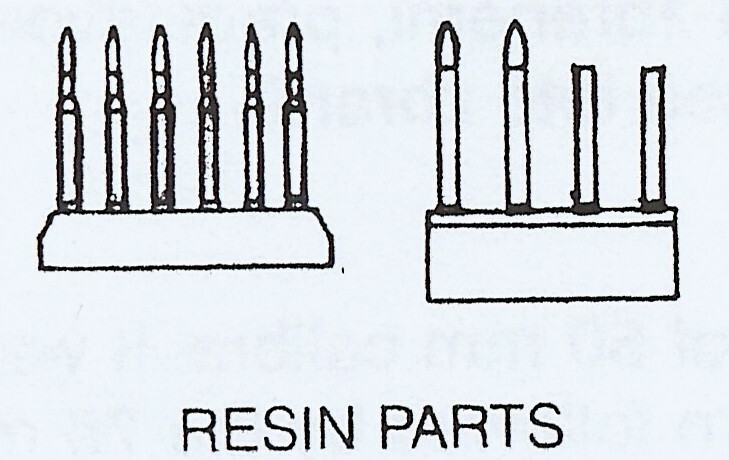 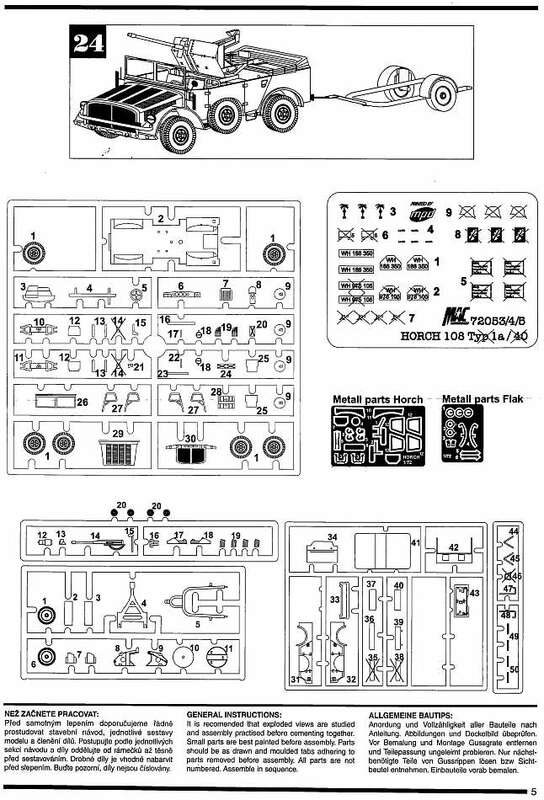 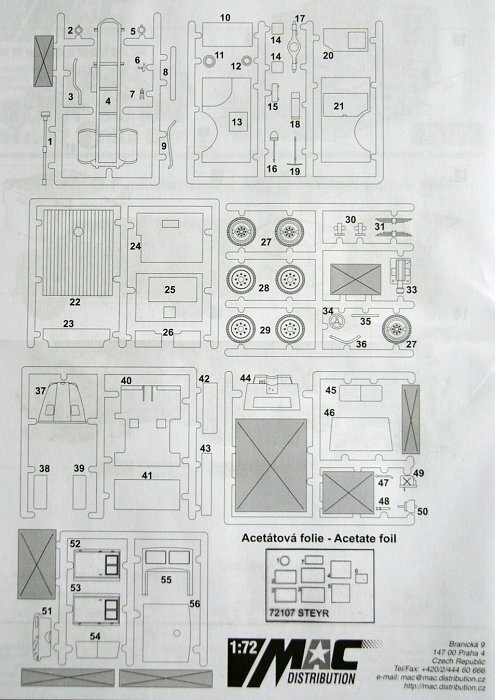 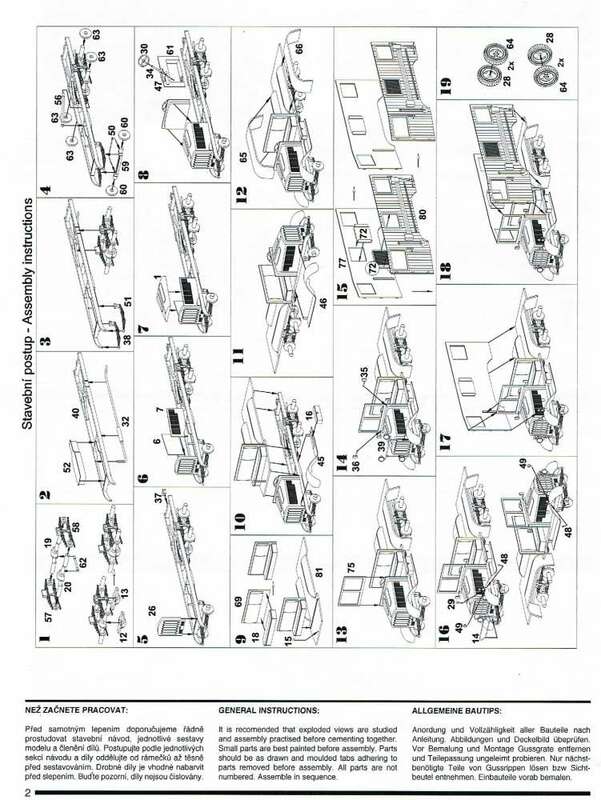 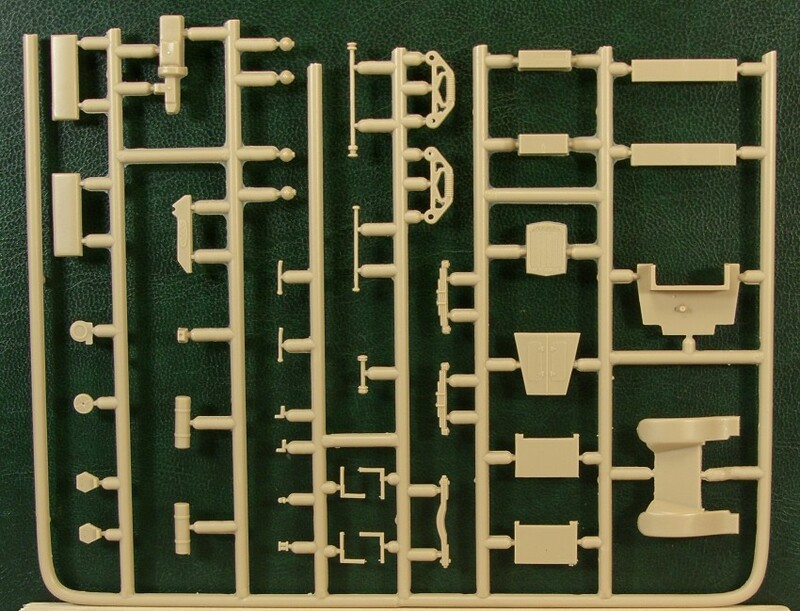 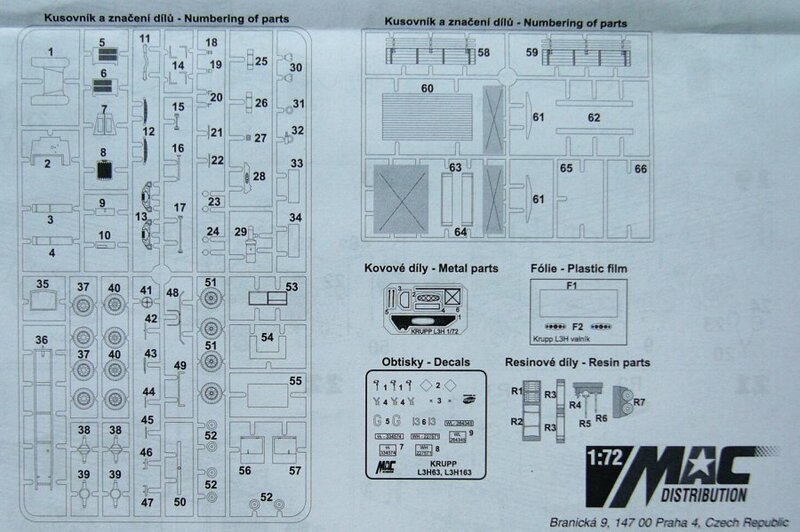 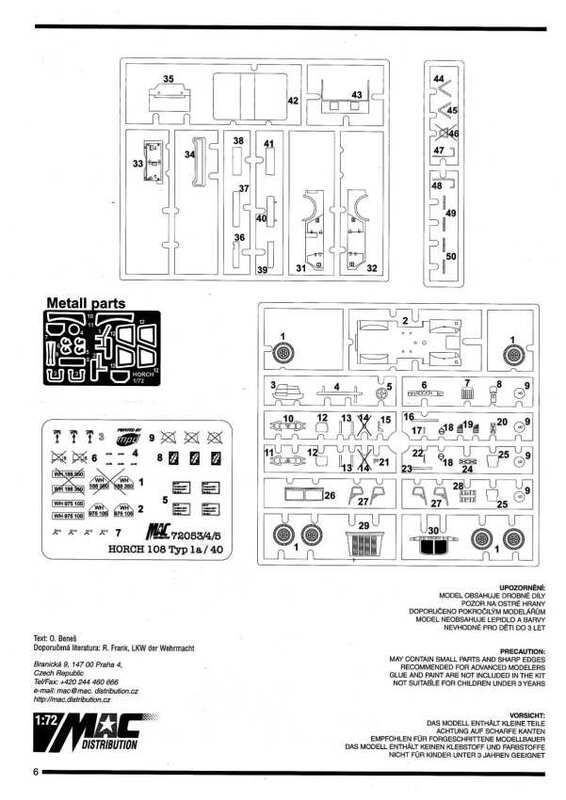 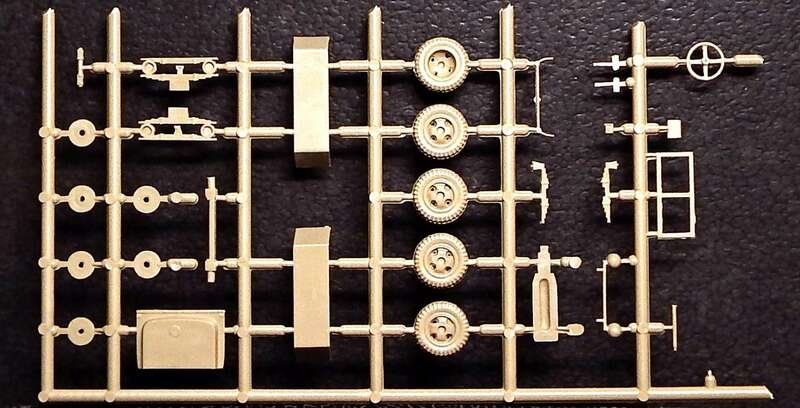 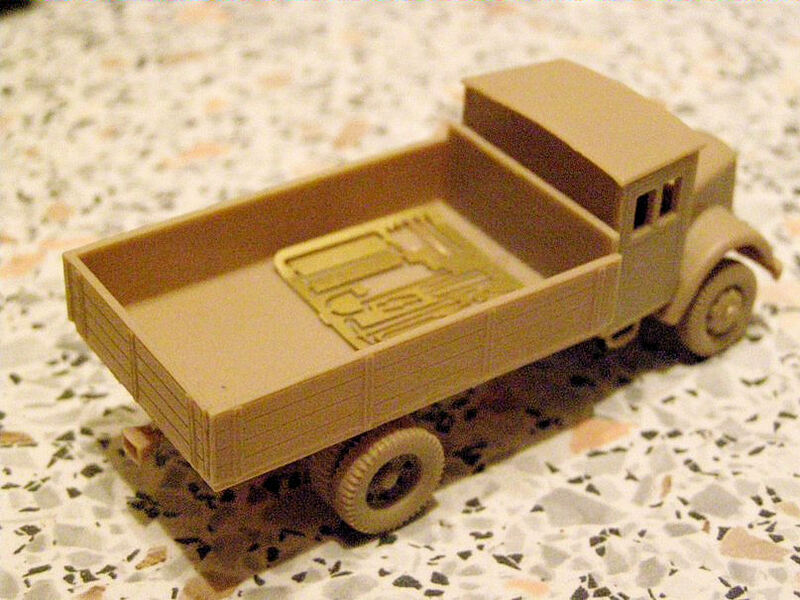 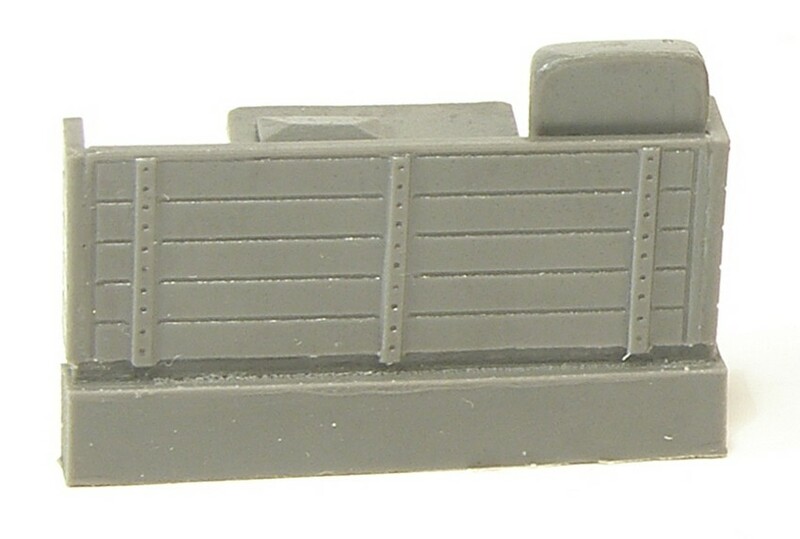 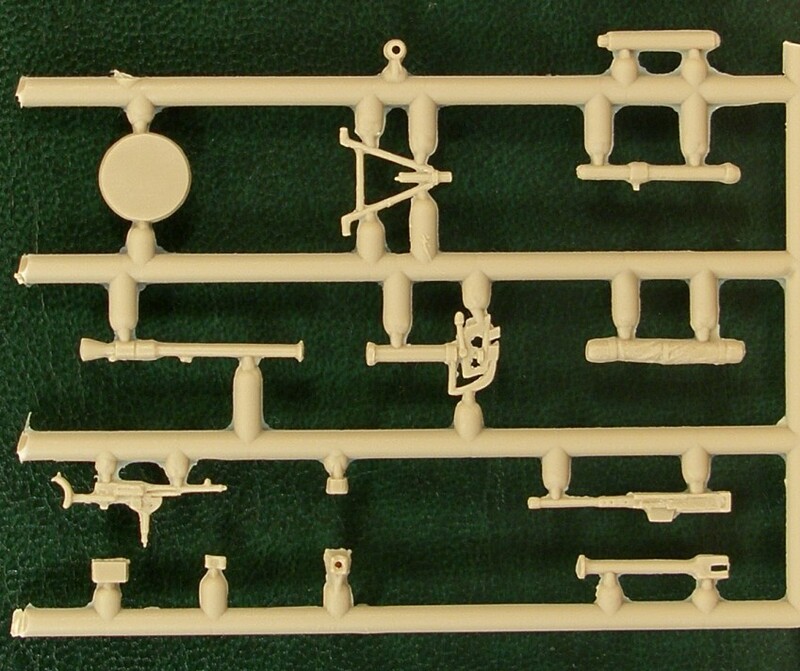 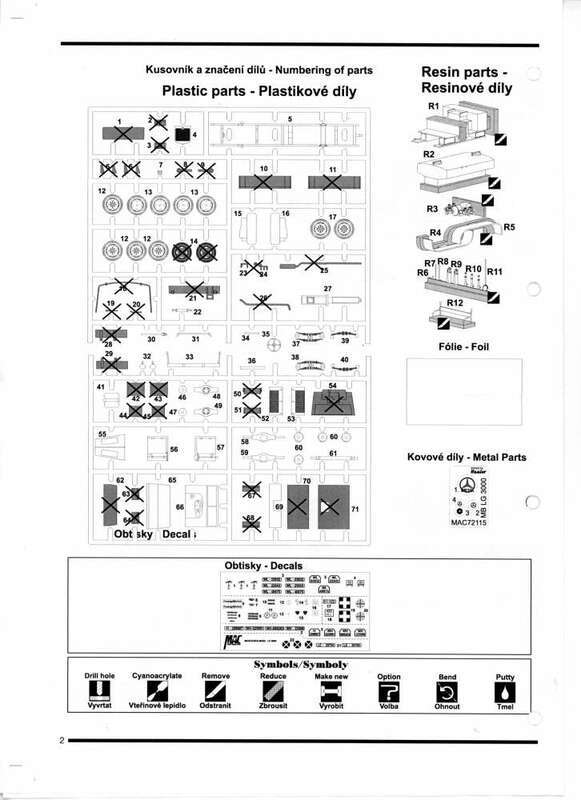 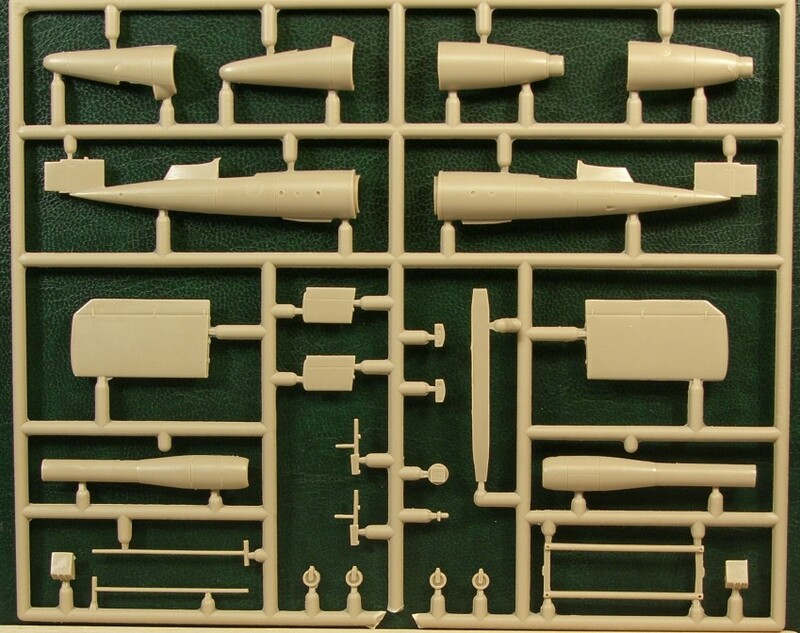 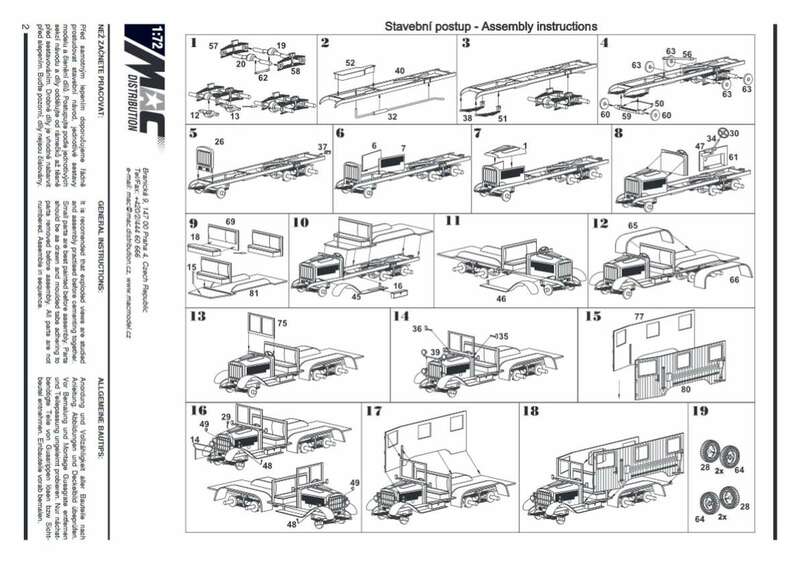 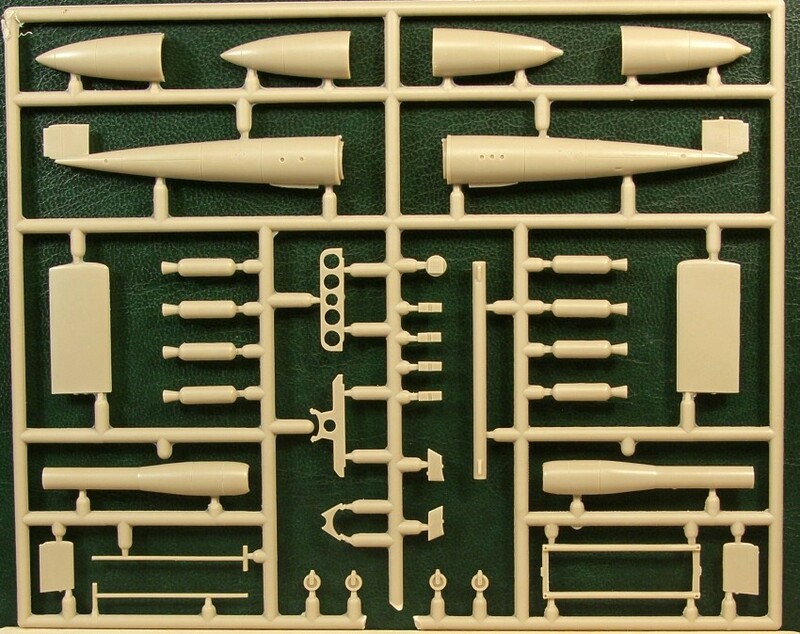 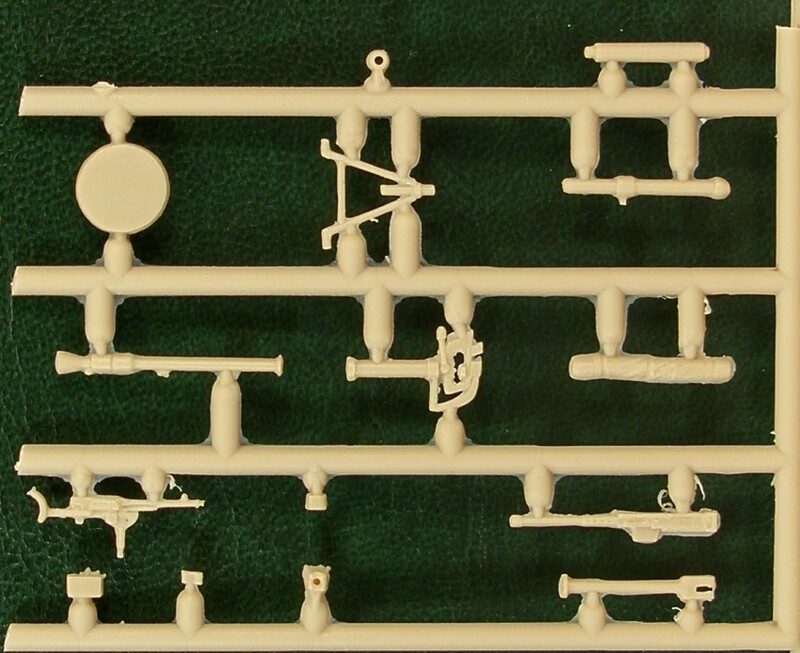 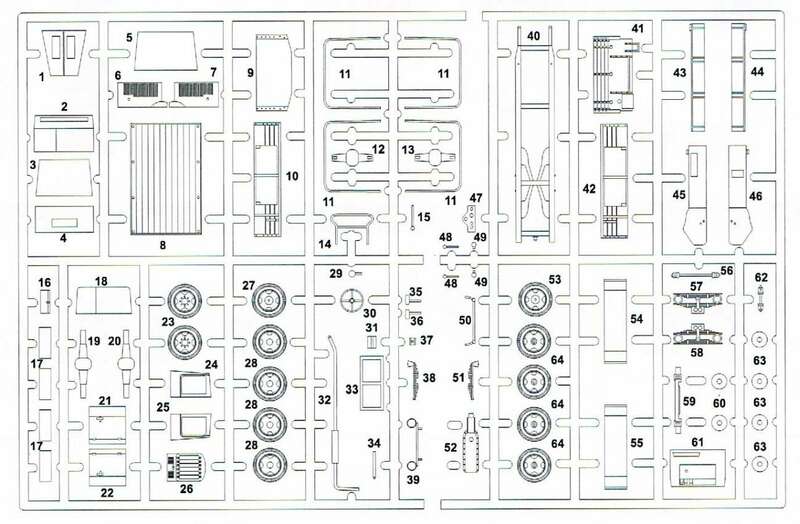 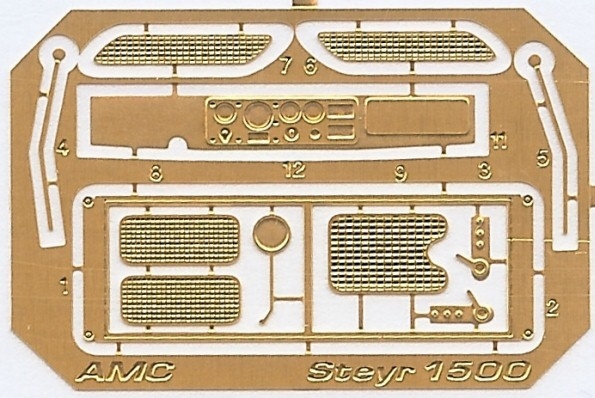 There is just one sprue of 38 crisp, clean injection moulded parts (fine engraved panel lines)...but 19 of them aren't used (obviously another 1890 copies of different version are due in the future)! 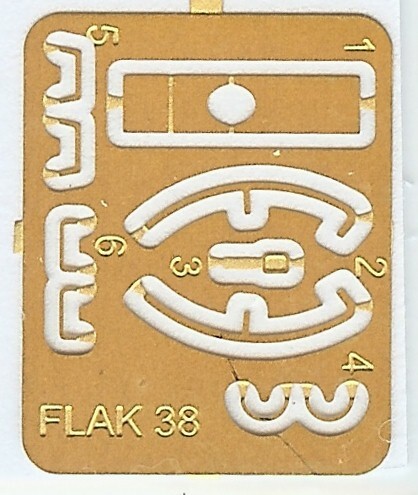 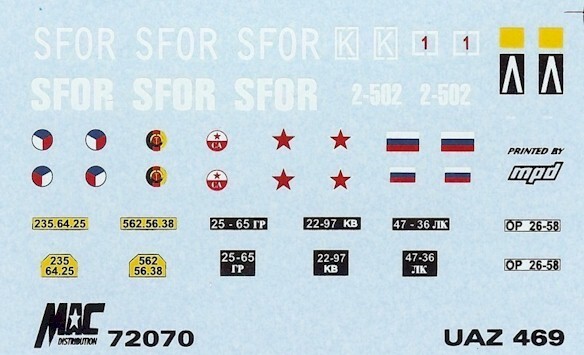 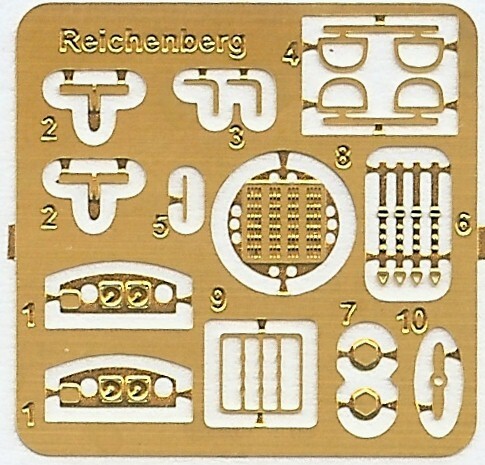 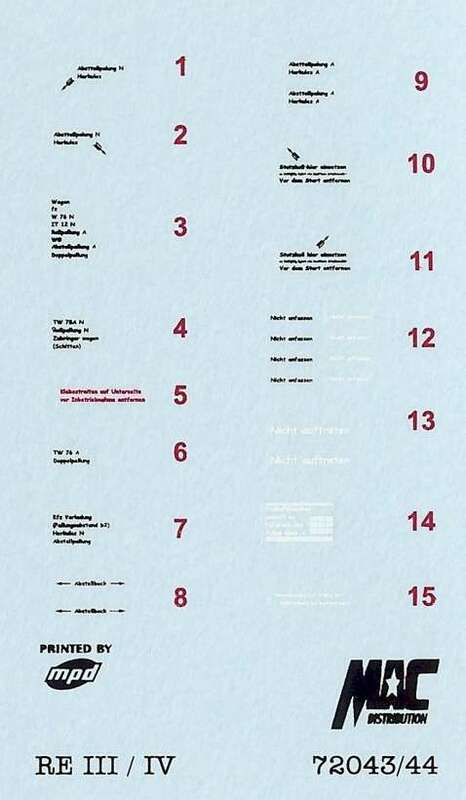 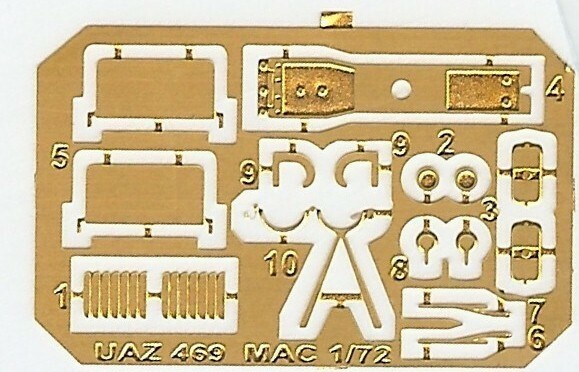 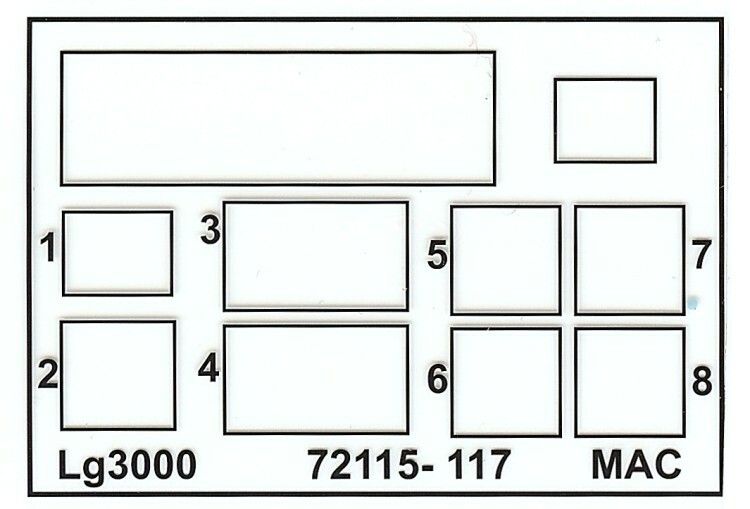 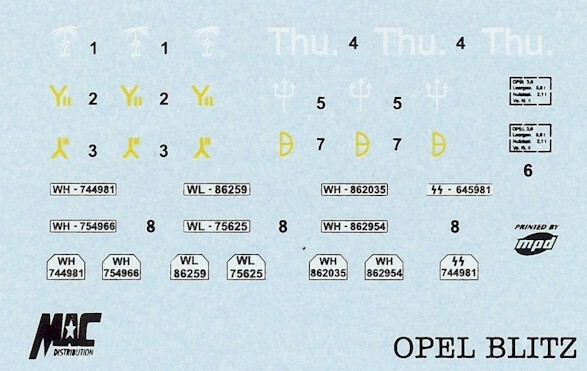 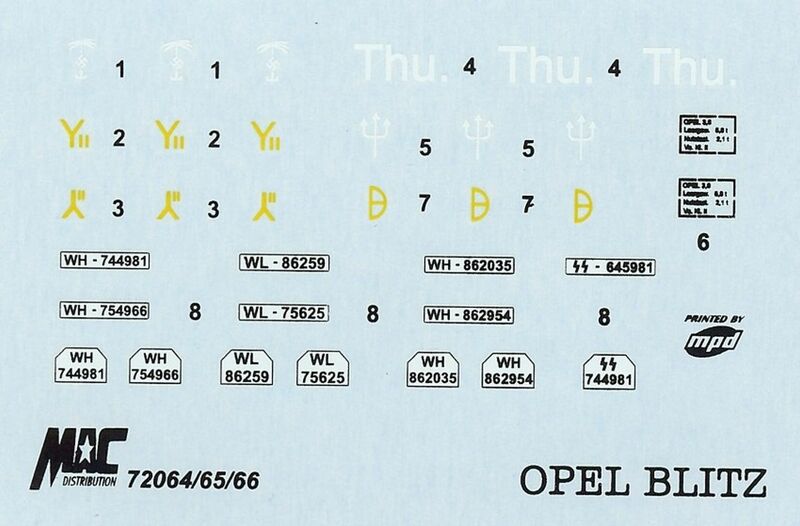 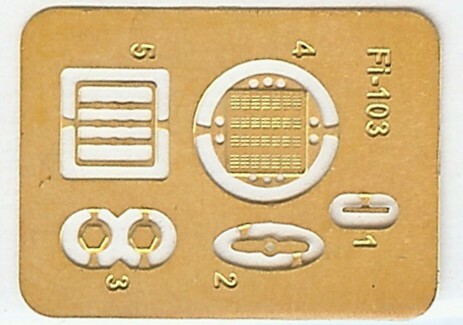 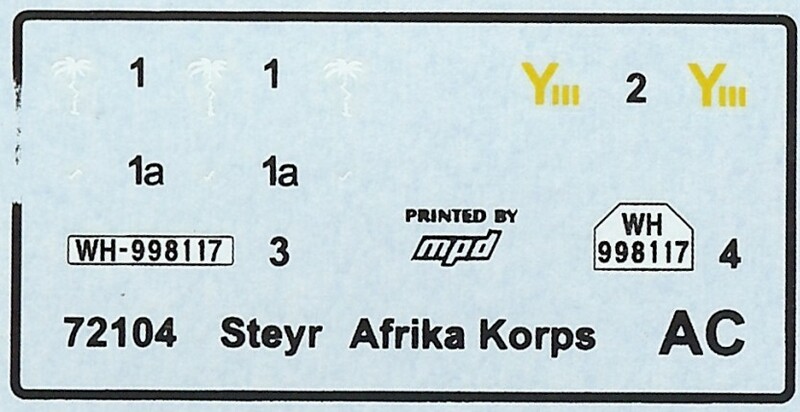 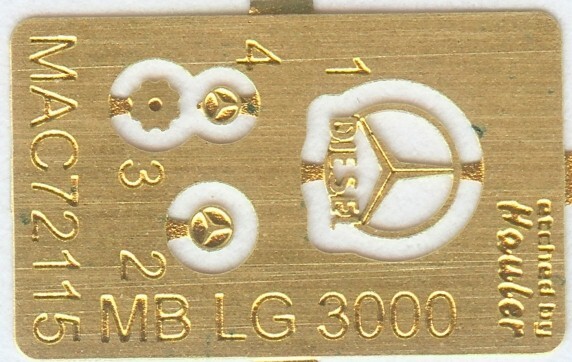 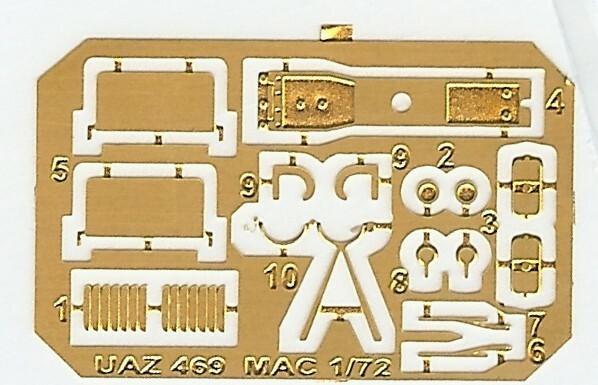 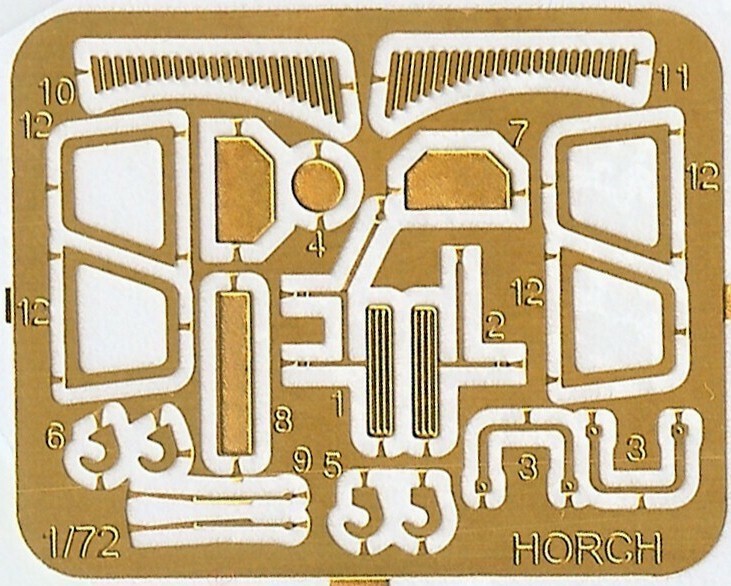 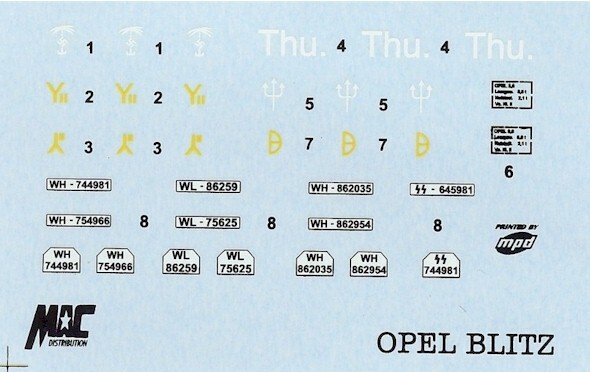 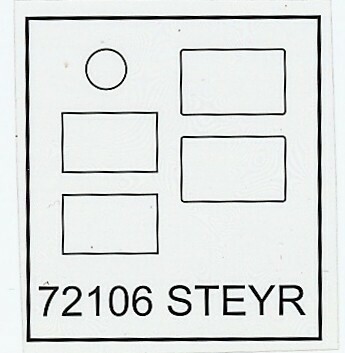 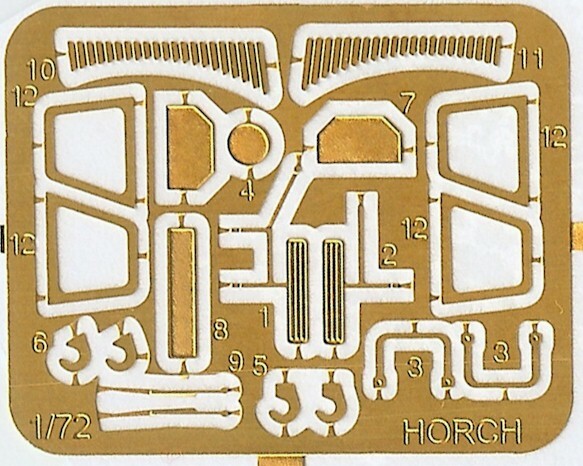 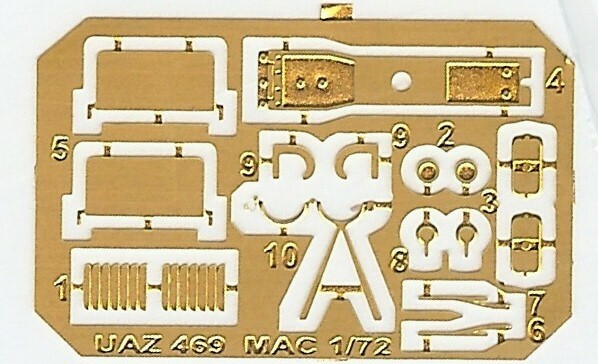 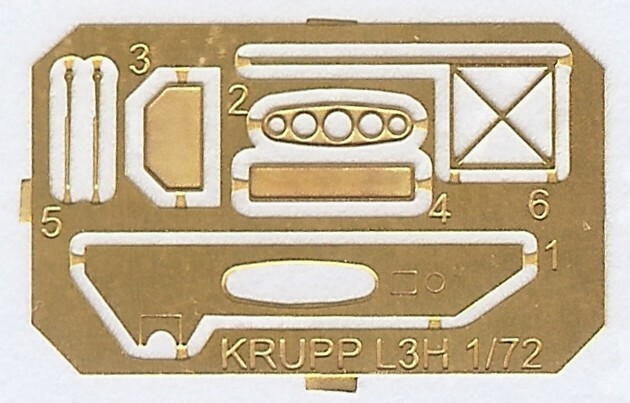 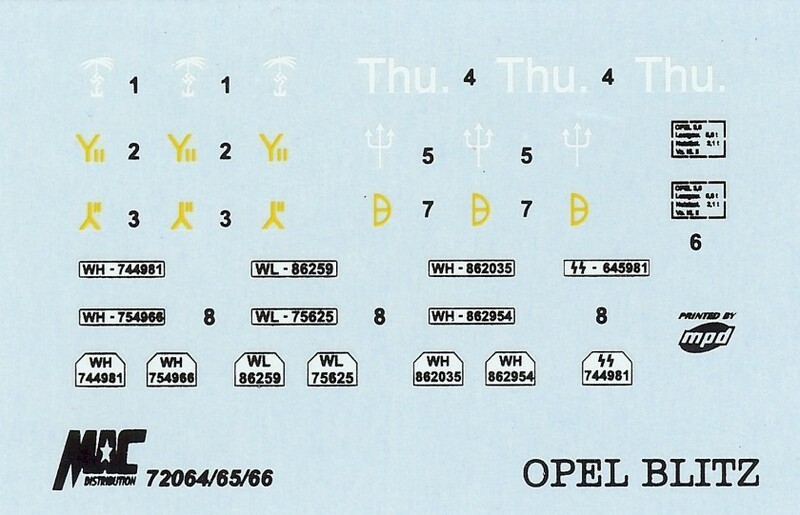 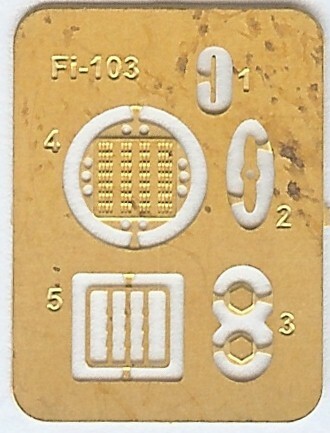 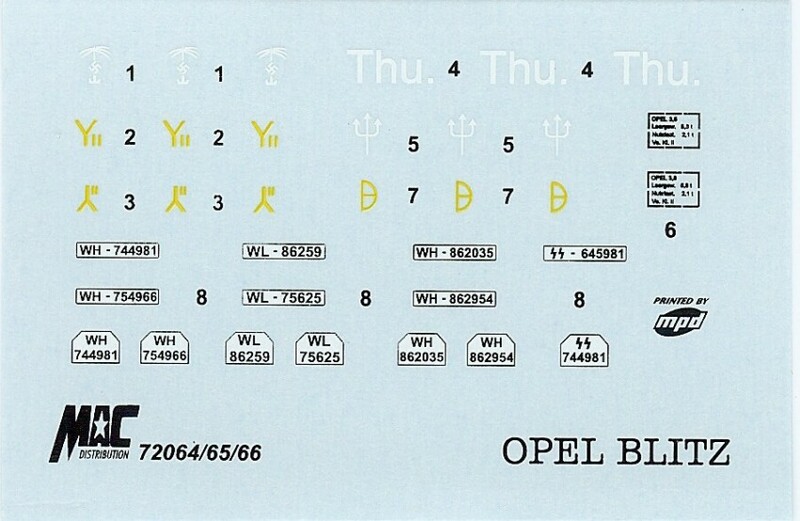 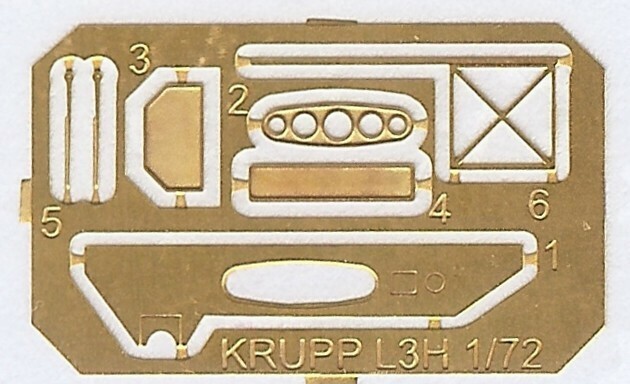 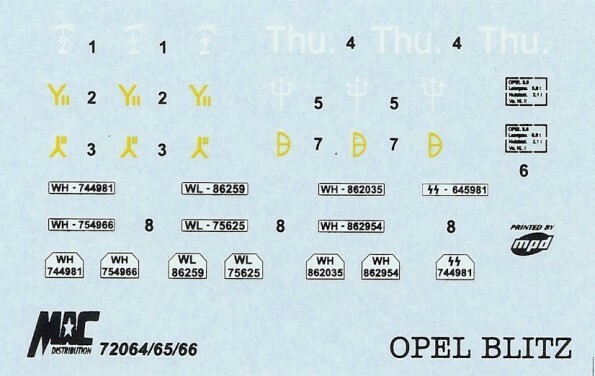 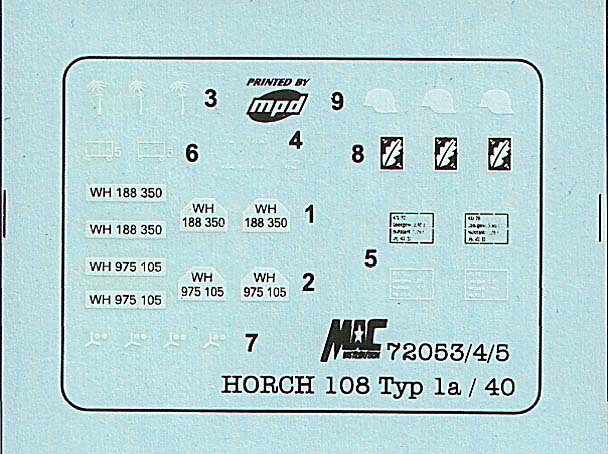 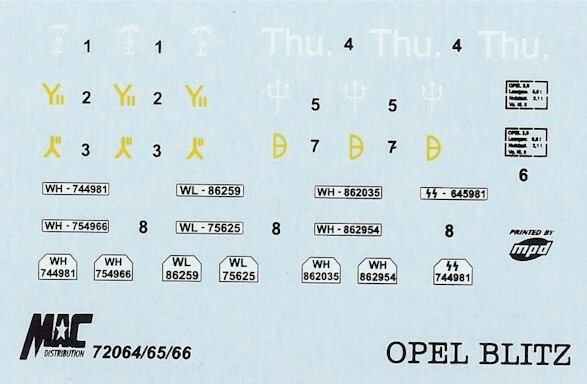 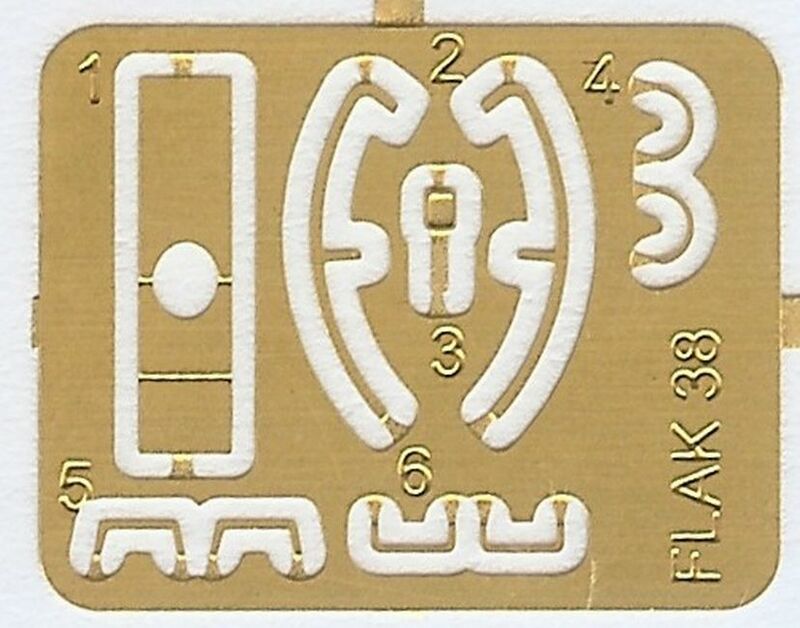 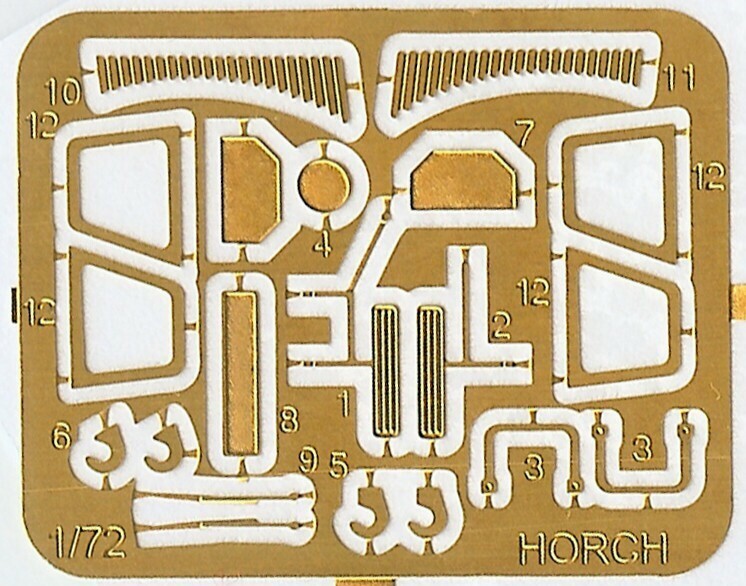 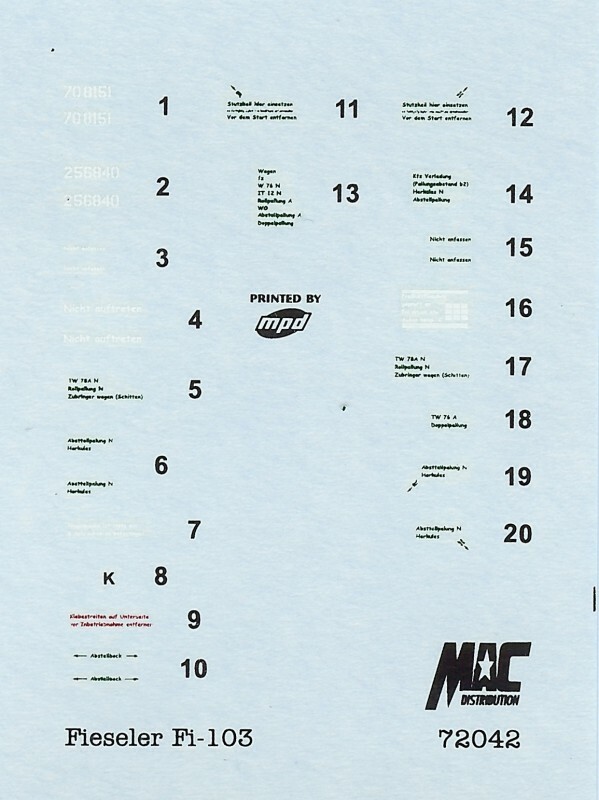 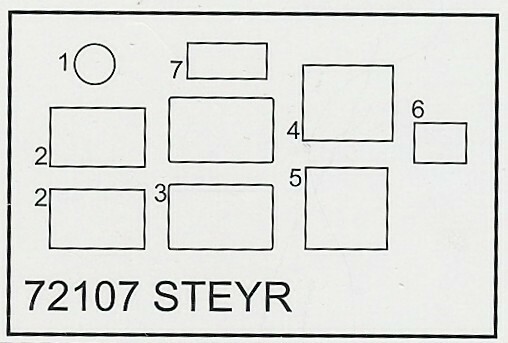 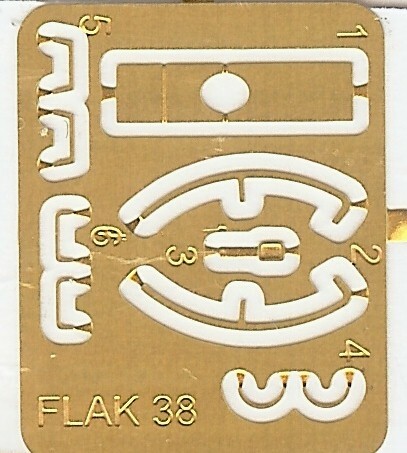 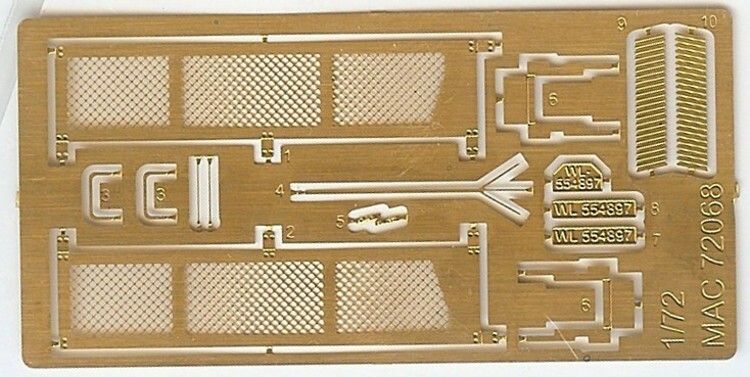 Also included in the kit are a small photo etched fret (5 parts) and a decal sheet with assorted stenciling. 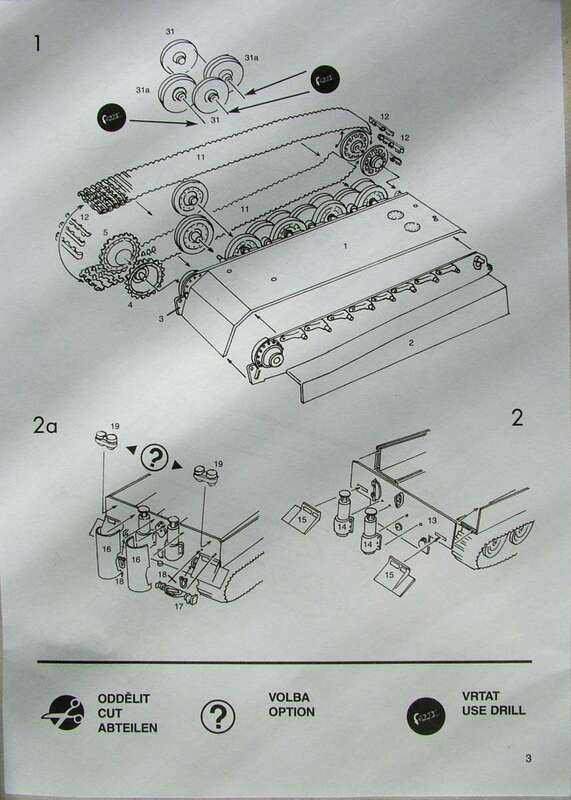 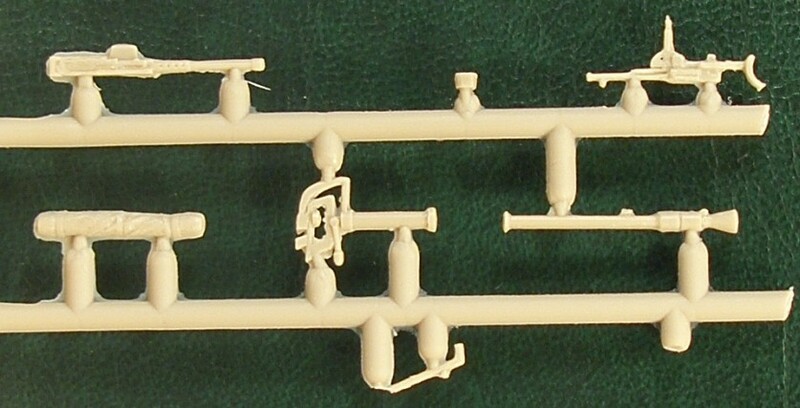 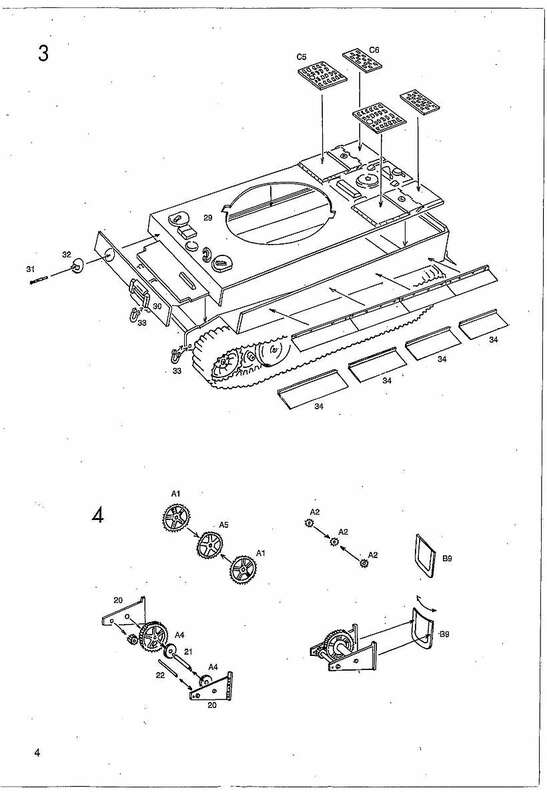 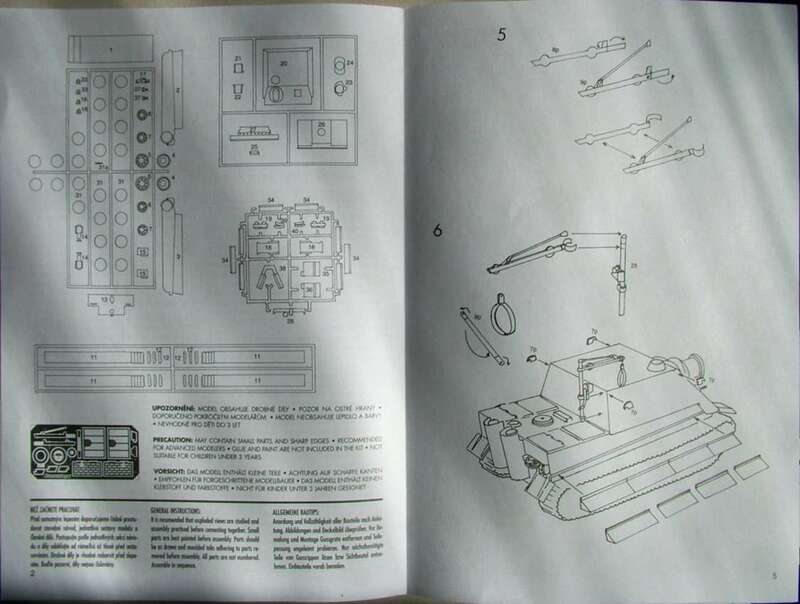 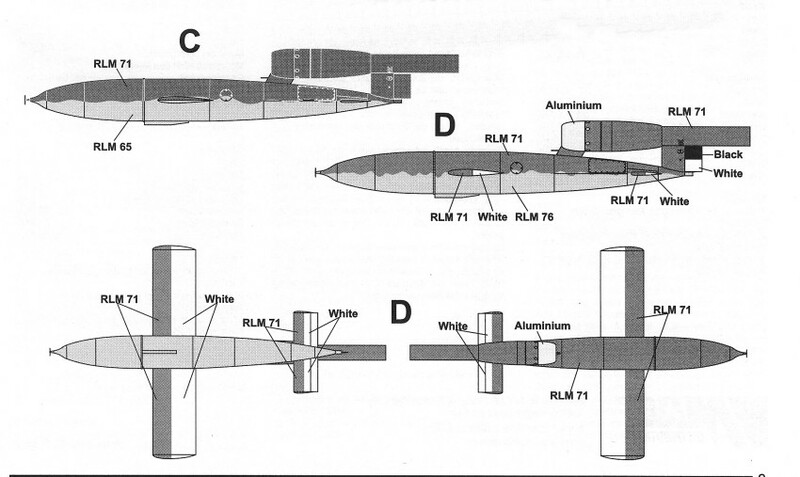 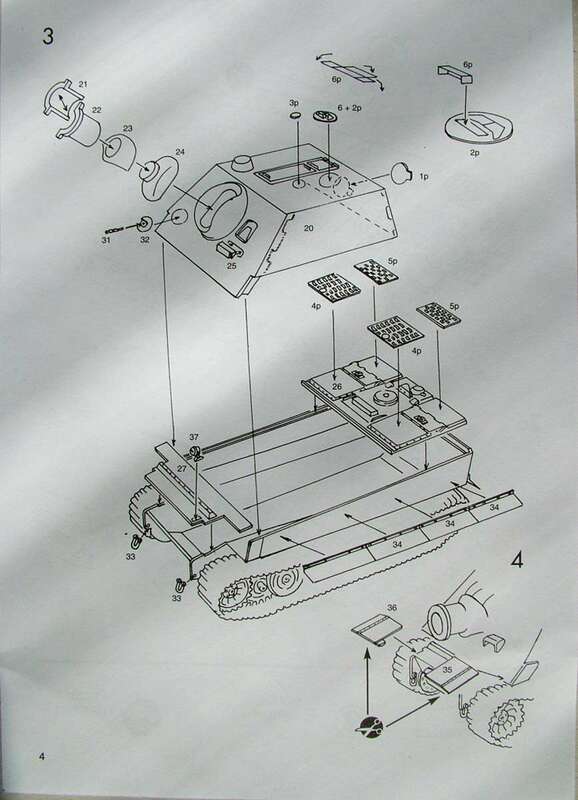 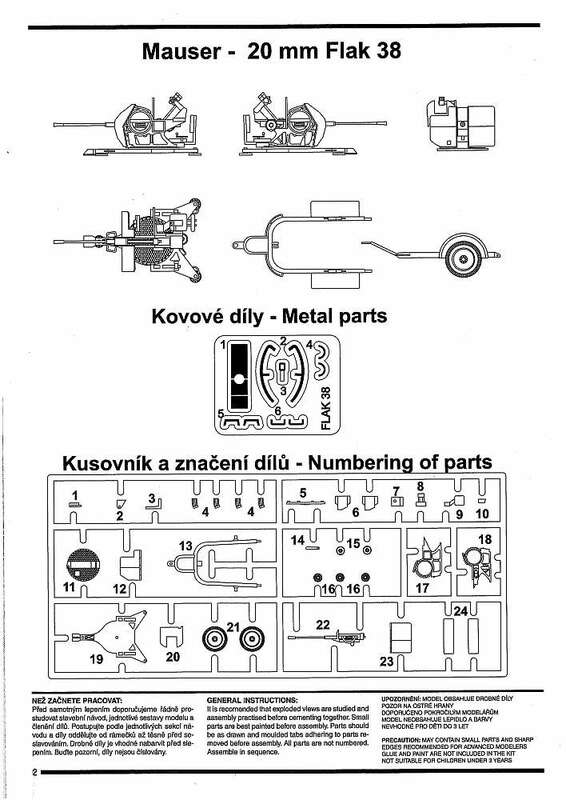 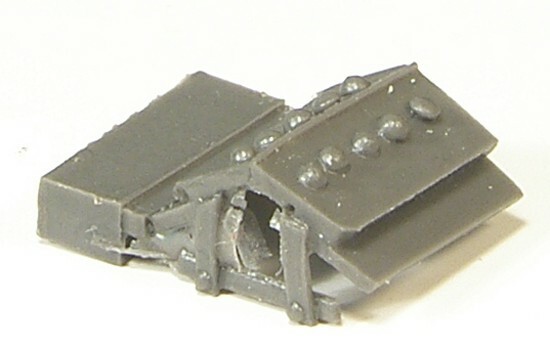 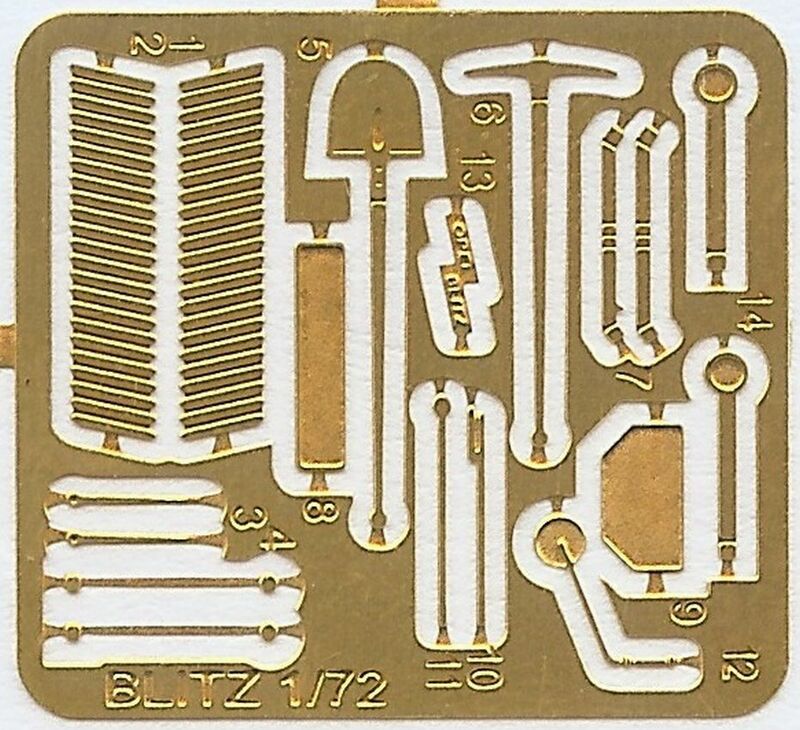 The V-1 itself is made up from just 12 of the plastic parts (plus the 5 etched 'bits') with the other 7 parts building into a trolly on which to mount it. 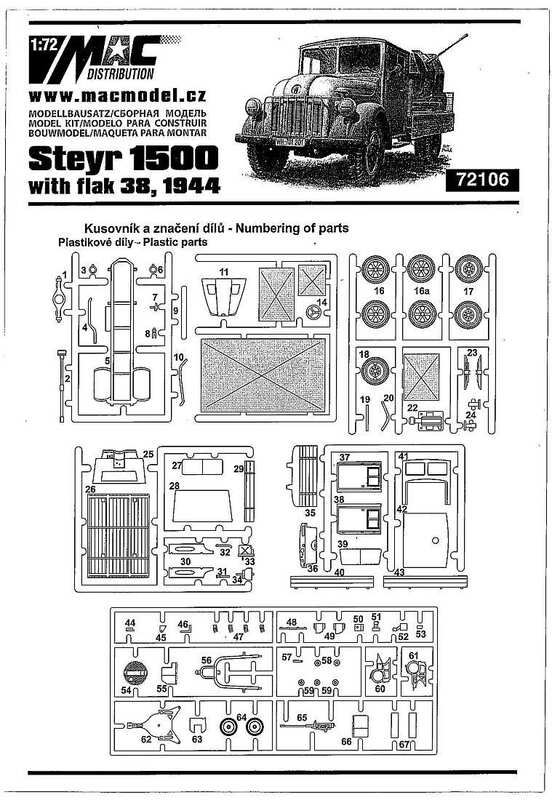 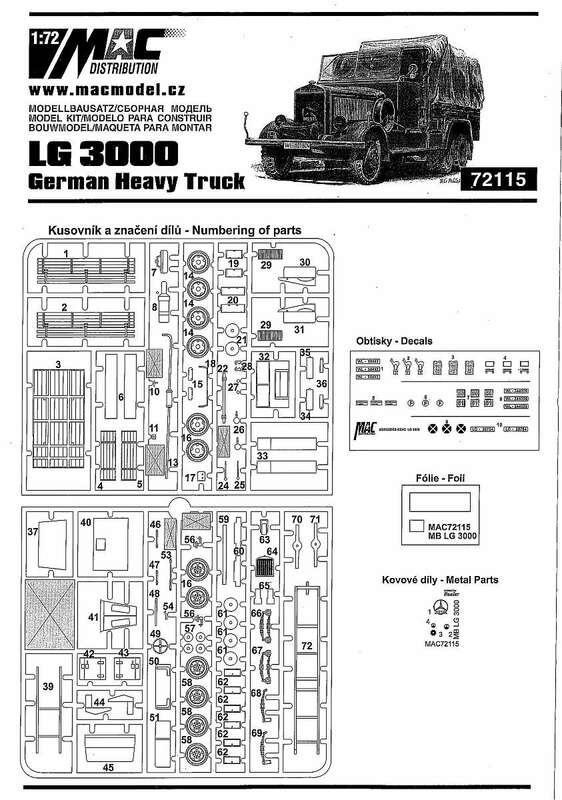 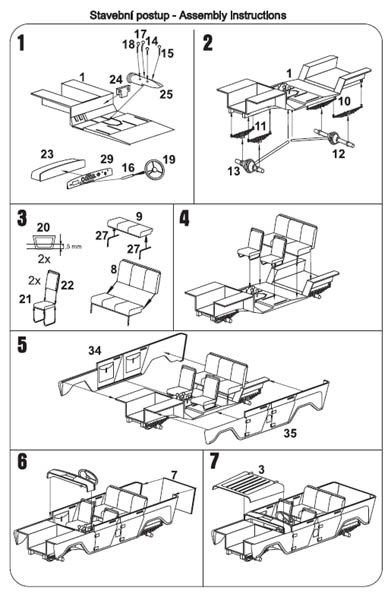 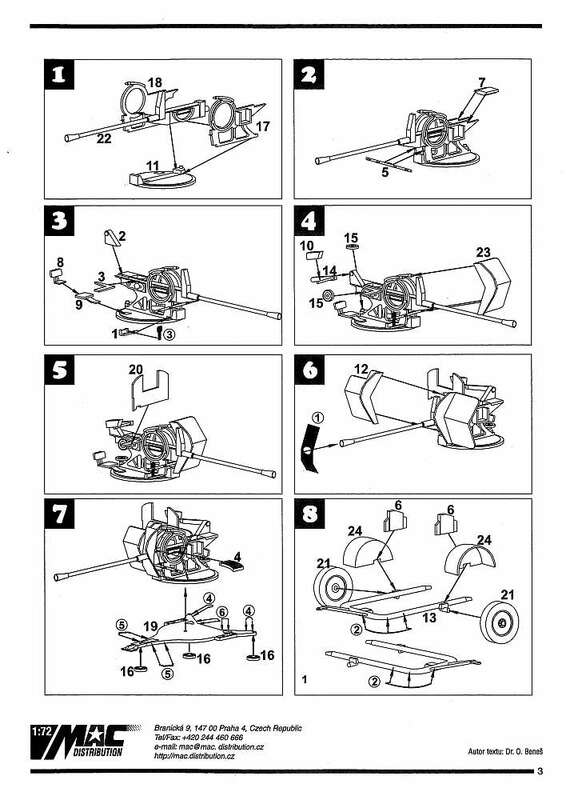 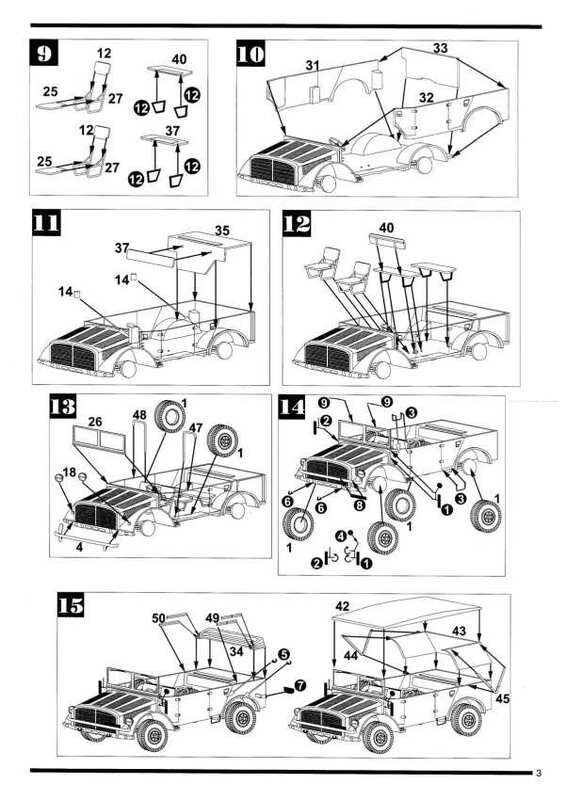 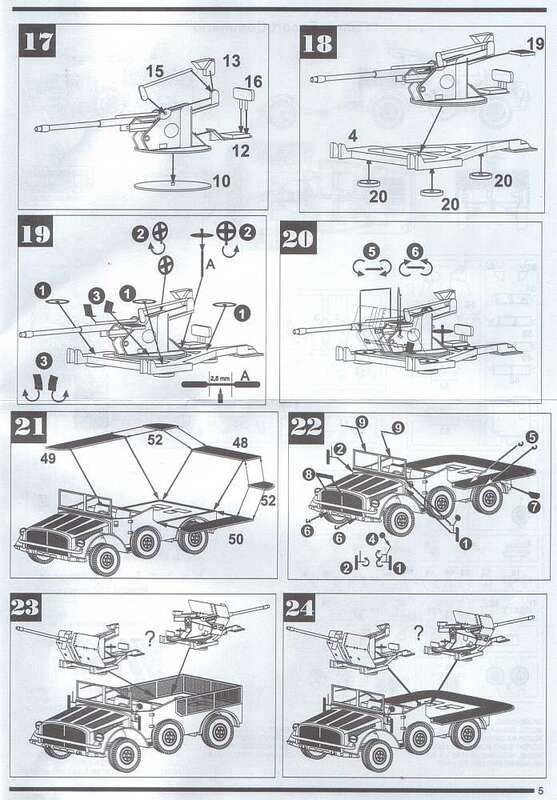 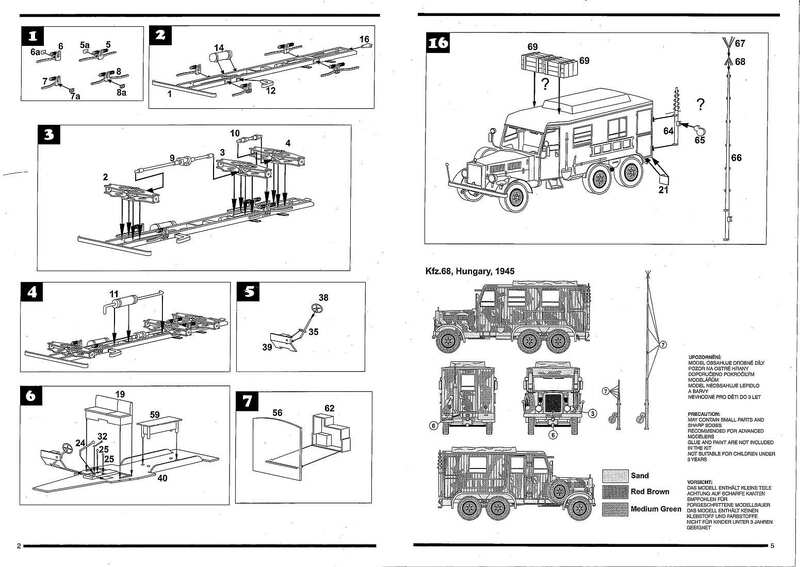 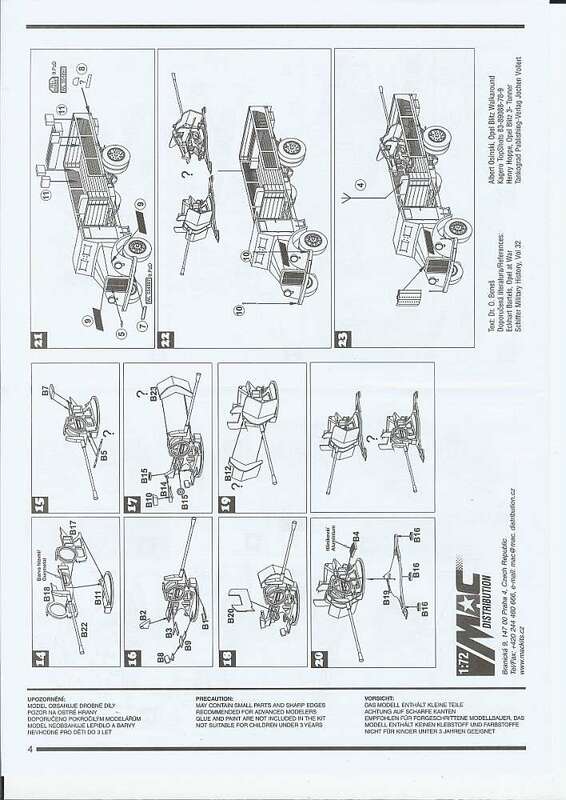 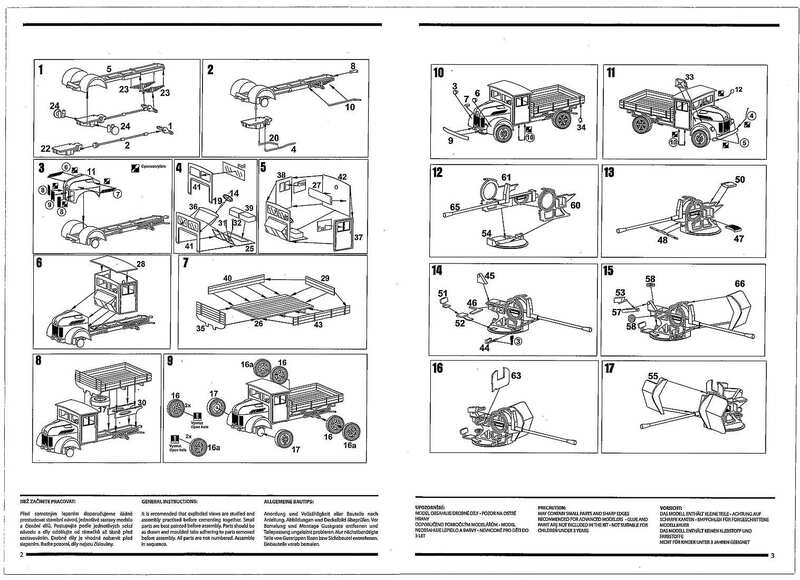 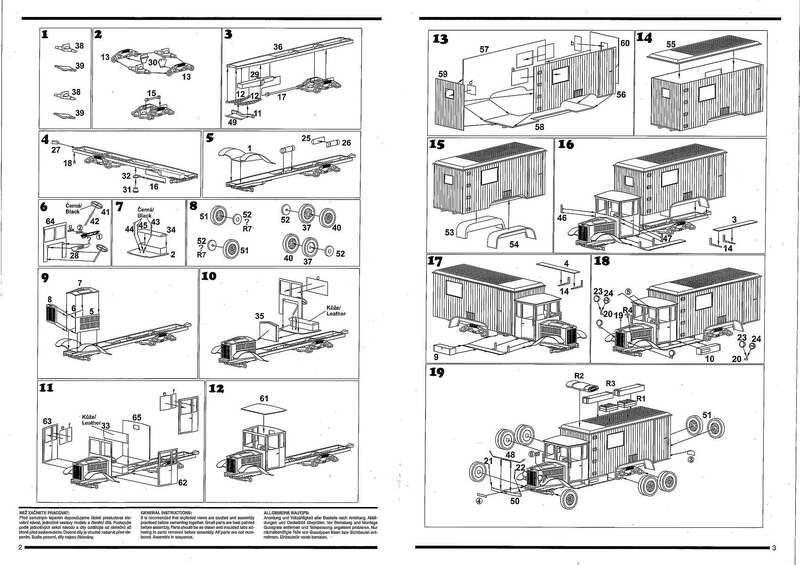 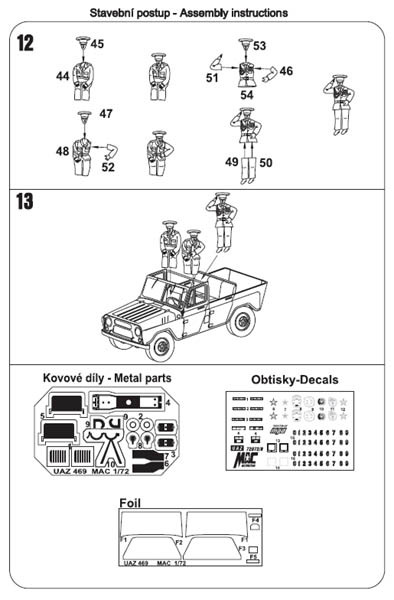 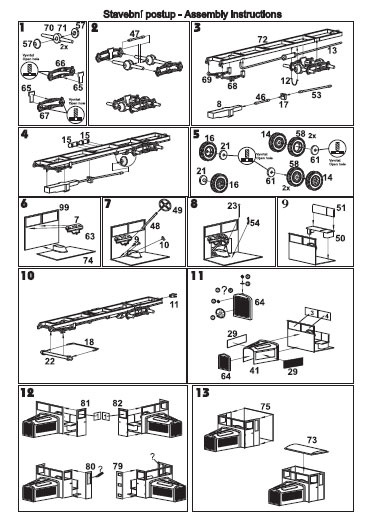 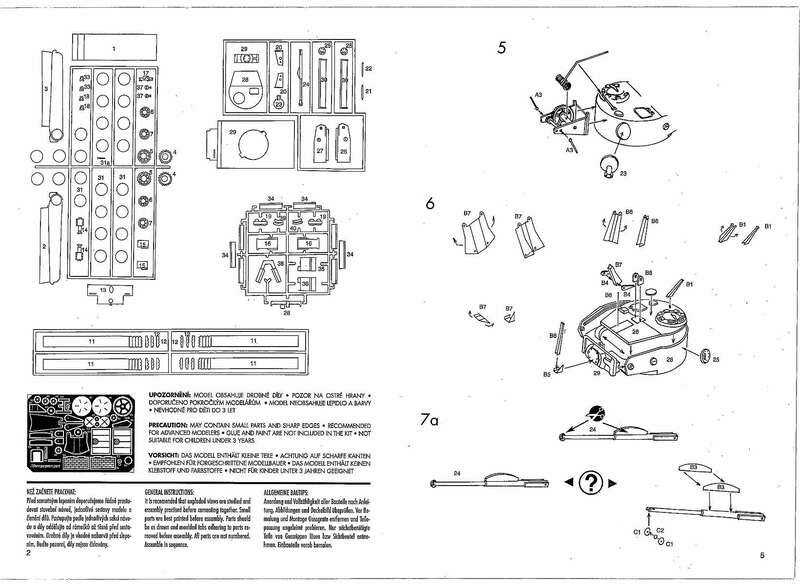 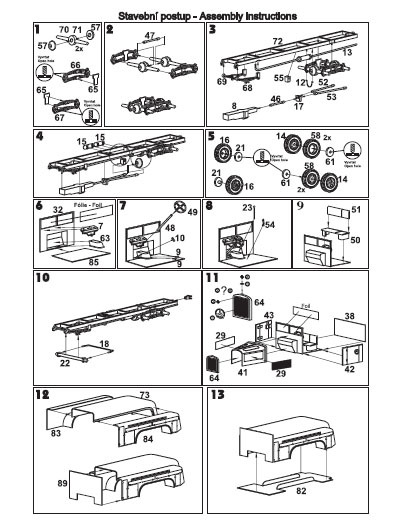 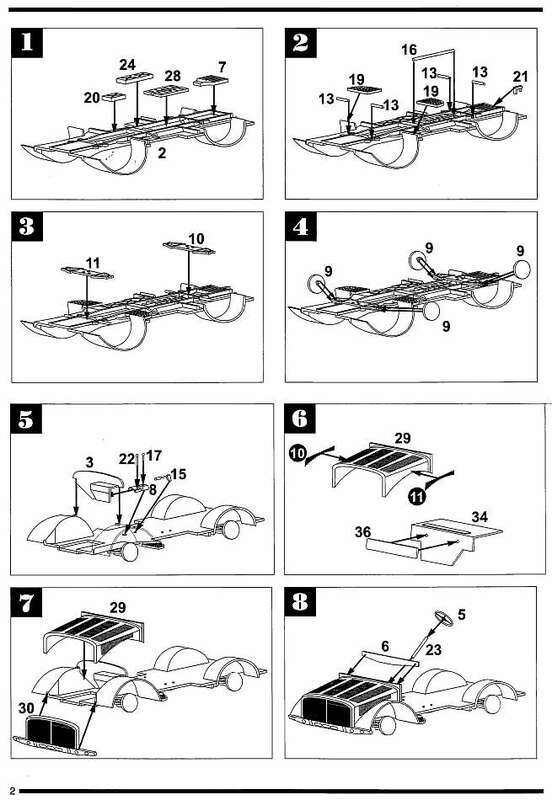 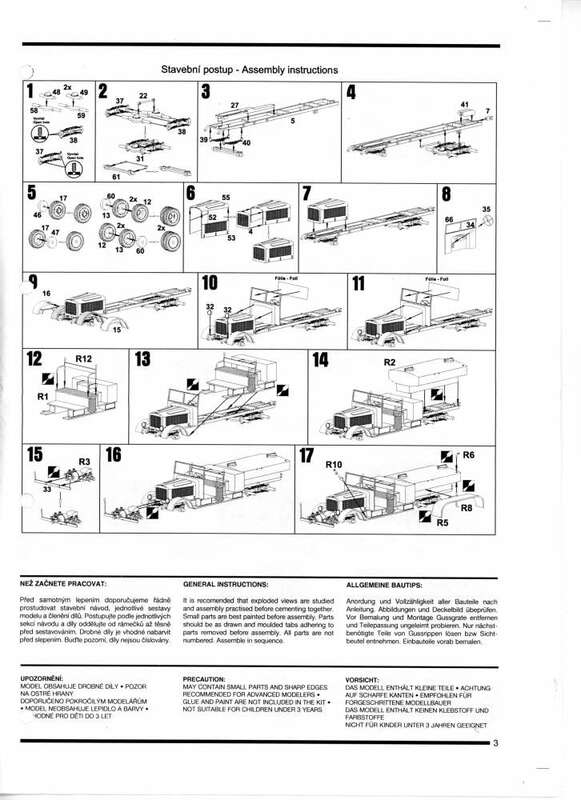 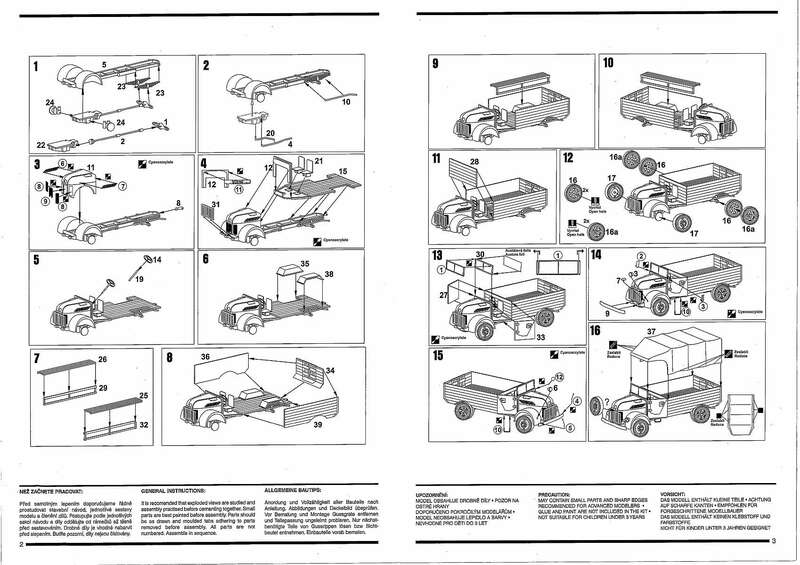 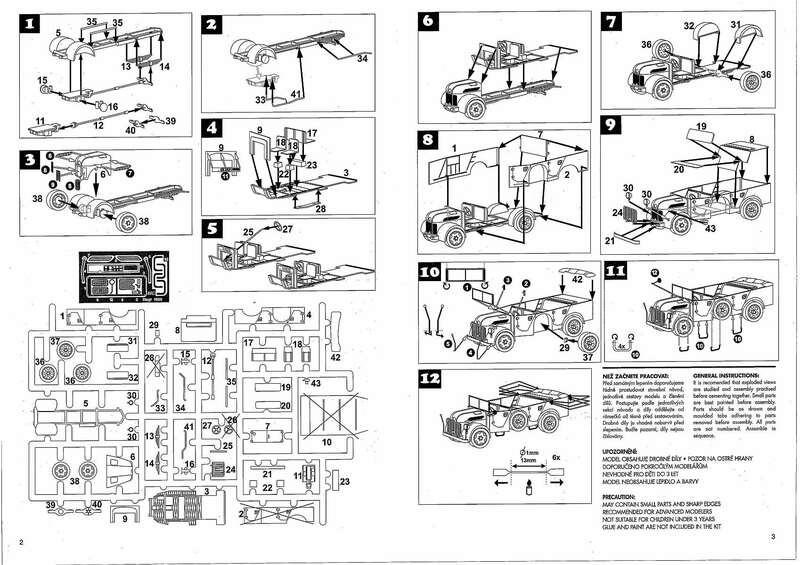 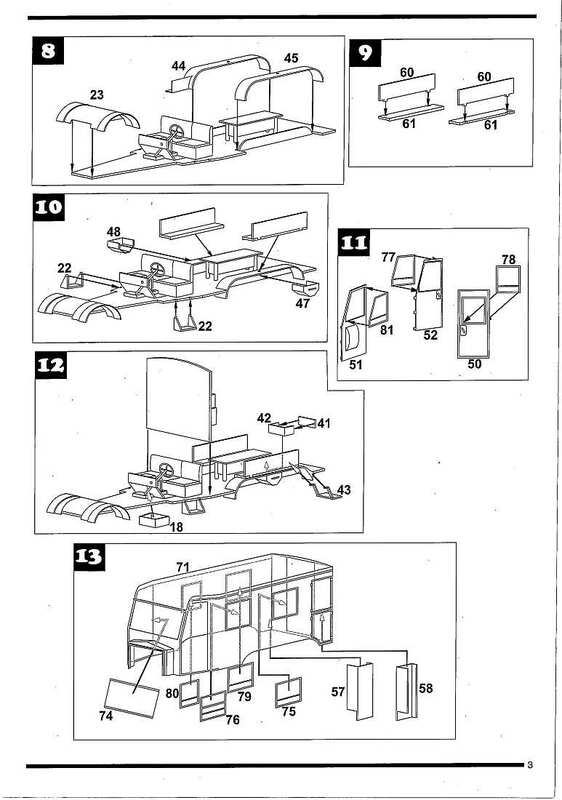 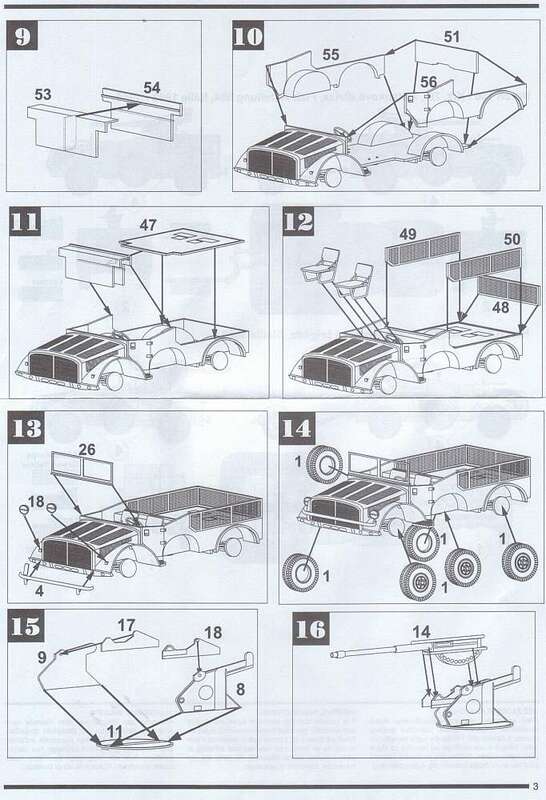 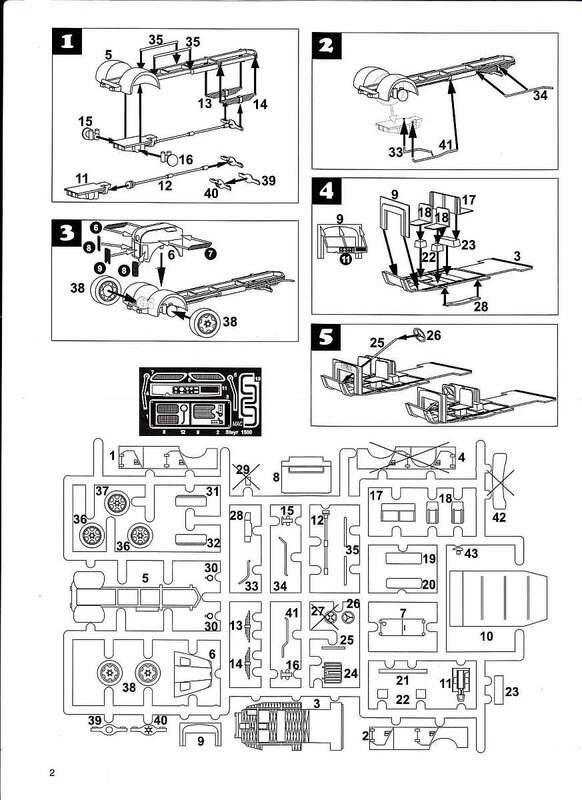 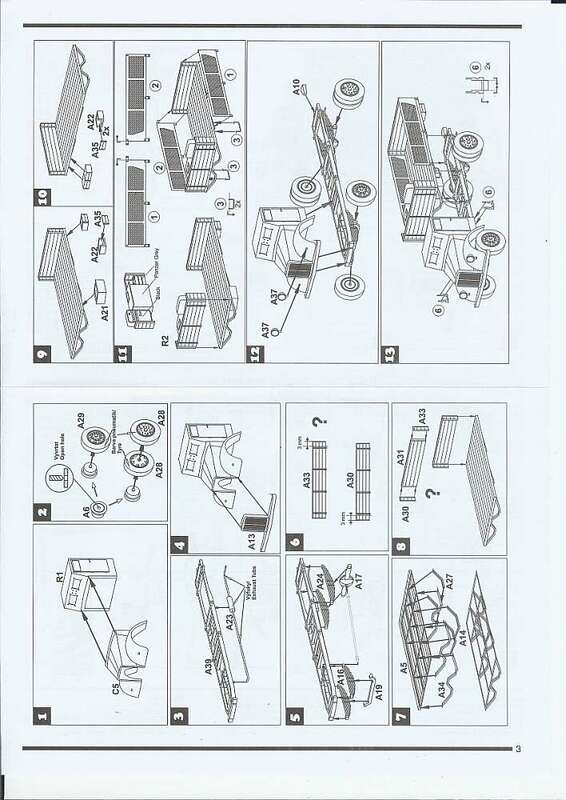 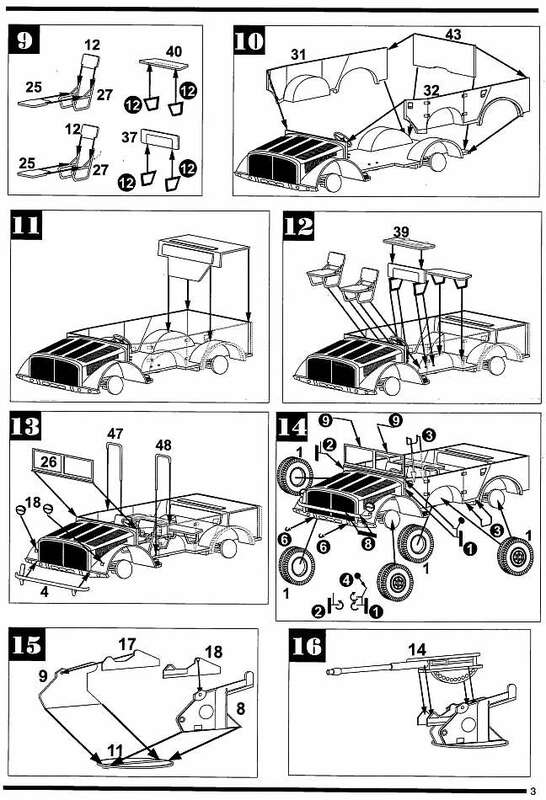 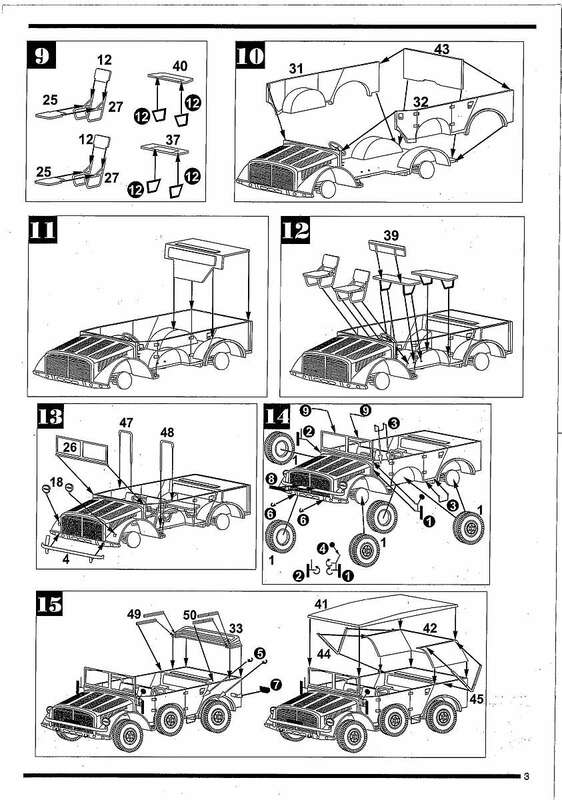 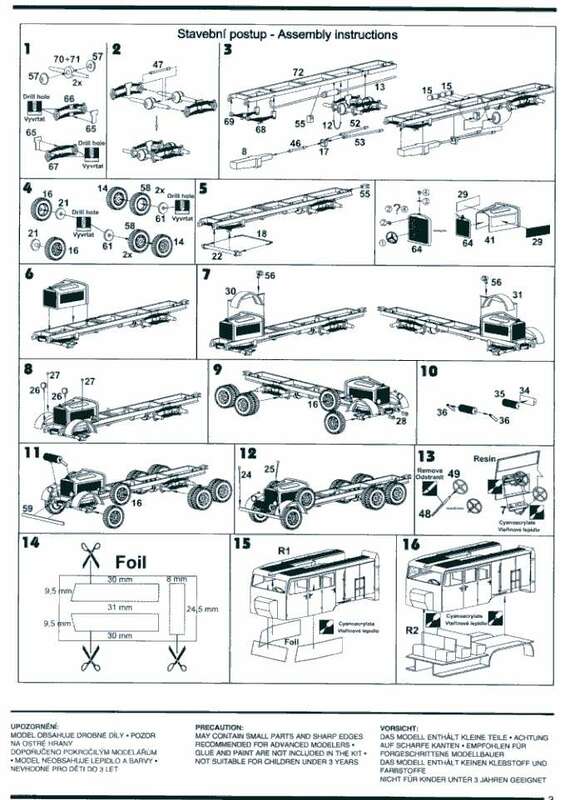 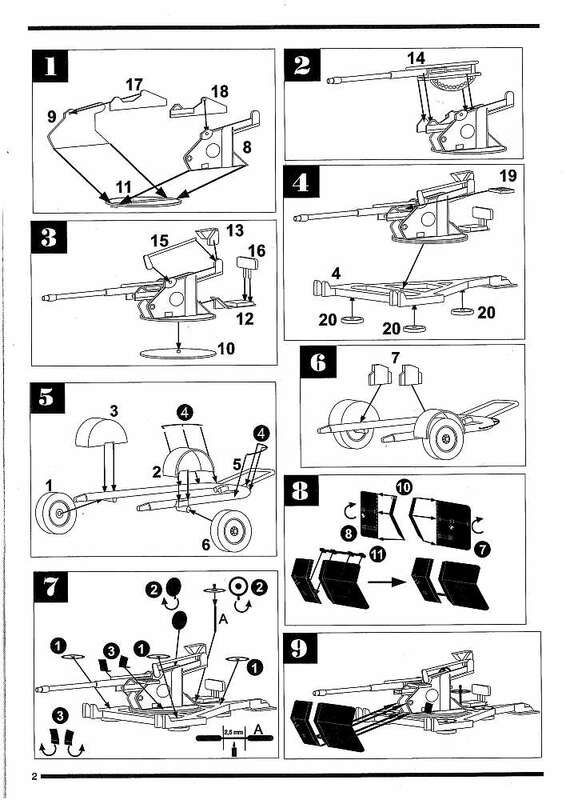 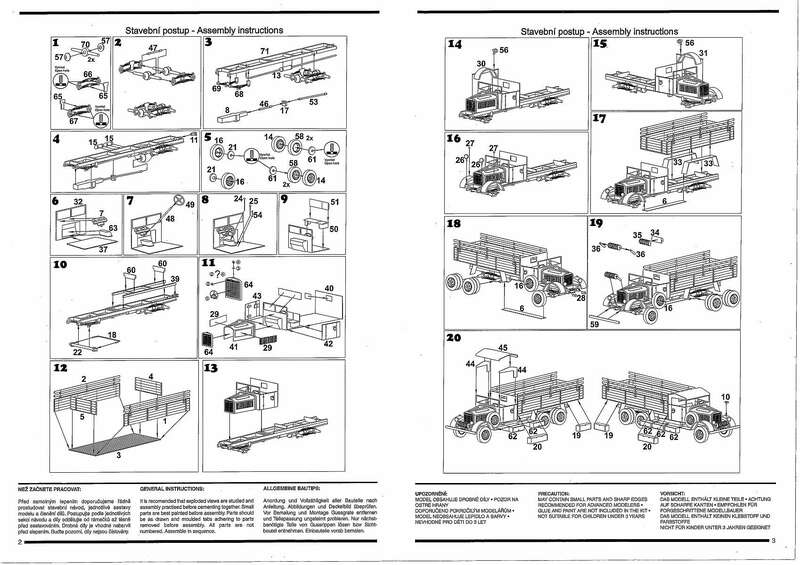 The extra 19 parts might or might not come in handy...but the kit might have been a lot cheaper had they been left out! 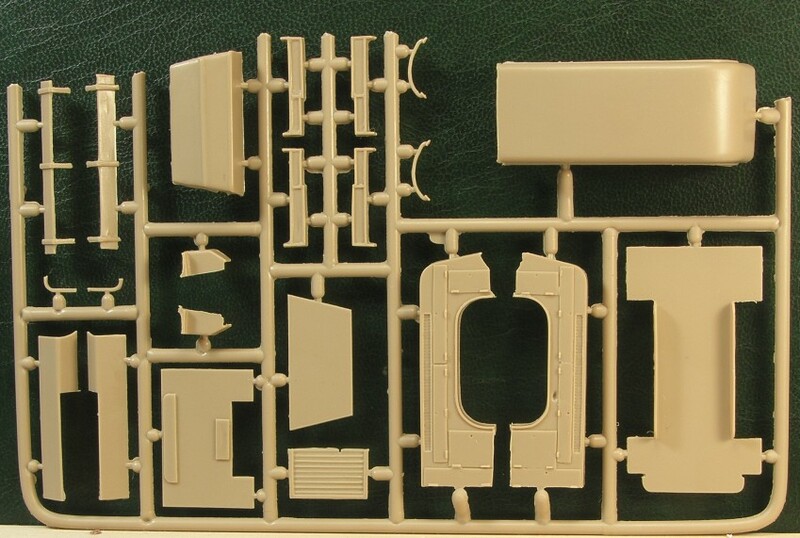 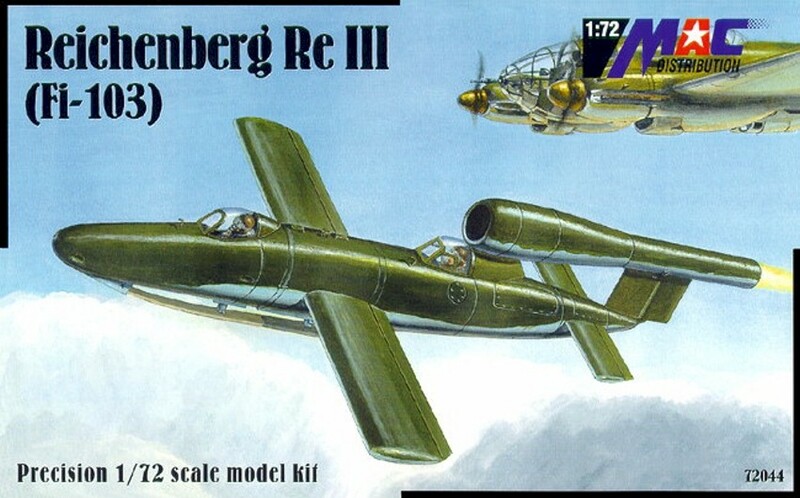 This is the 'two seat' version and apart from an extra set of vac formed canopies, the kit is identical to the Re.1V (the extra parts not used in that version are used in this one). 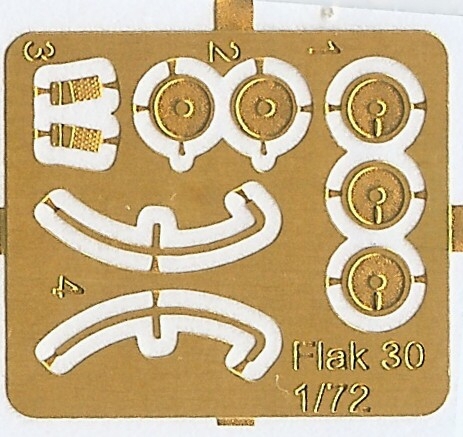 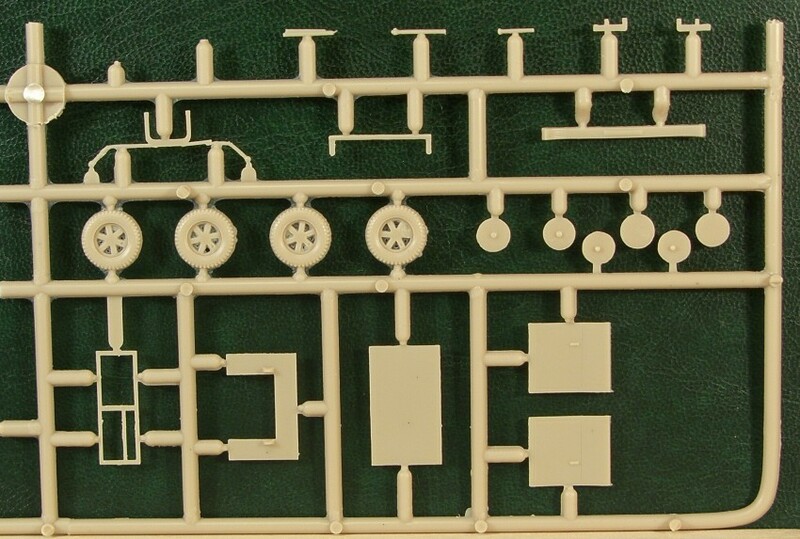 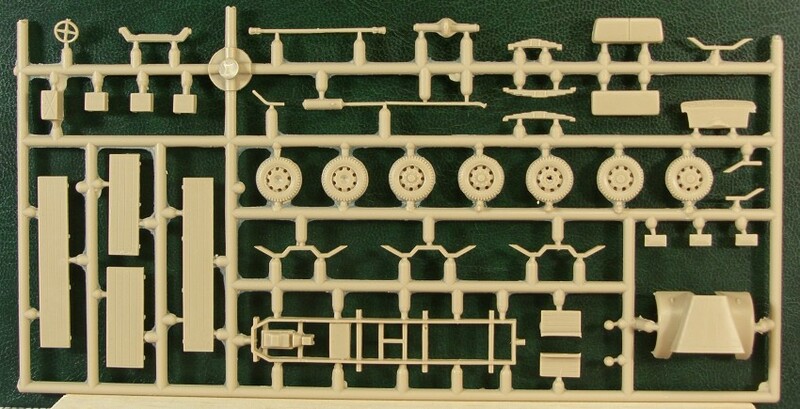 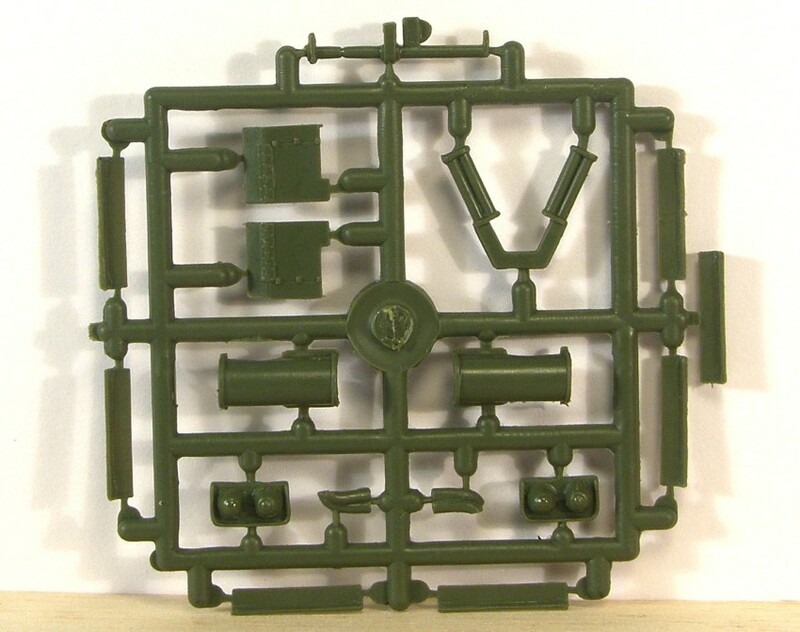 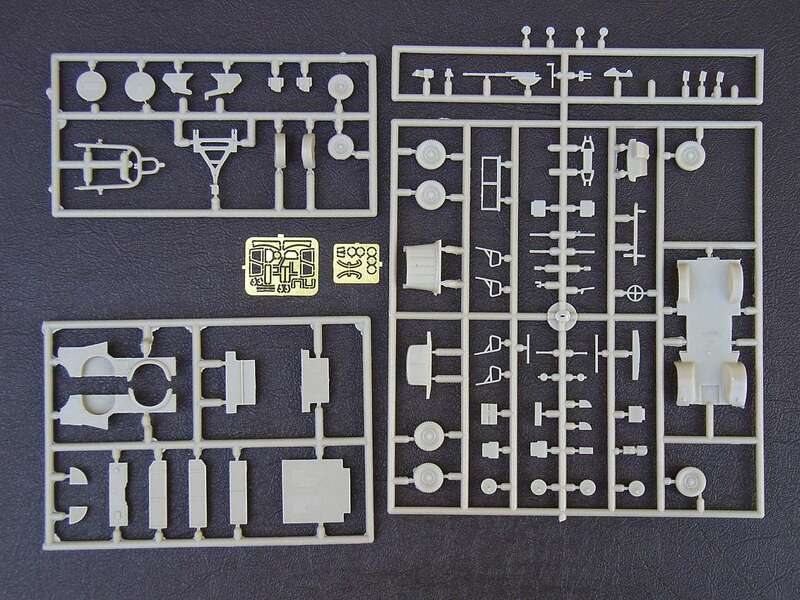 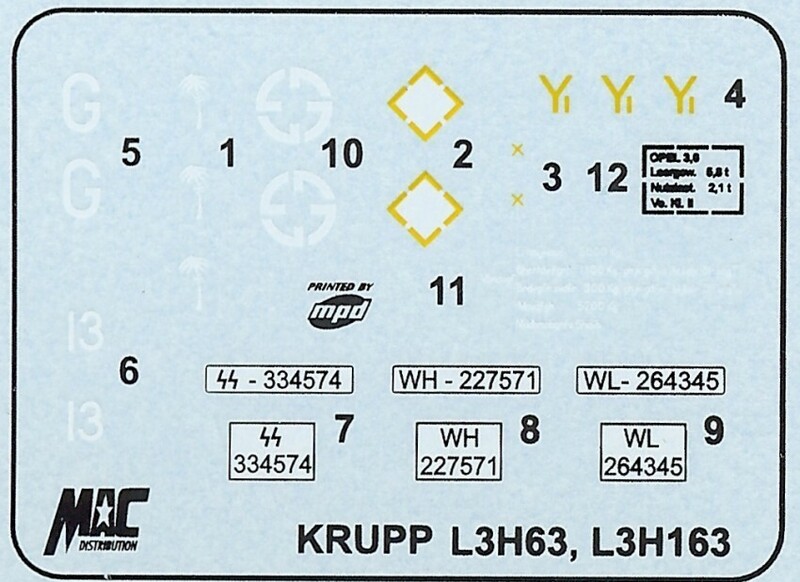 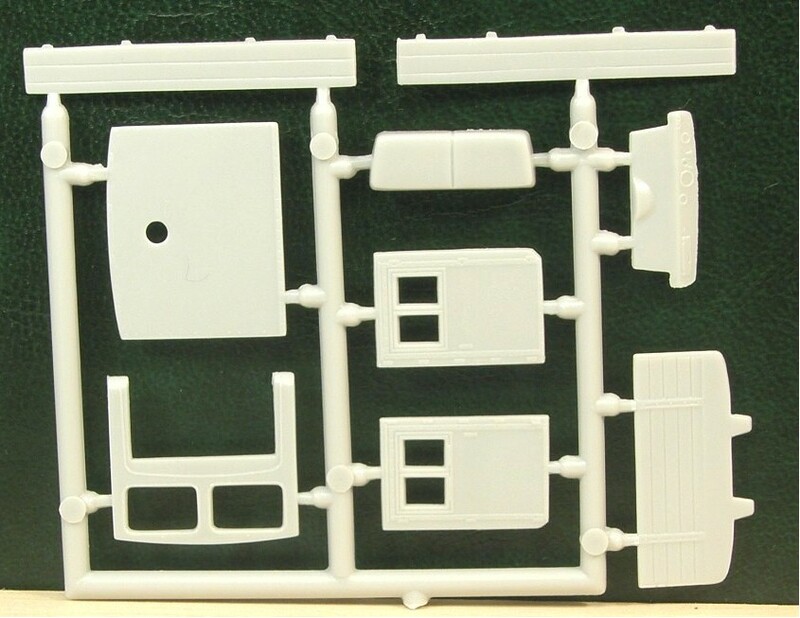 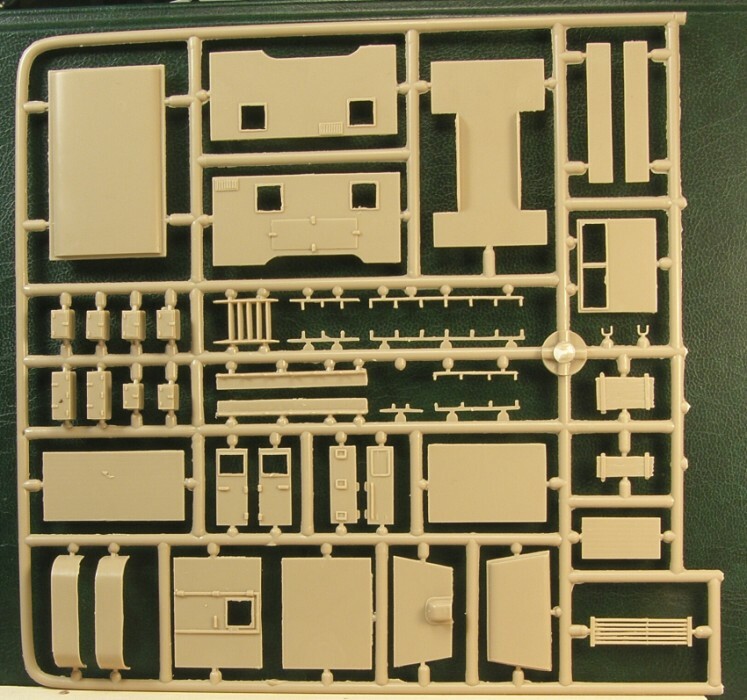 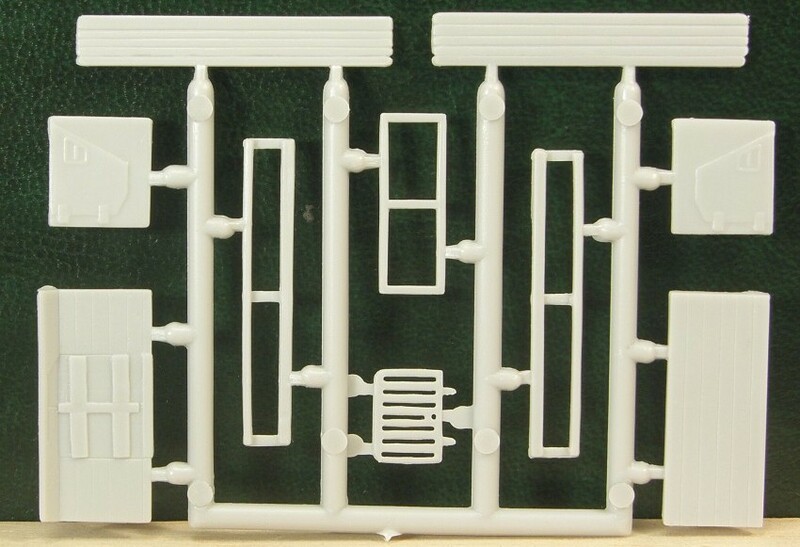 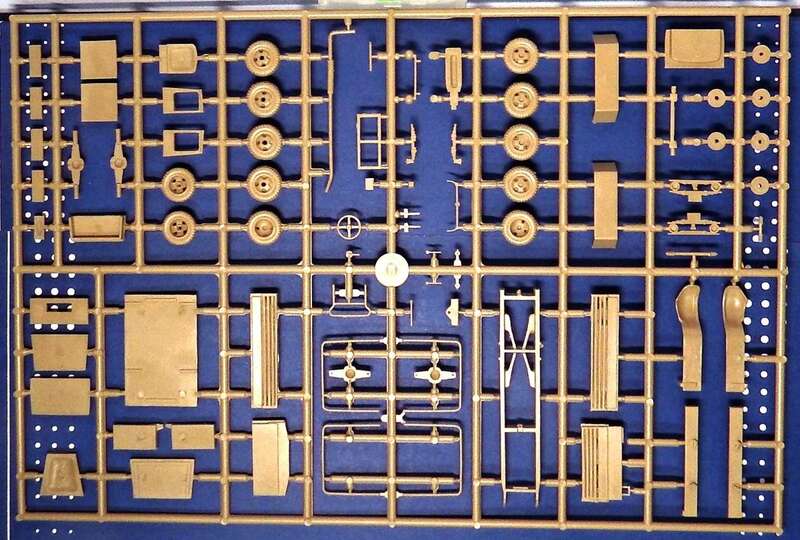 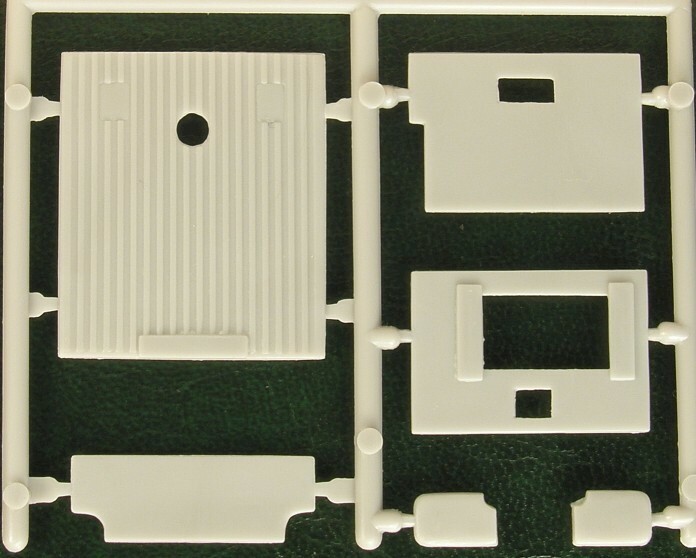 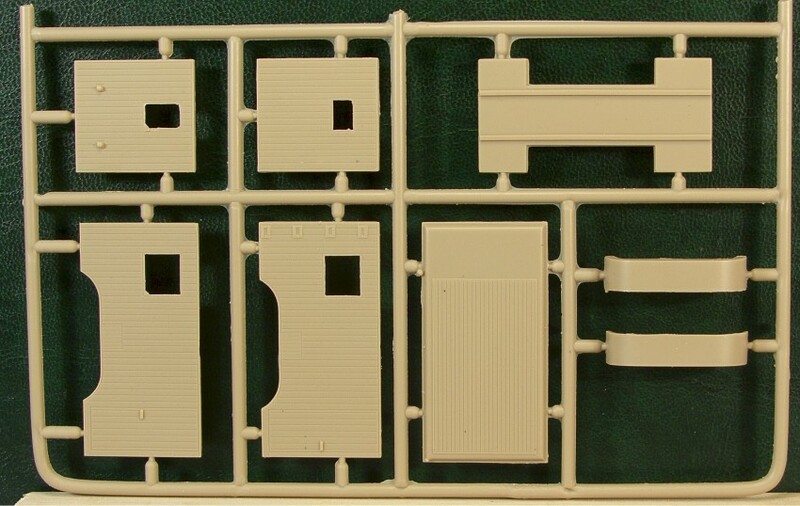 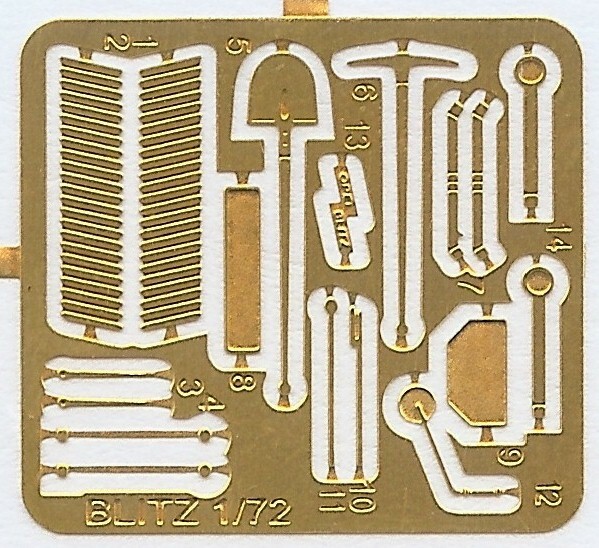 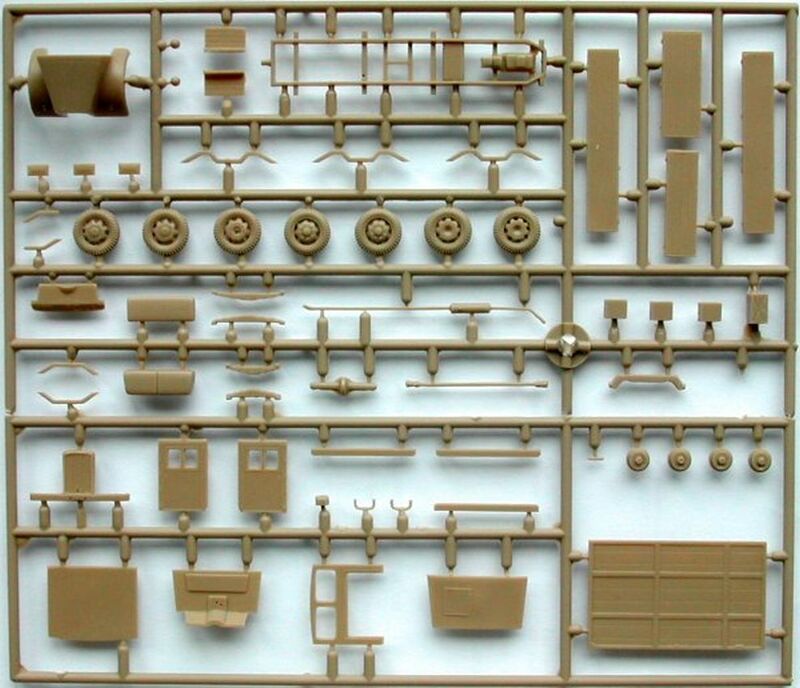 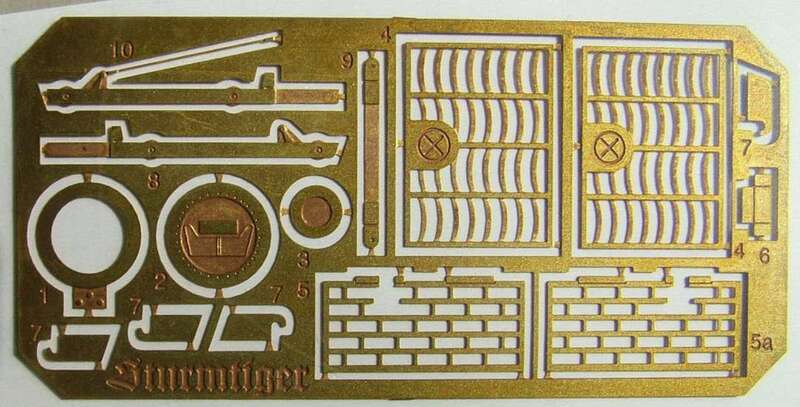 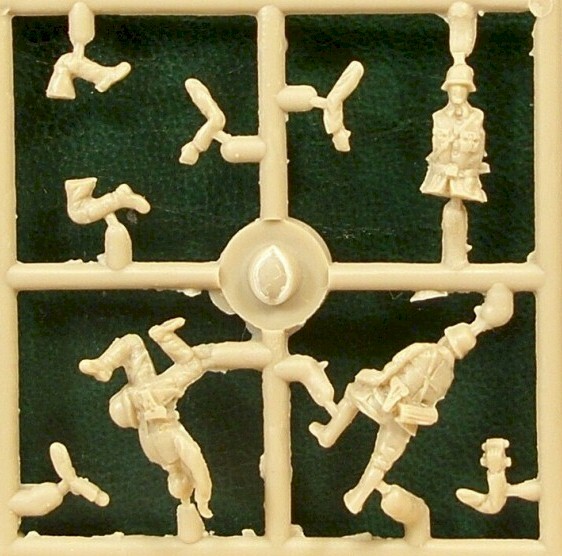 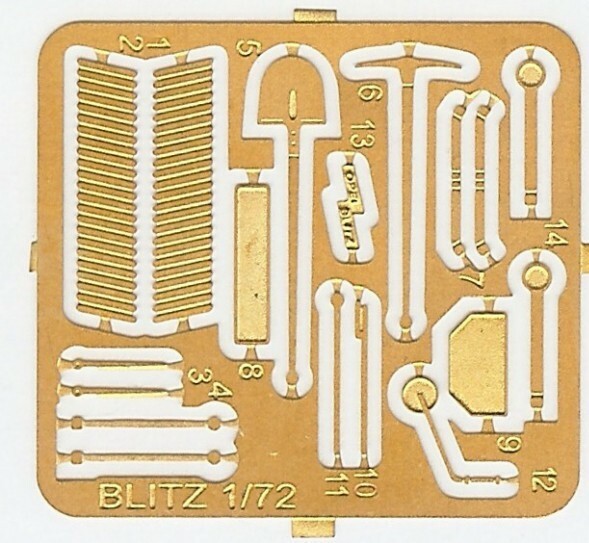 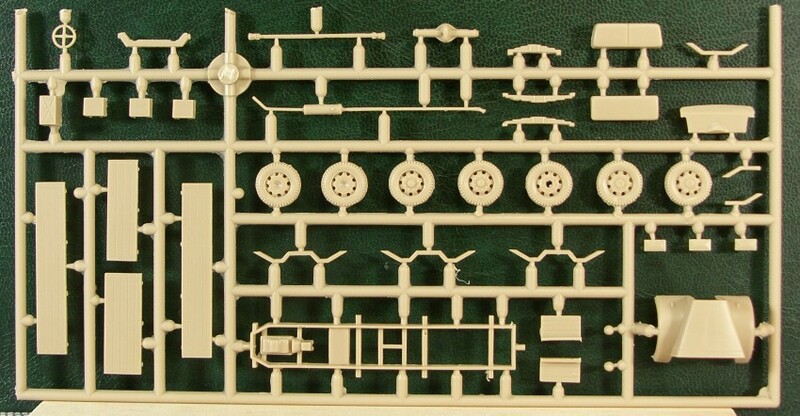 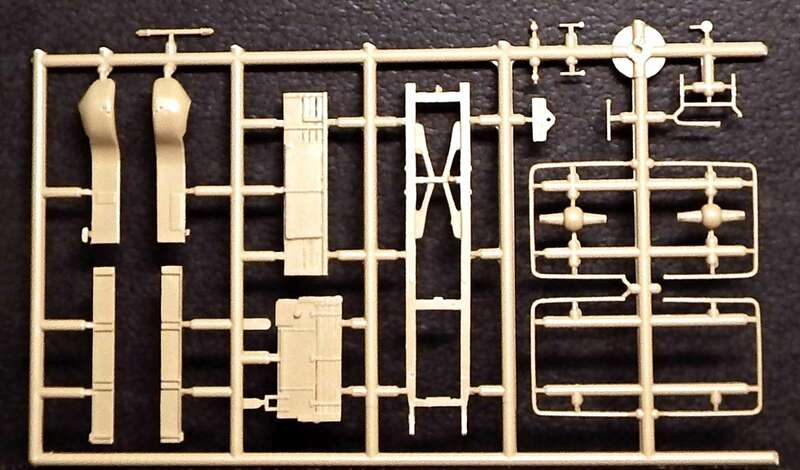 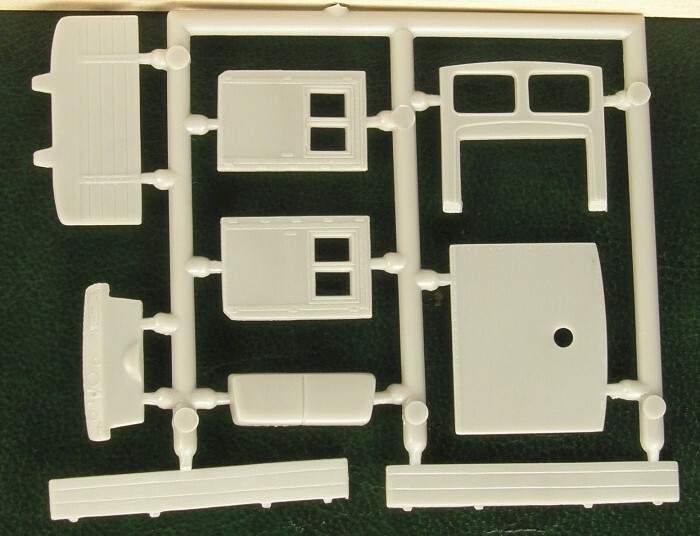 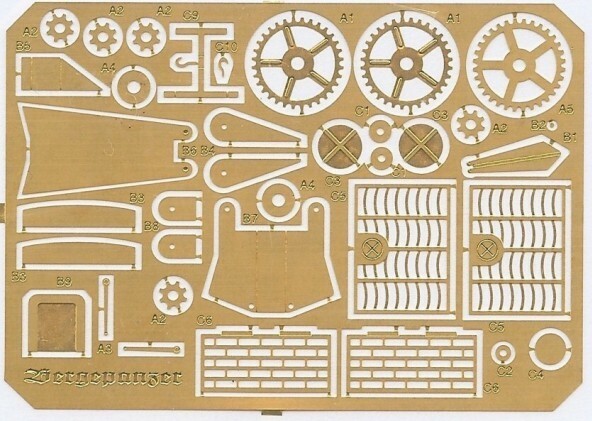 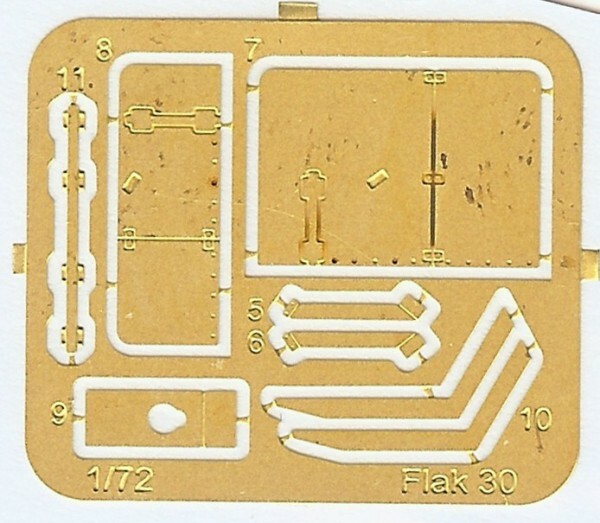 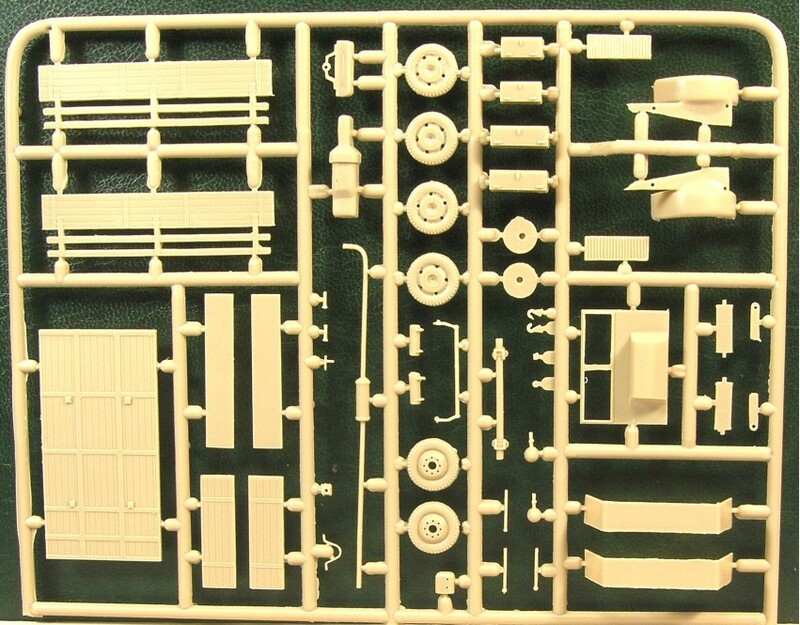 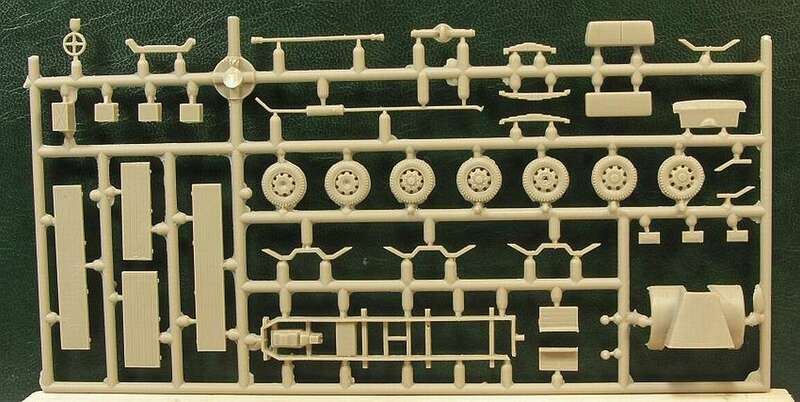 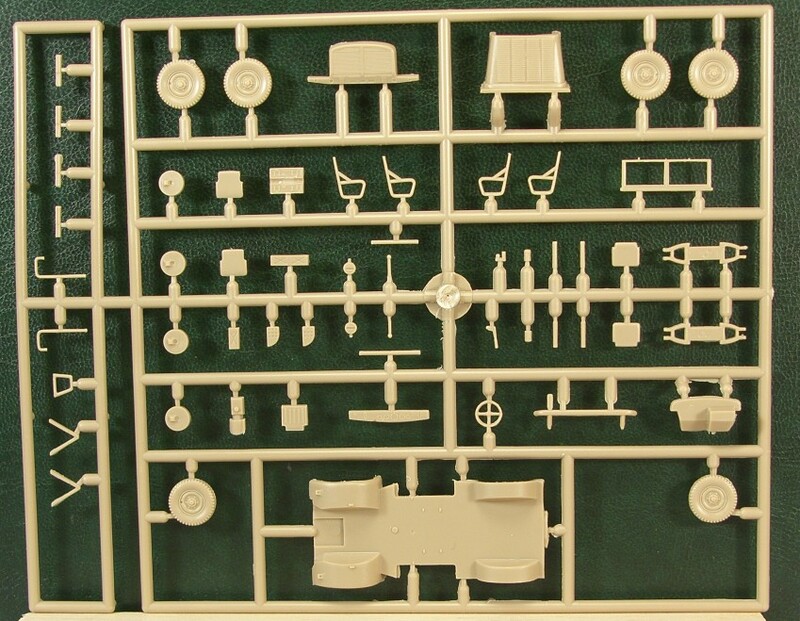 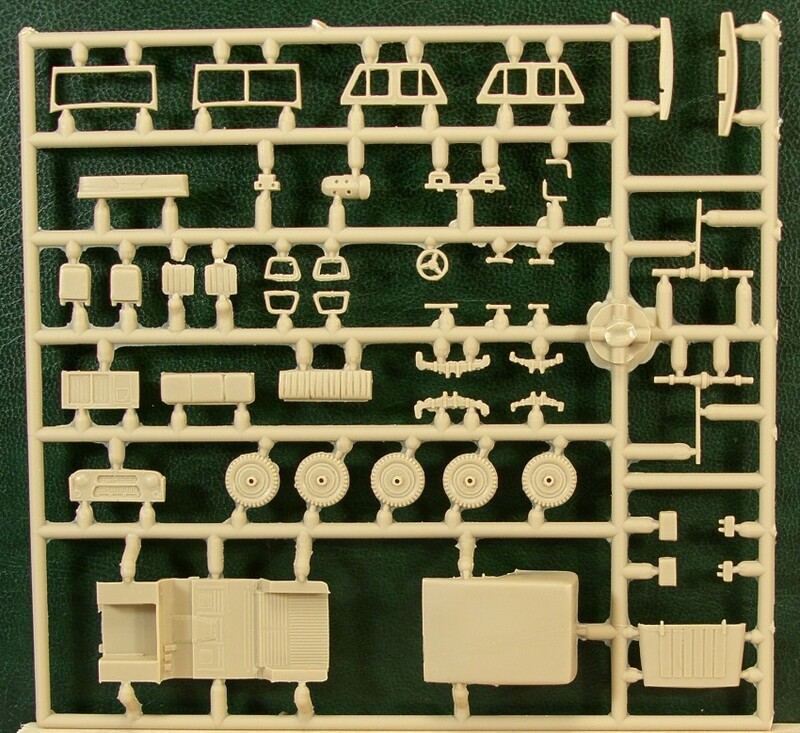 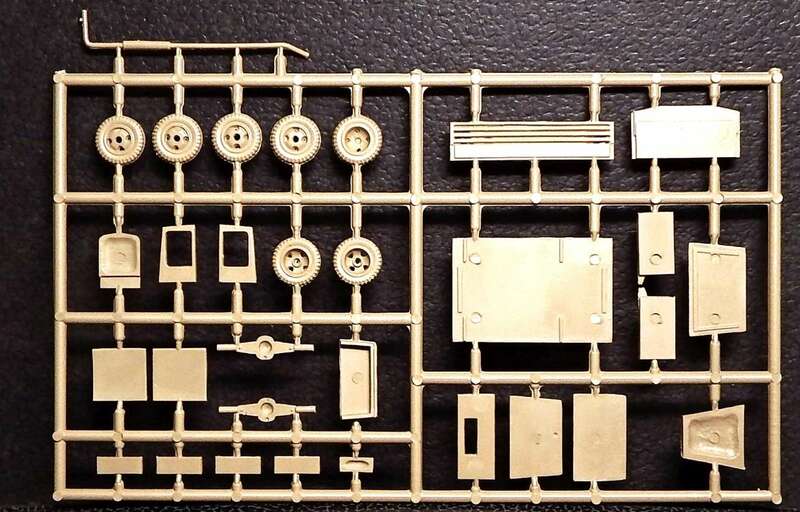 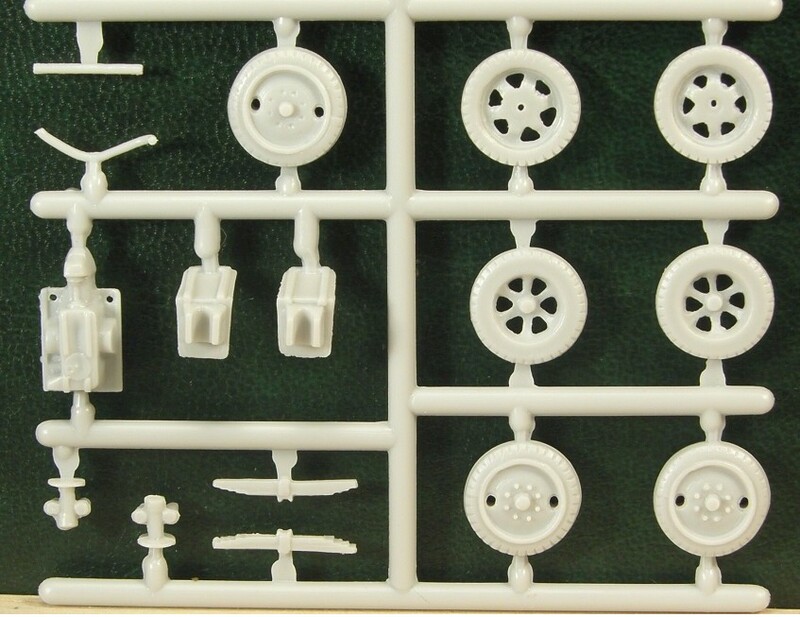 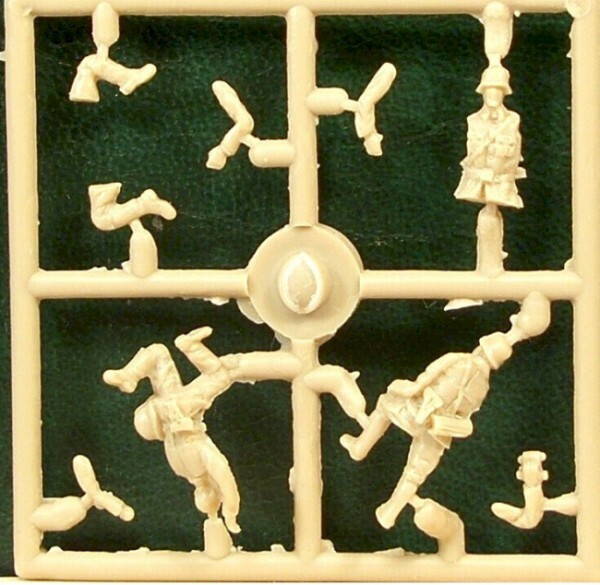 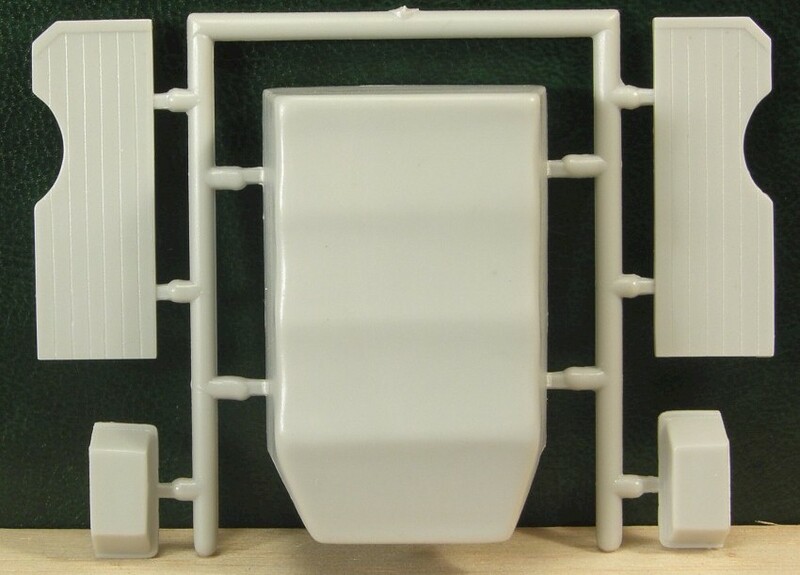 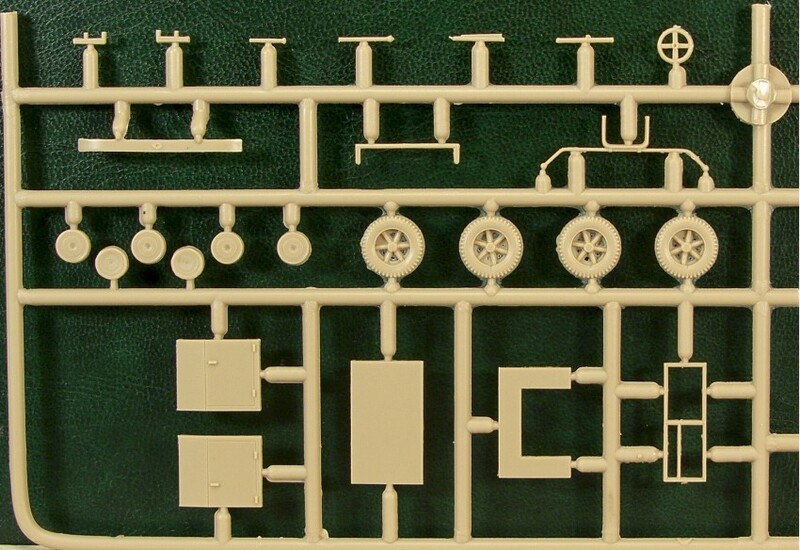 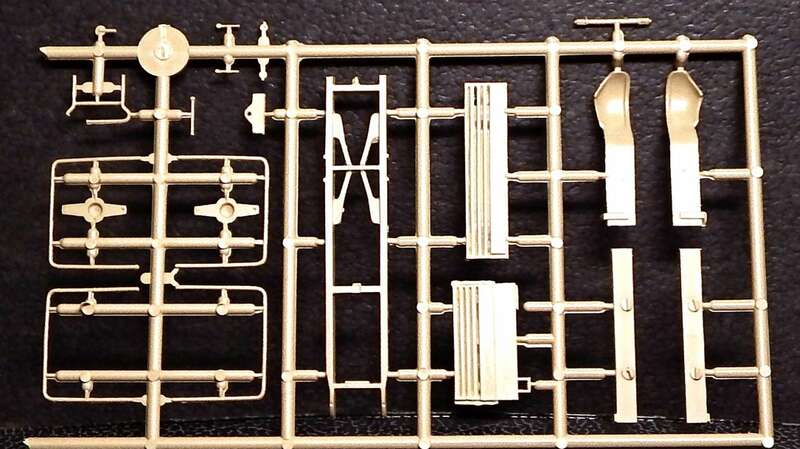 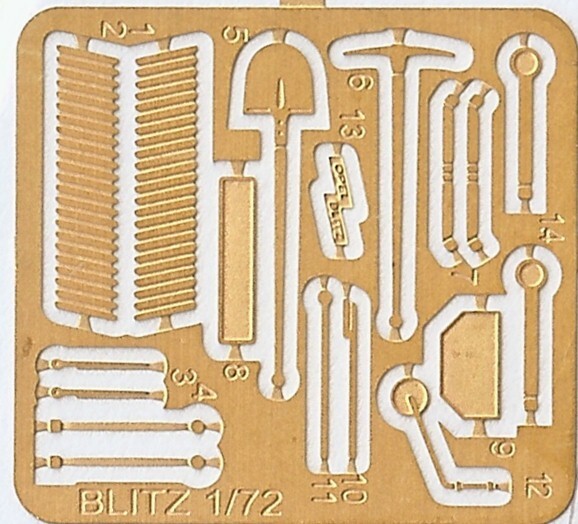 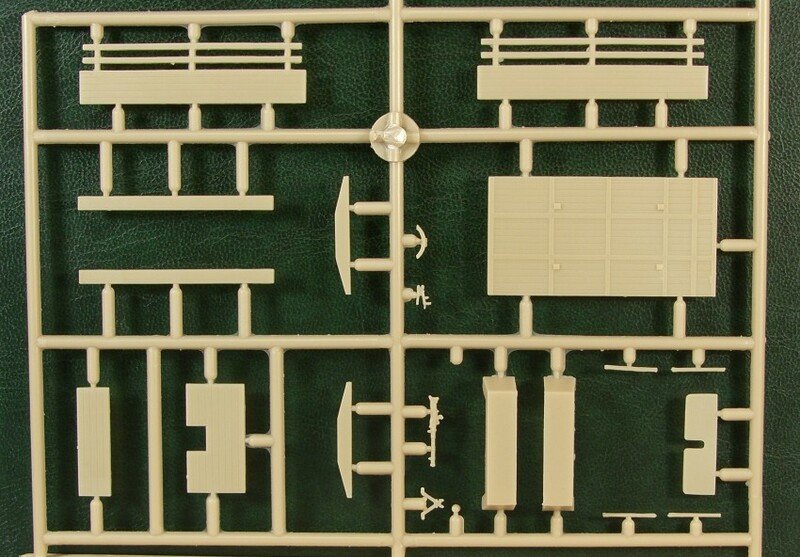 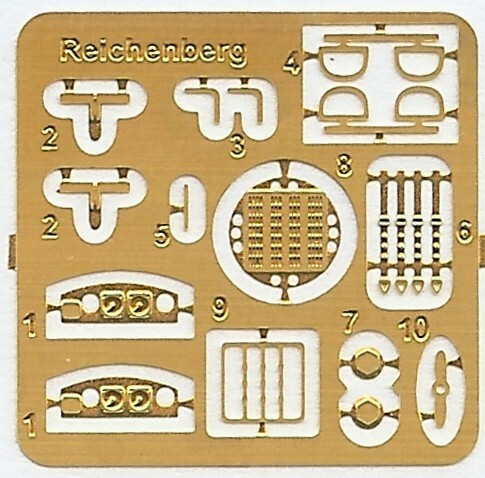 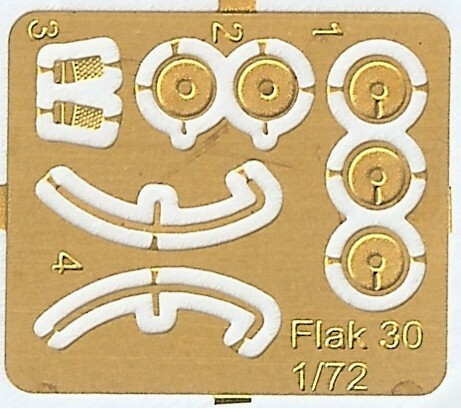 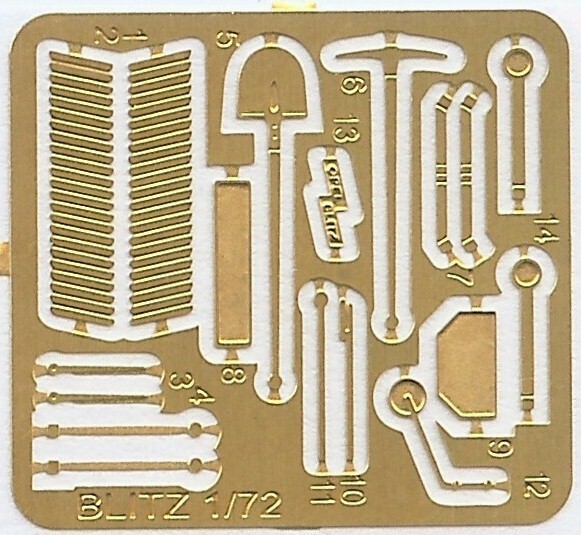 This is a brand new kit consisting of one sprue of 26 injection moulded parts (a number of which are not used in this version), a small photo etched fret, a set of decals (stencils only) and vac form canopies (one spare). 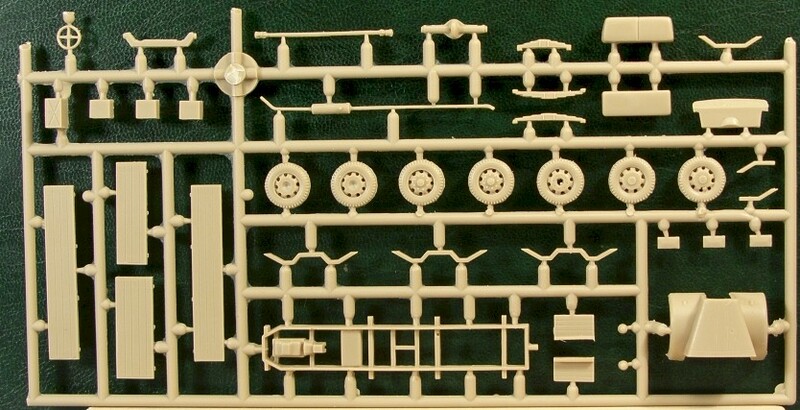 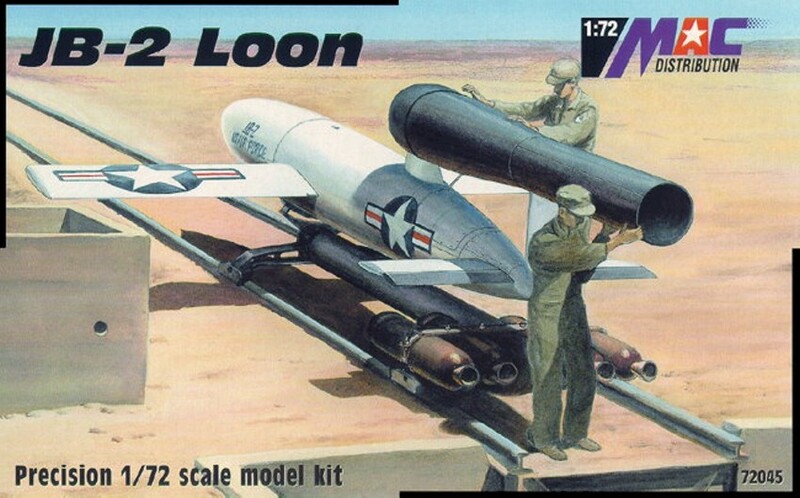 The fuselage comes with a separate nose section...the cockpit, while extremely small, consists of a seat, seat belts, rudder pedals, control stick and instrument panel. 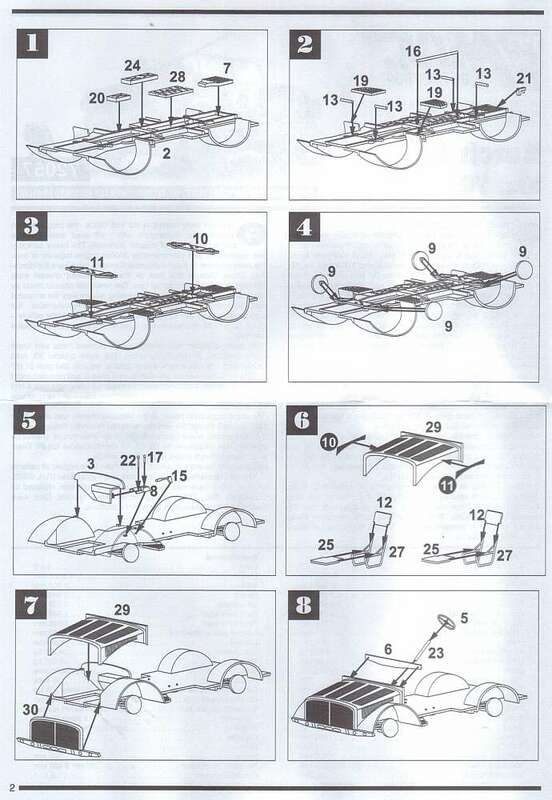 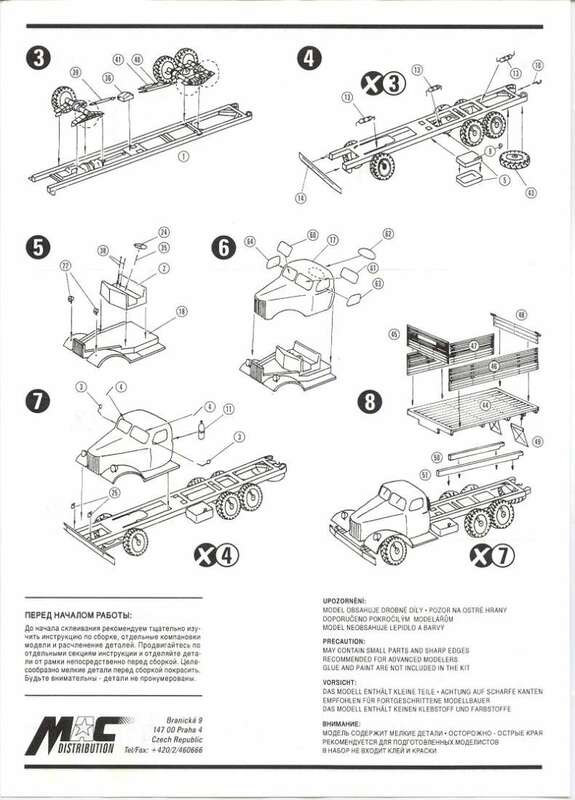 A trolly is provided, on which to mount the finished model. 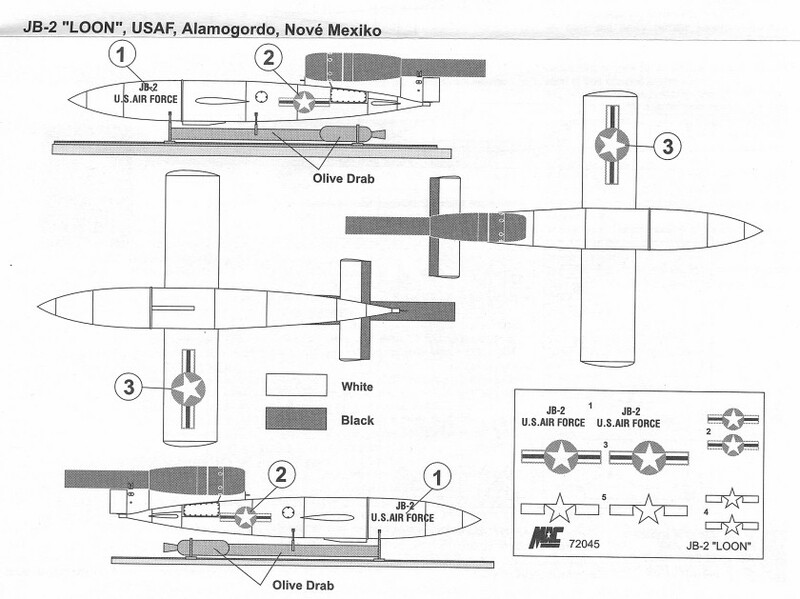 Obviously a captured F1-103 with U.S. markings and an all white fuselage. 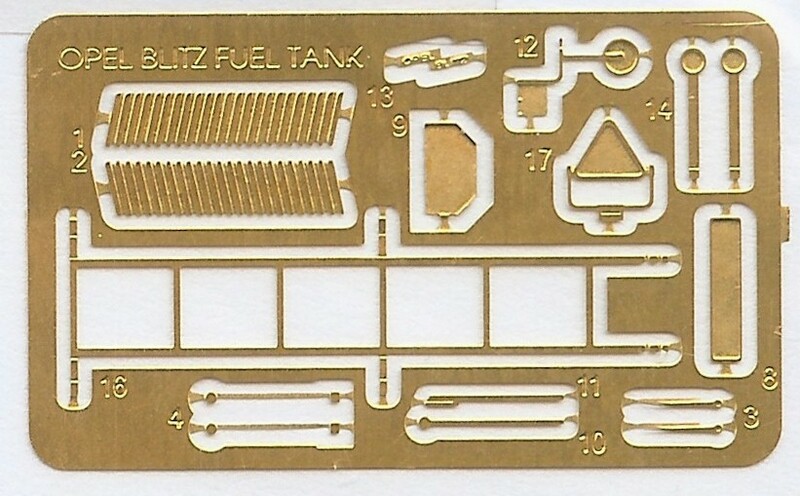 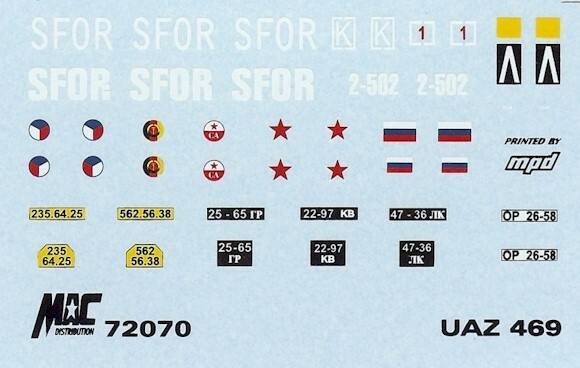 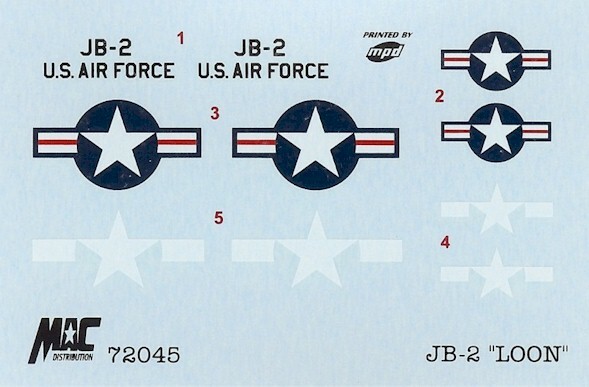 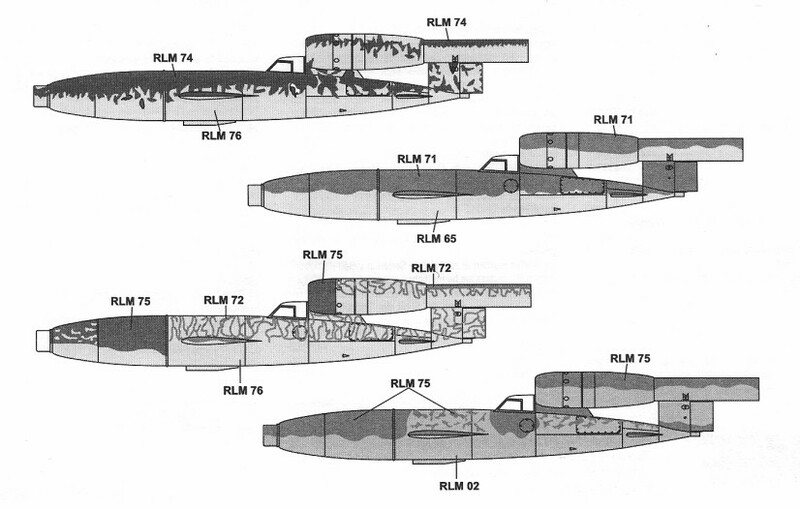 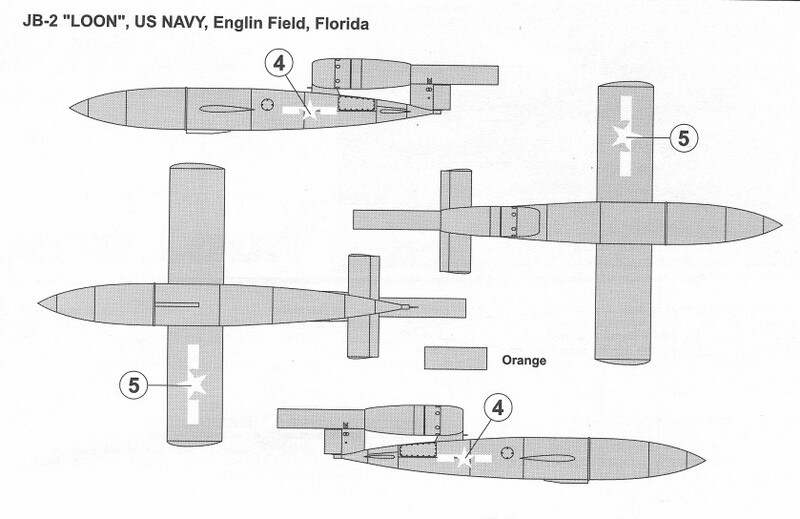 The kit is identical (apart from the decals...USAF and US Navy markings) to the F1-103A kit releases a few months ago ... but at least you get to use more of the parts...as per the box top.